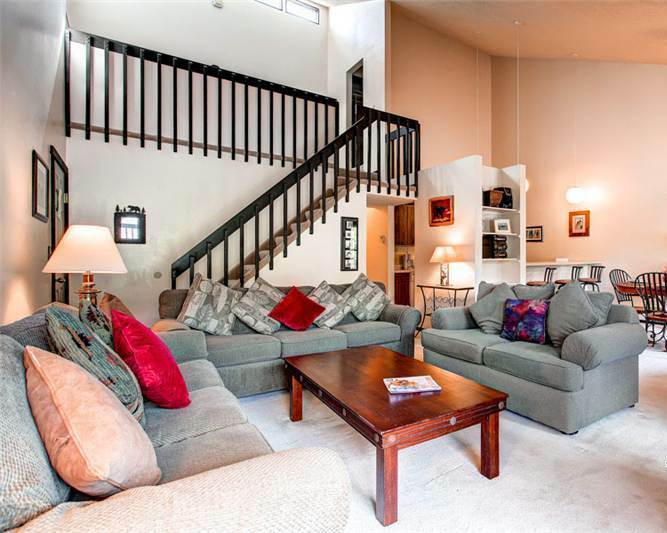 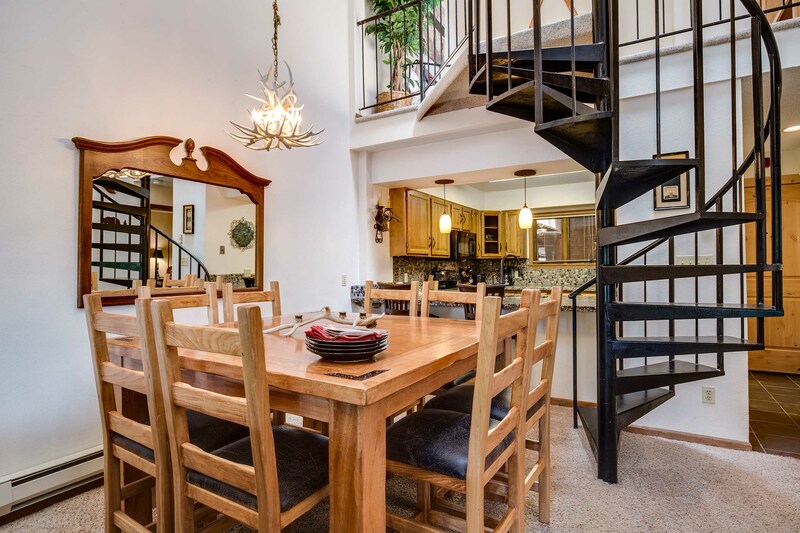 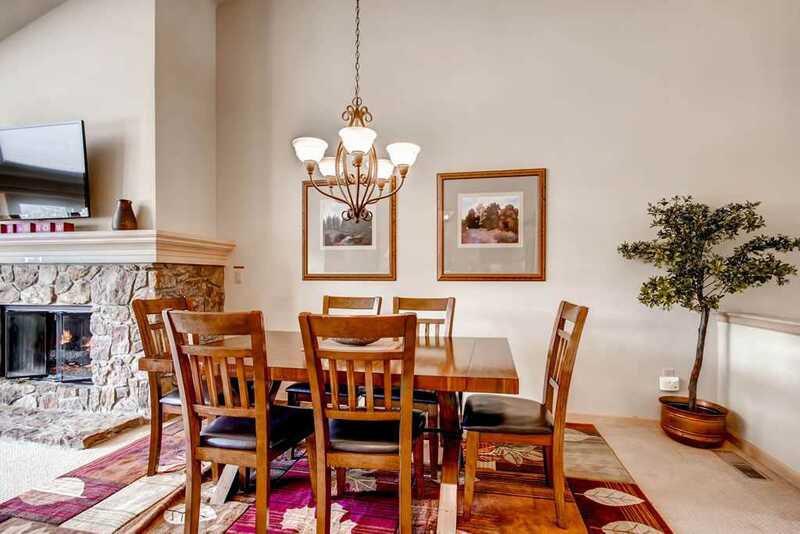 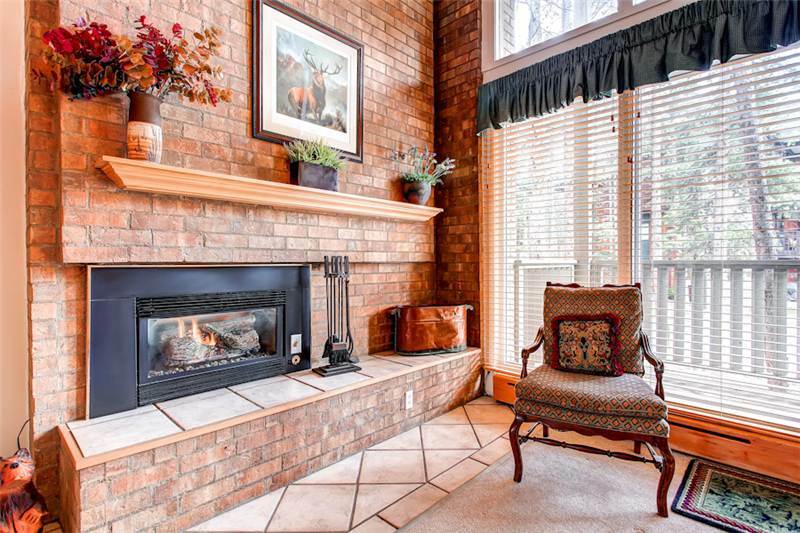 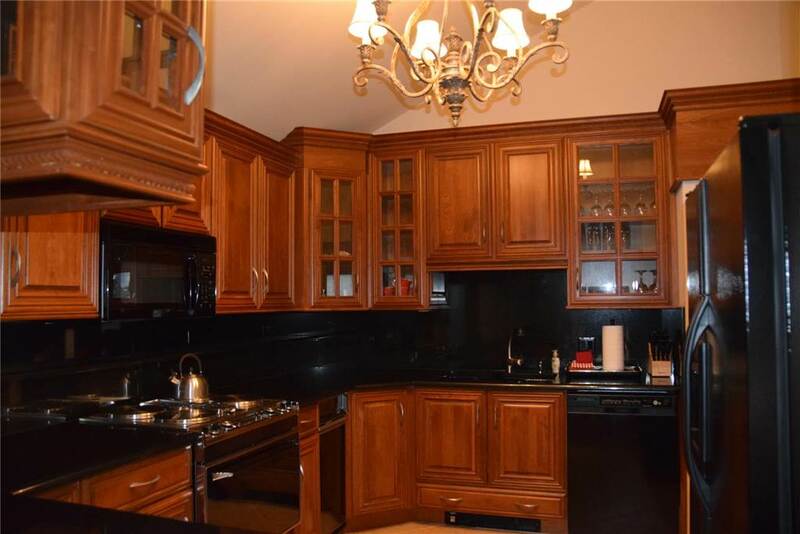 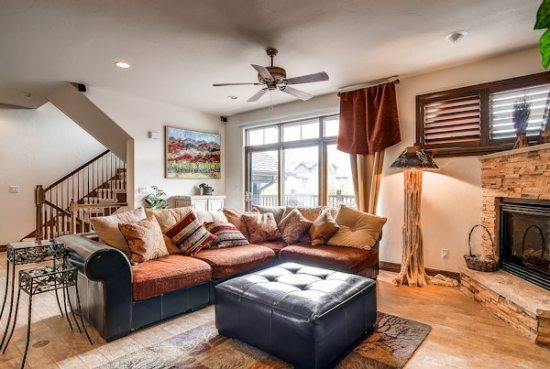 This deluxe multilevel condo is in a prime Frisco location — just one block from Main Street and the Summit Stage bus stop — and can sleep up to 10. 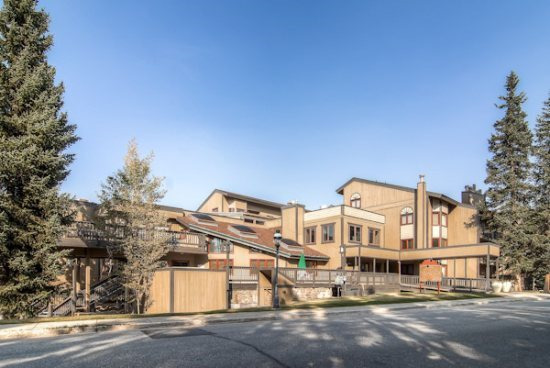 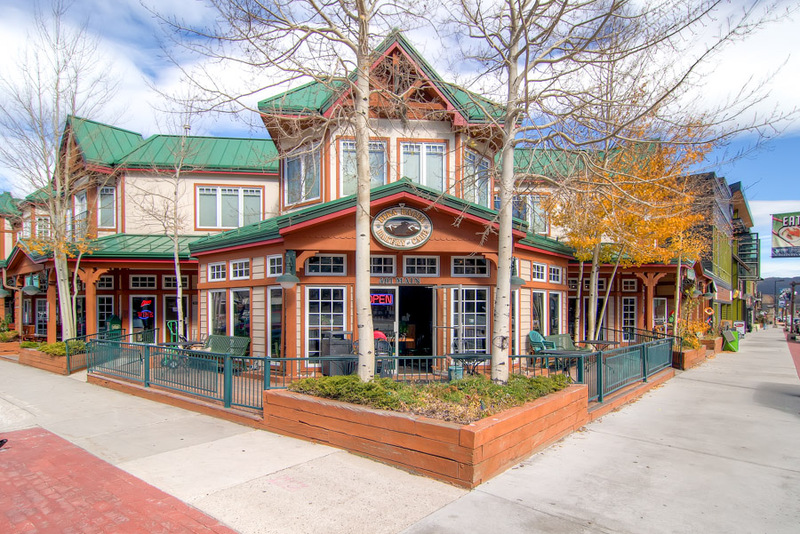 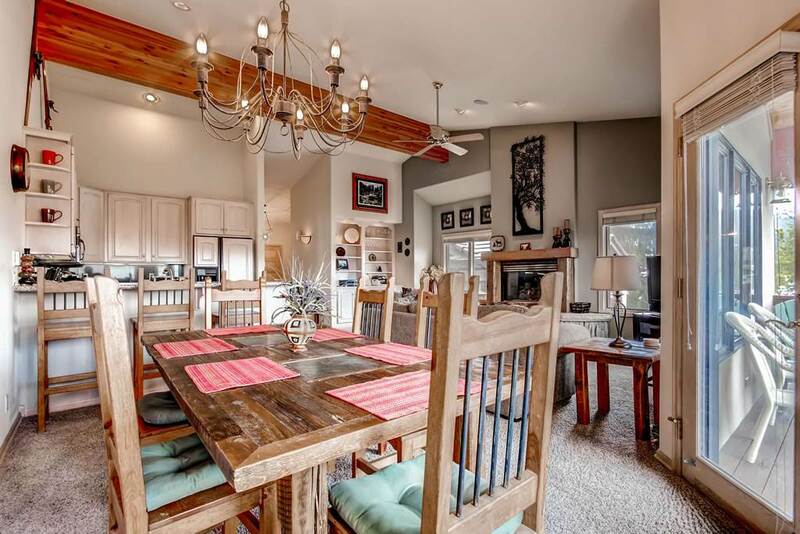 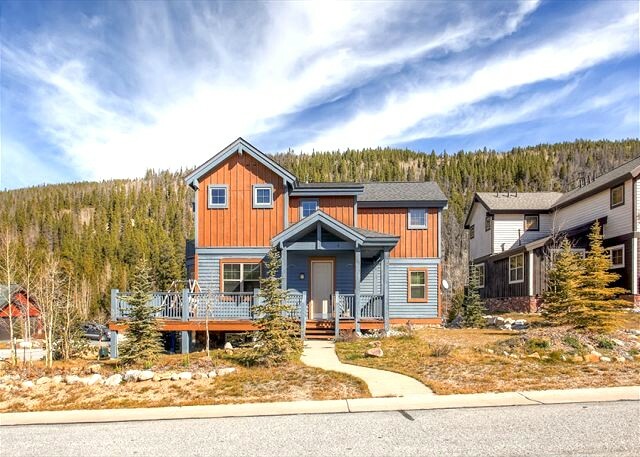 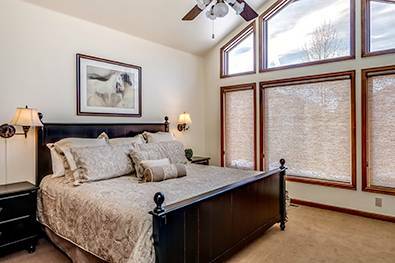 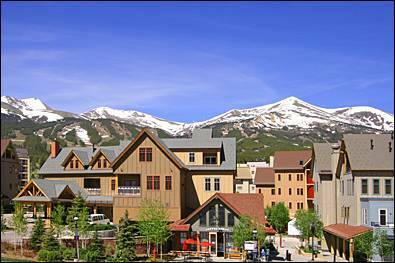 You’re just a short stroll from the great dining and shopping in Downtown Frisco — plus, all of Summit County’s great ski resorts are just a short bus ride or drive away! 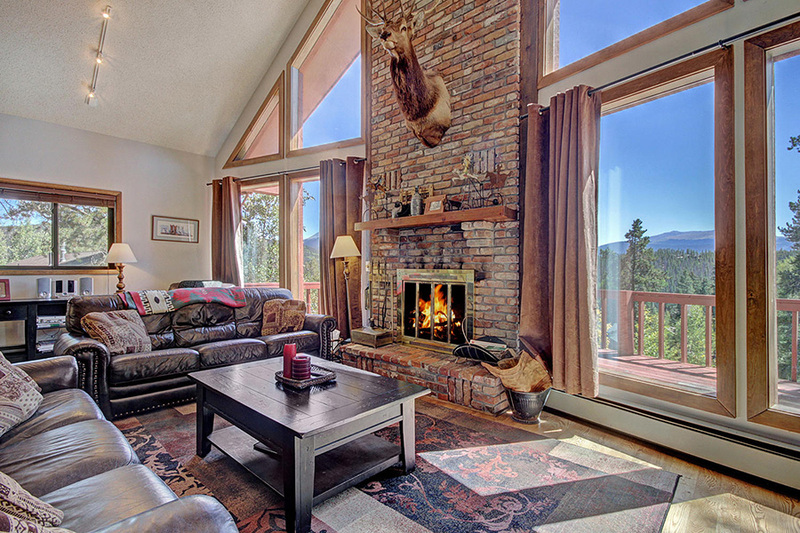 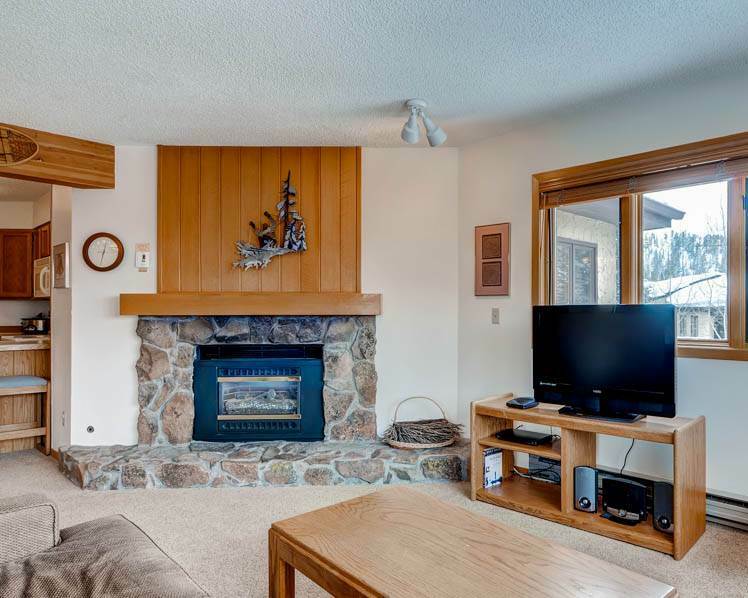 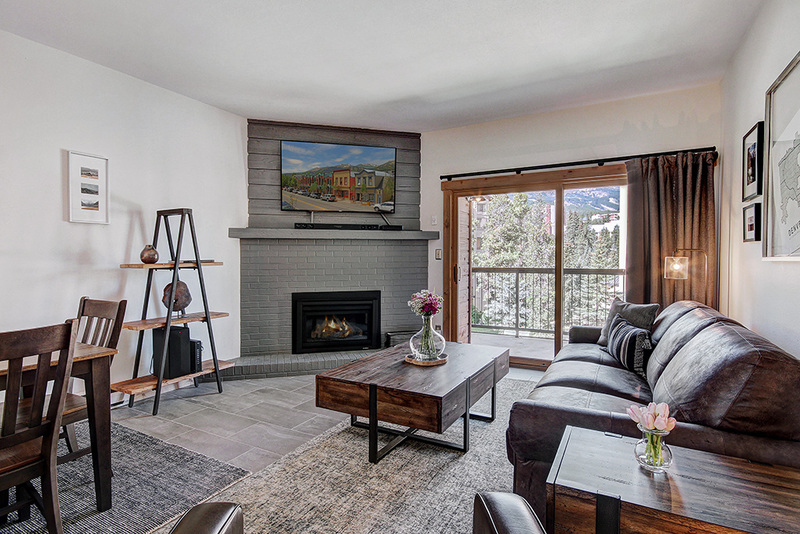 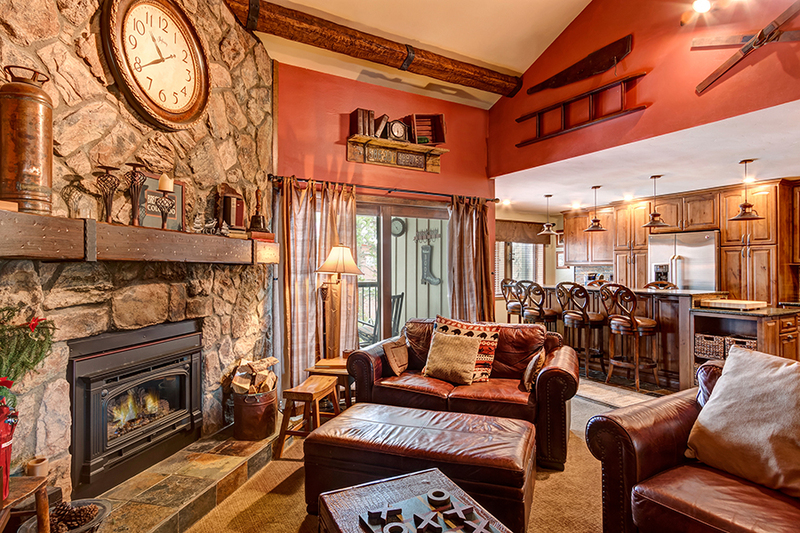 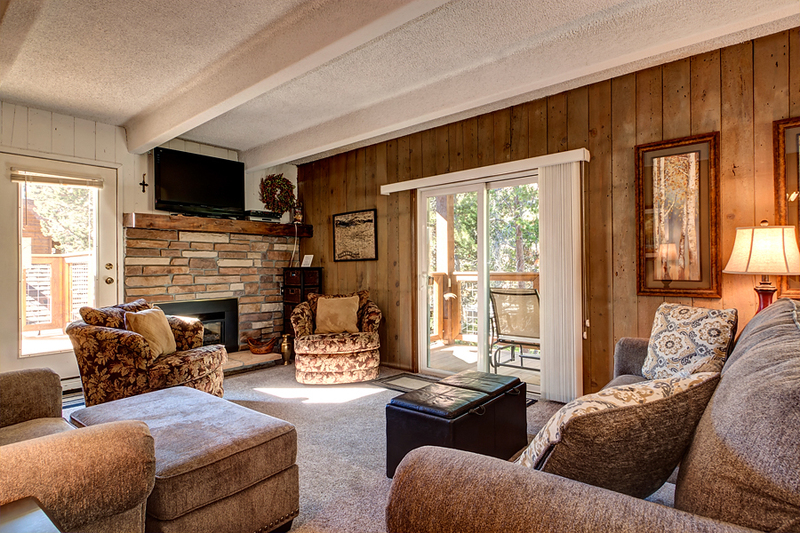 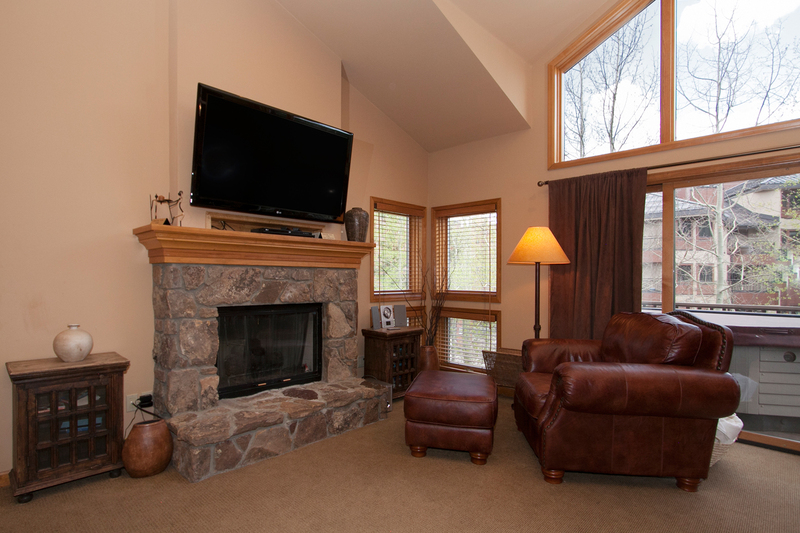 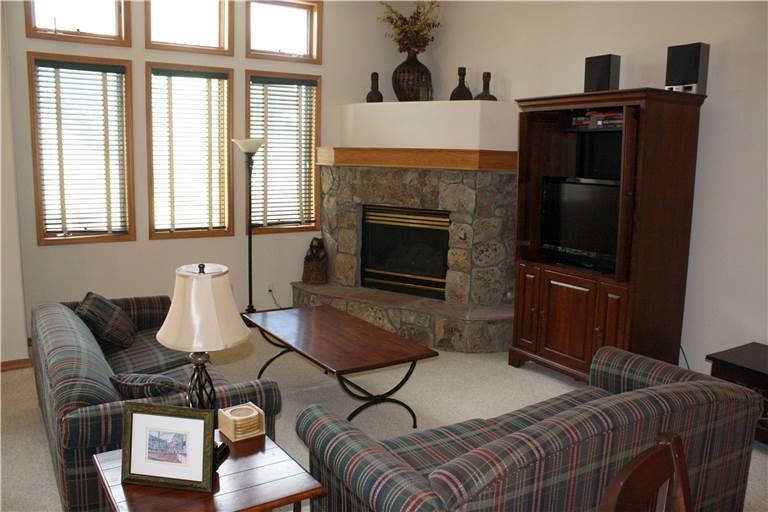 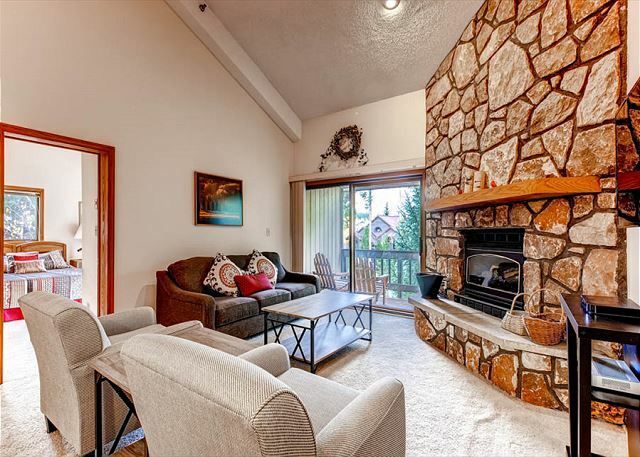 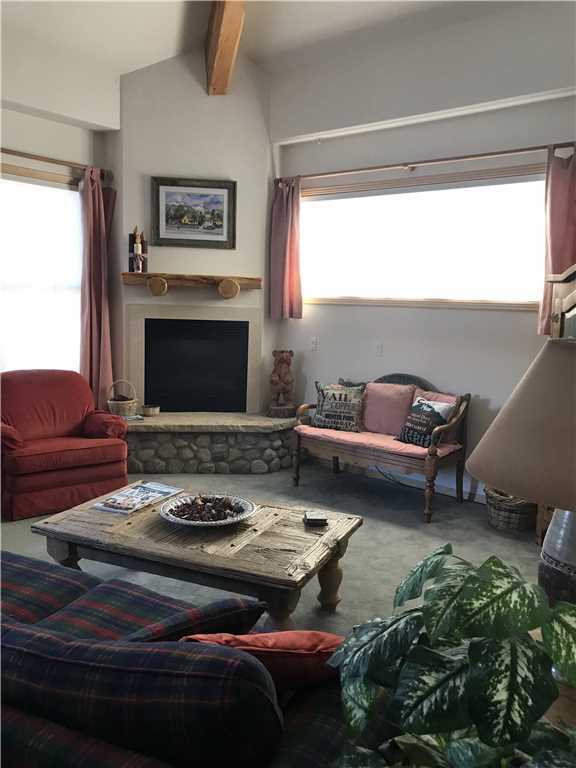 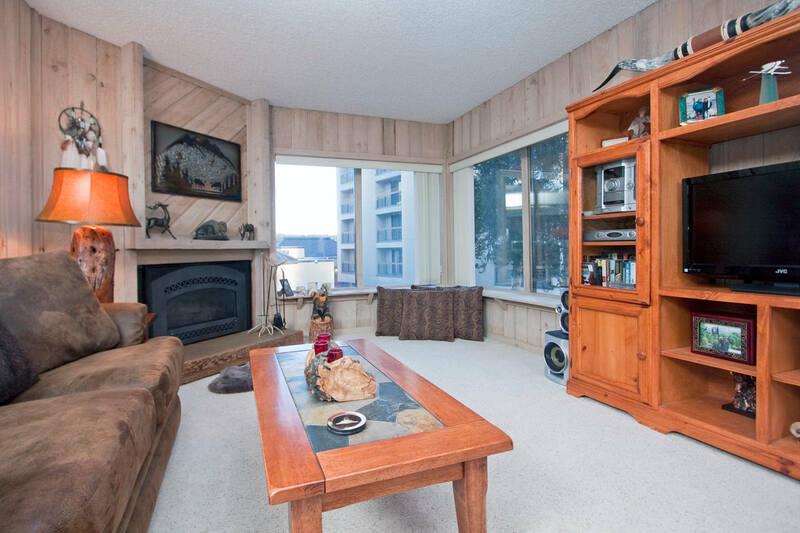 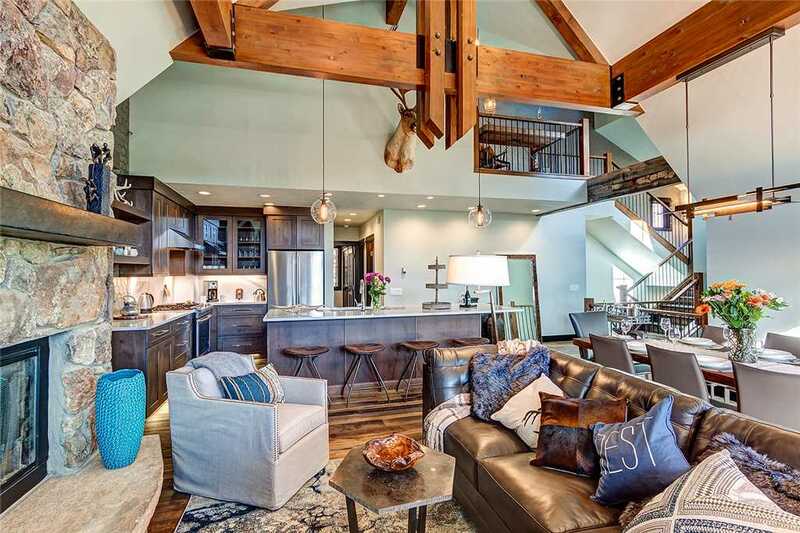 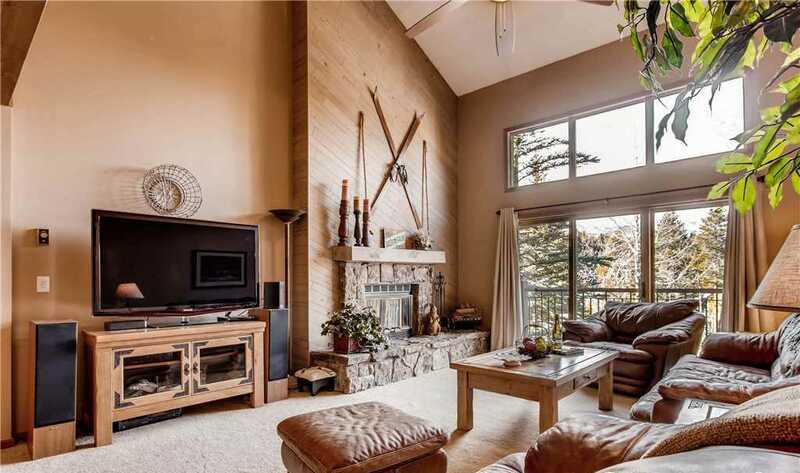 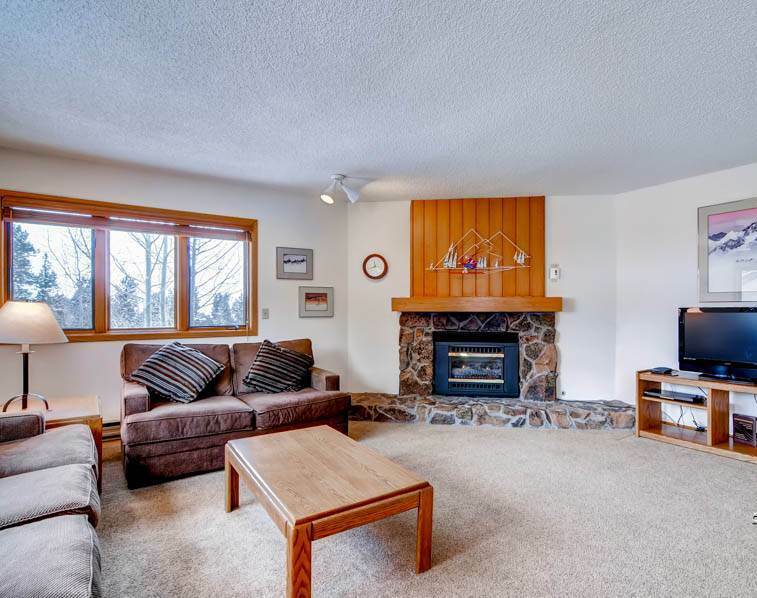 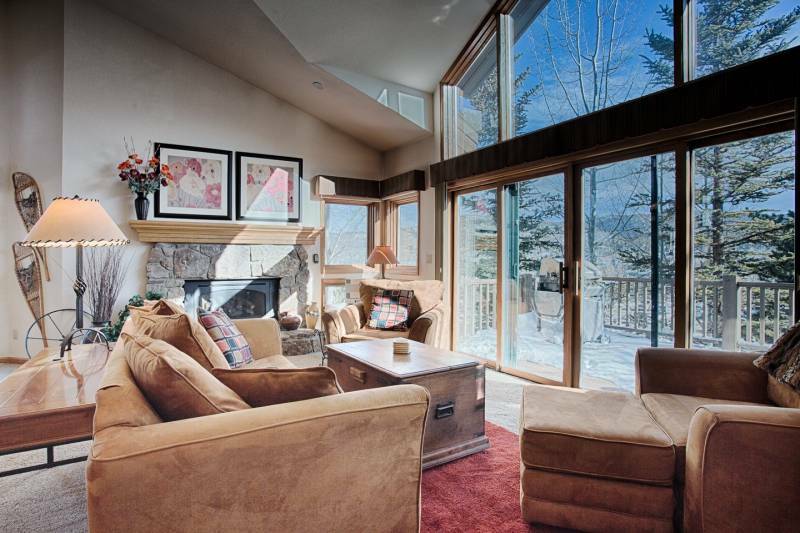 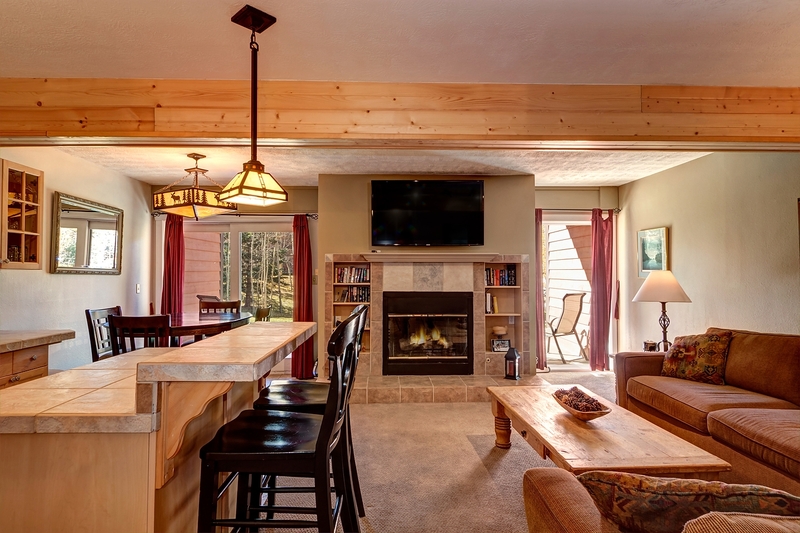 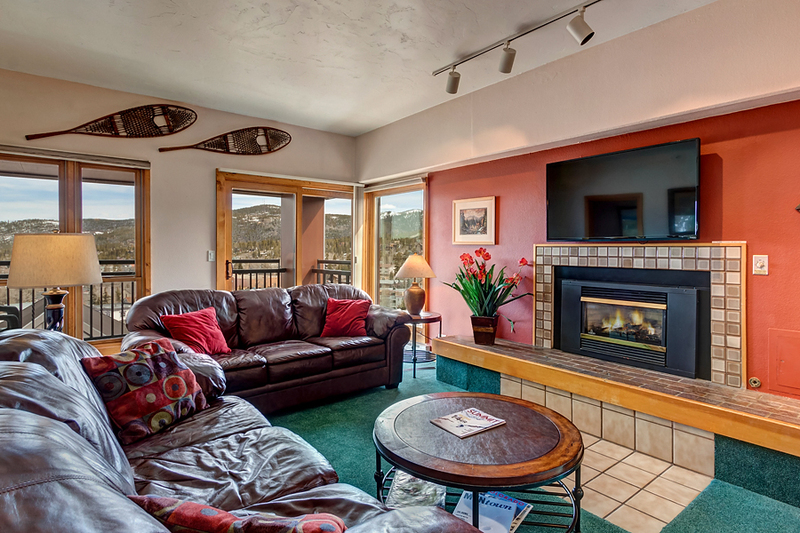 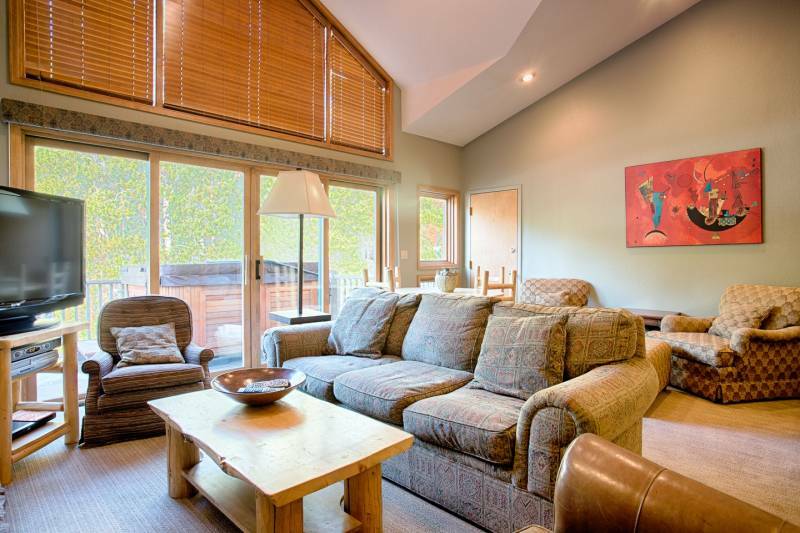 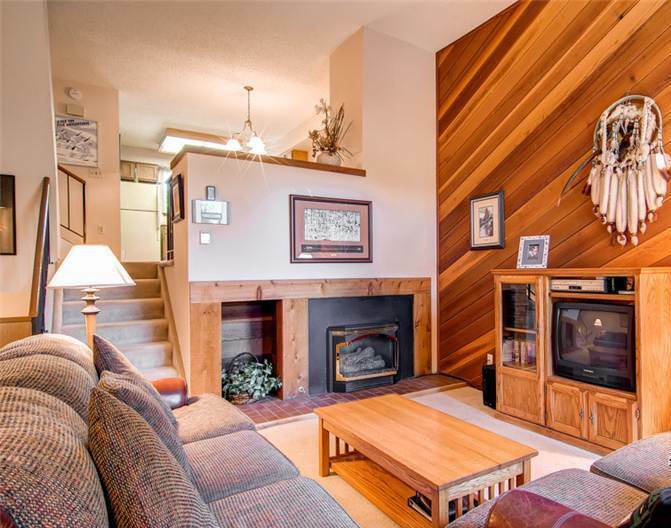 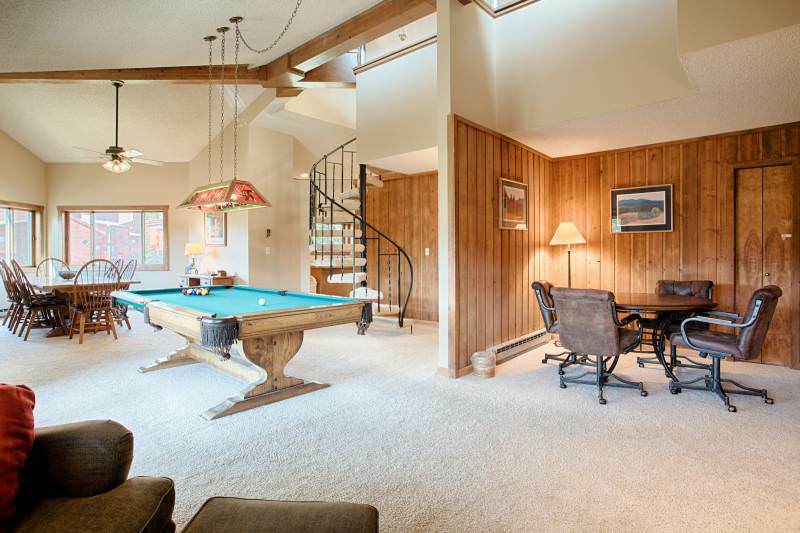 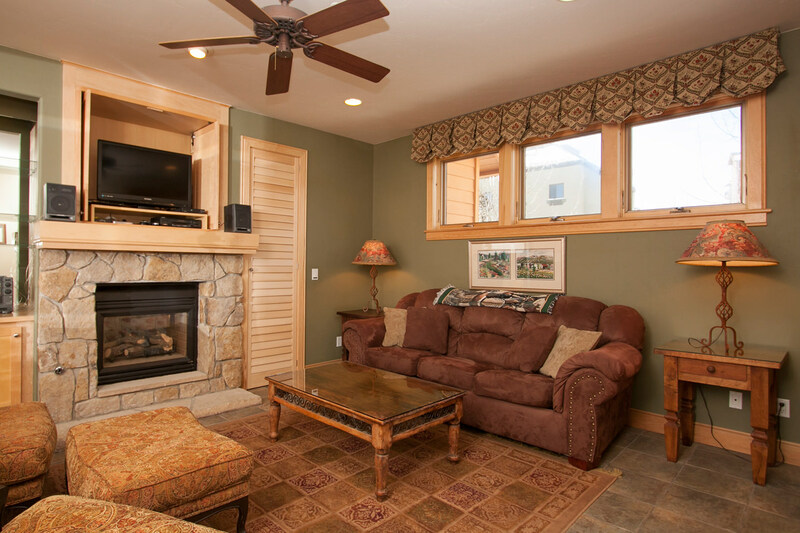 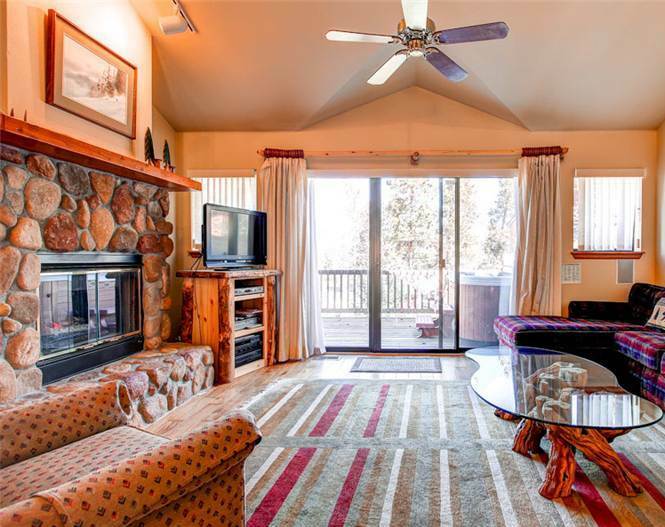 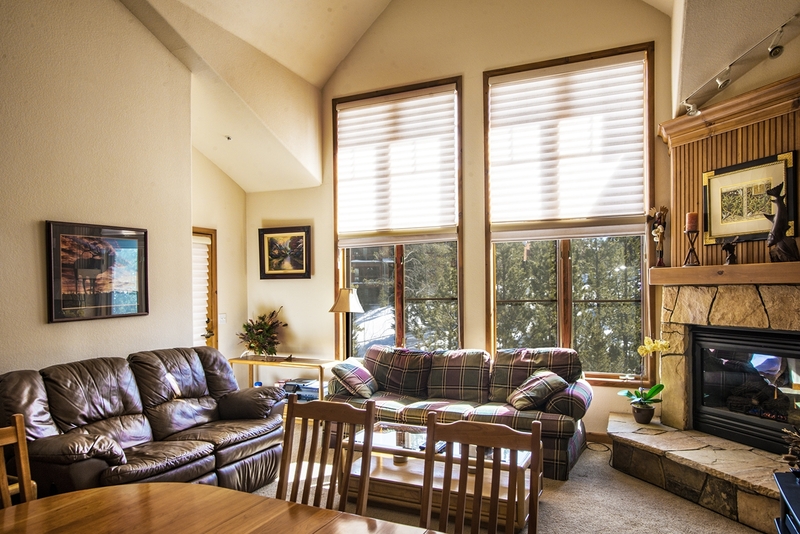 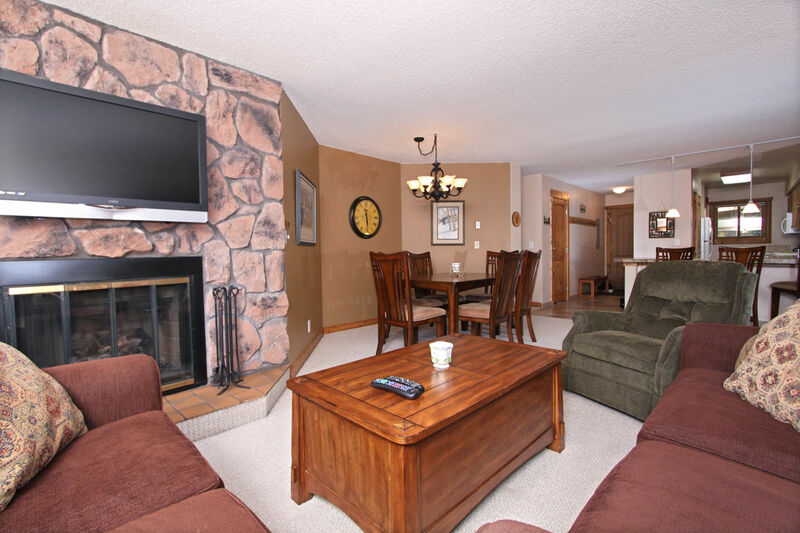 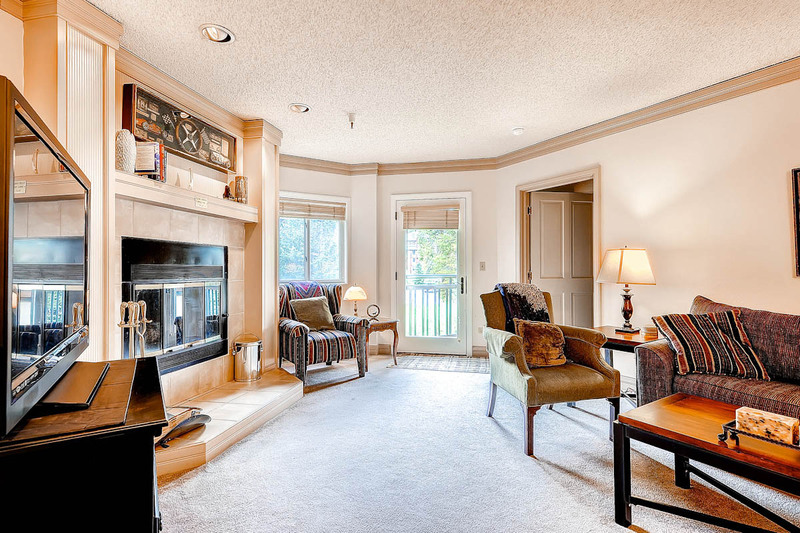 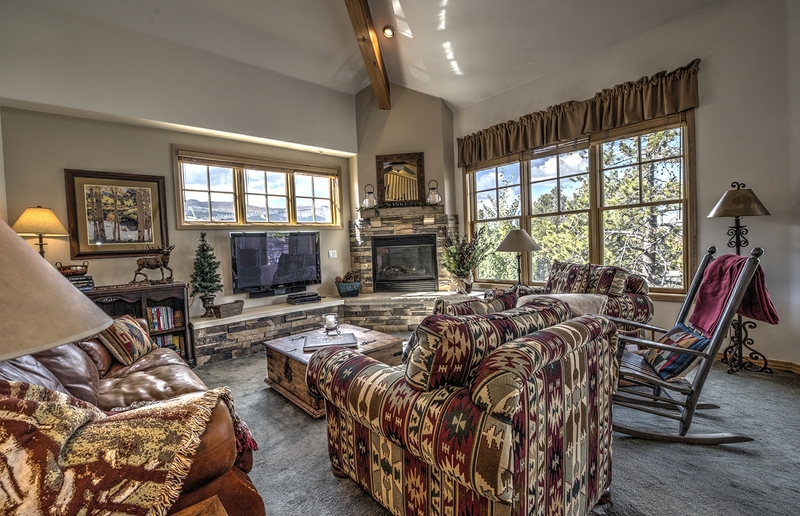 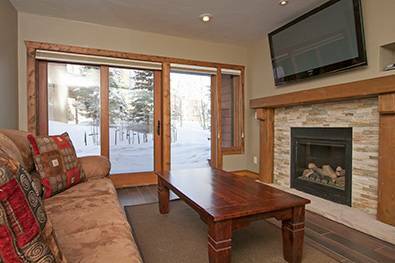 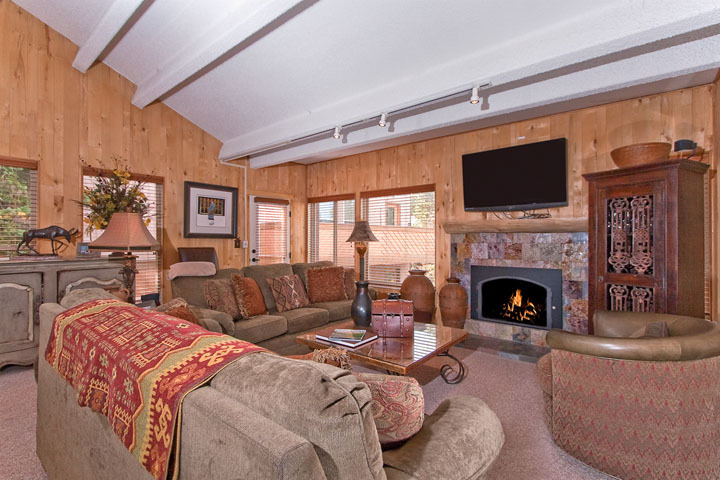 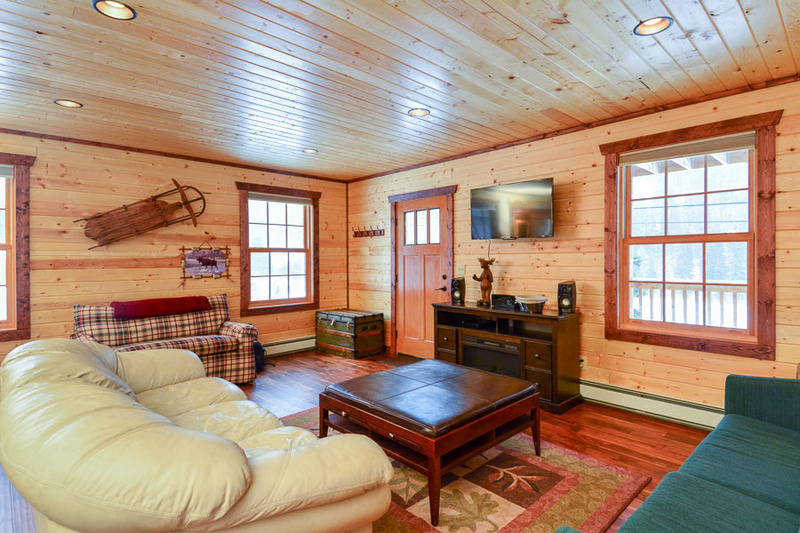 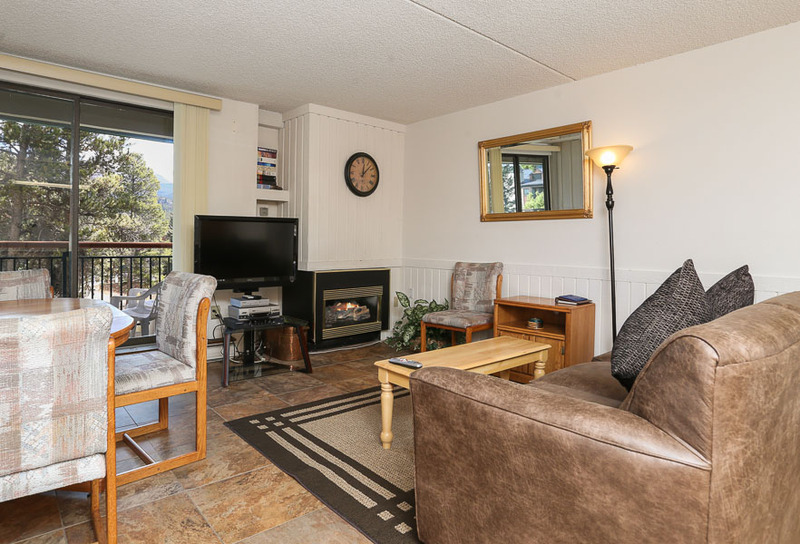 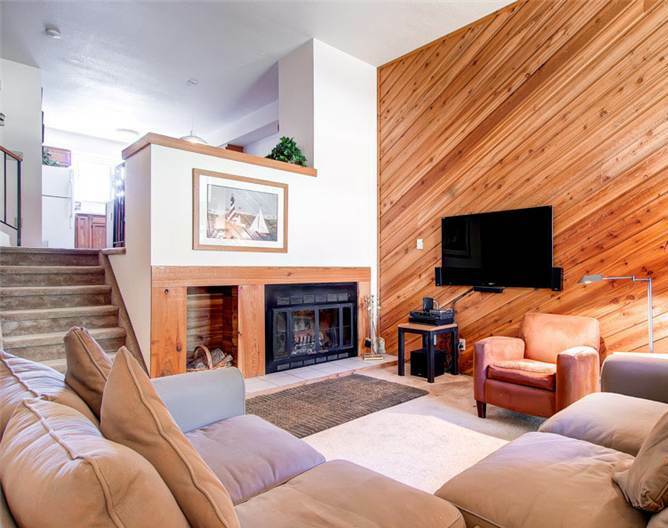 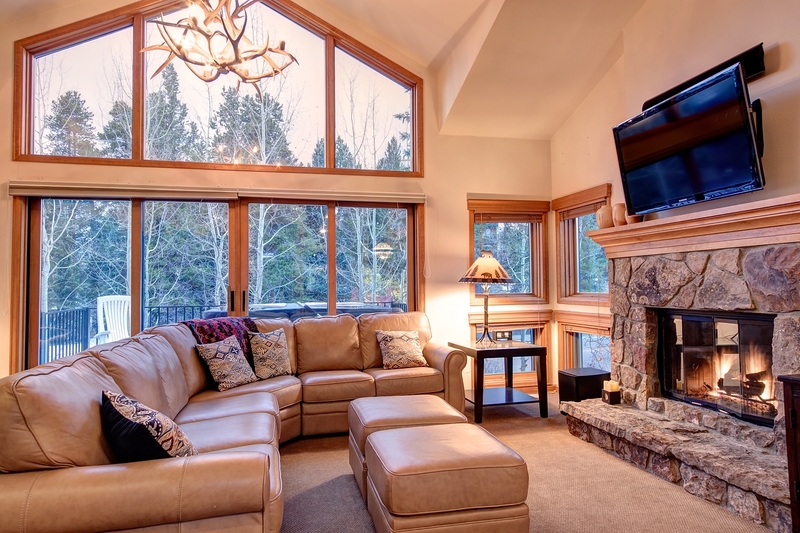 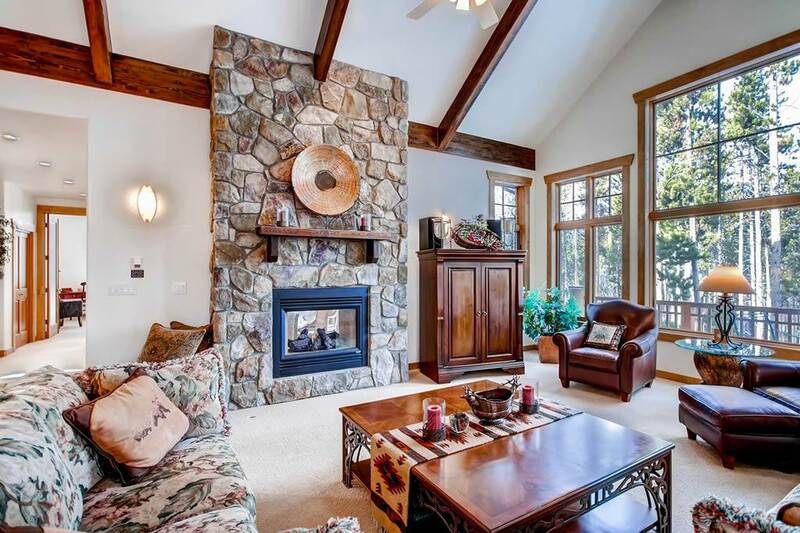 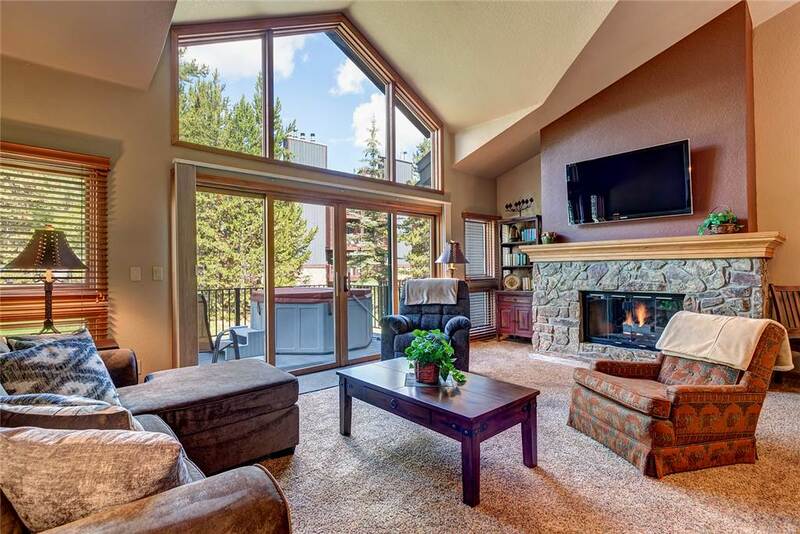 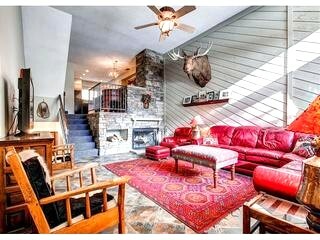 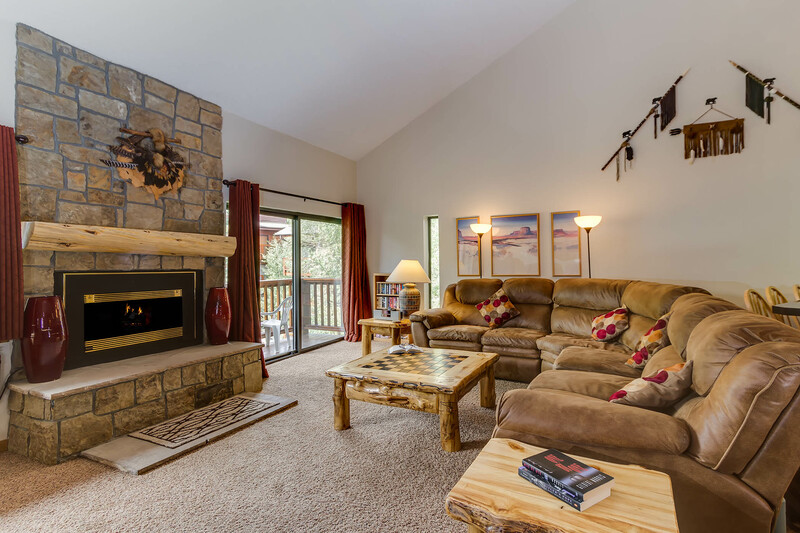 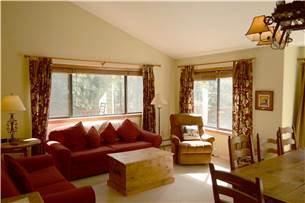 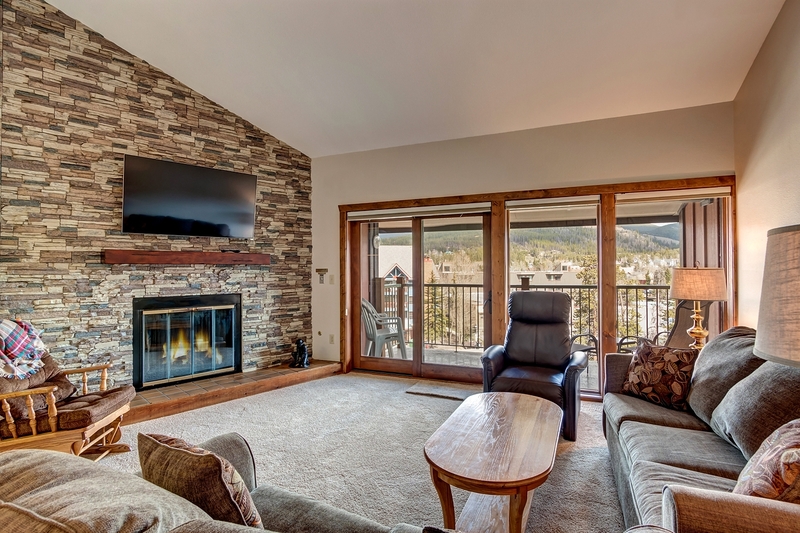 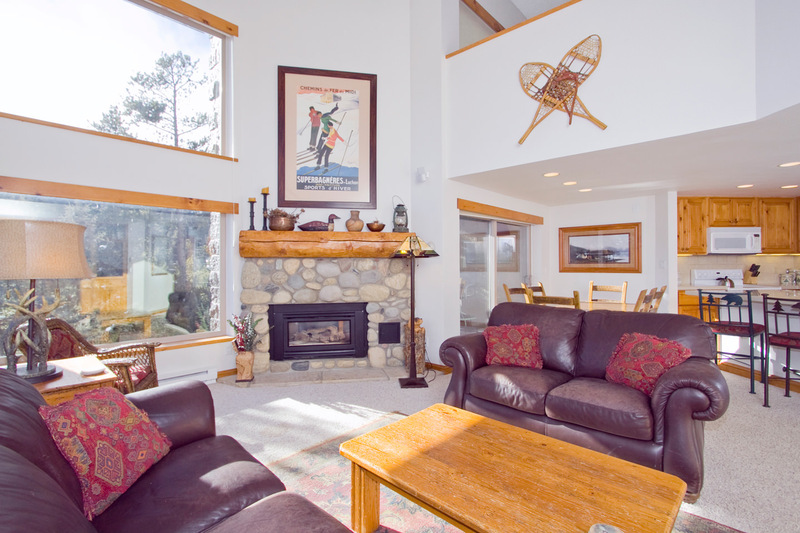 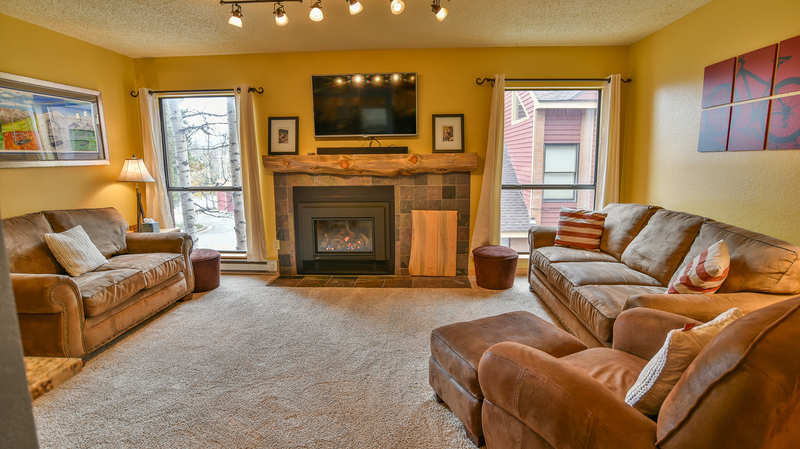 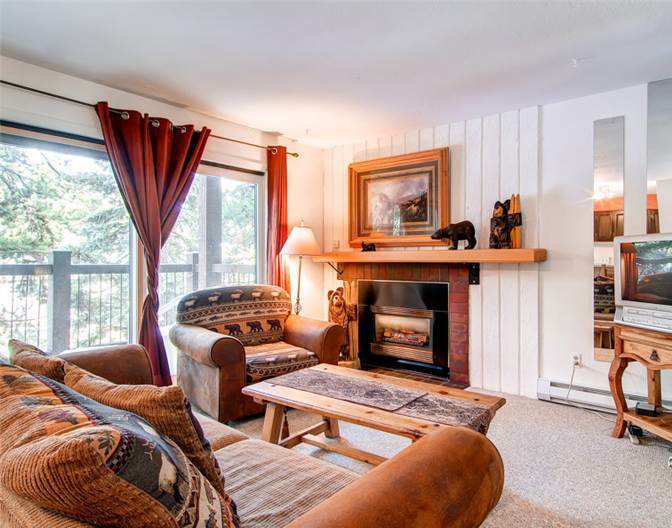 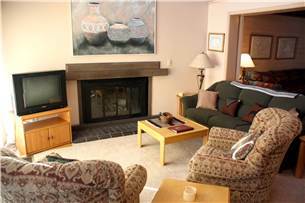 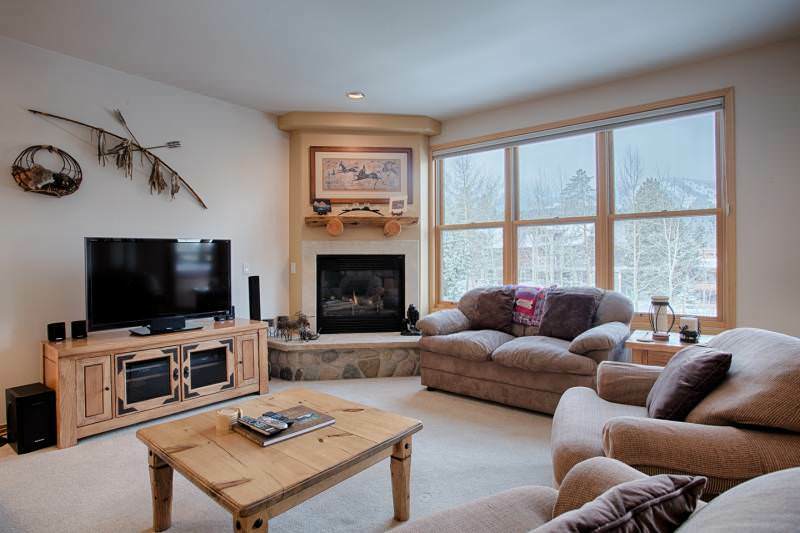 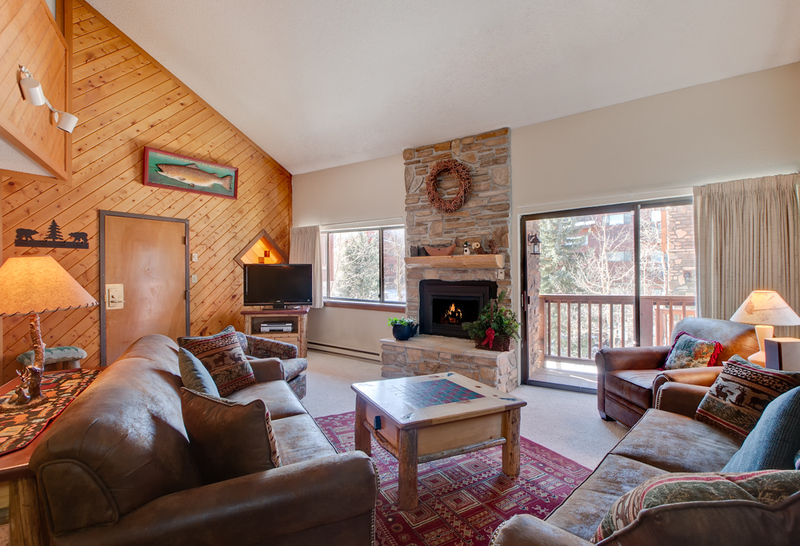 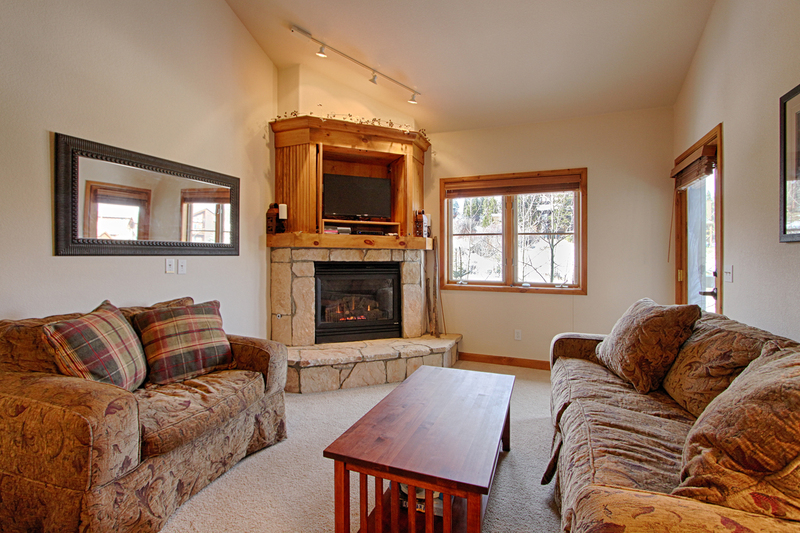 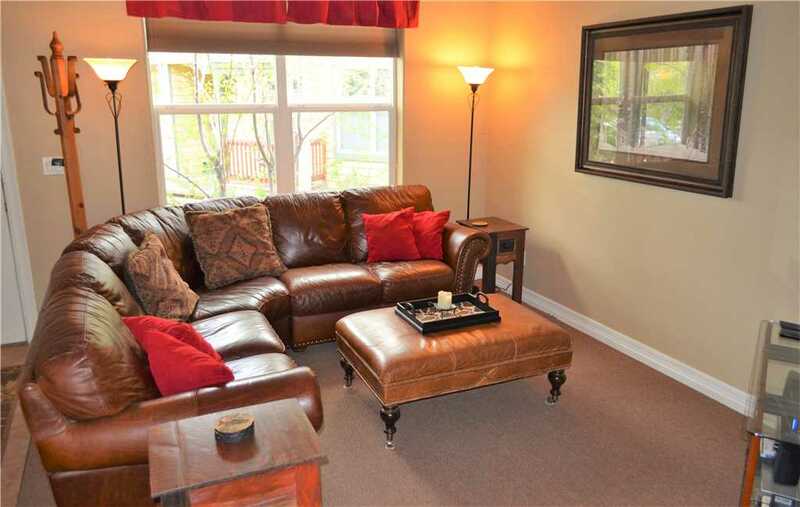 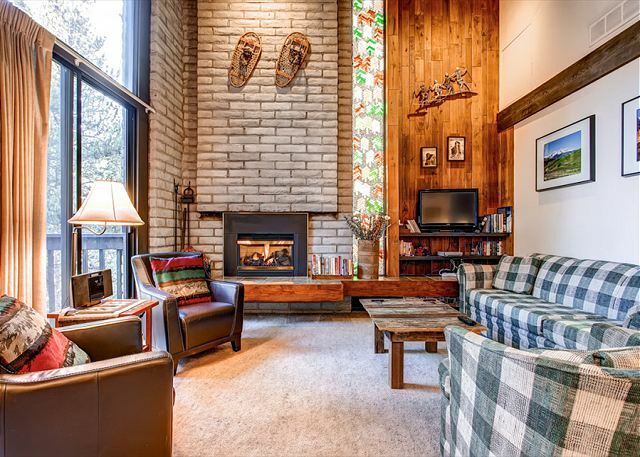 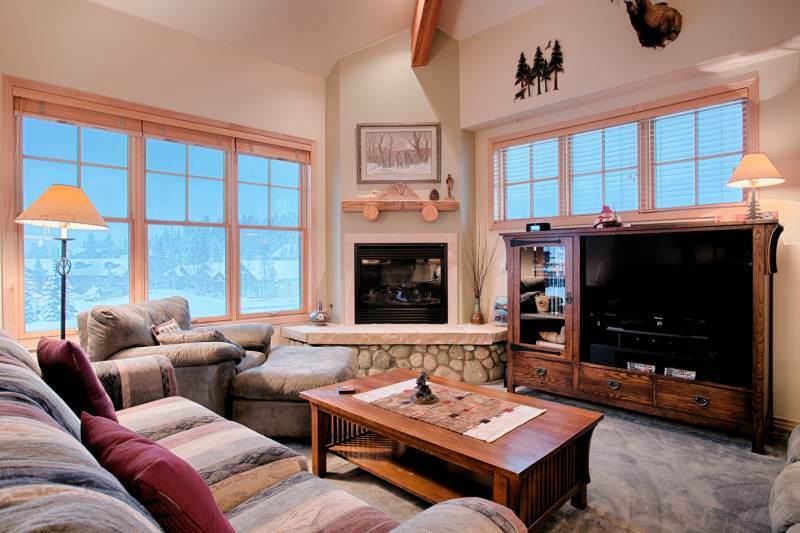 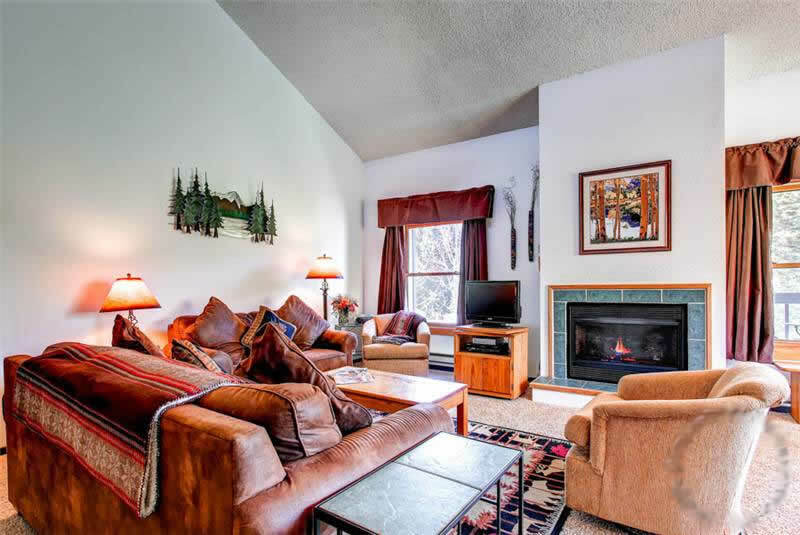 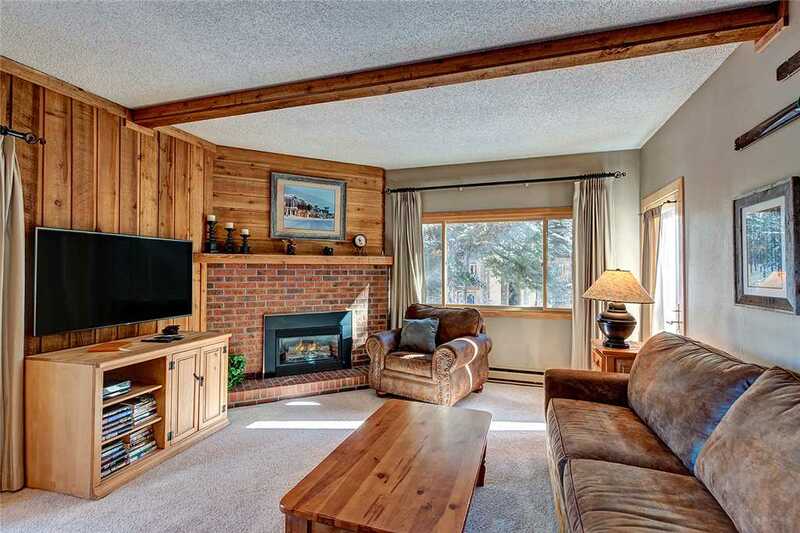 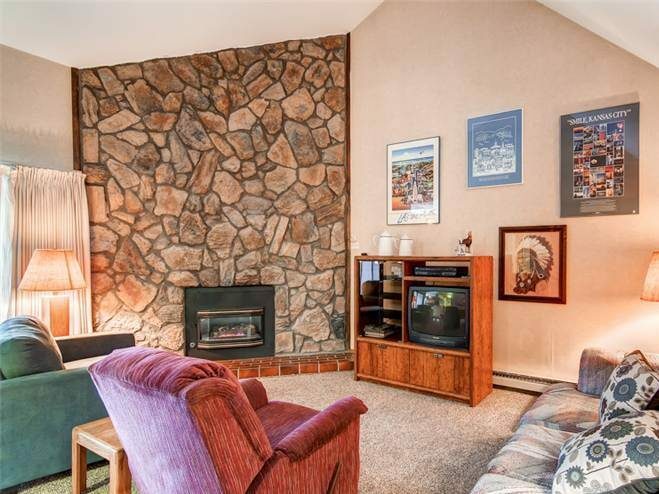 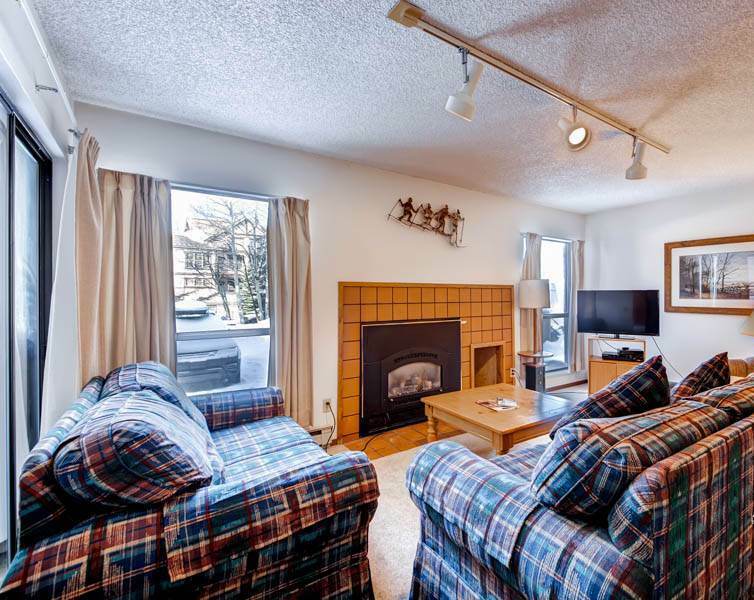 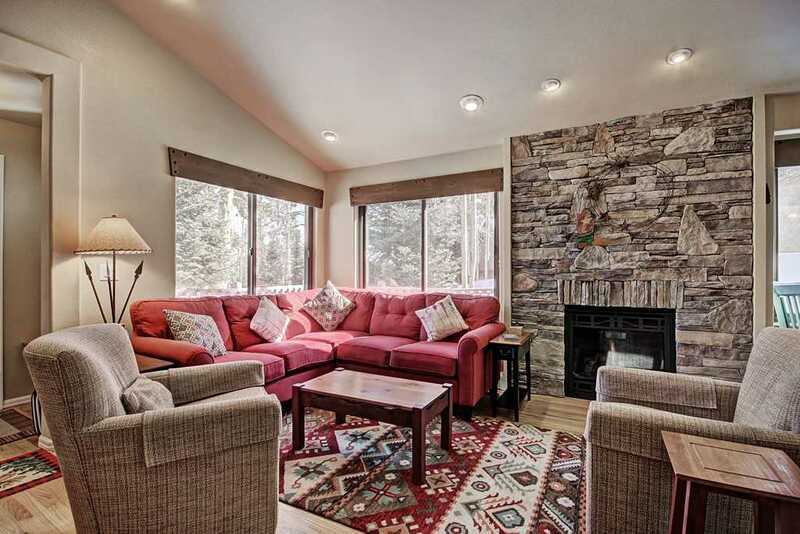 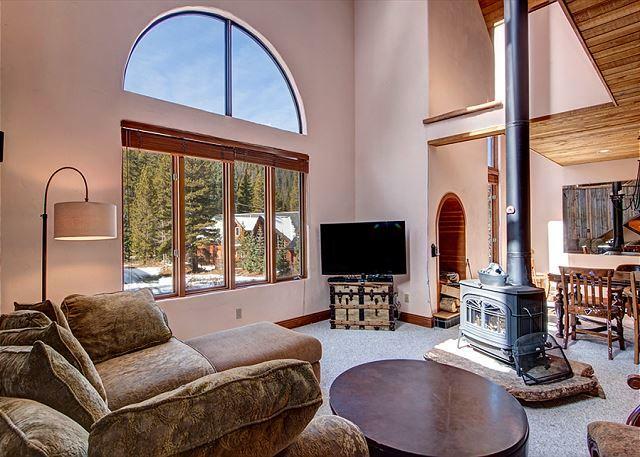 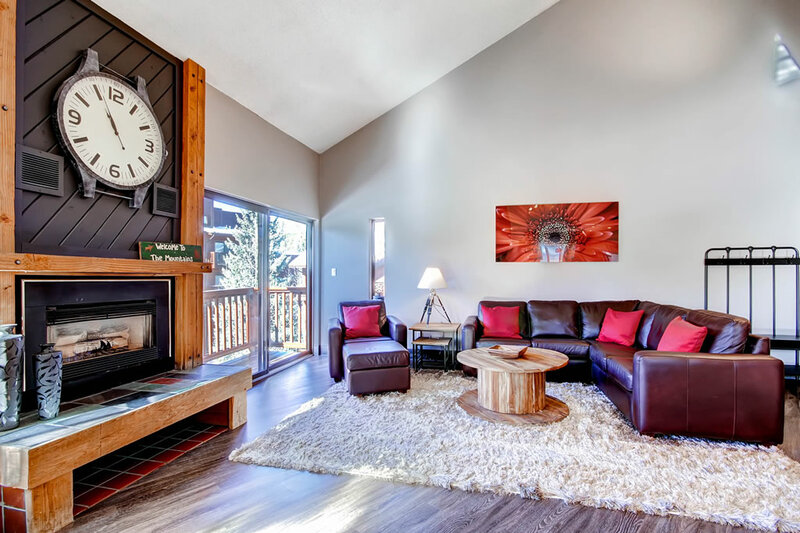 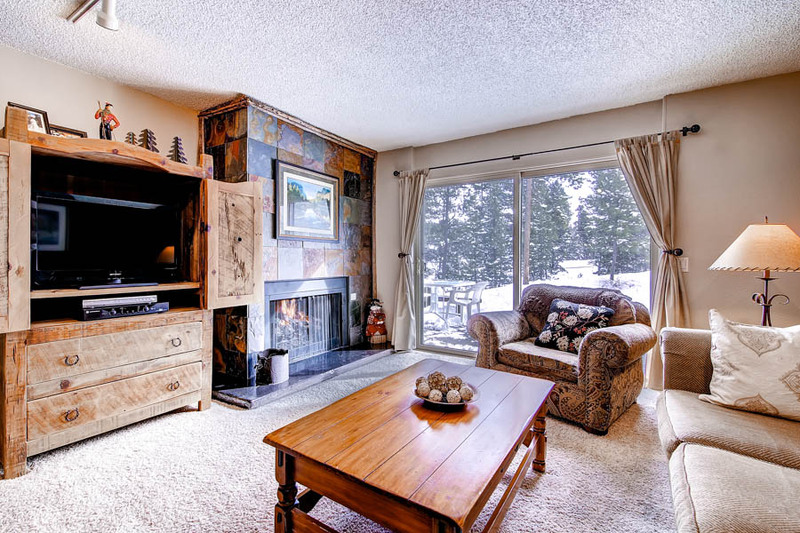 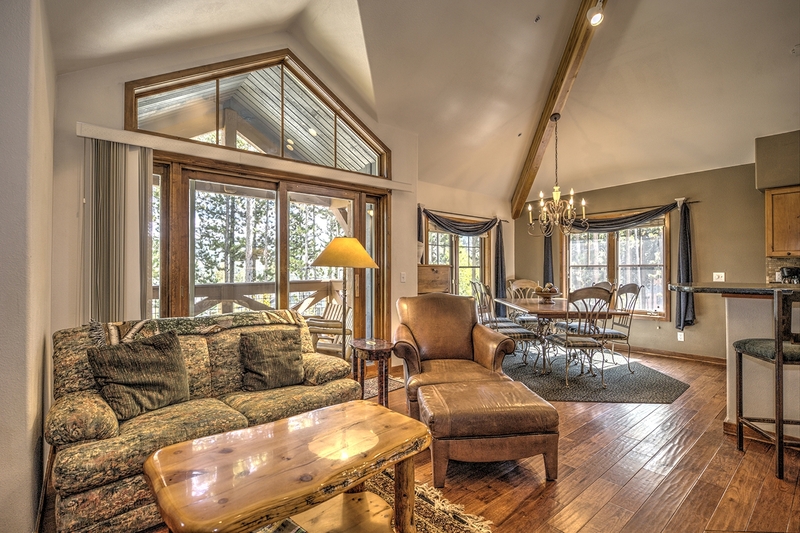 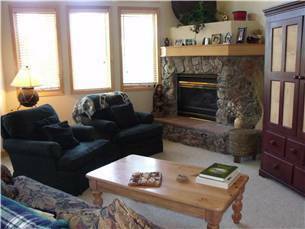 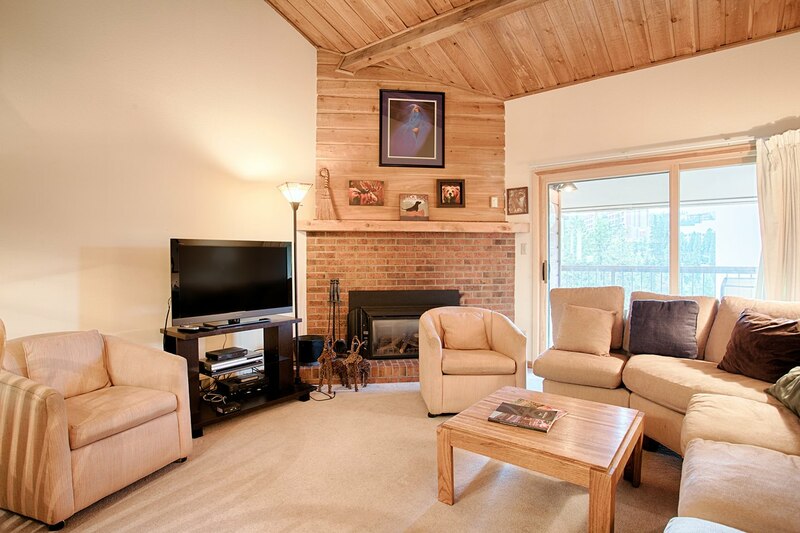 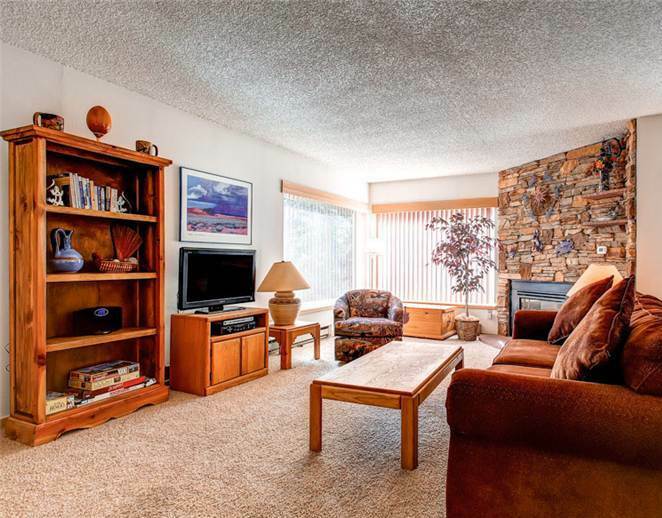 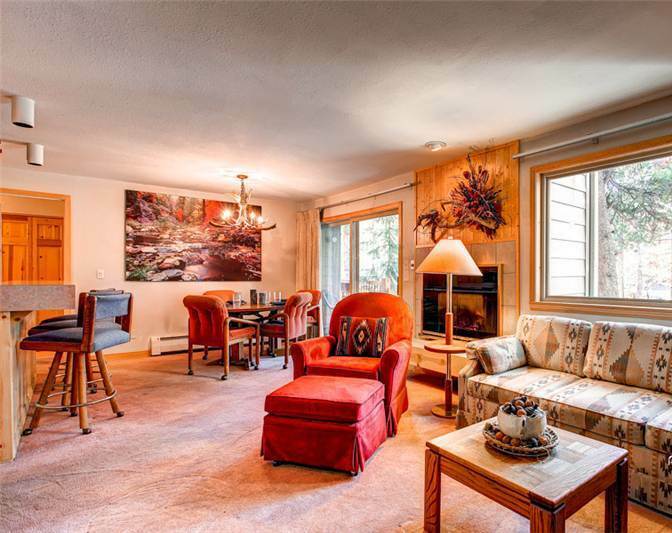 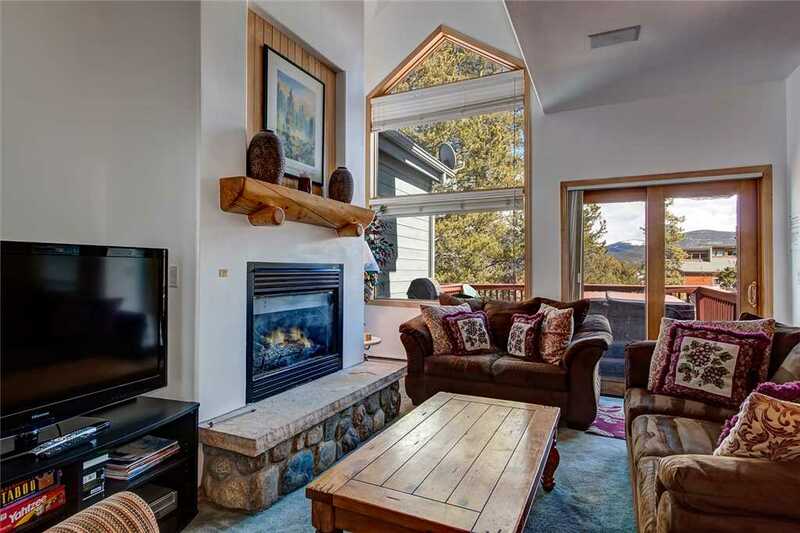 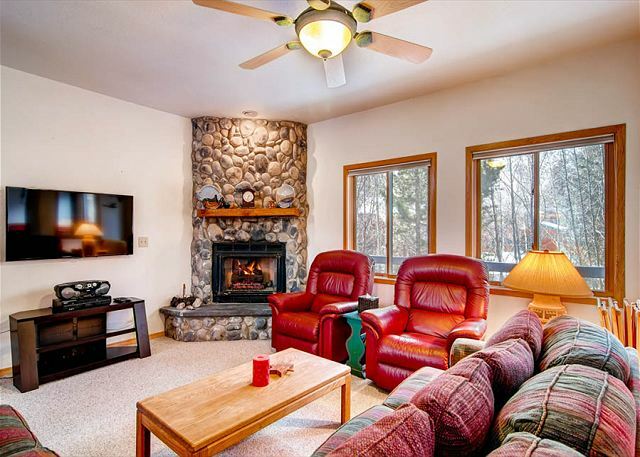 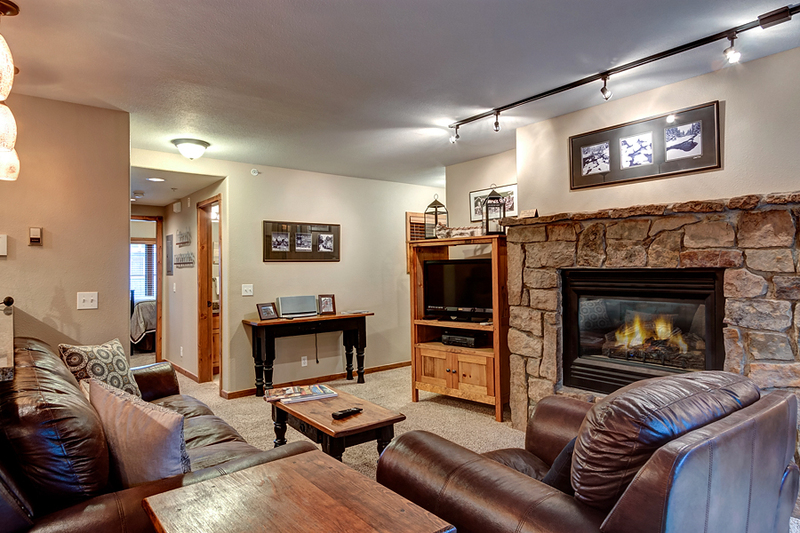 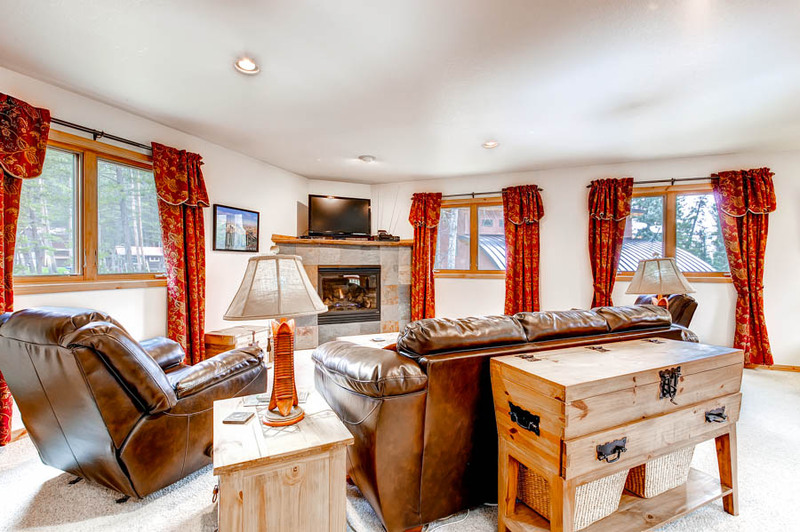 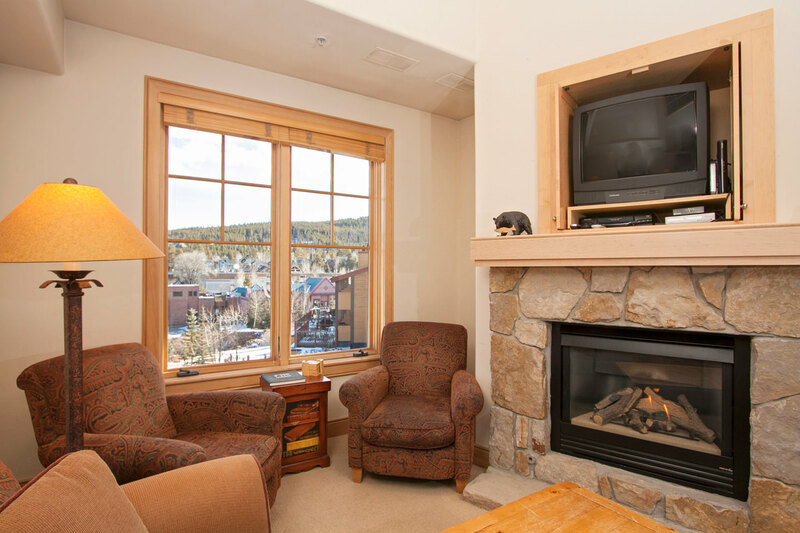 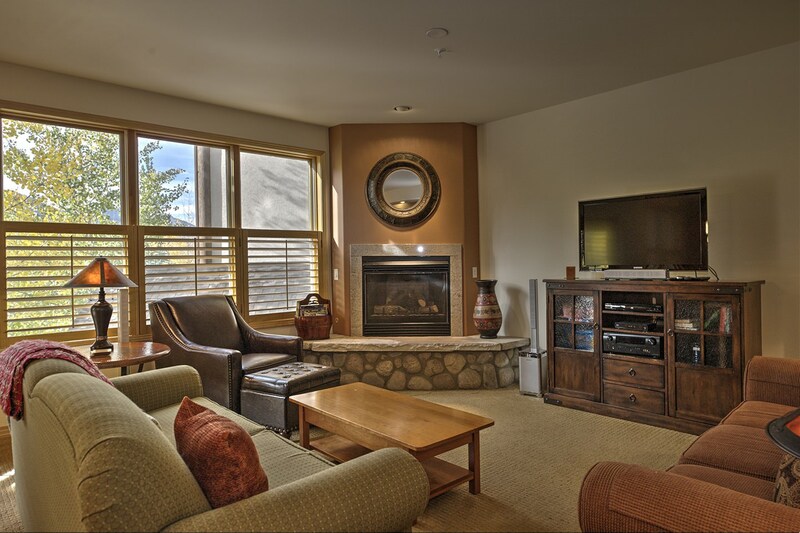 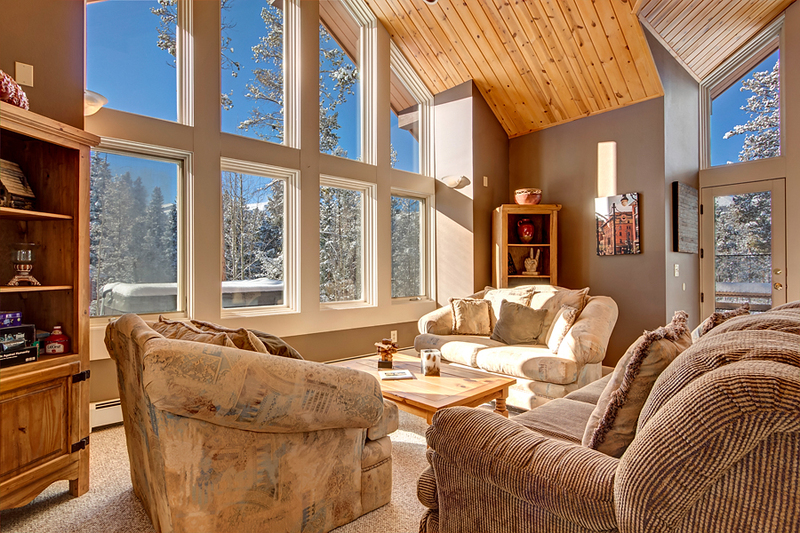 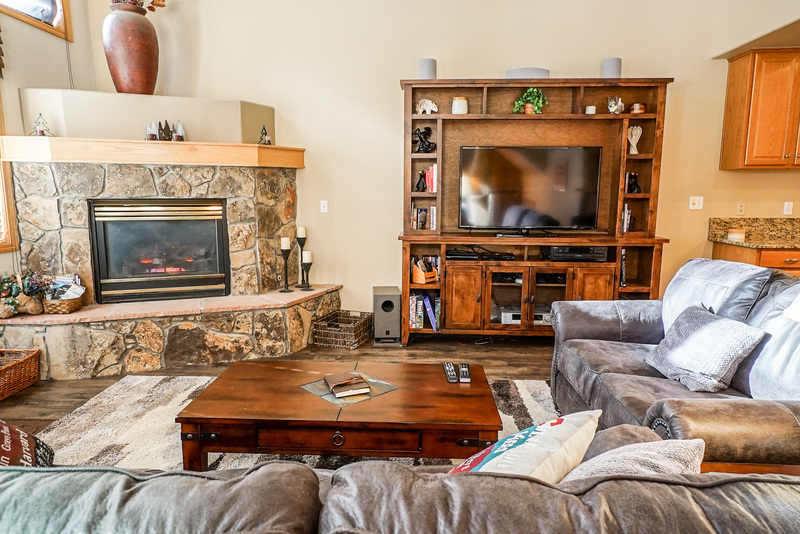 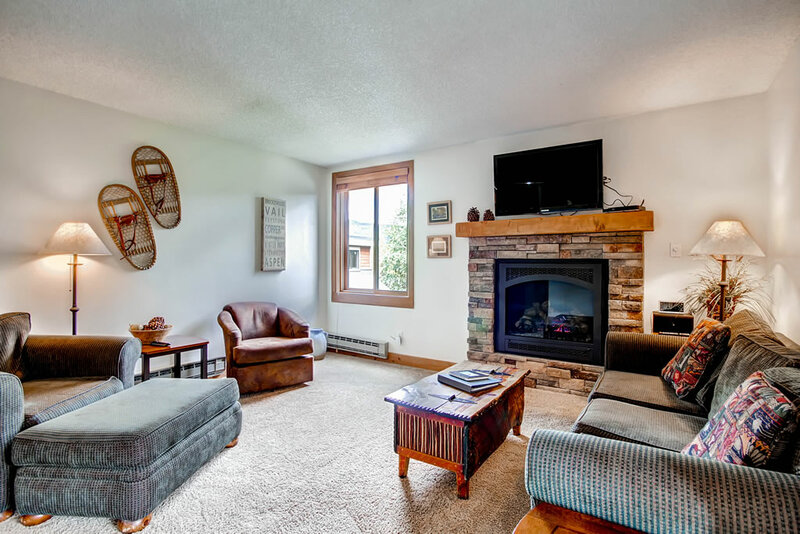 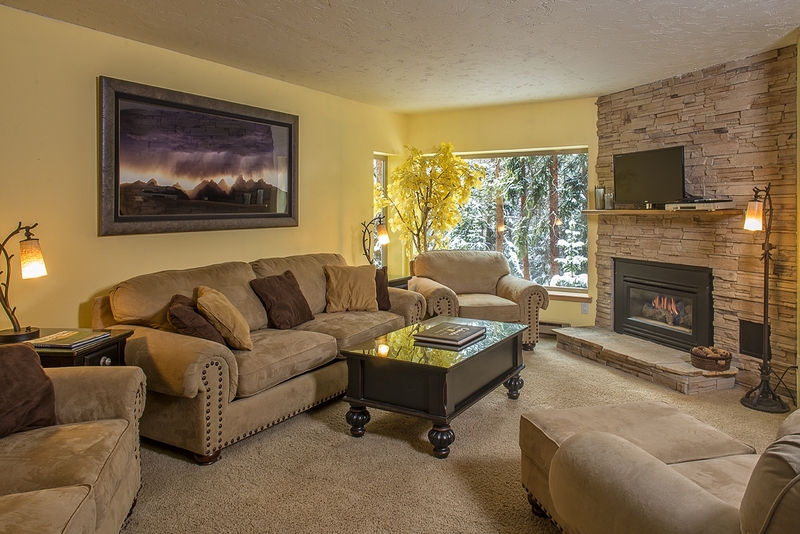 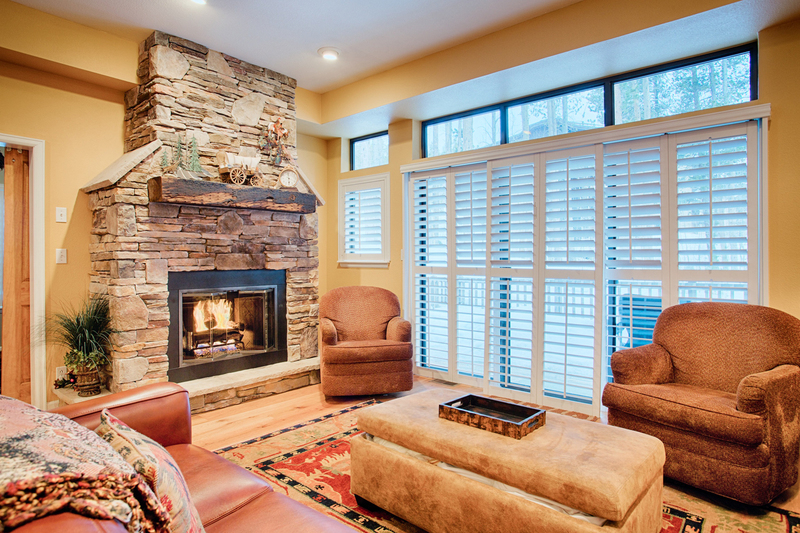 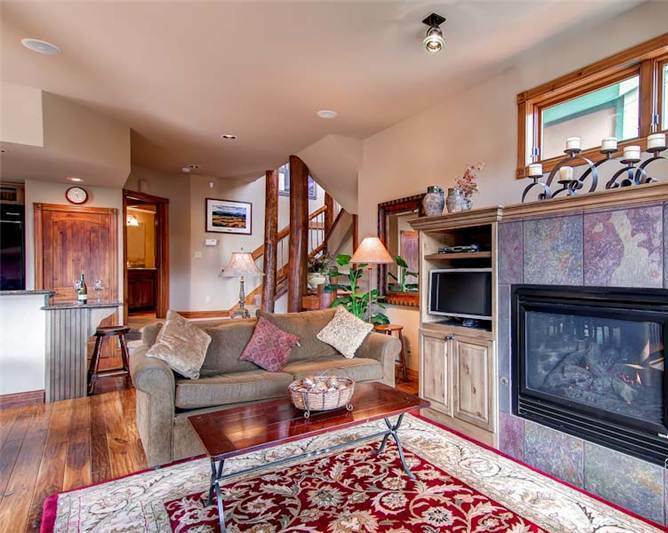 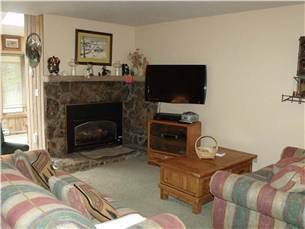 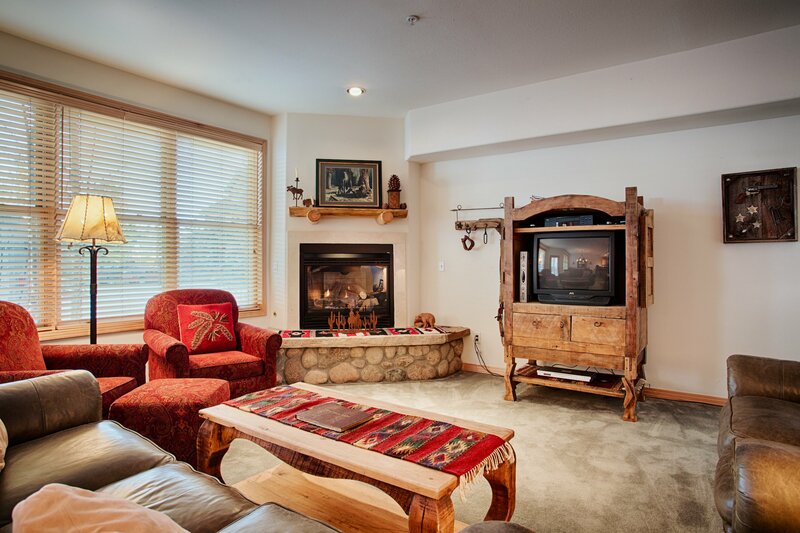 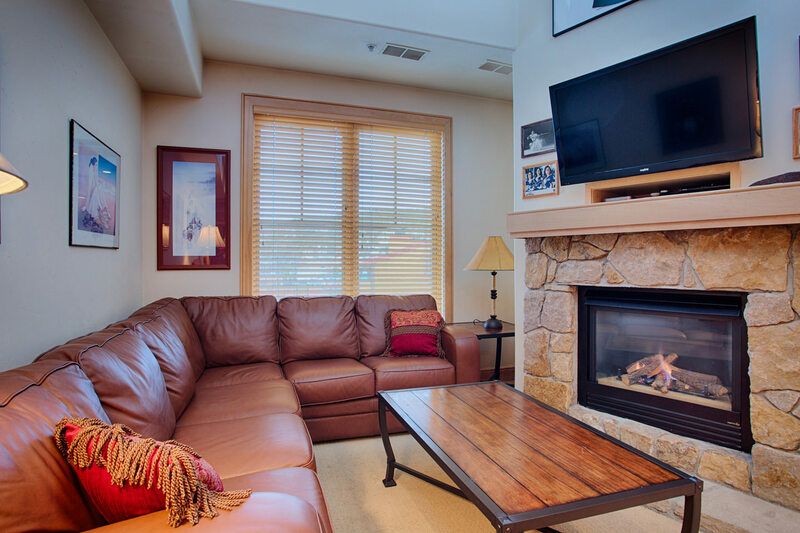 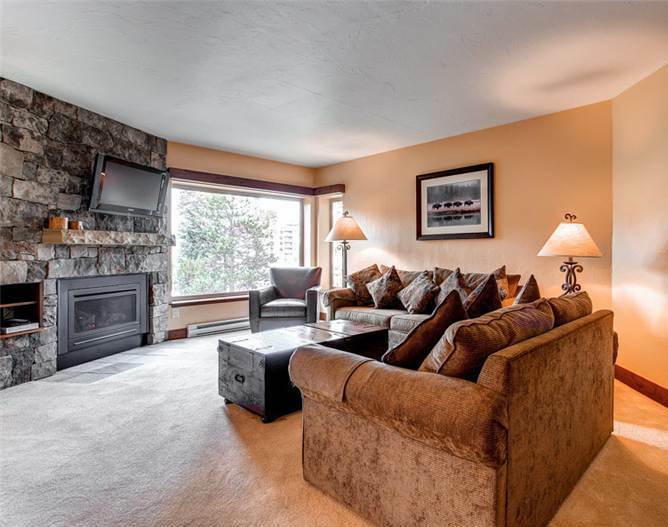 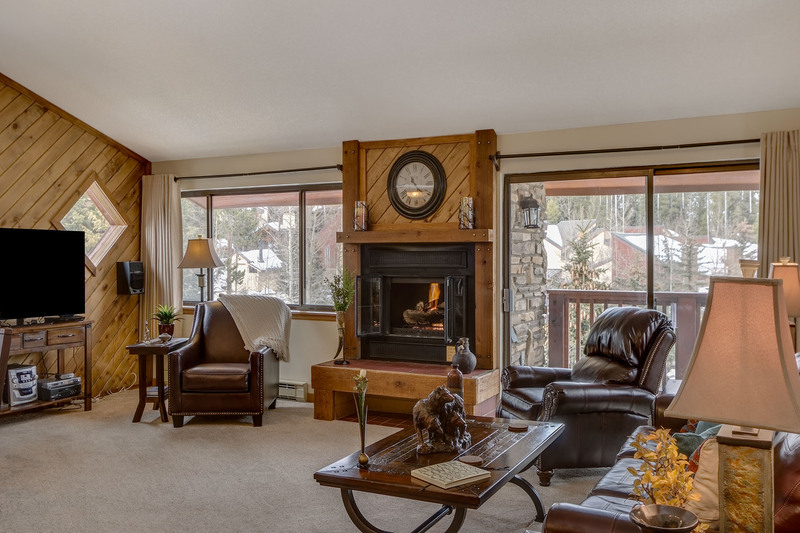 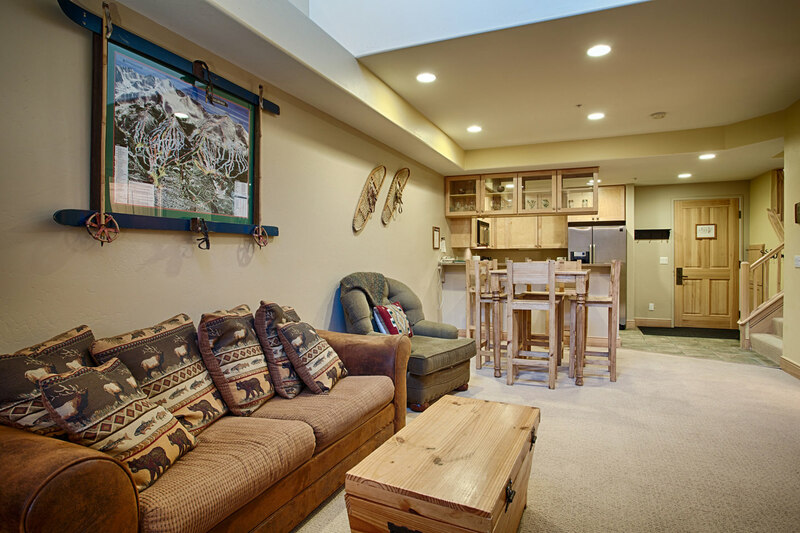 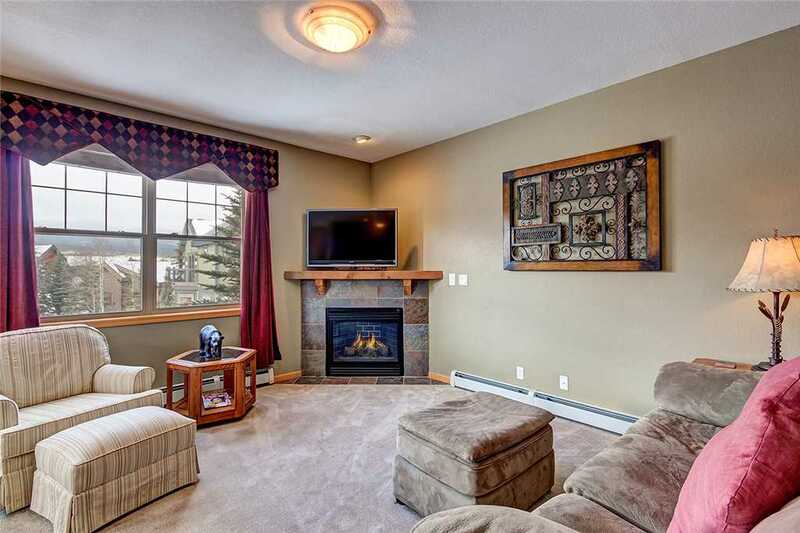 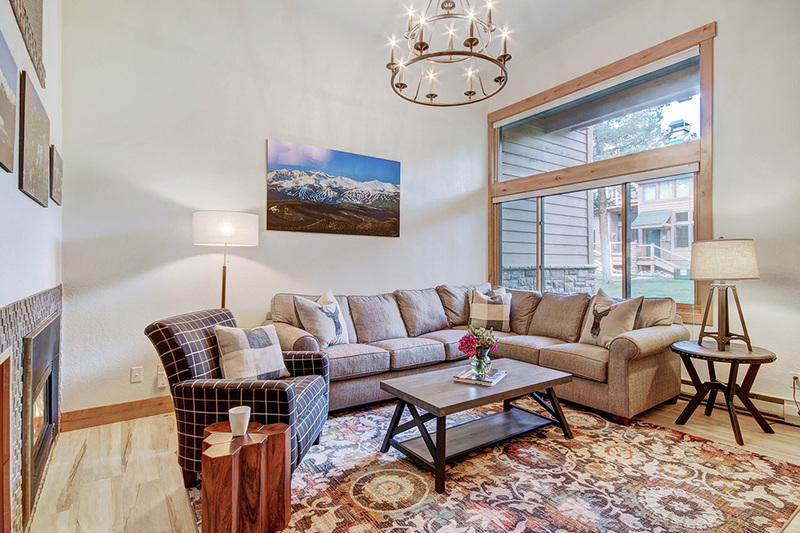 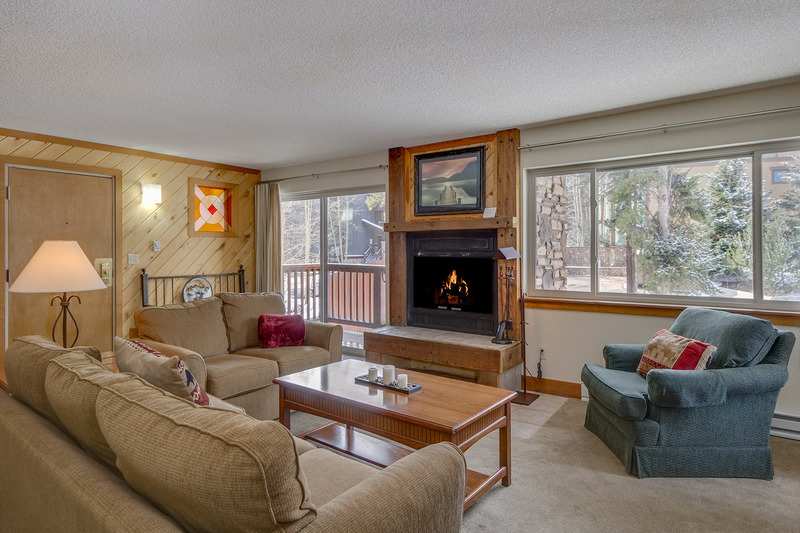 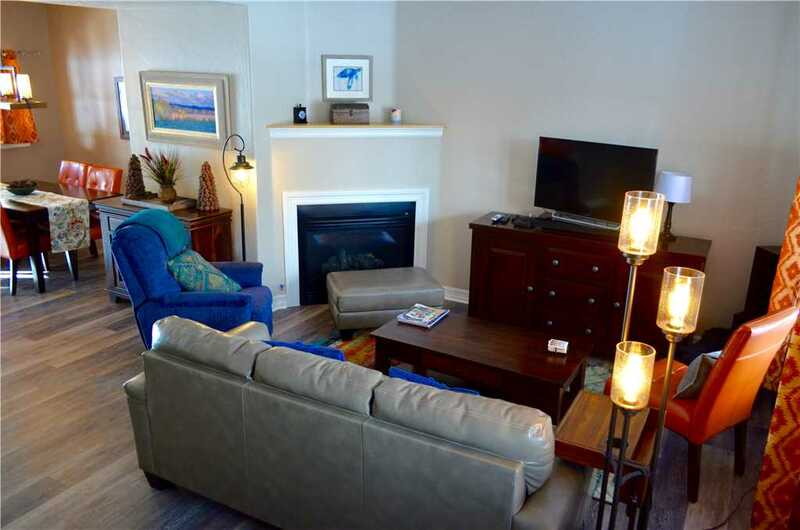 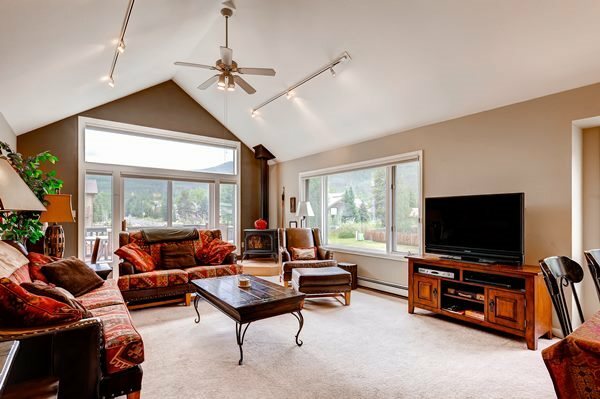 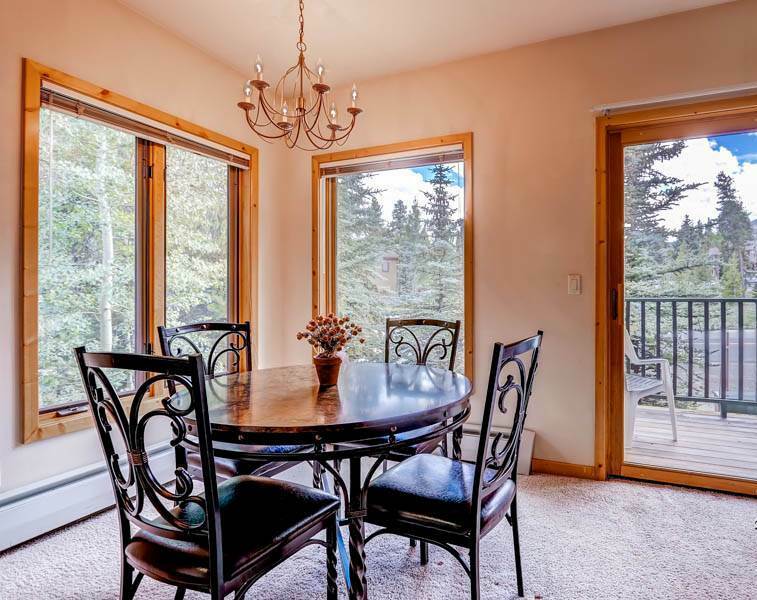 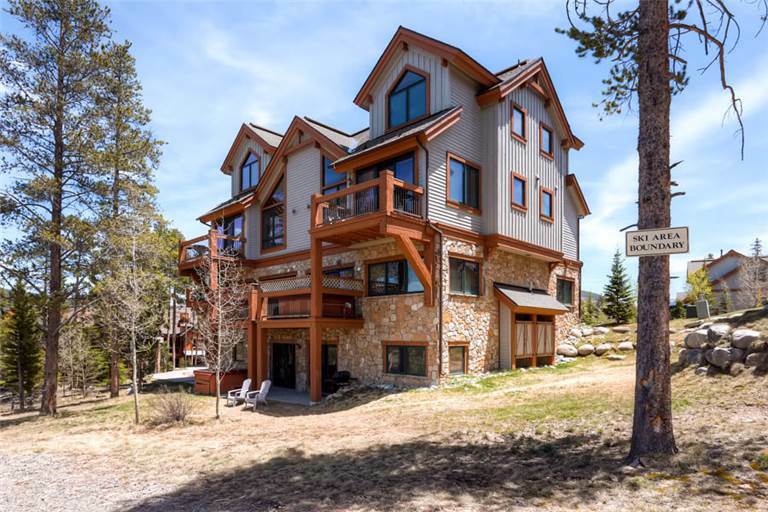 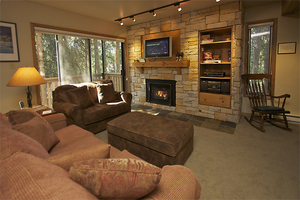 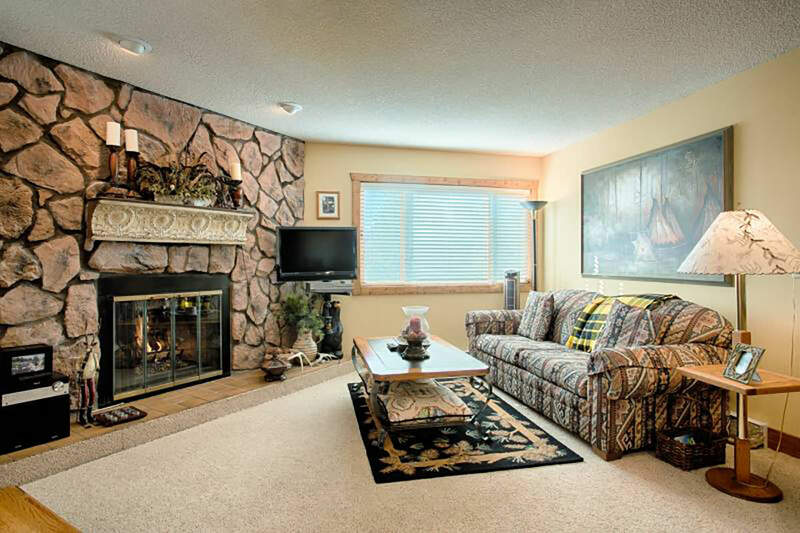 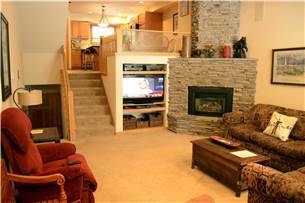 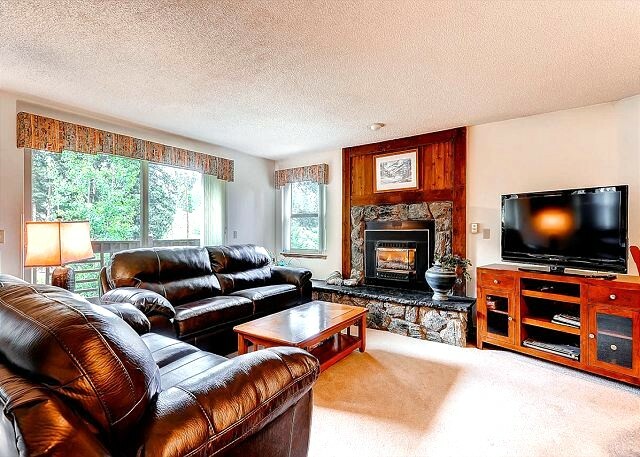 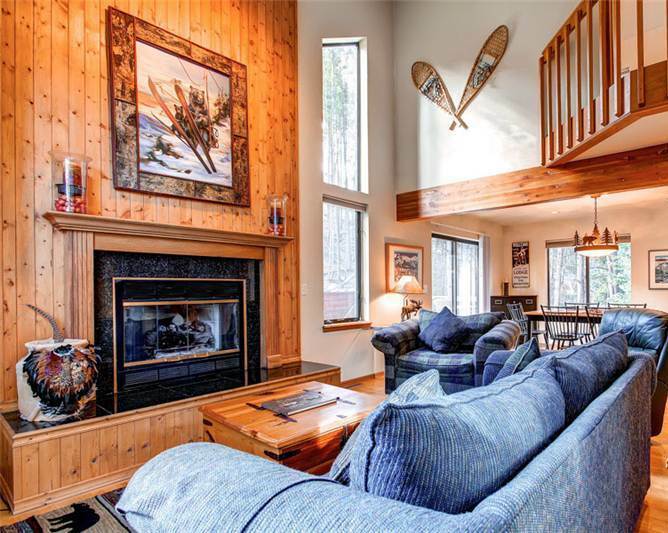 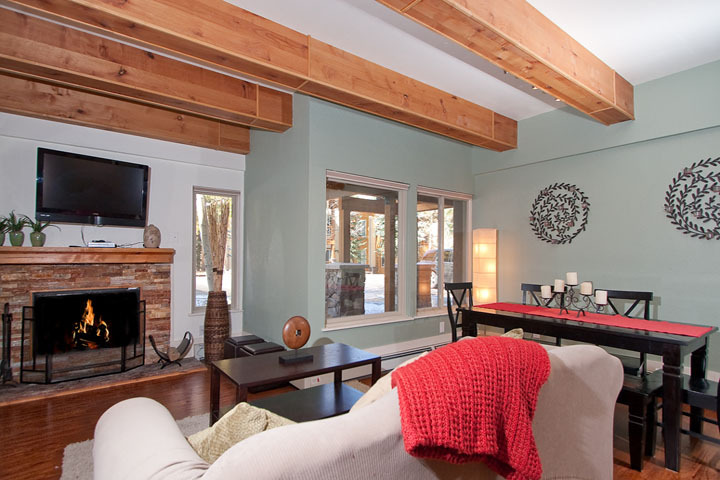 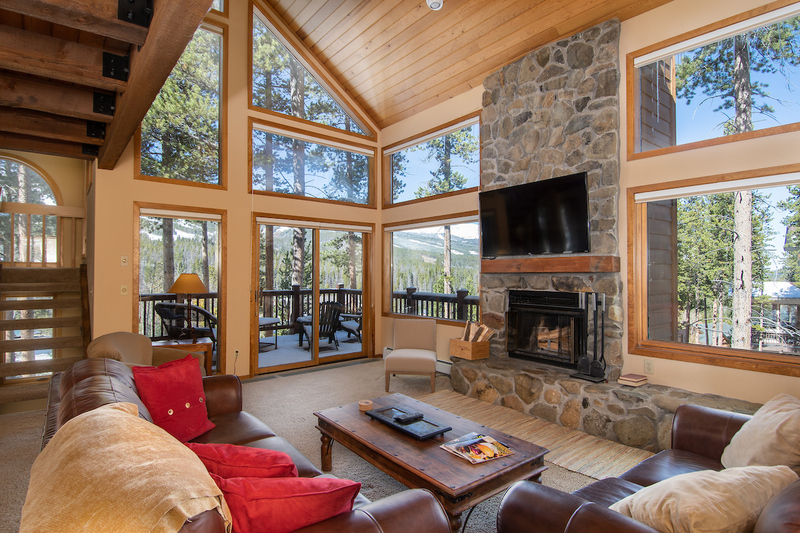 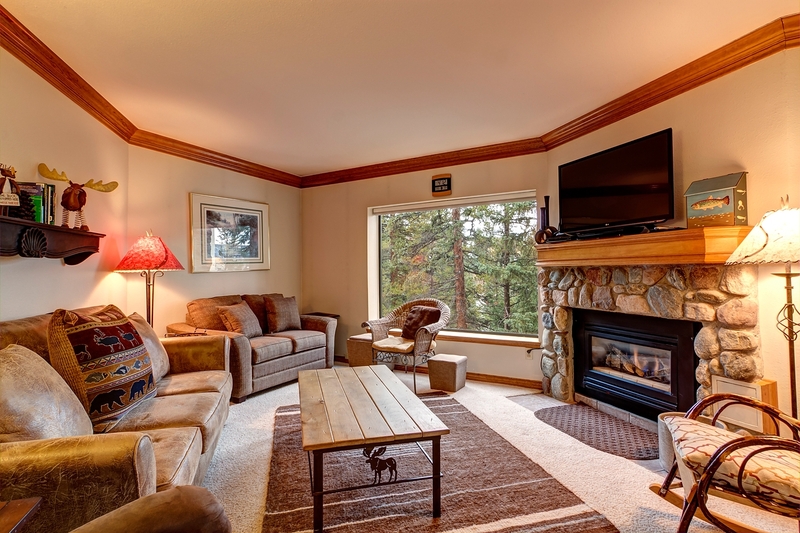 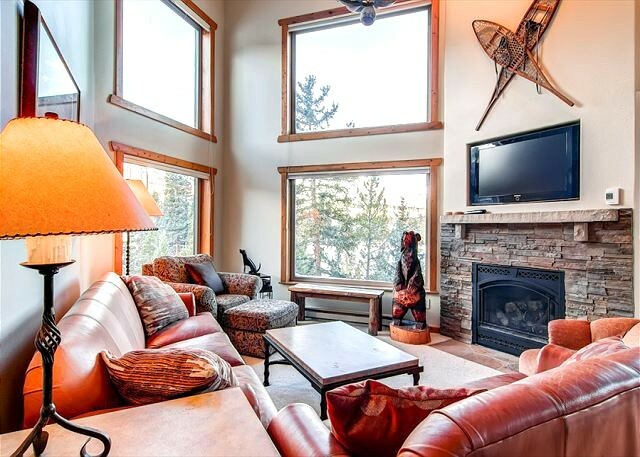 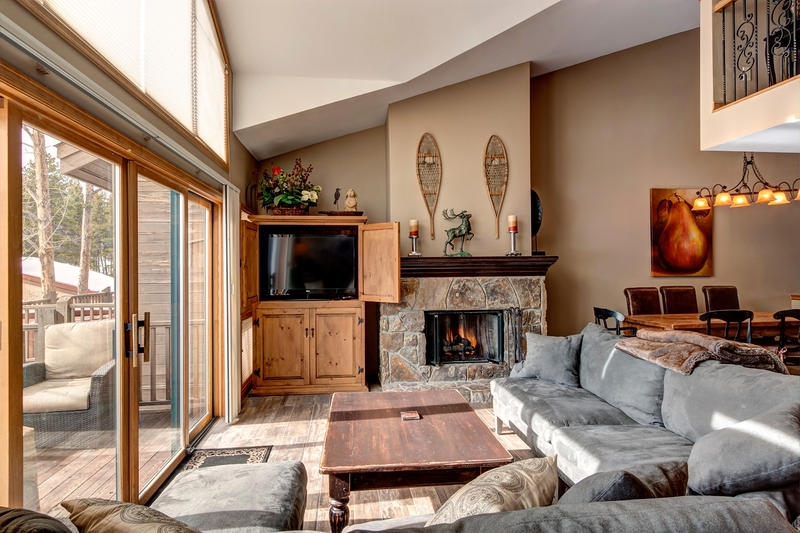 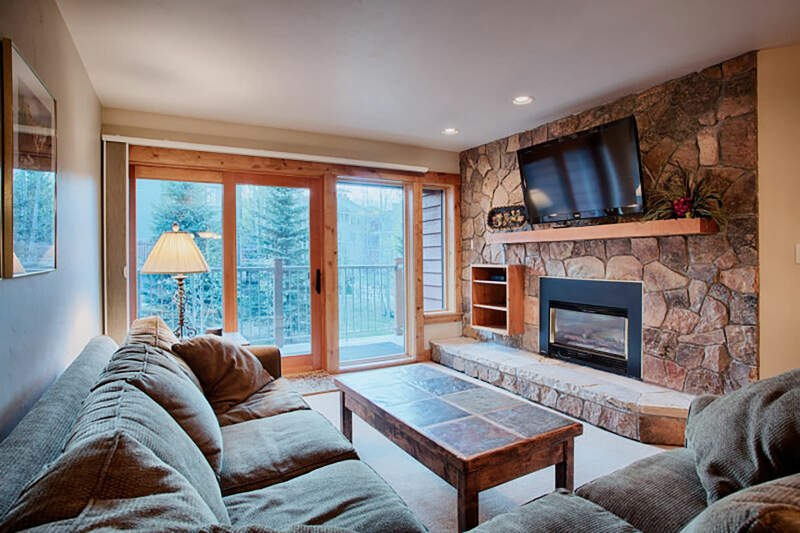 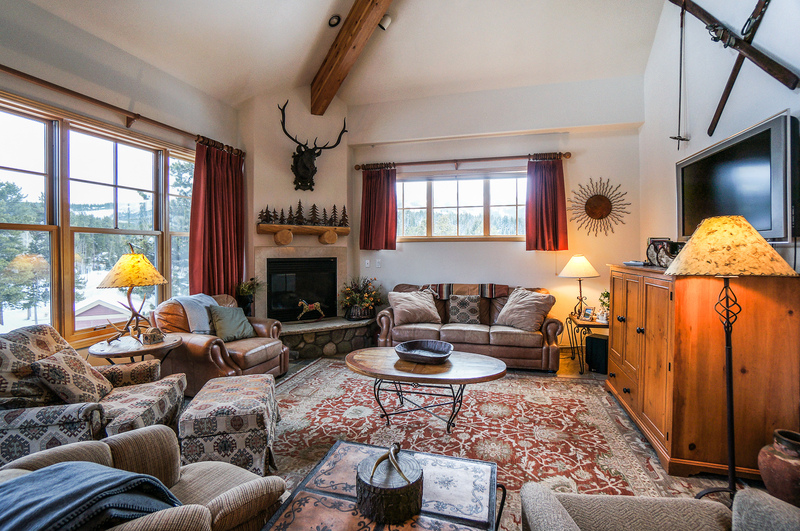 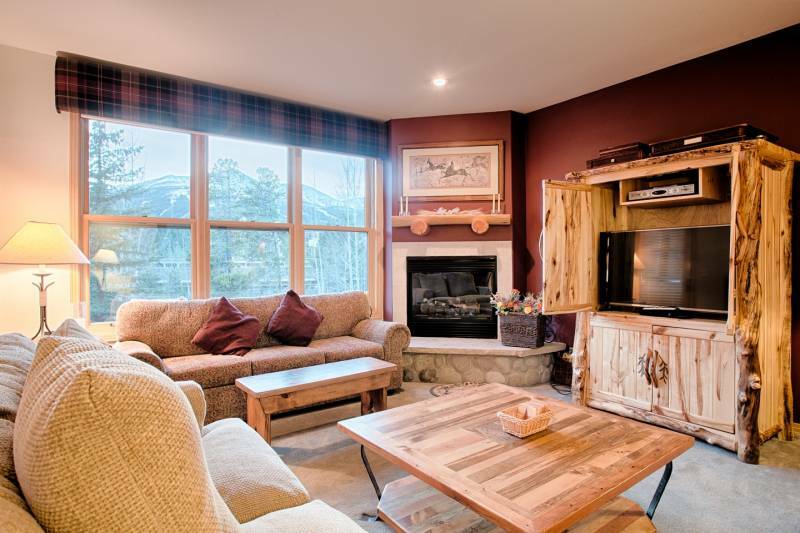 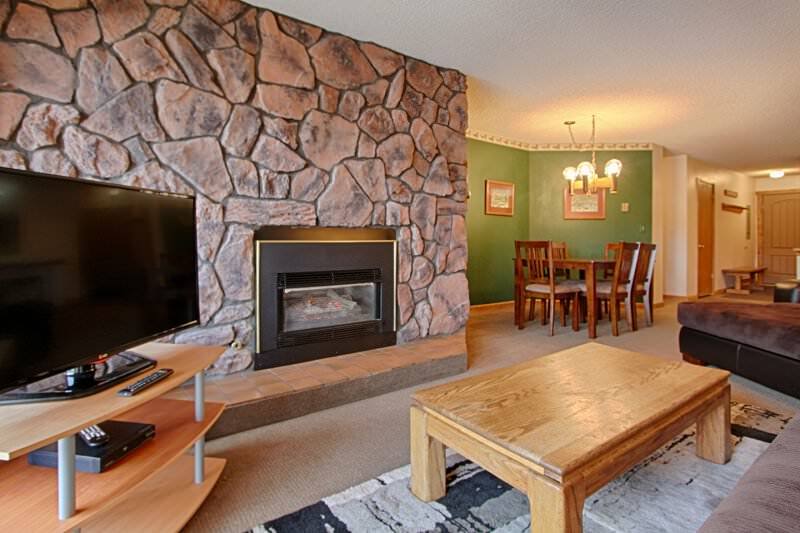 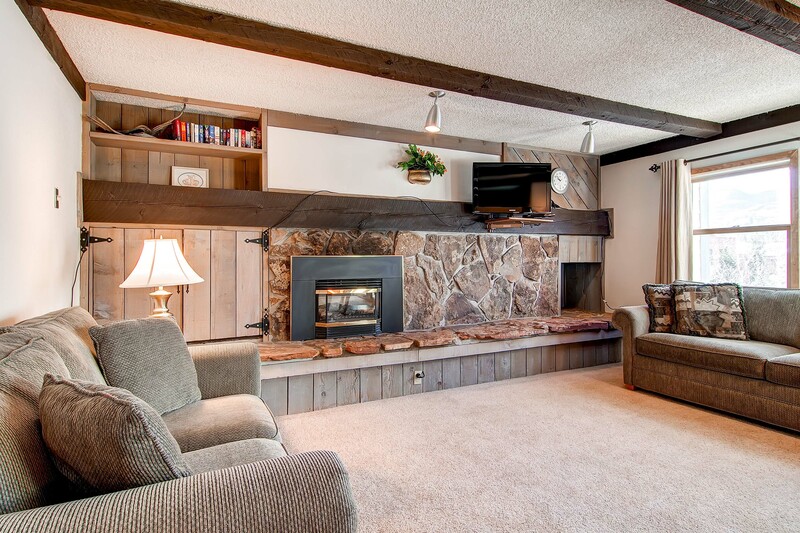 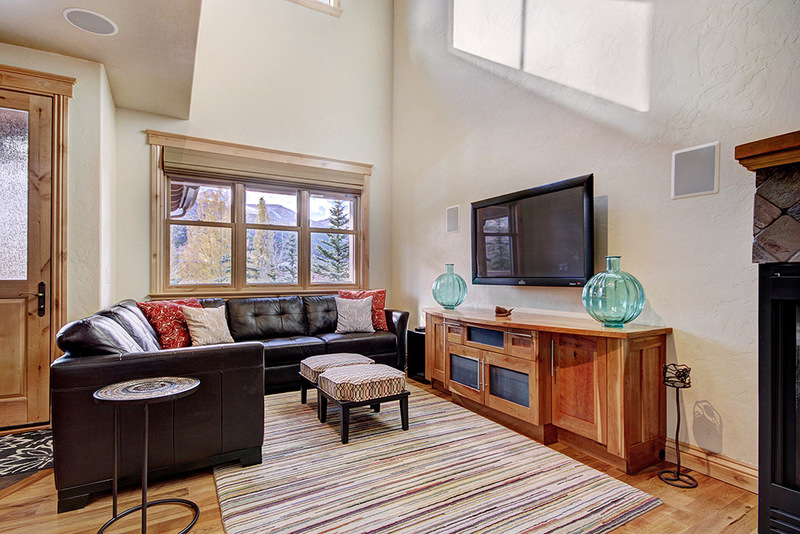 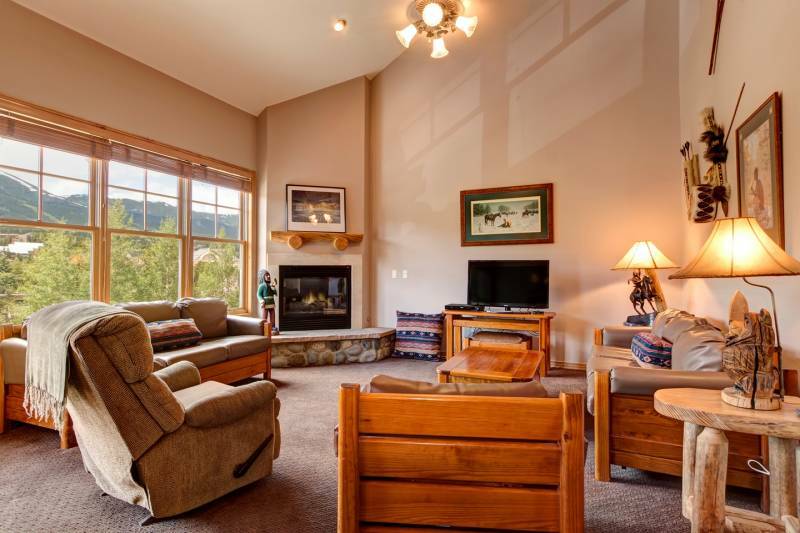 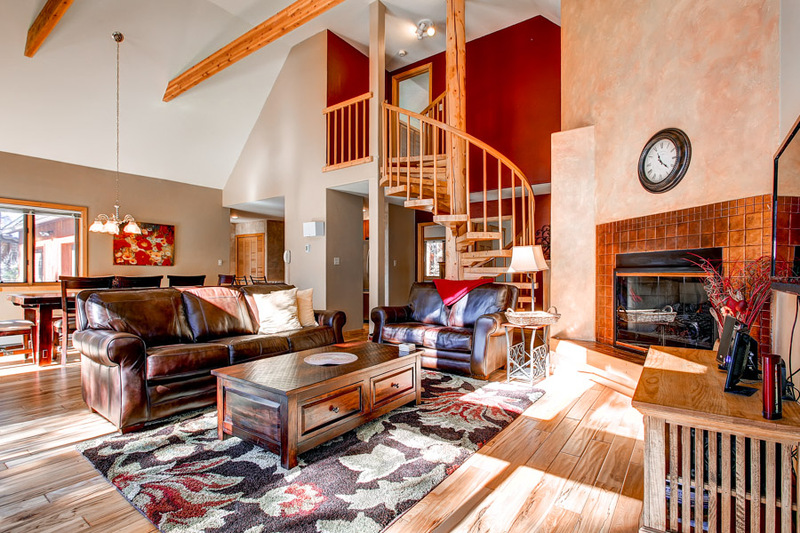 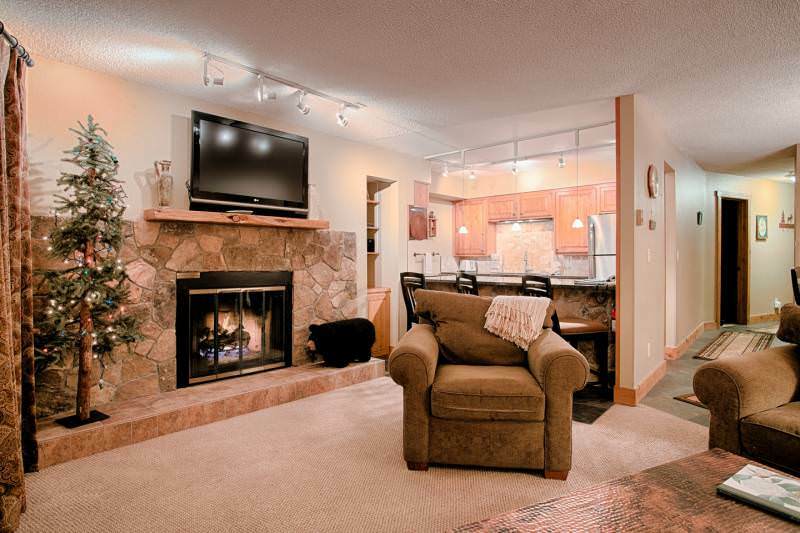 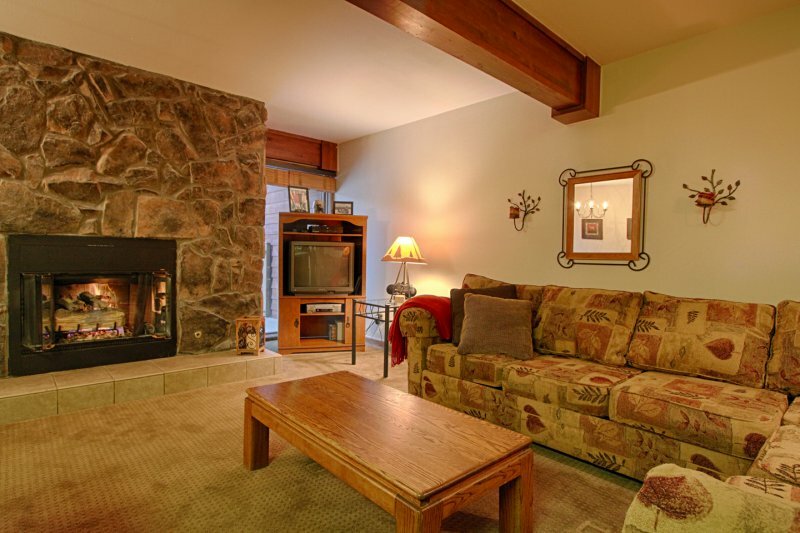 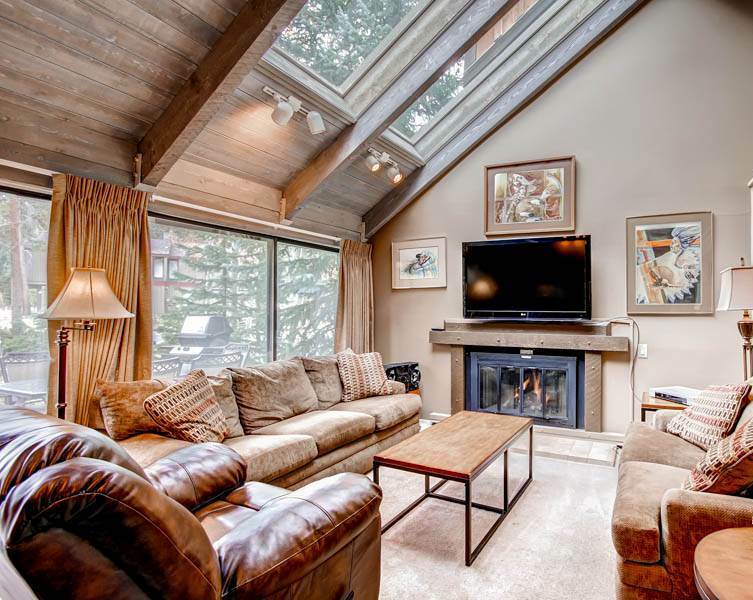 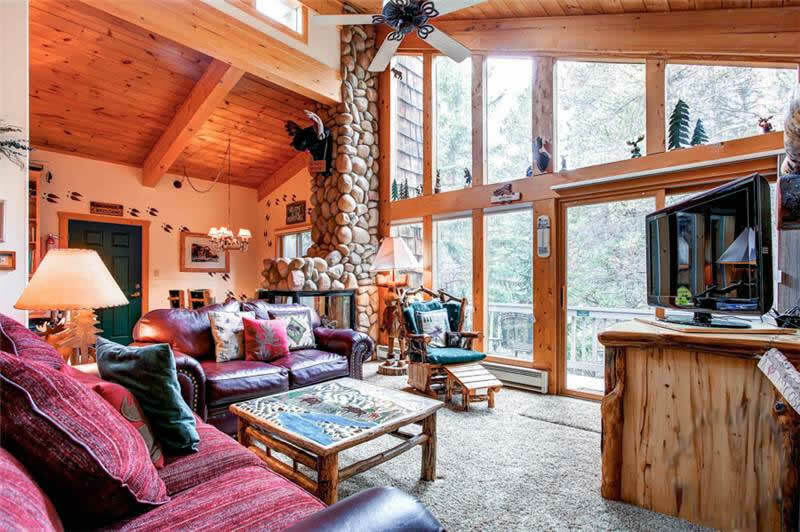 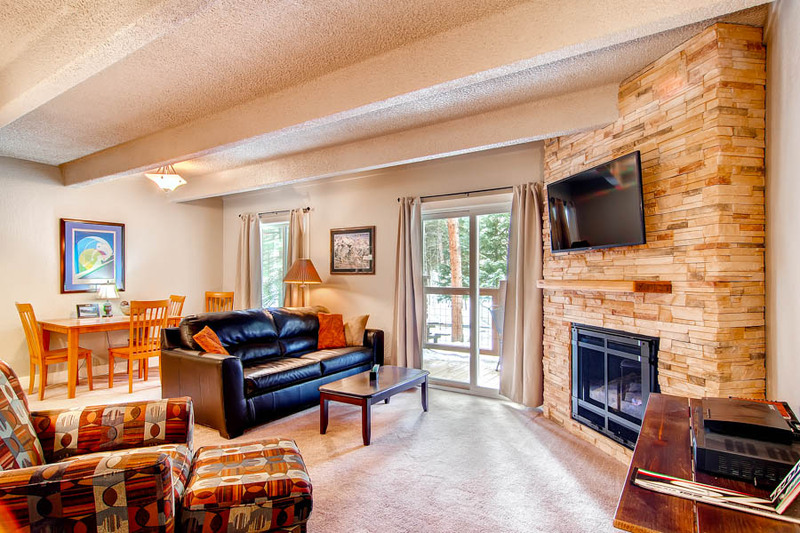 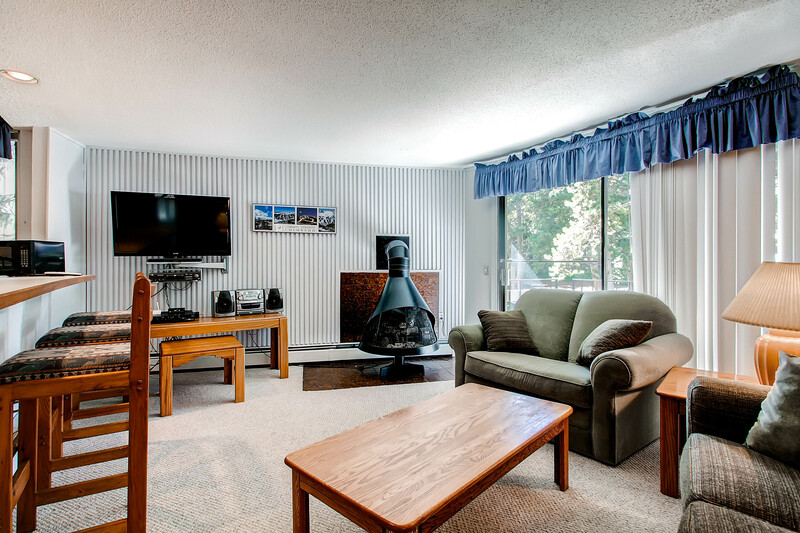 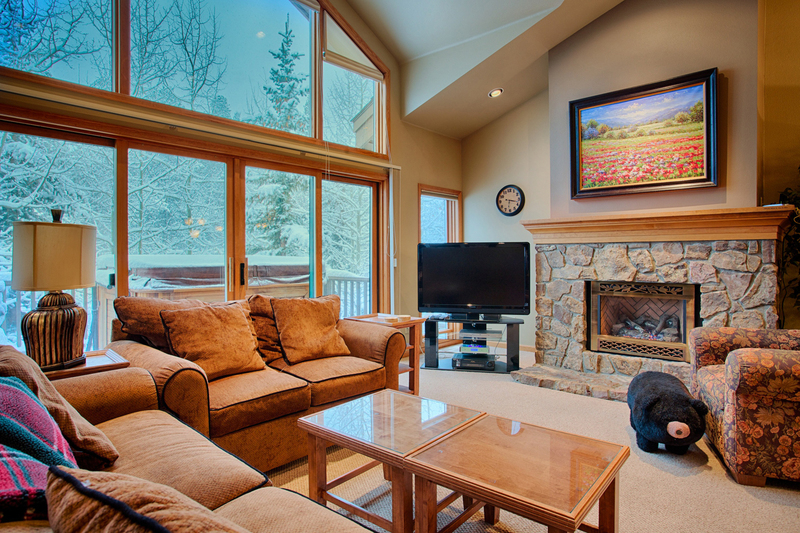 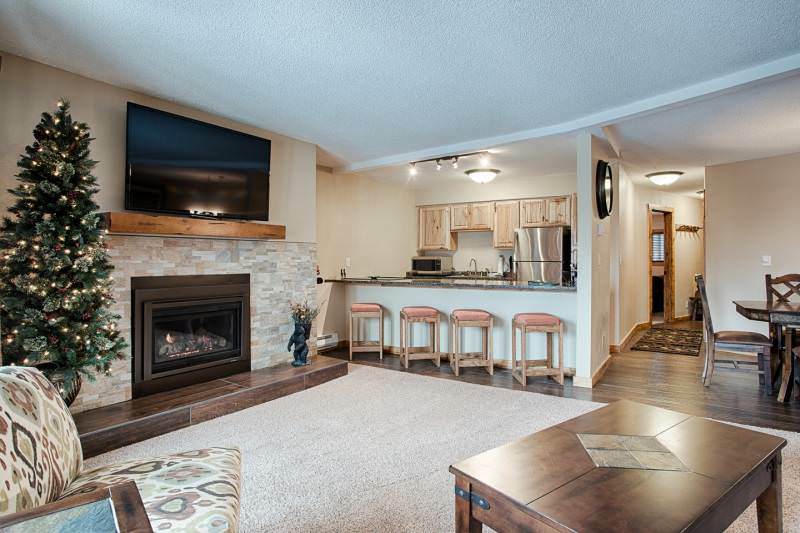 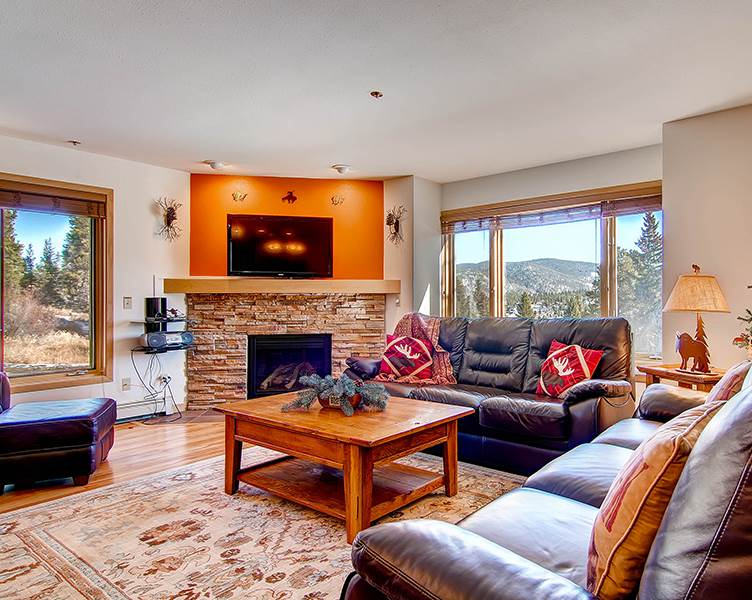 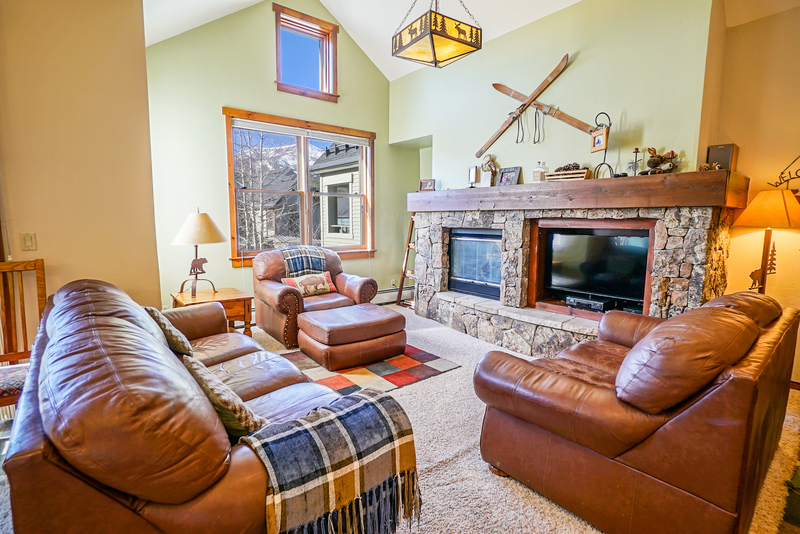 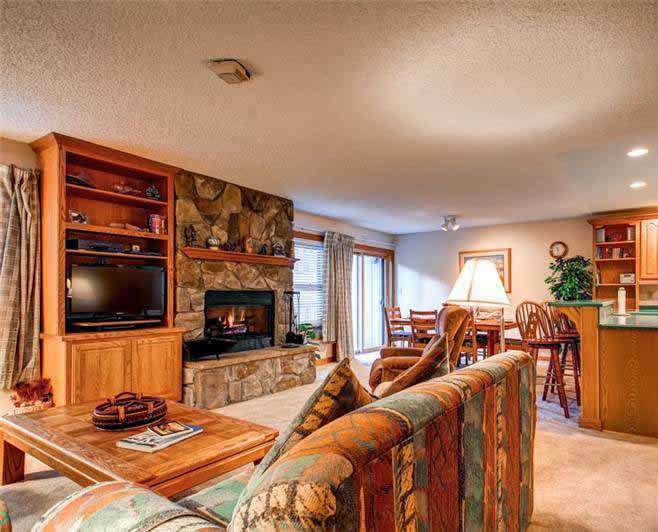 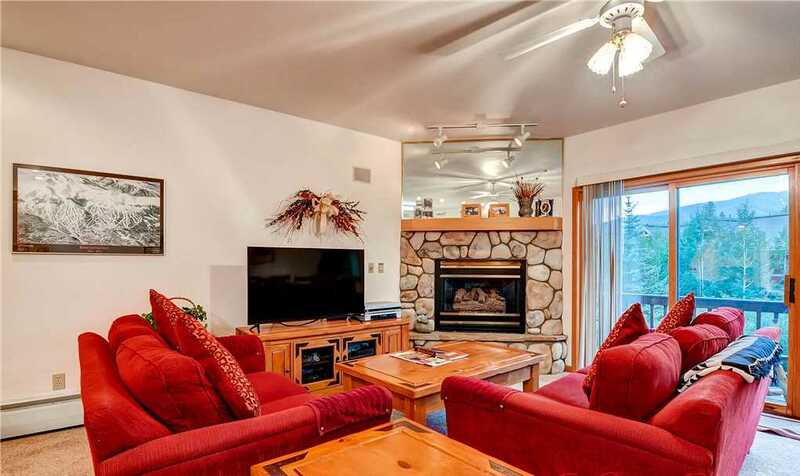 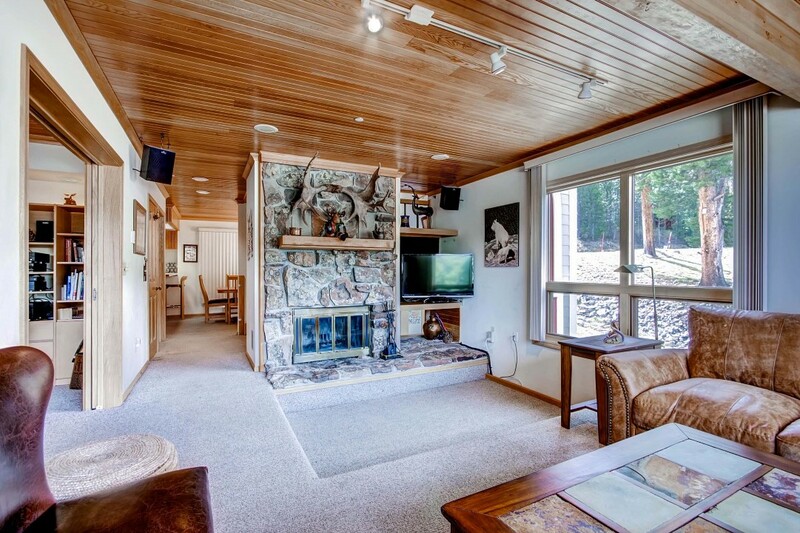 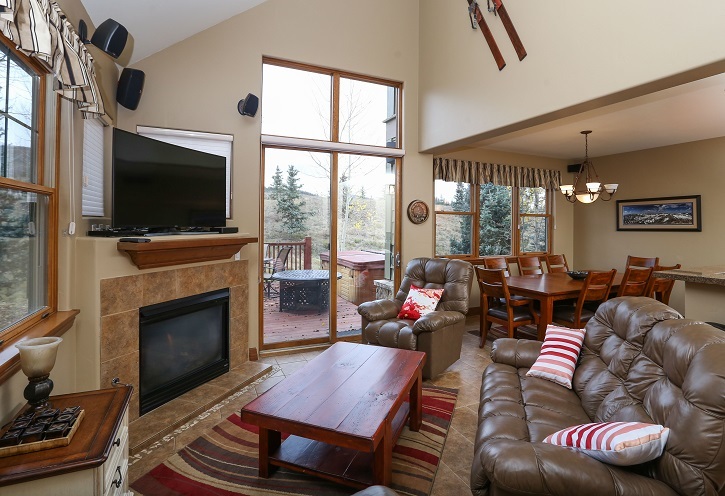 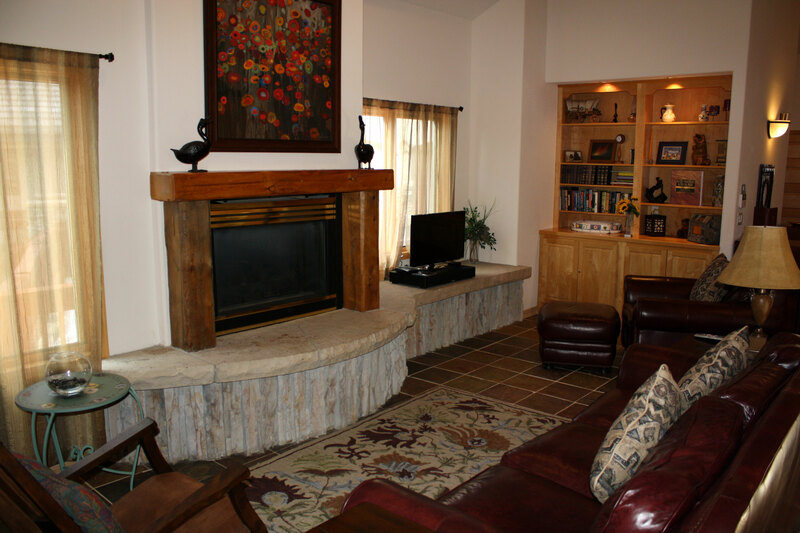 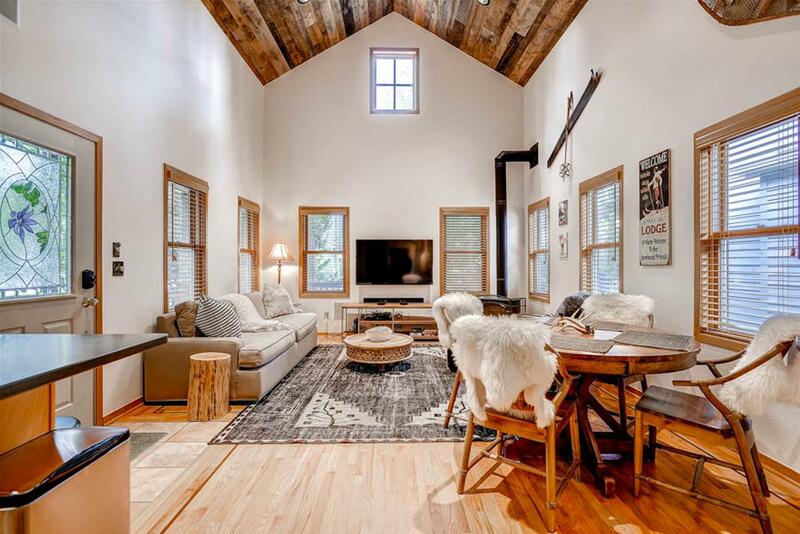 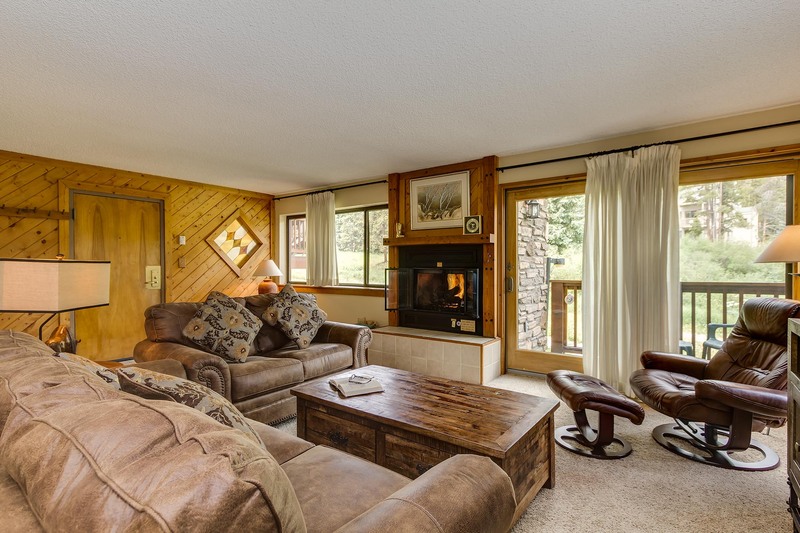 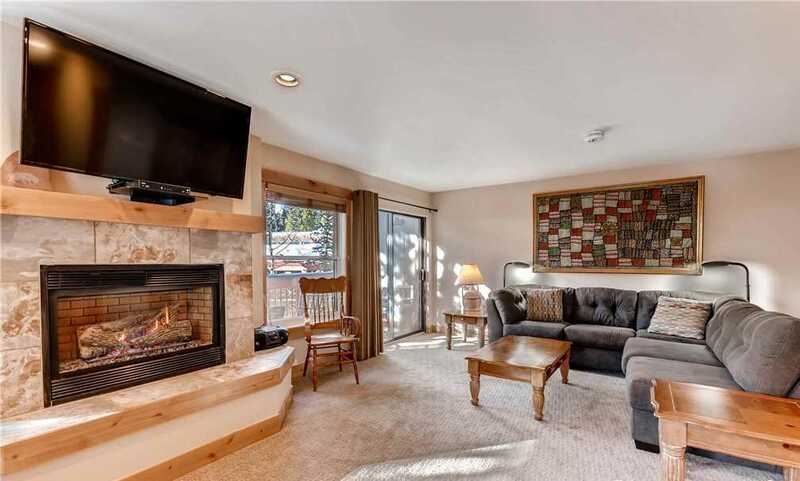 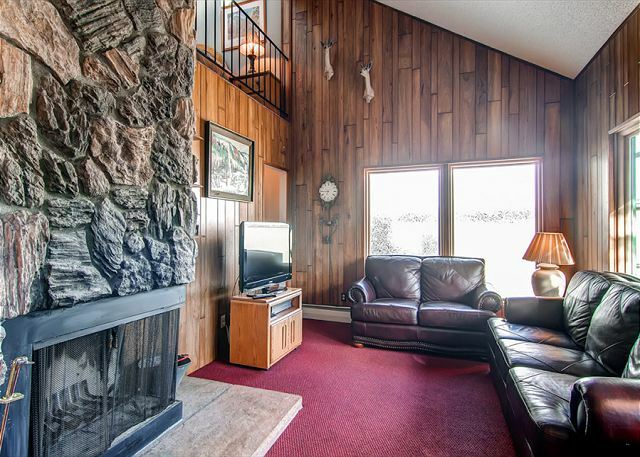 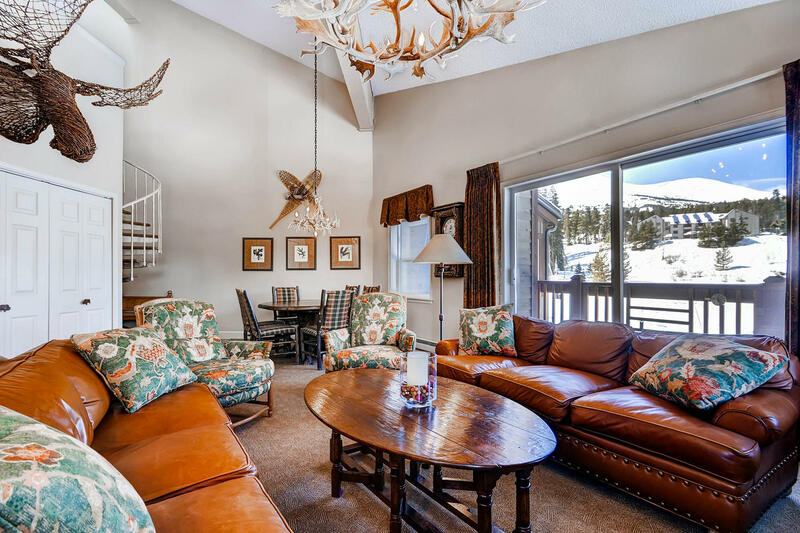 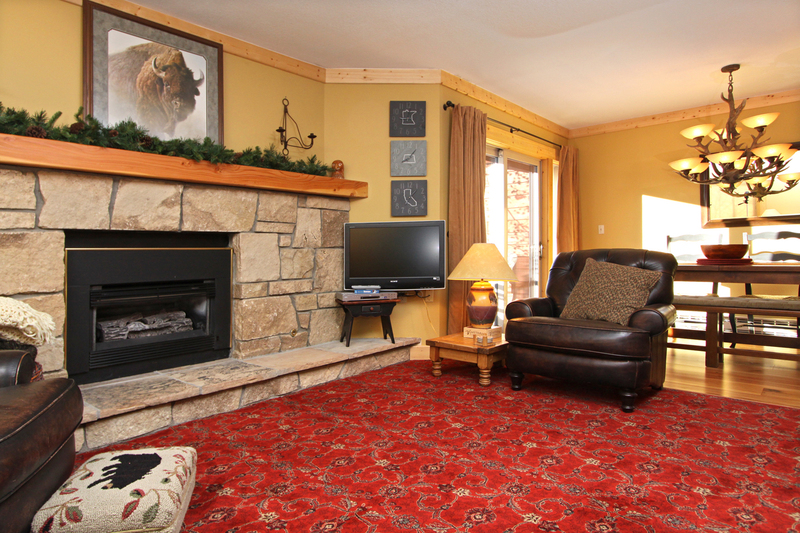 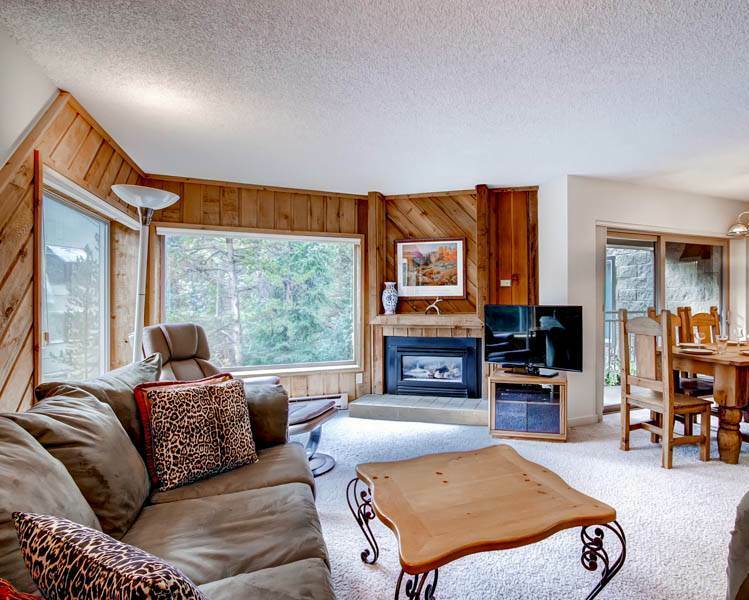 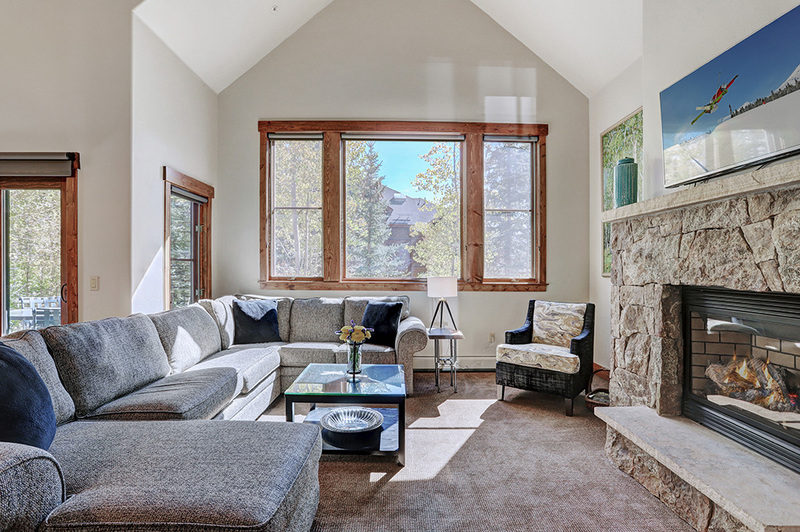 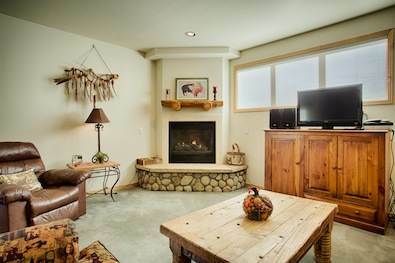 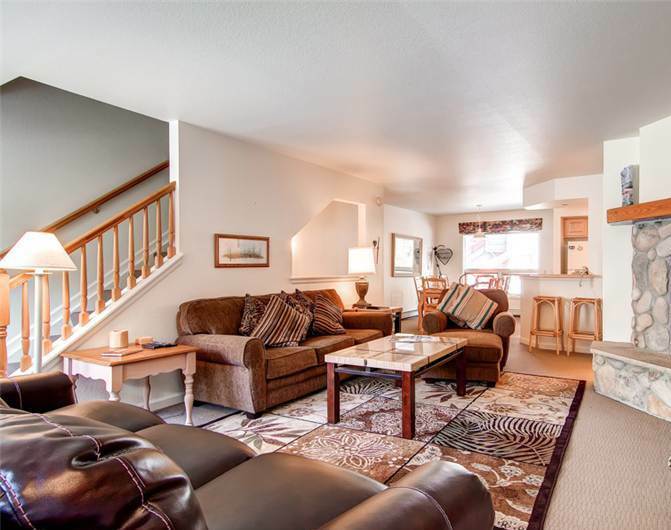 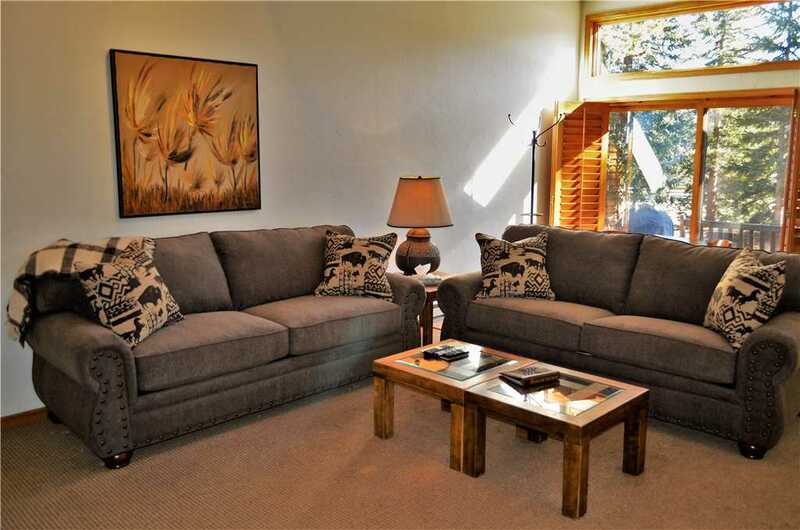 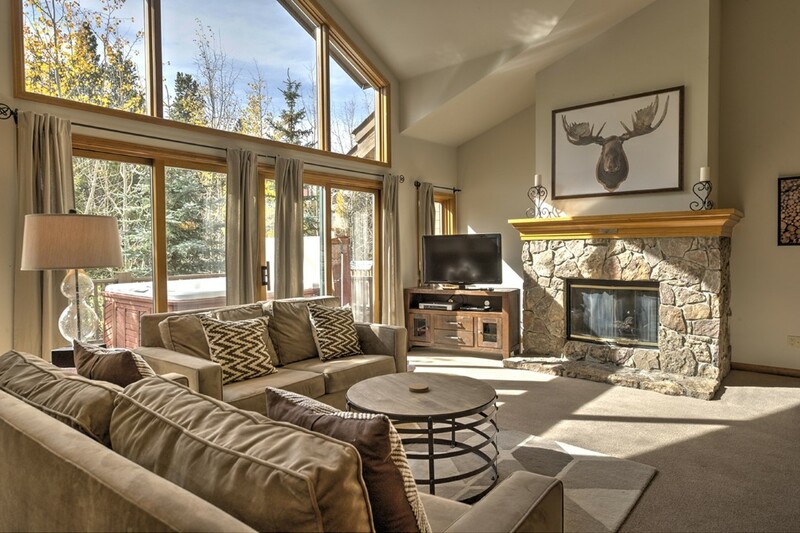 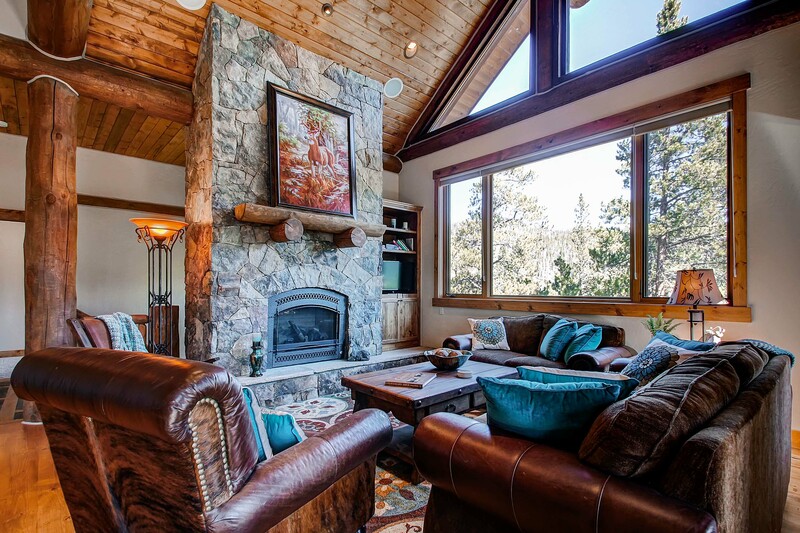 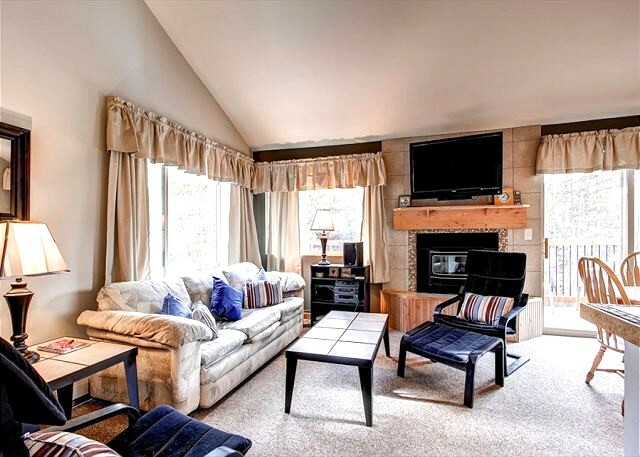 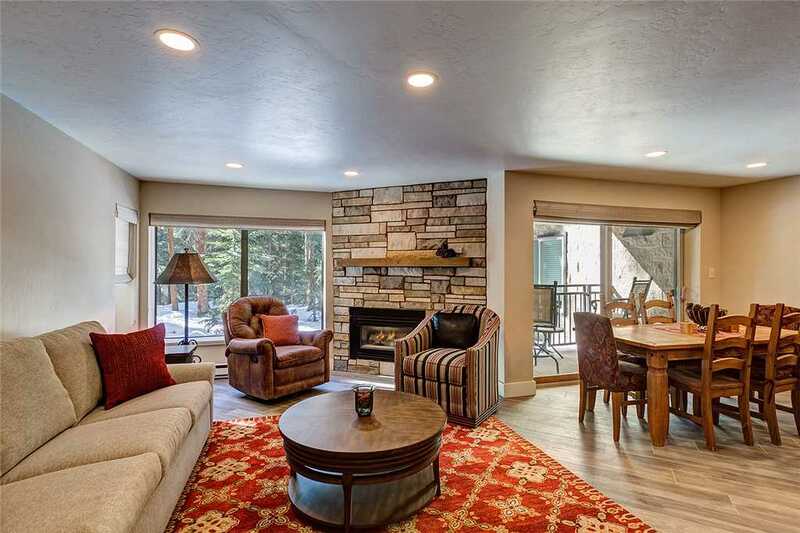 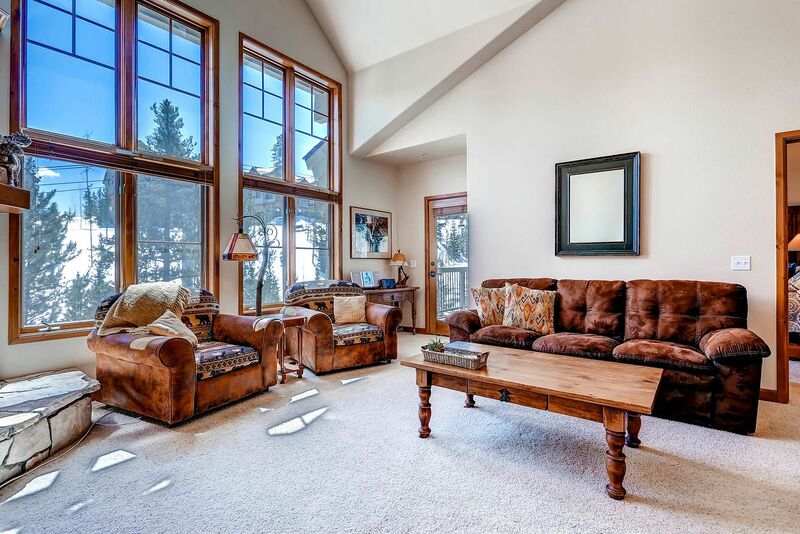 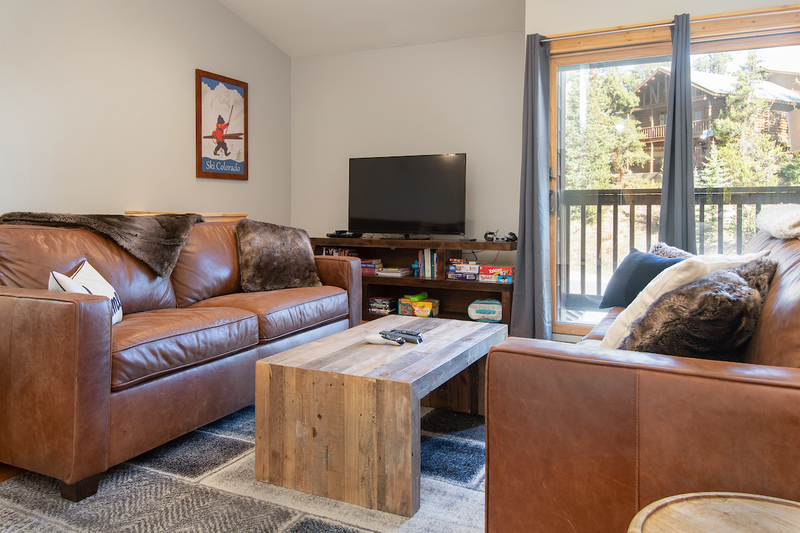 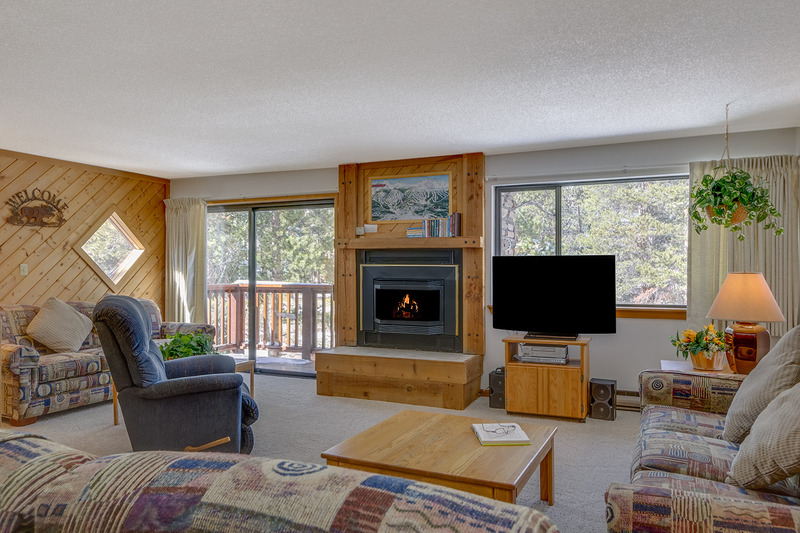 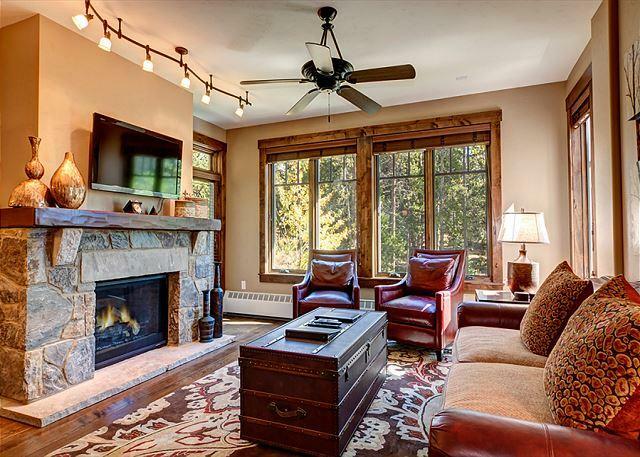 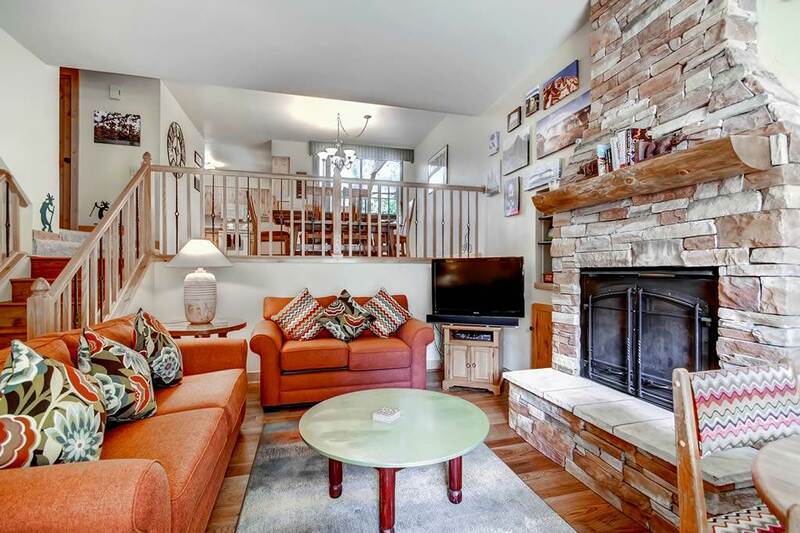 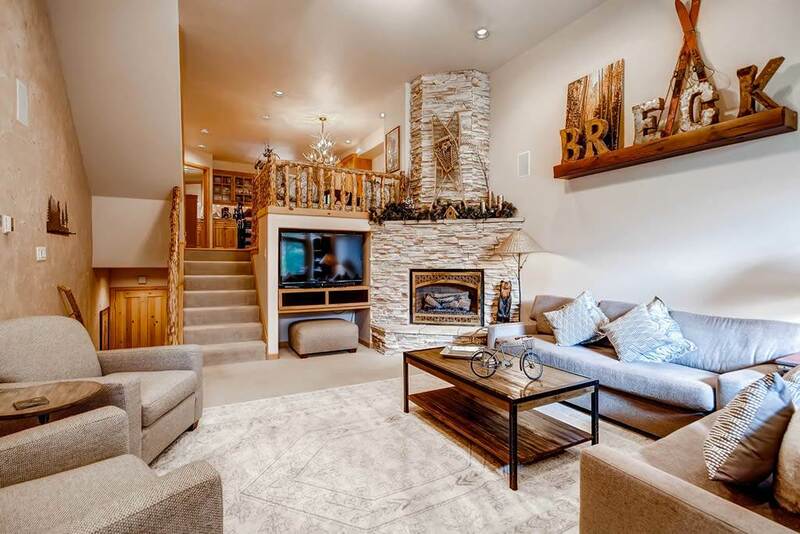 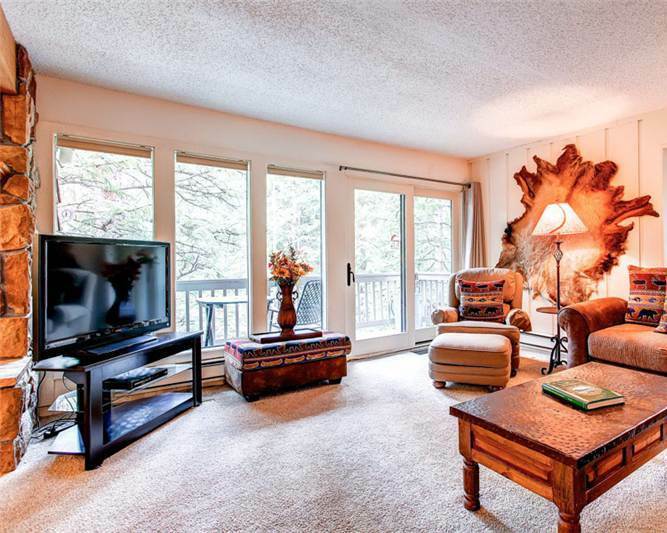 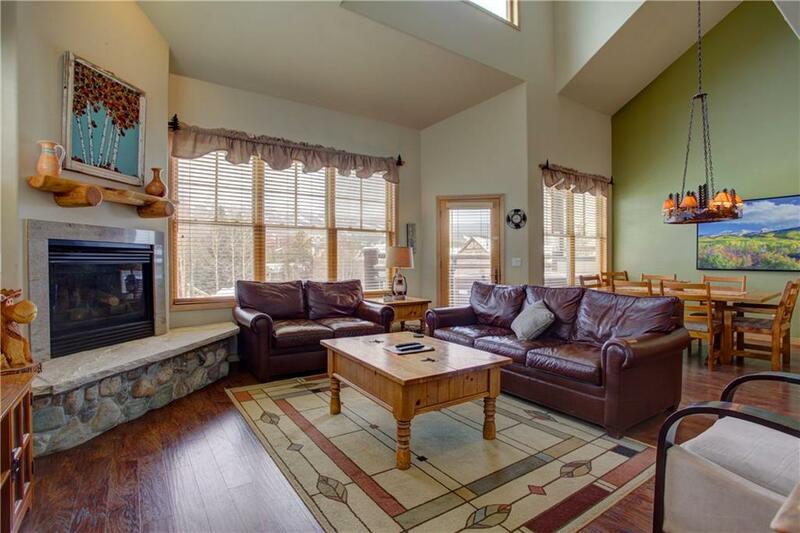 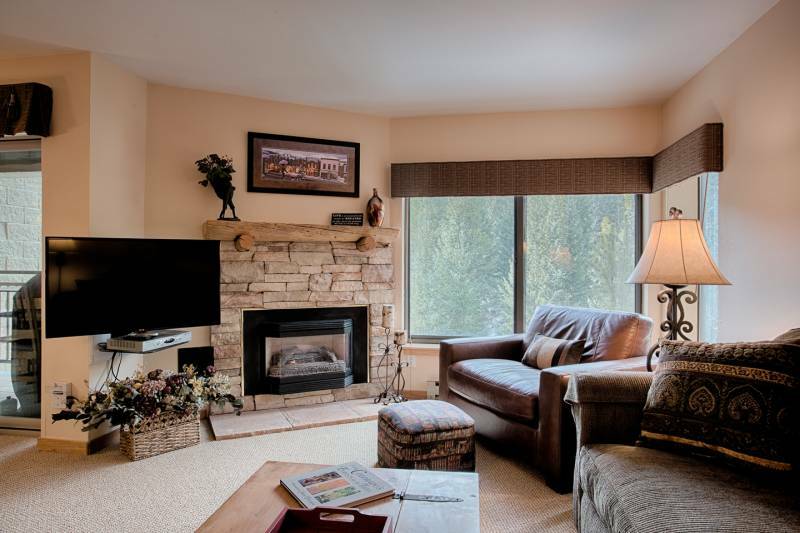 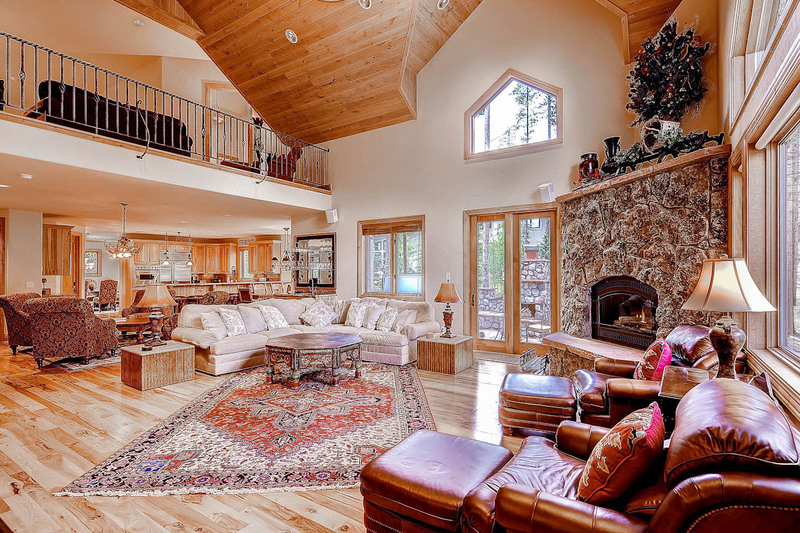 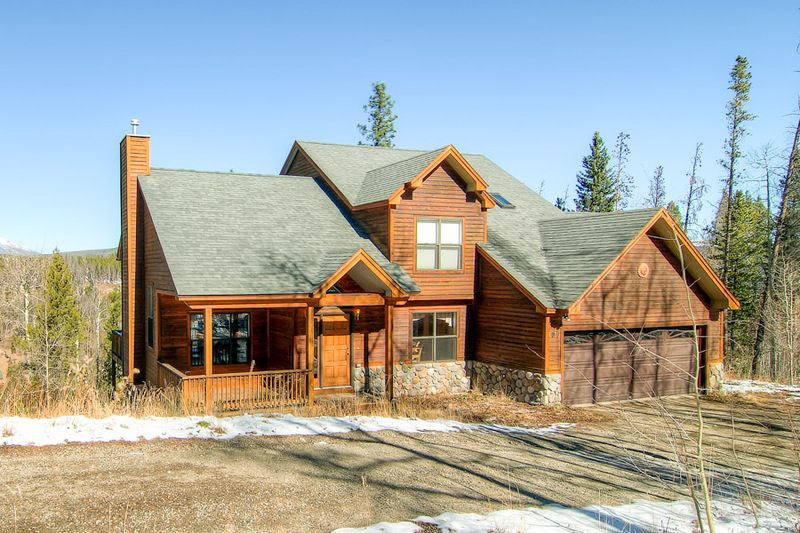 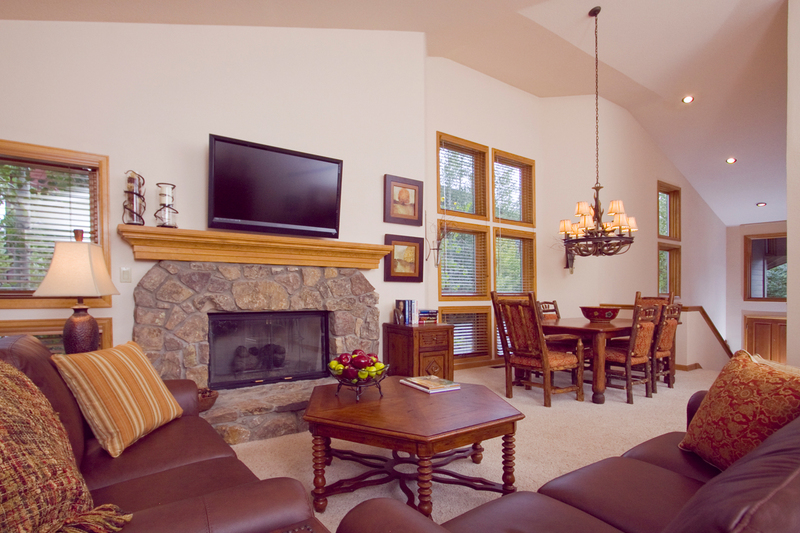 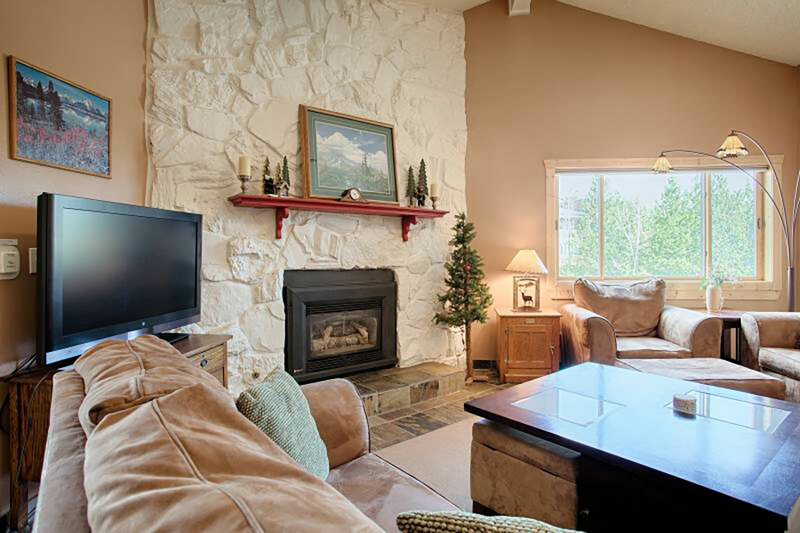 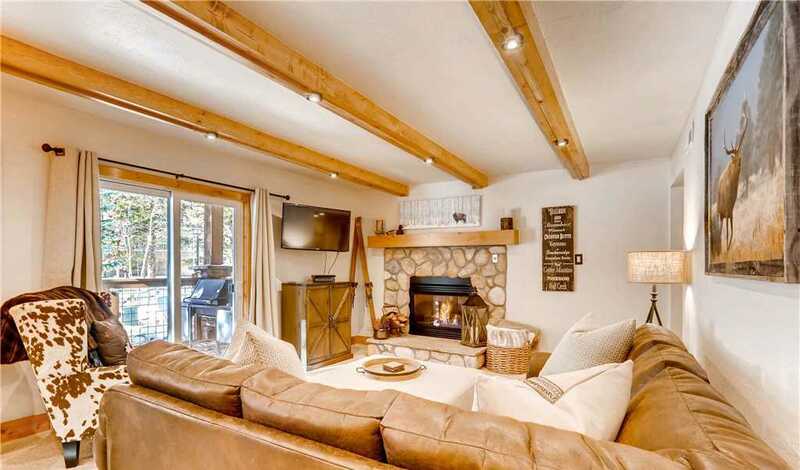 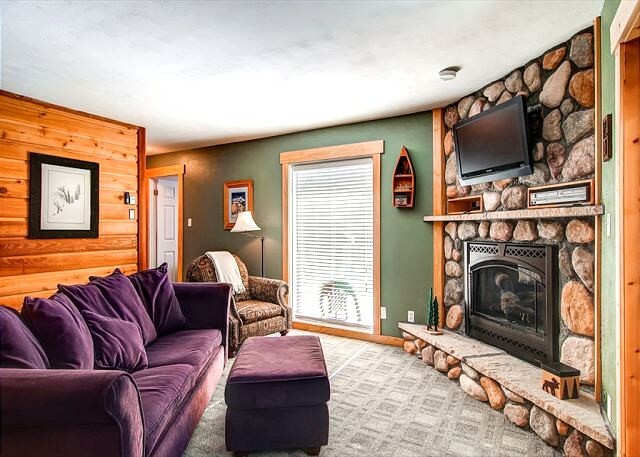 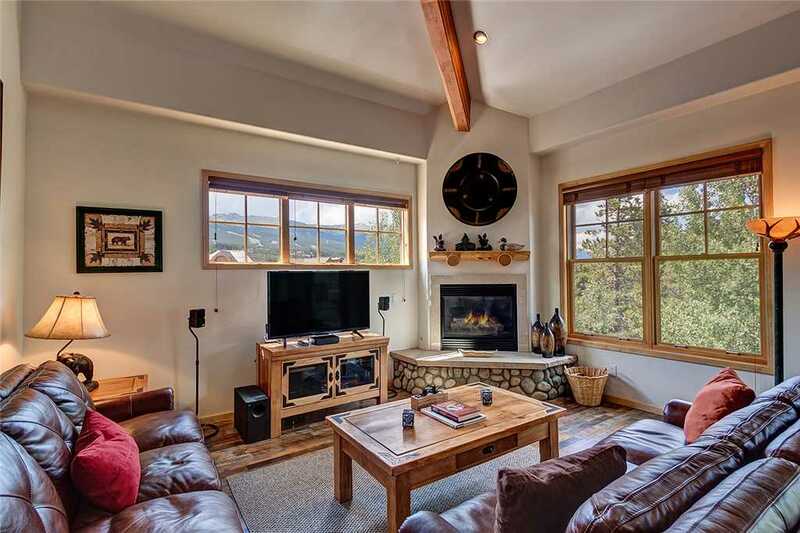 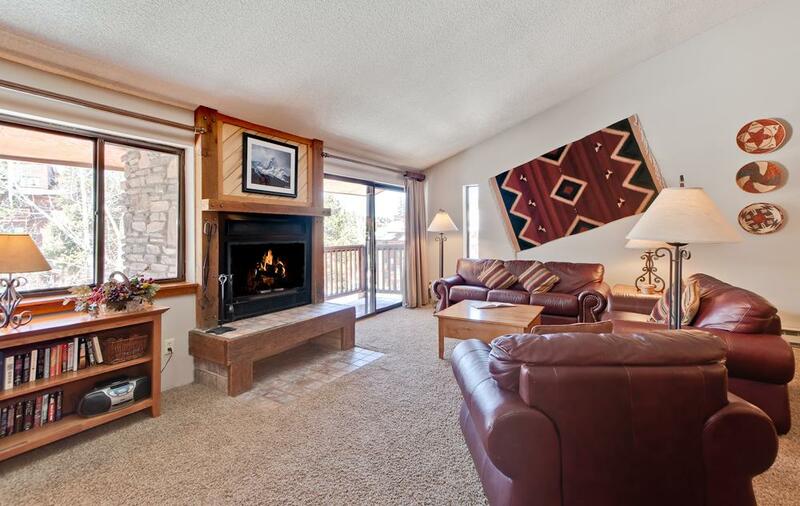 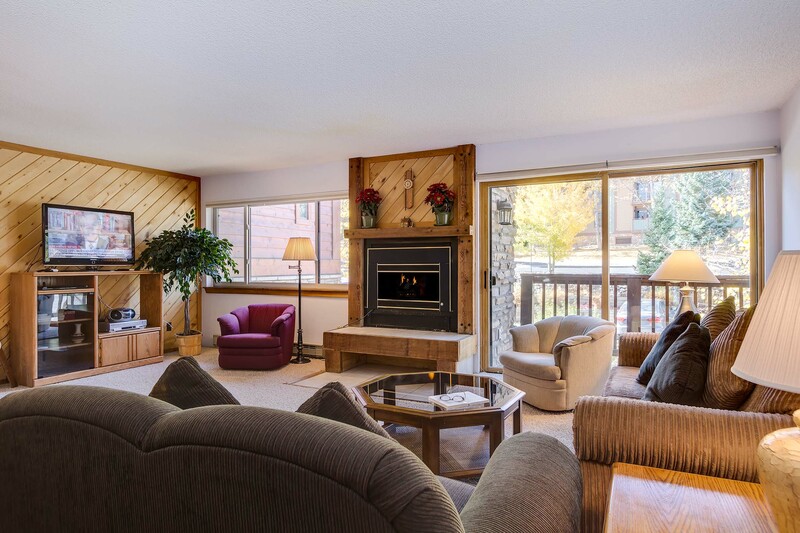 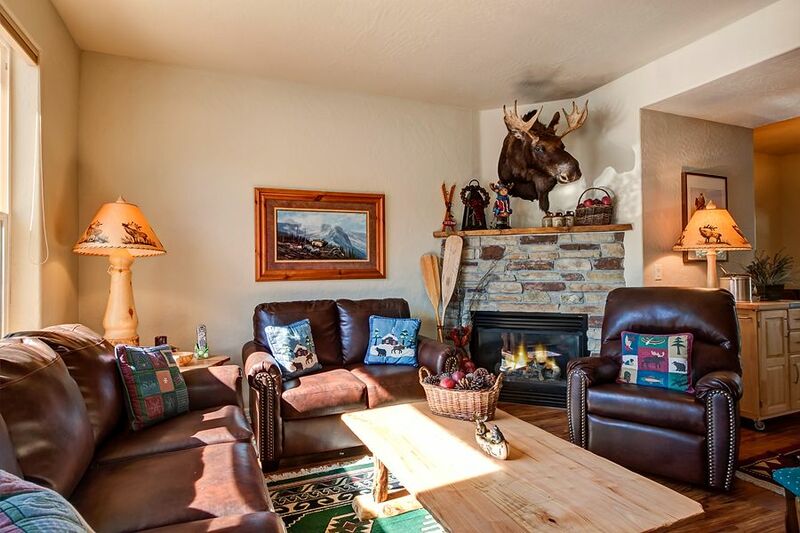 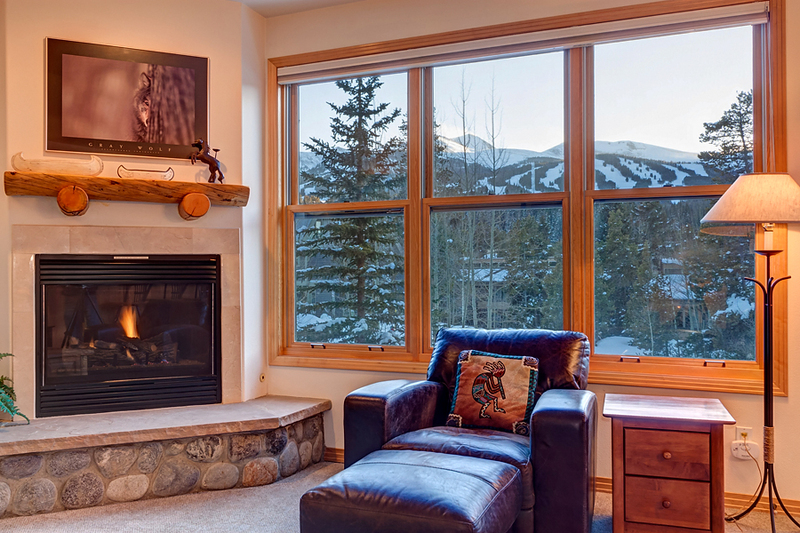 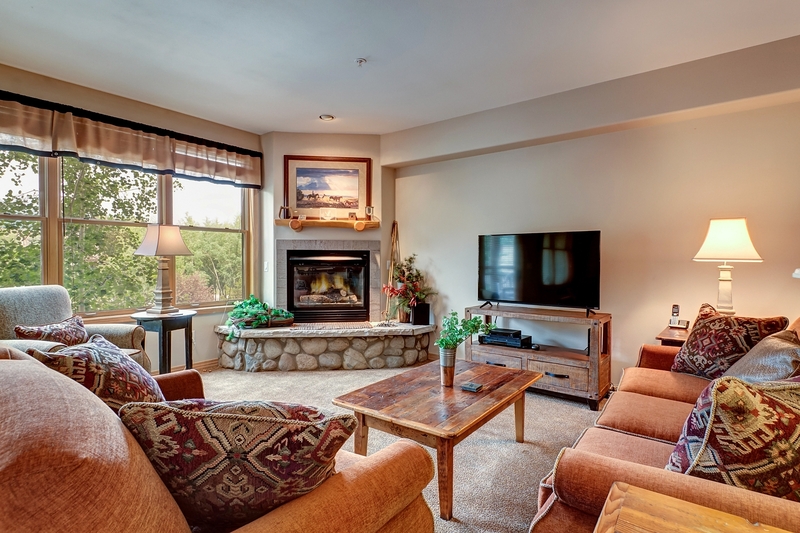 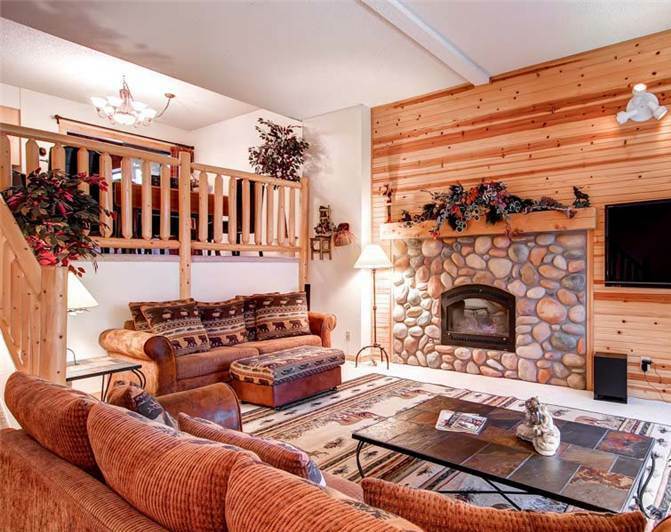 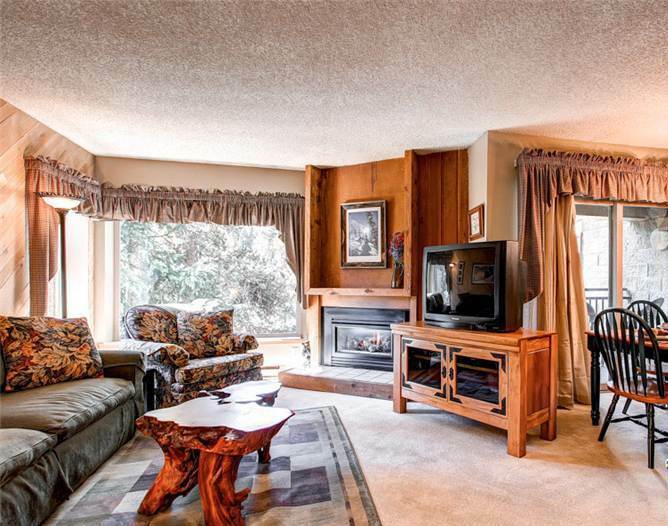 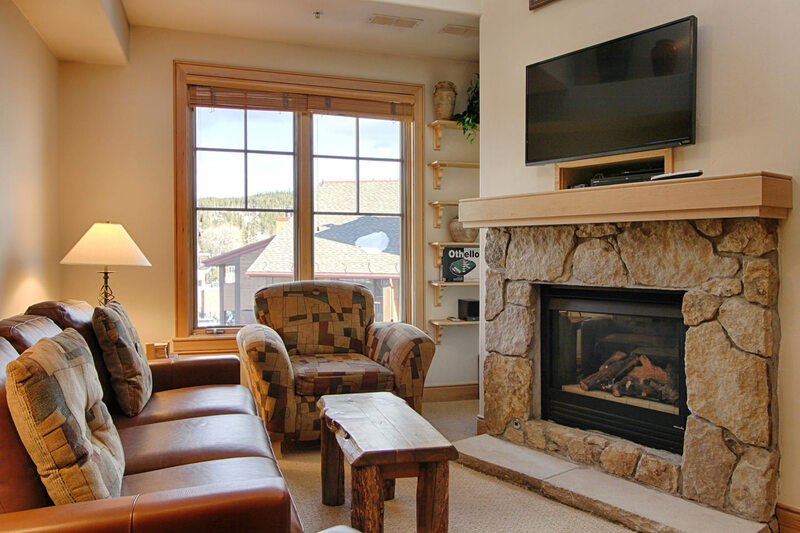 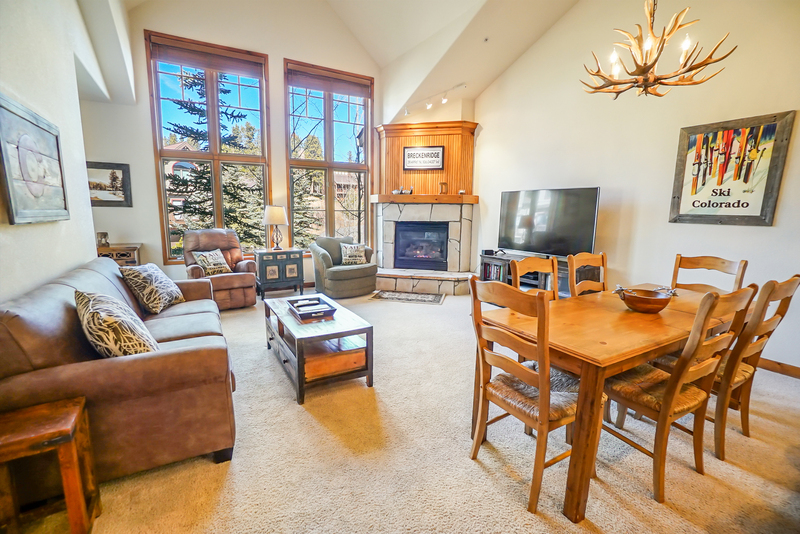 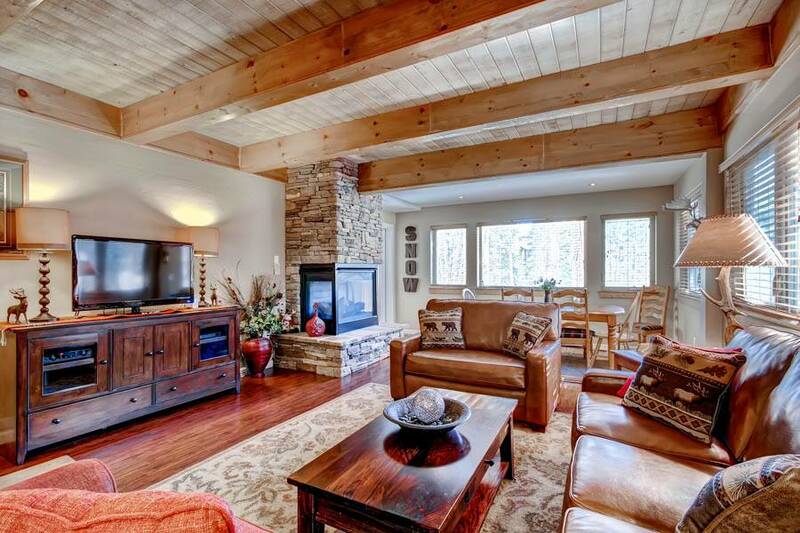 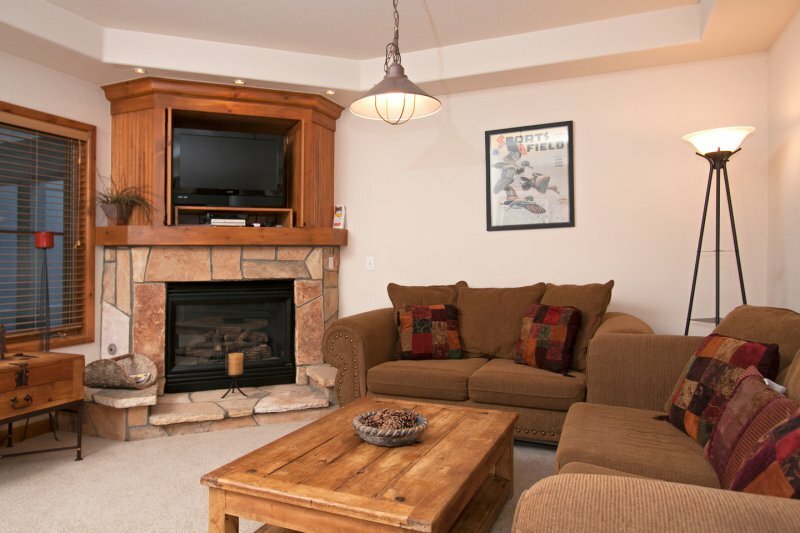 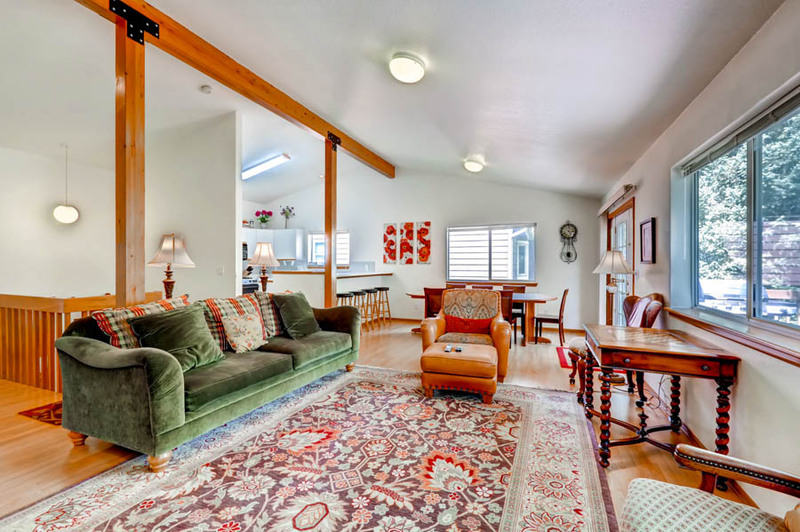 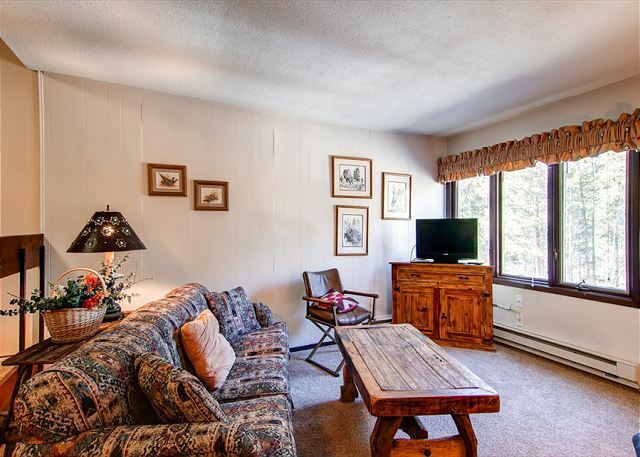 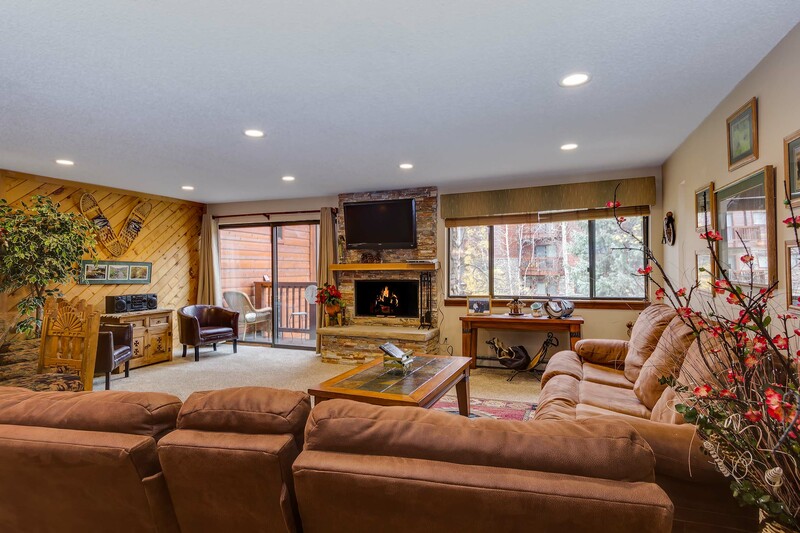 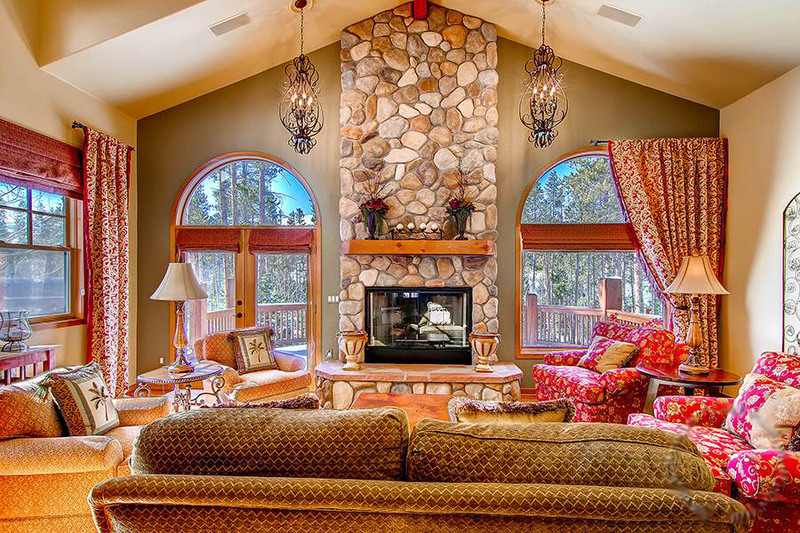 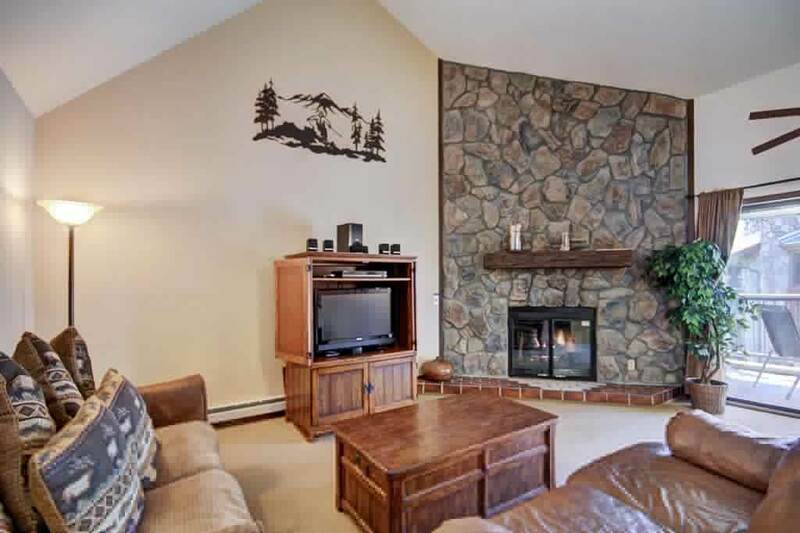 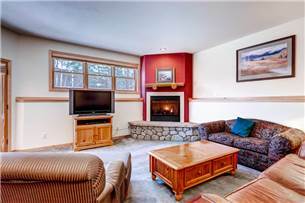 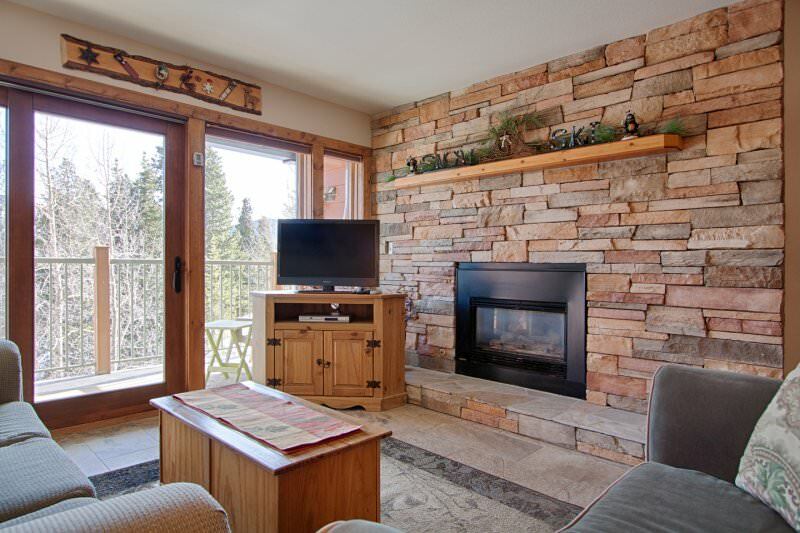 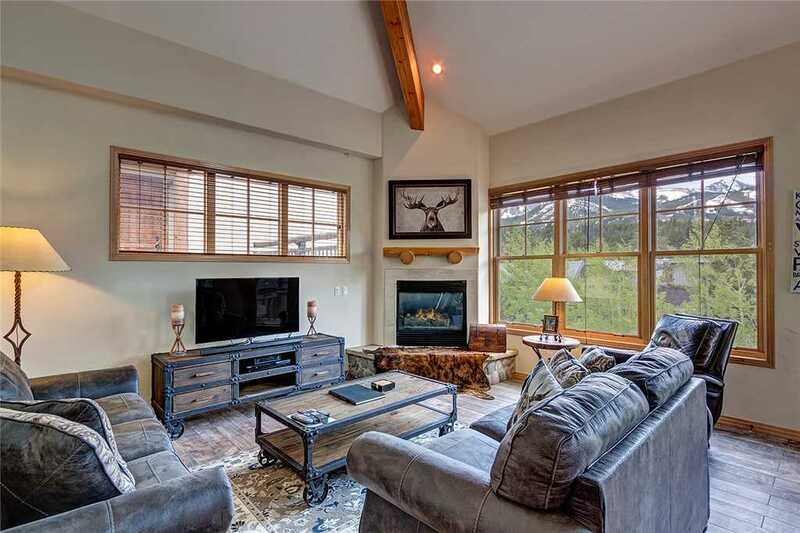 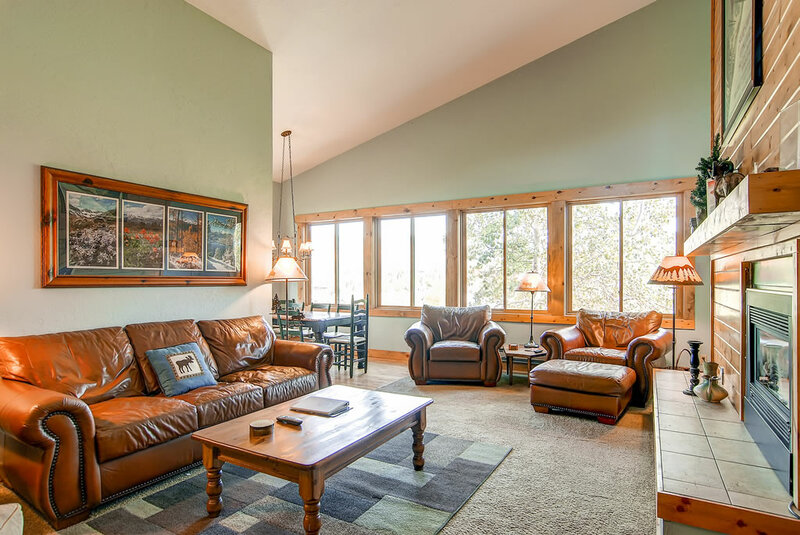 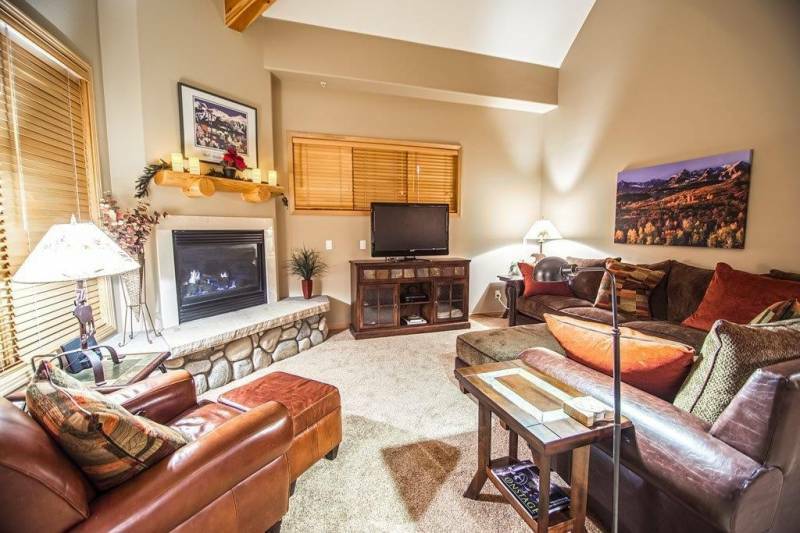 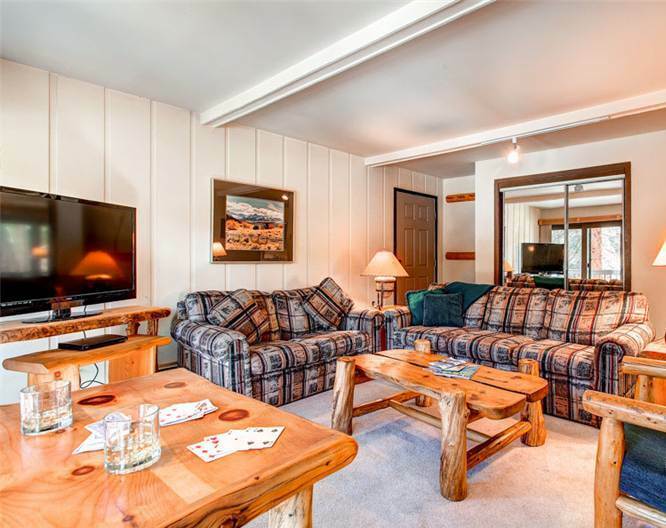 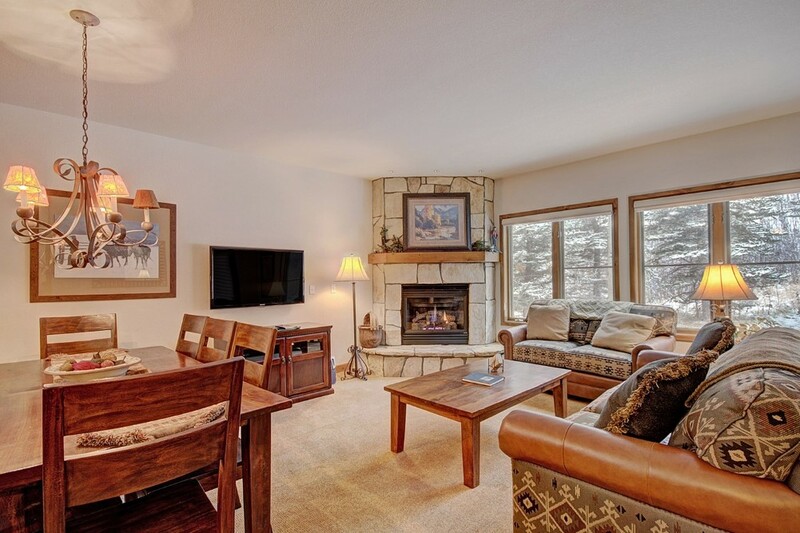 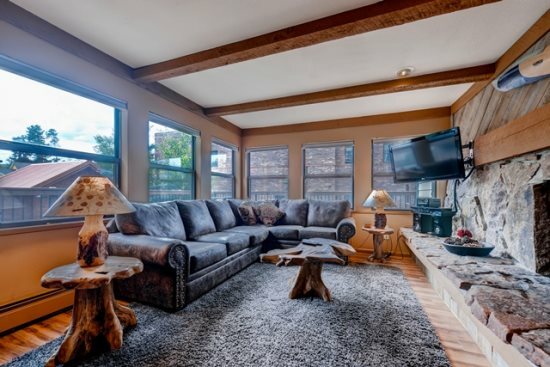 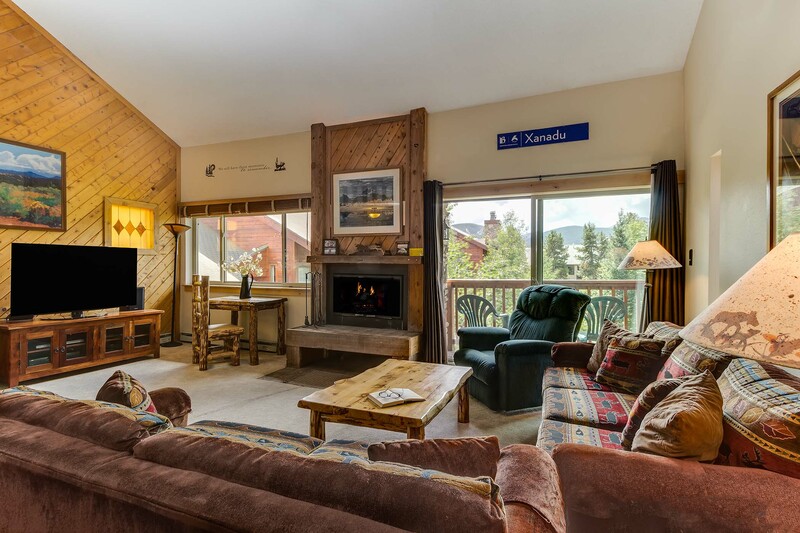 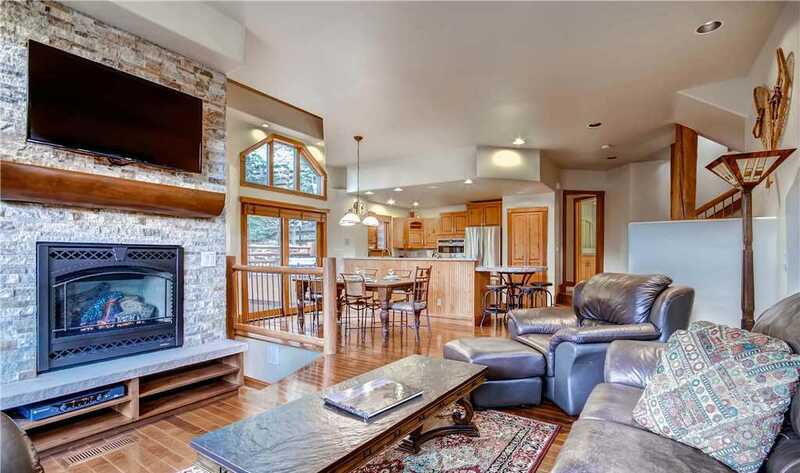 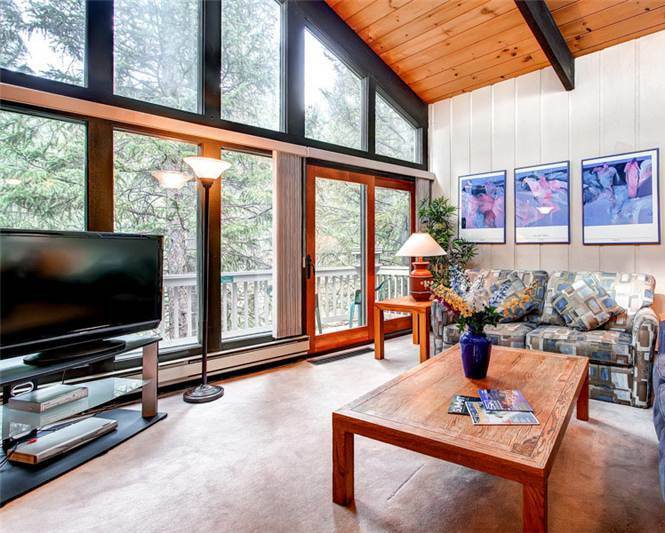 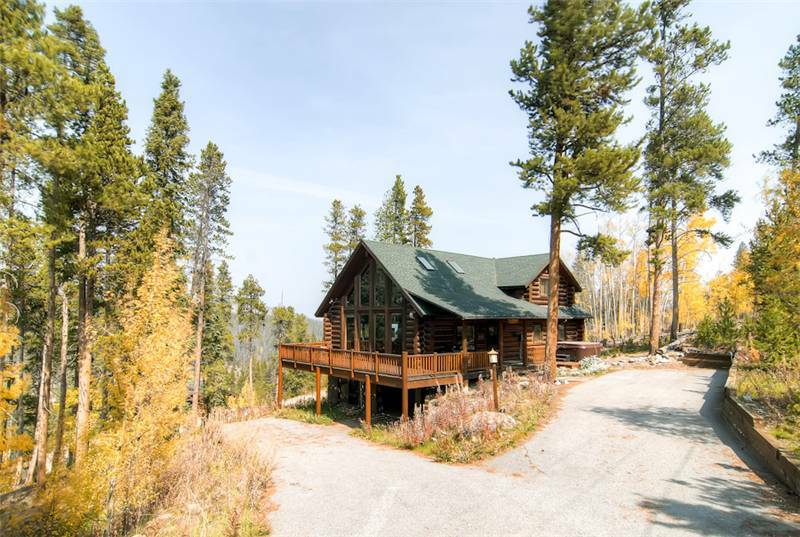 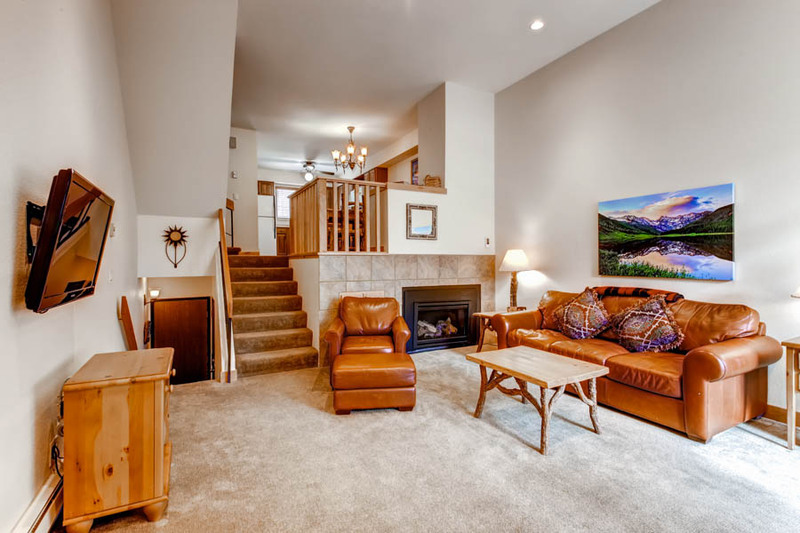 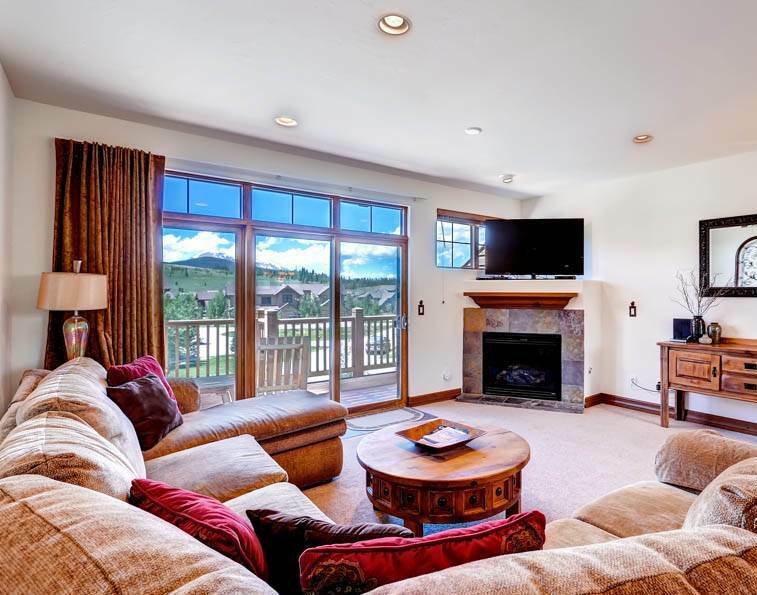 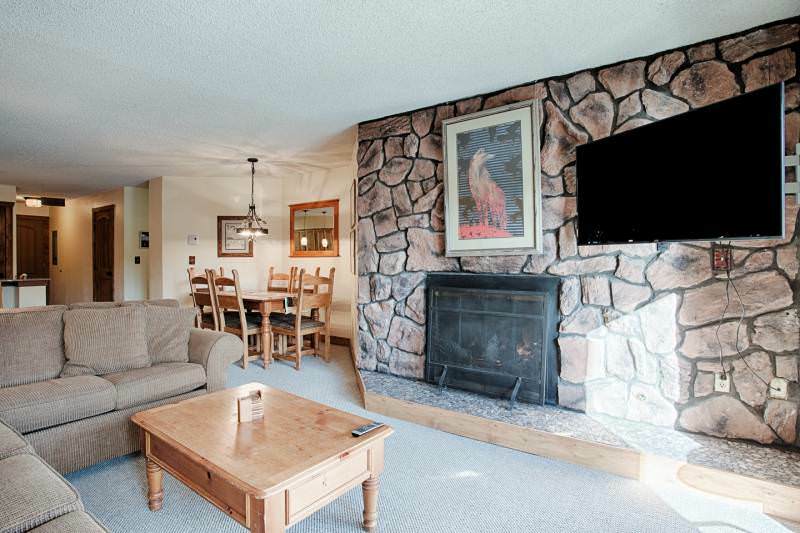 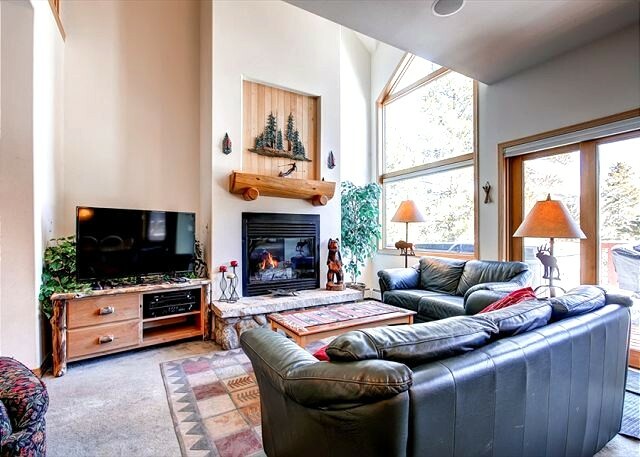 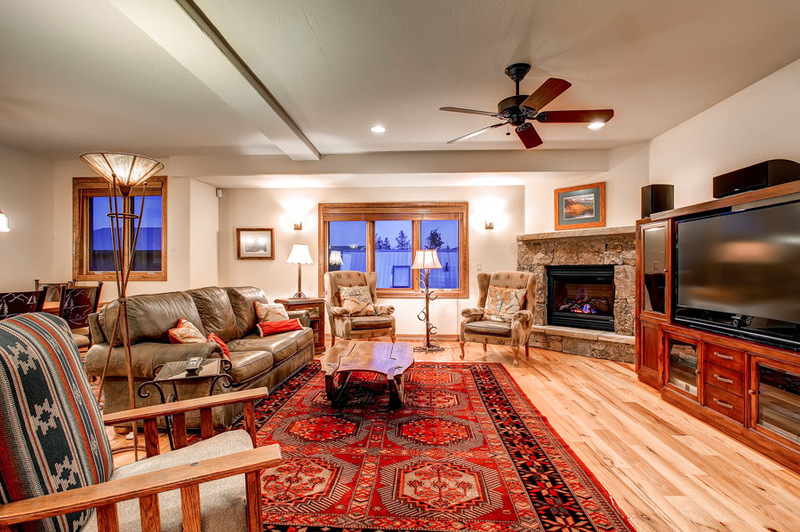 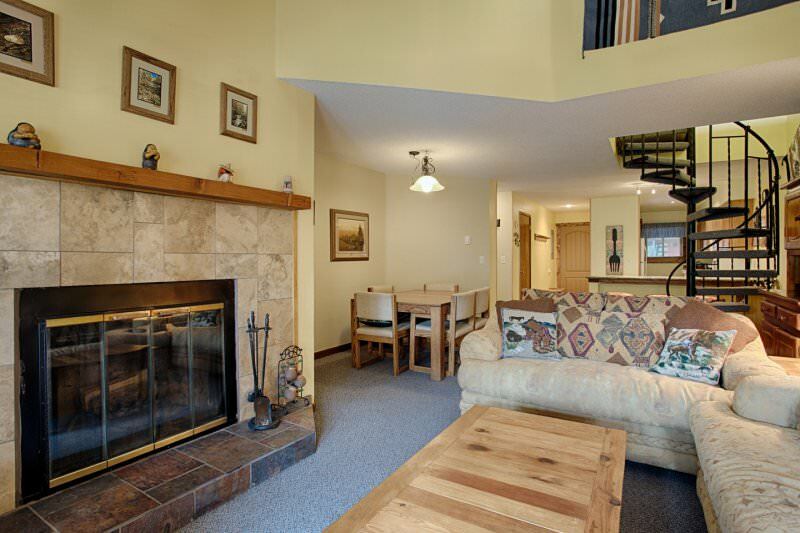 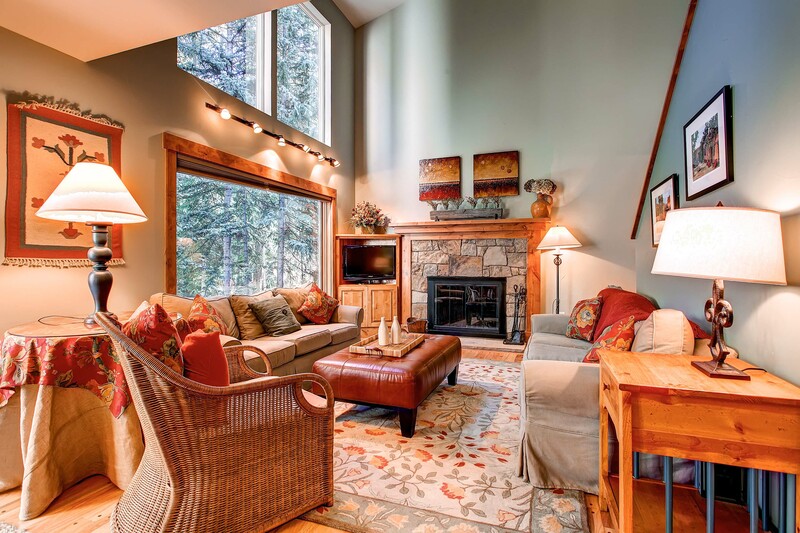 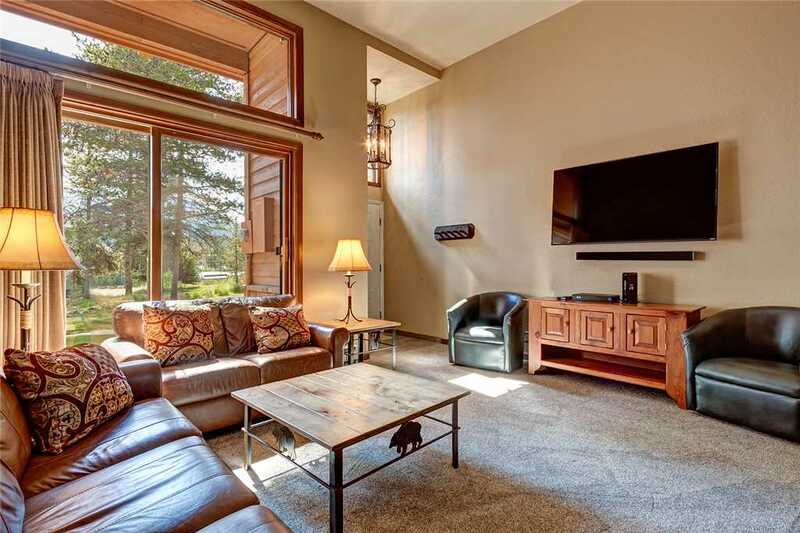 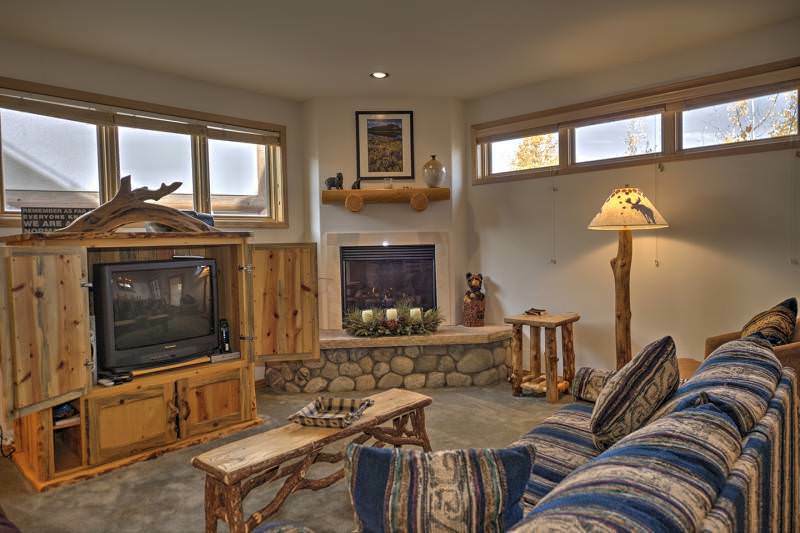 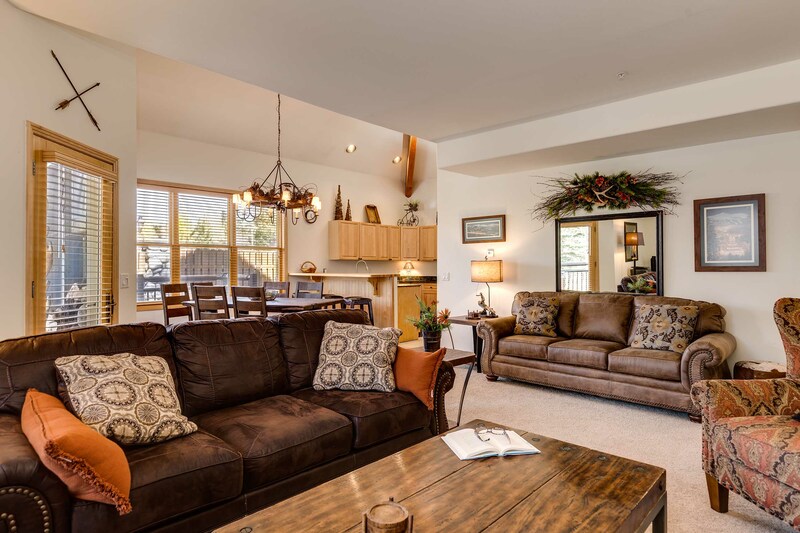 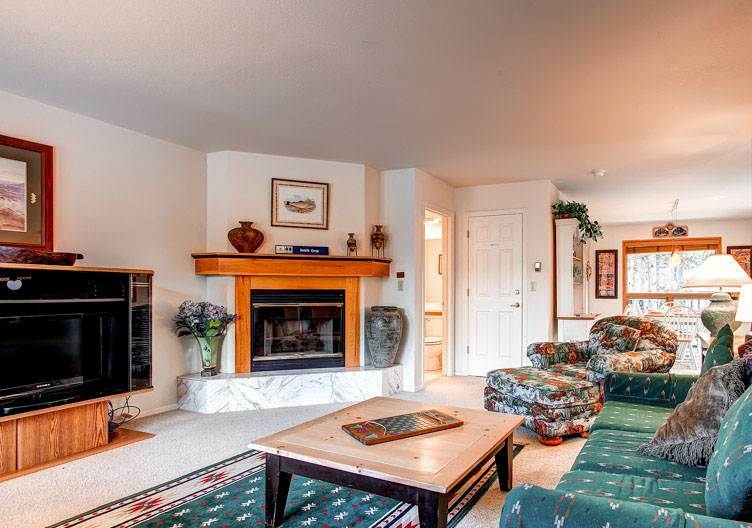 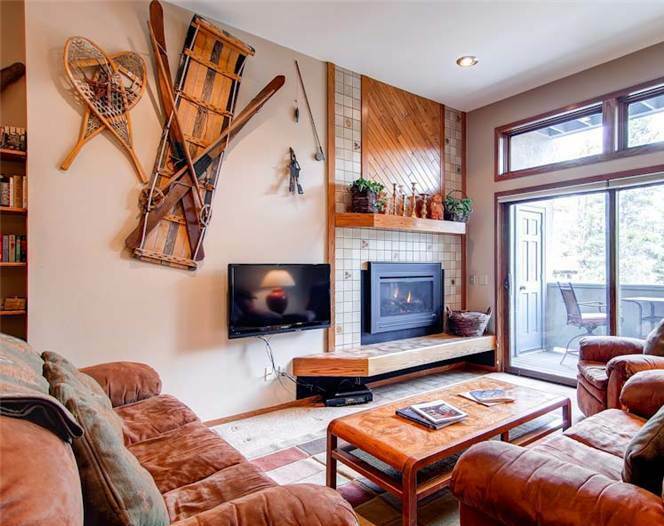 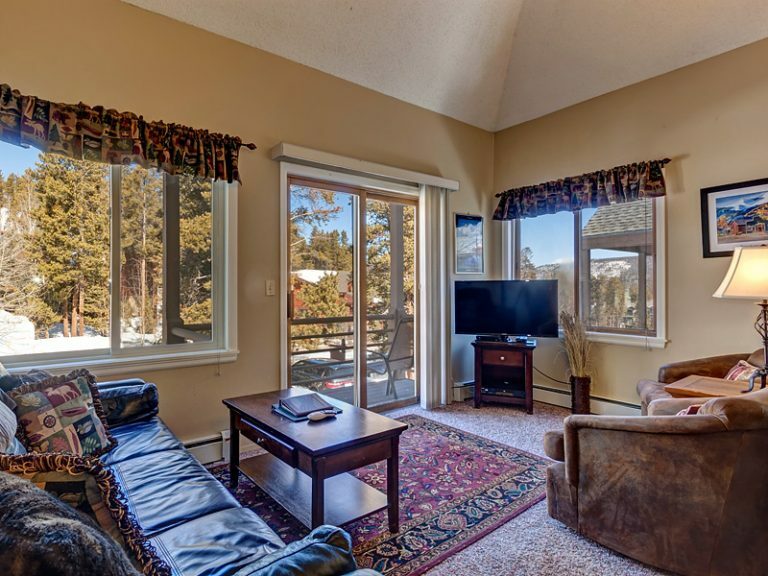 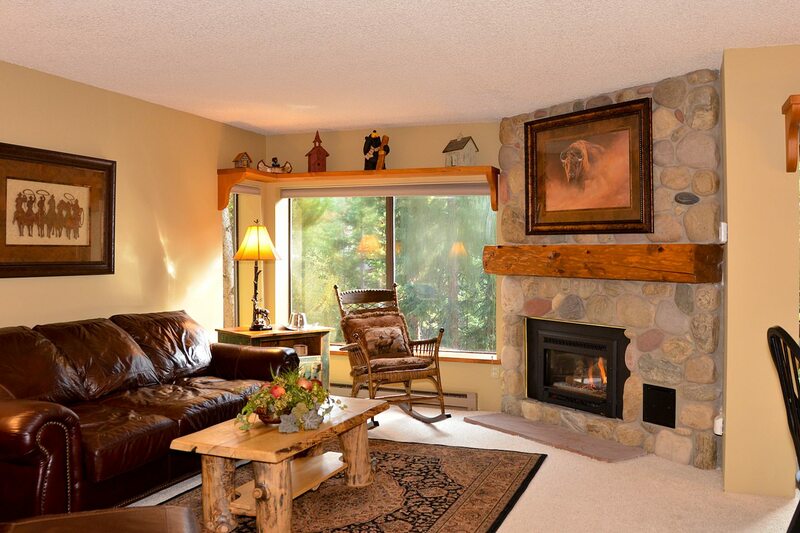 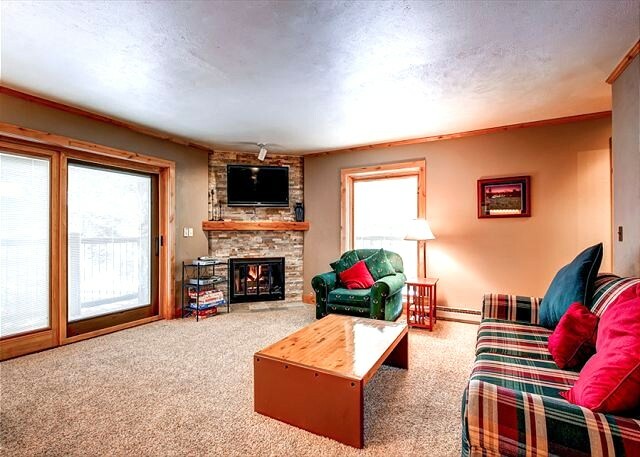 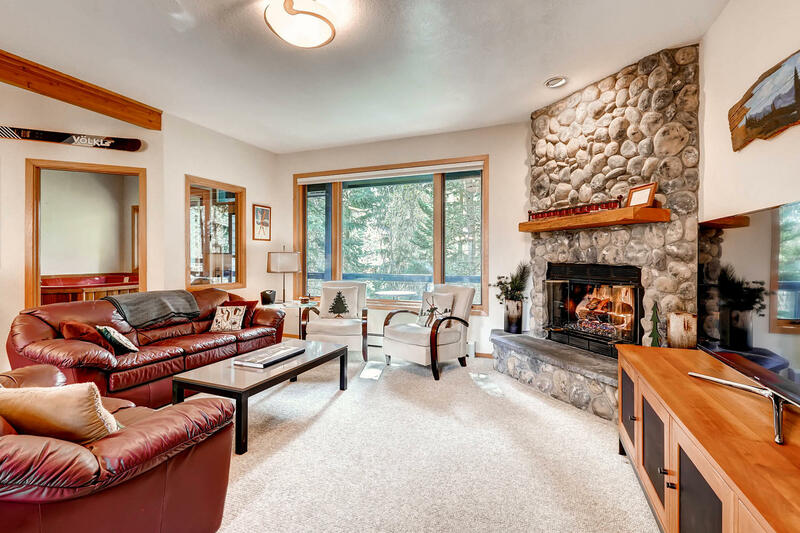 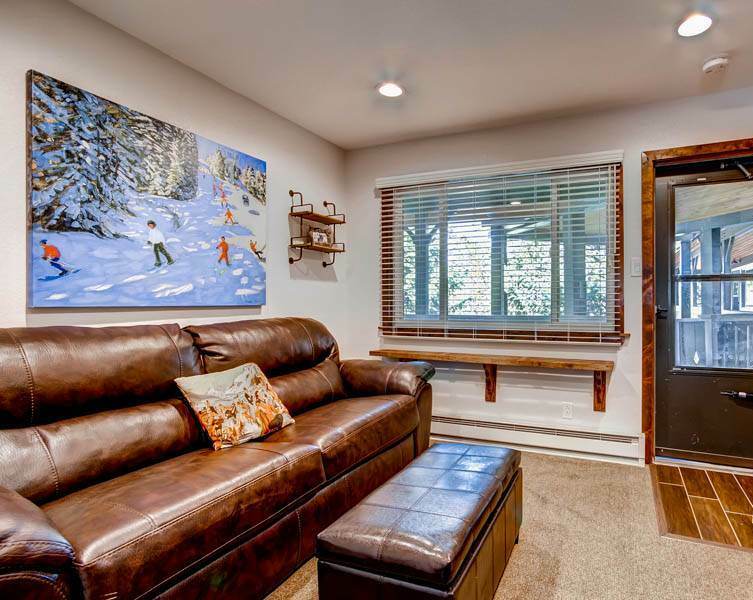 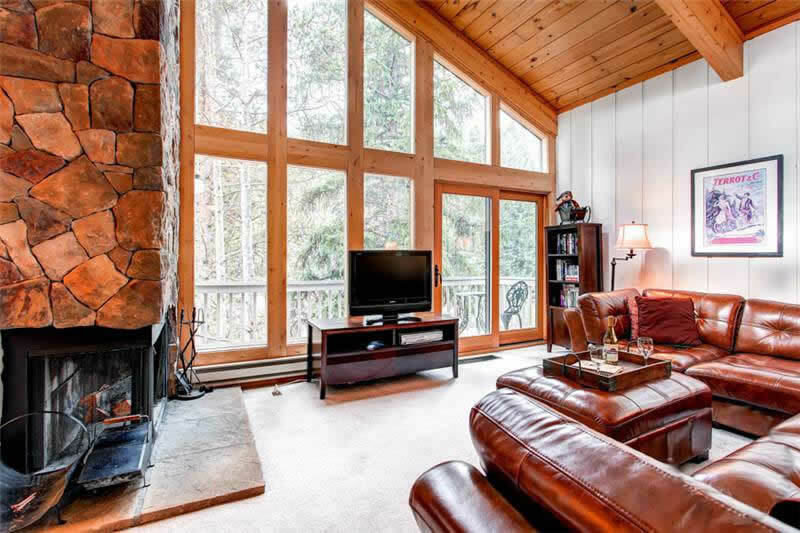 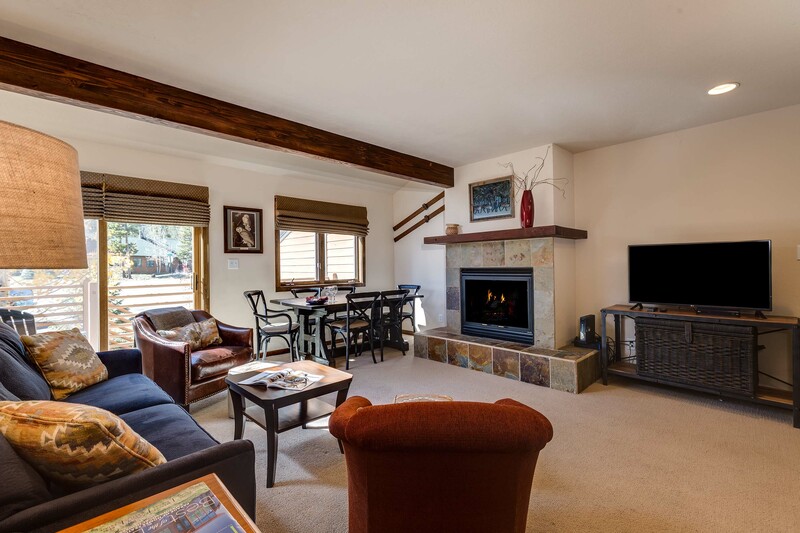 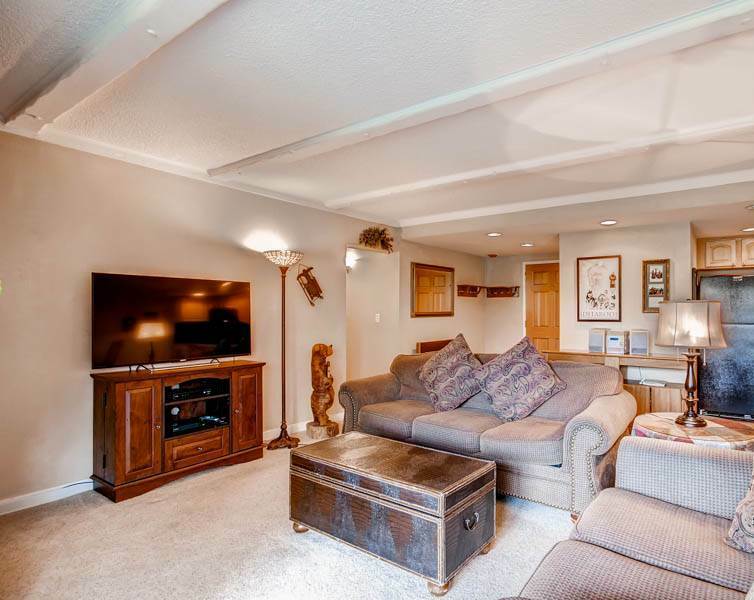 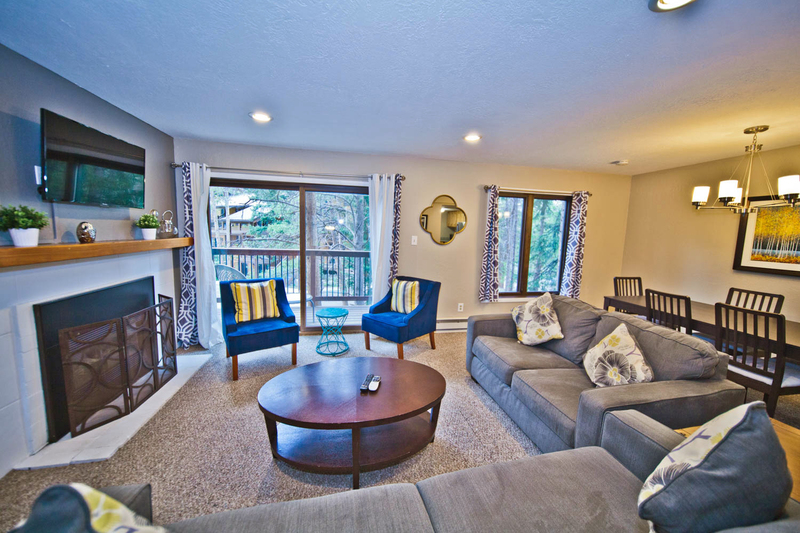 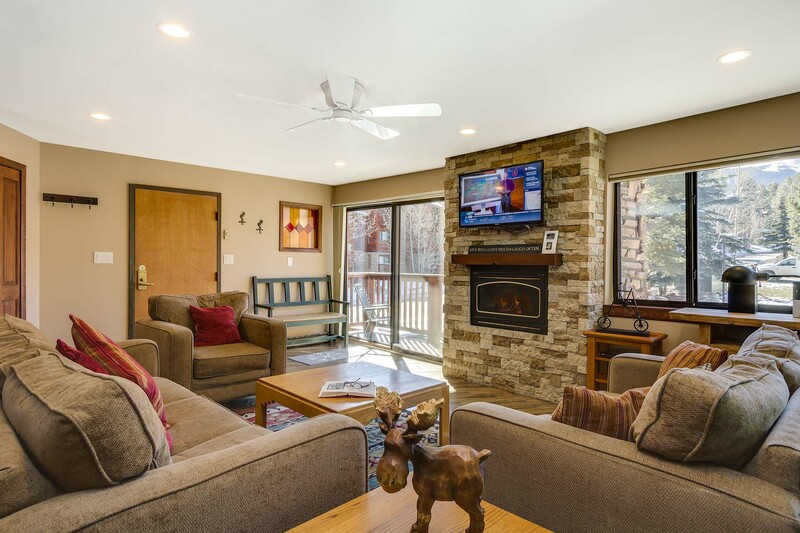 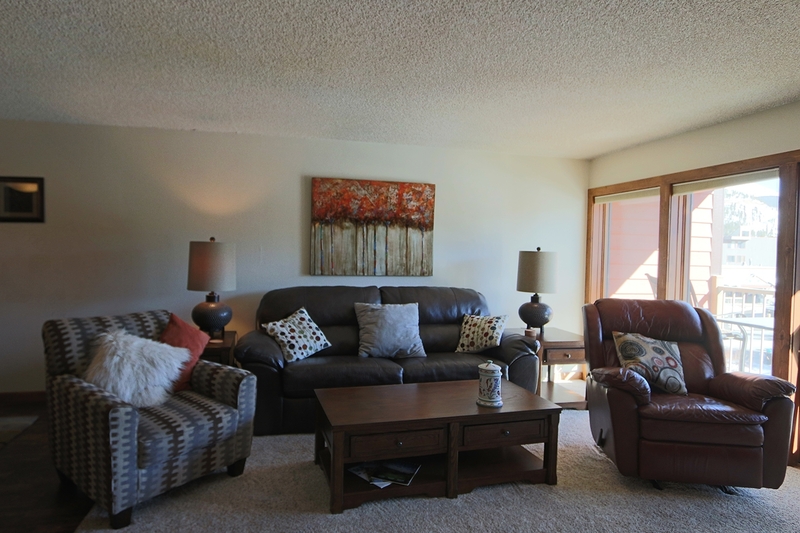 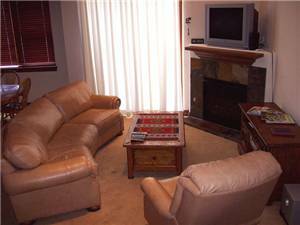 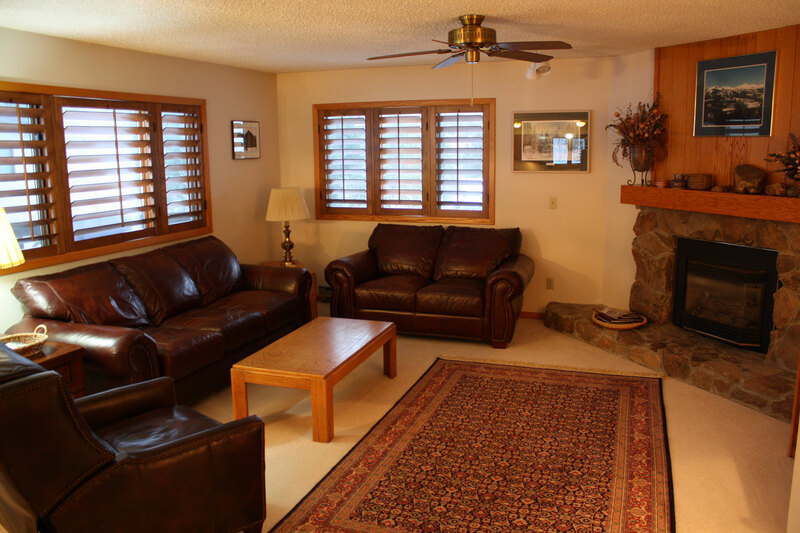 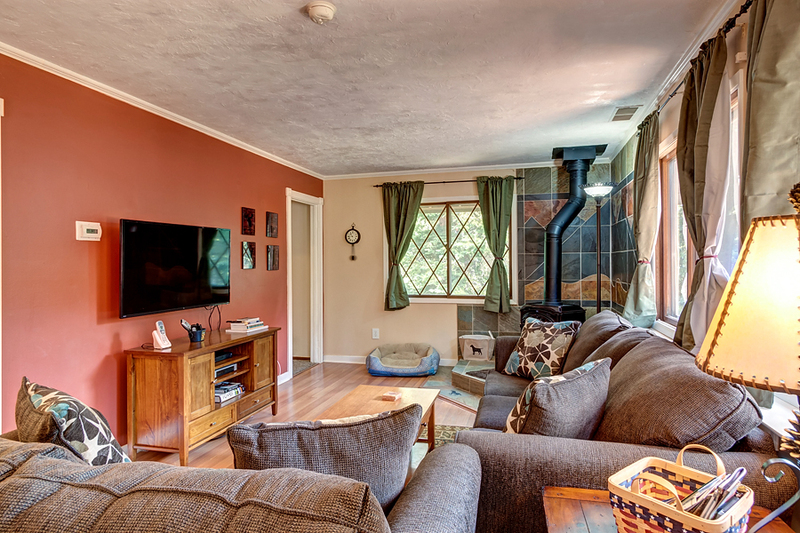 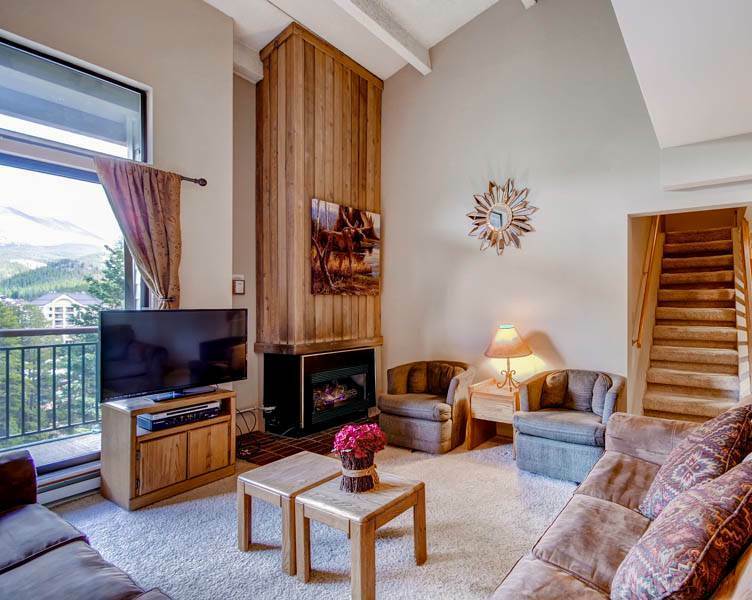 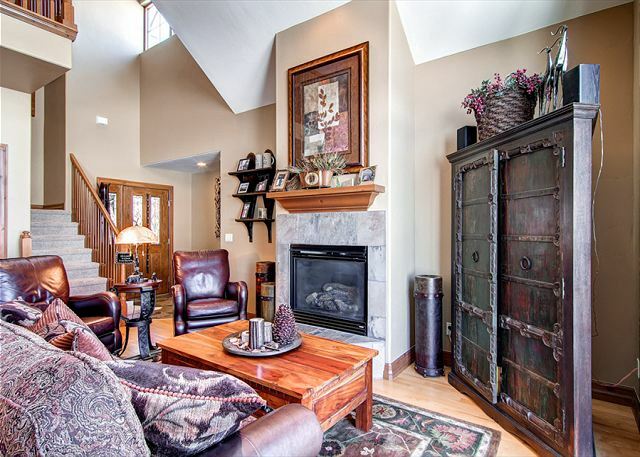 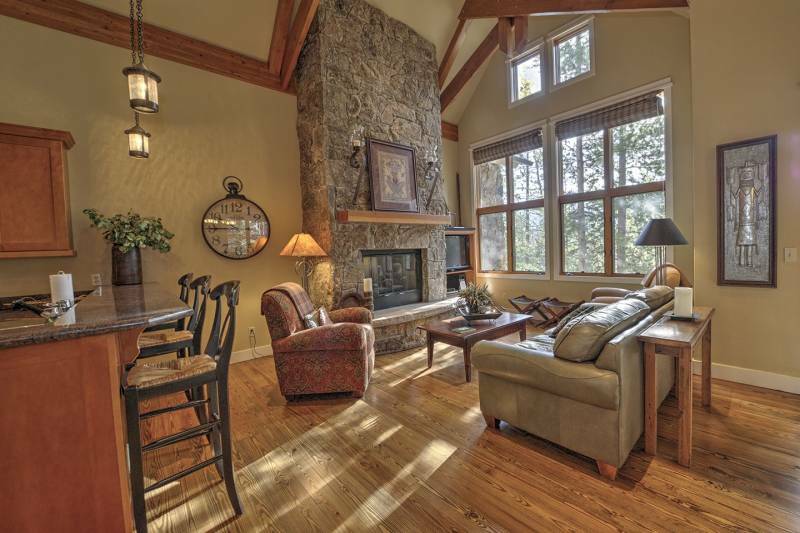 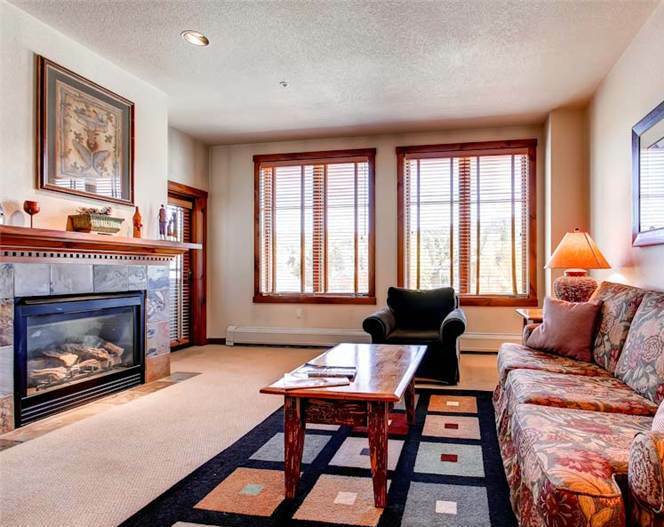 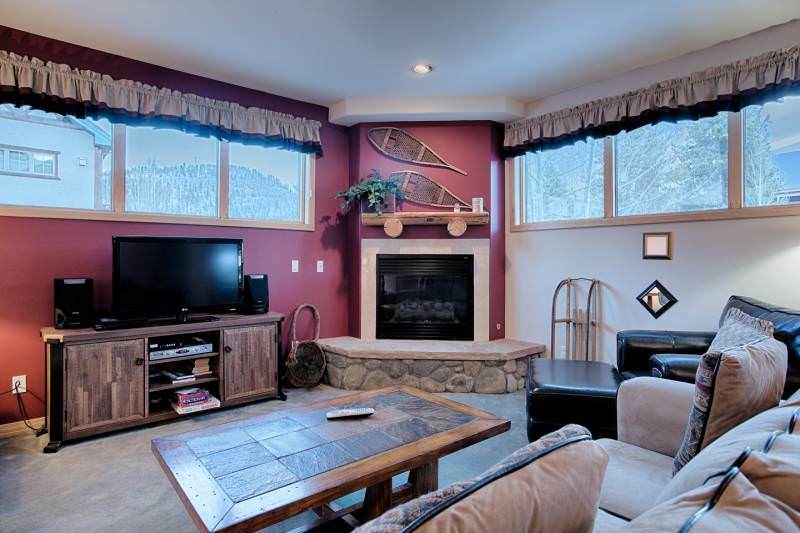 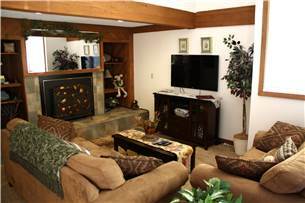 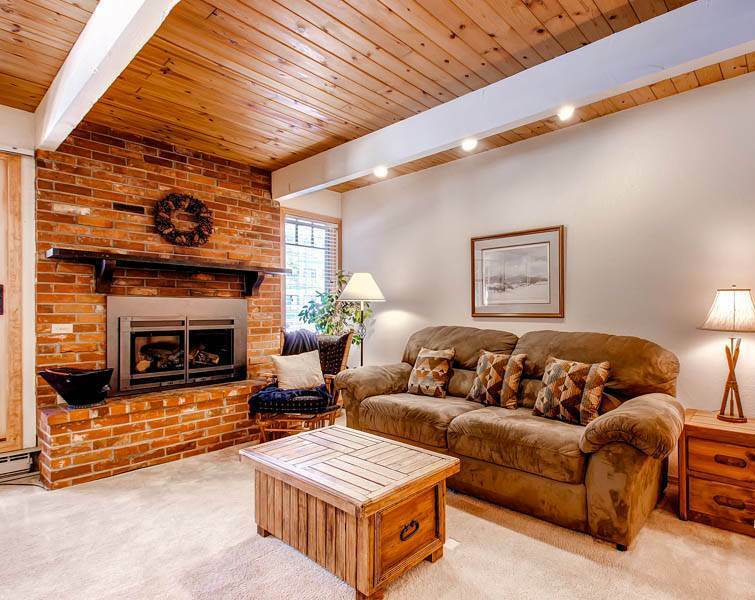 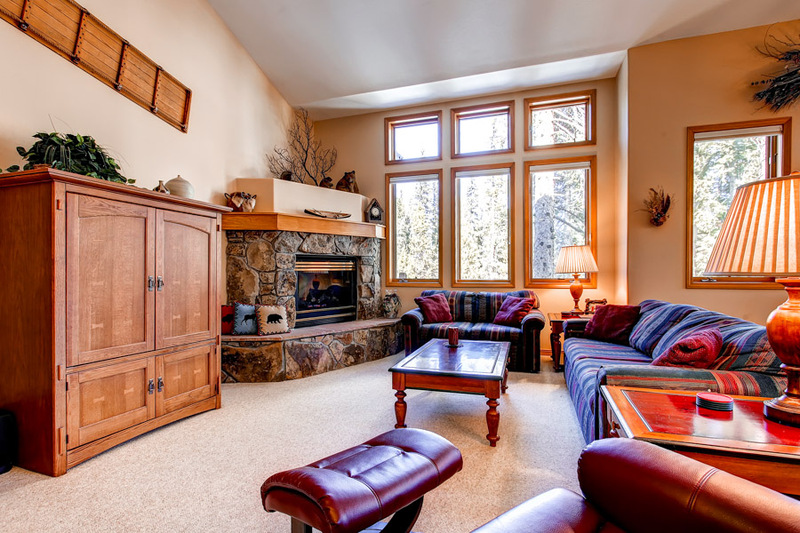 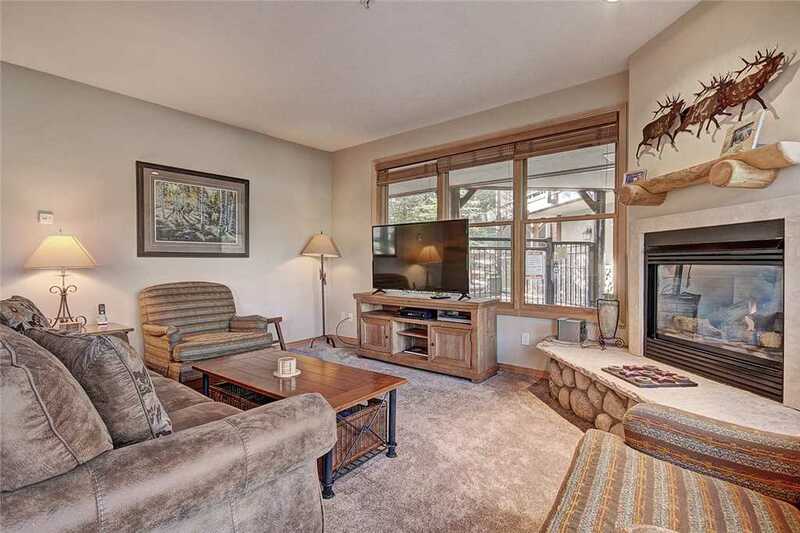 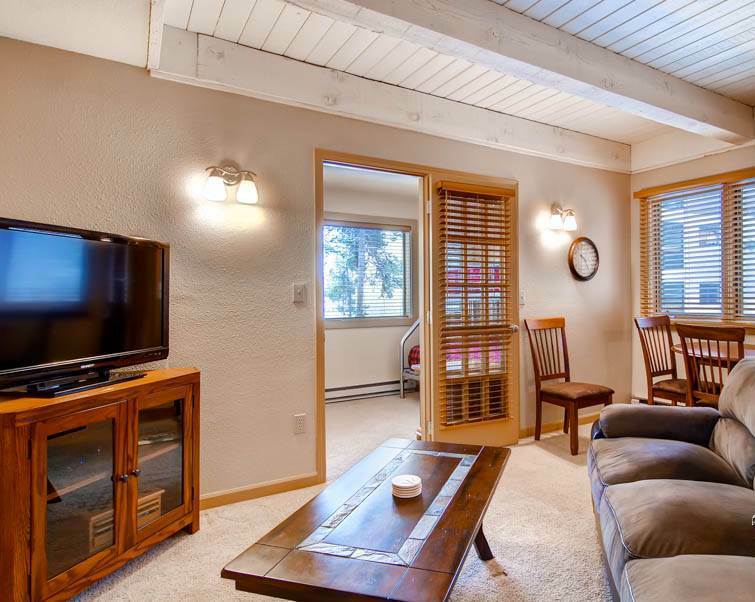 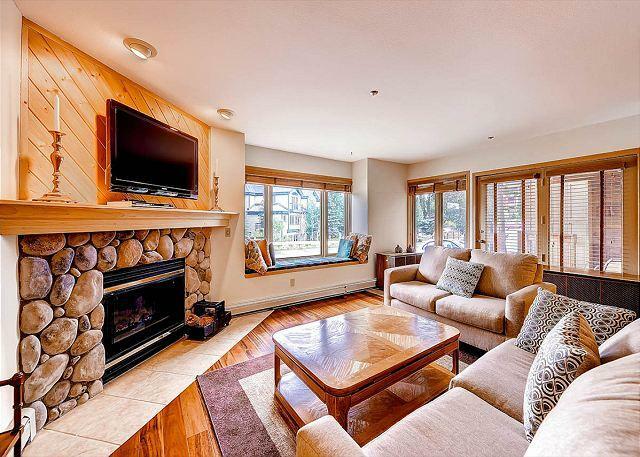 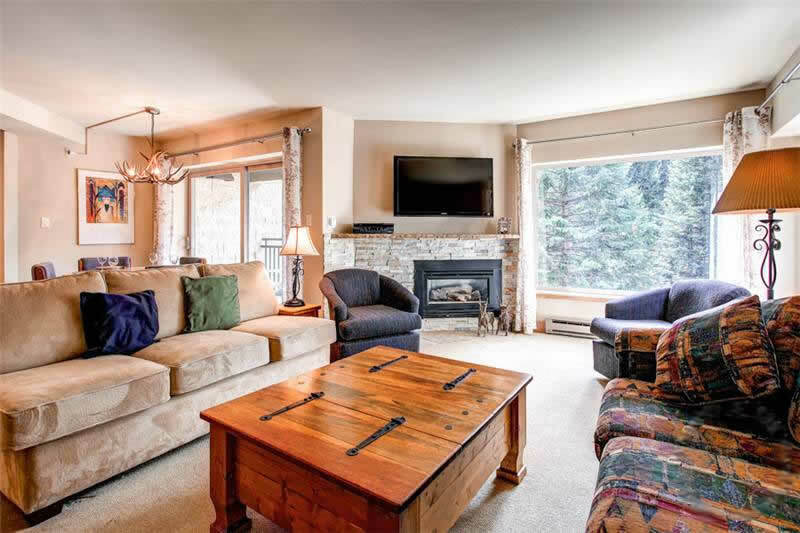 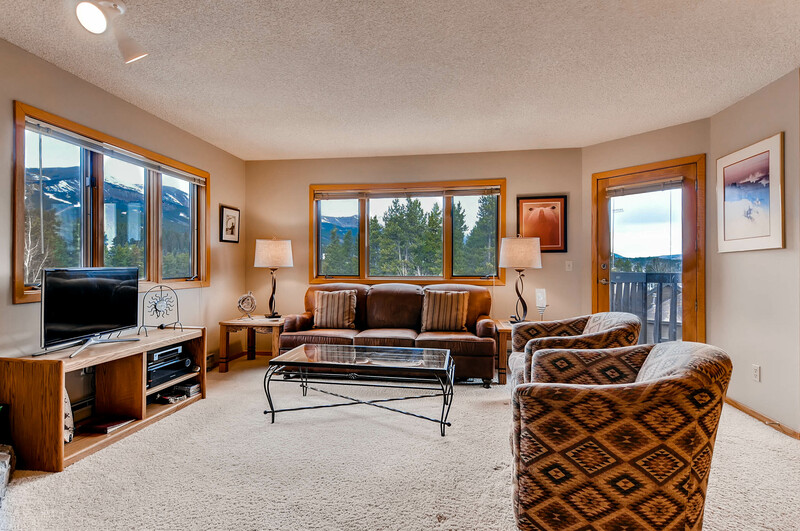 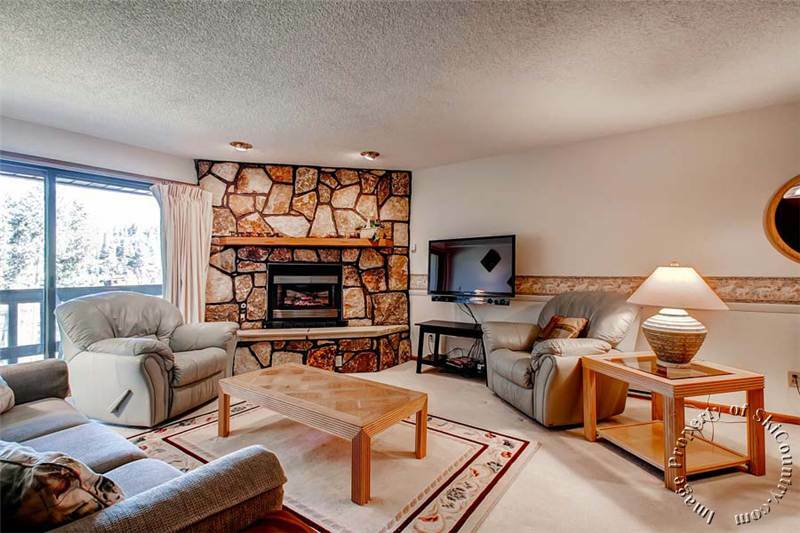 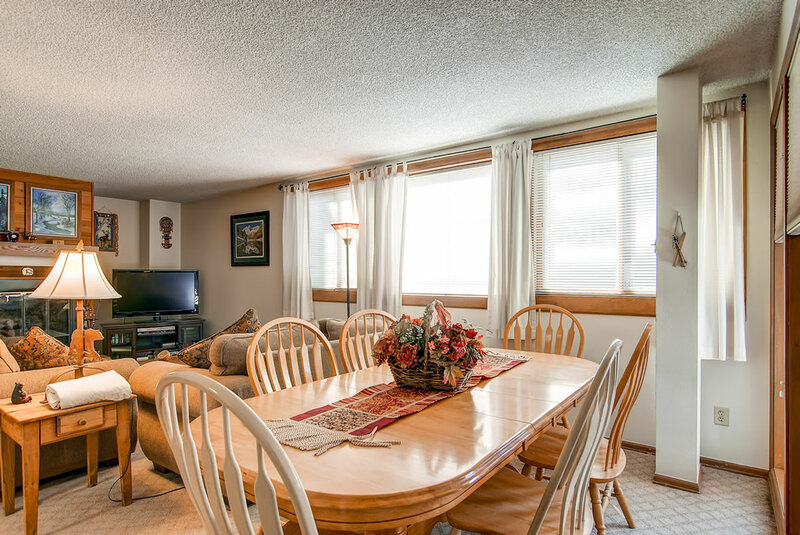 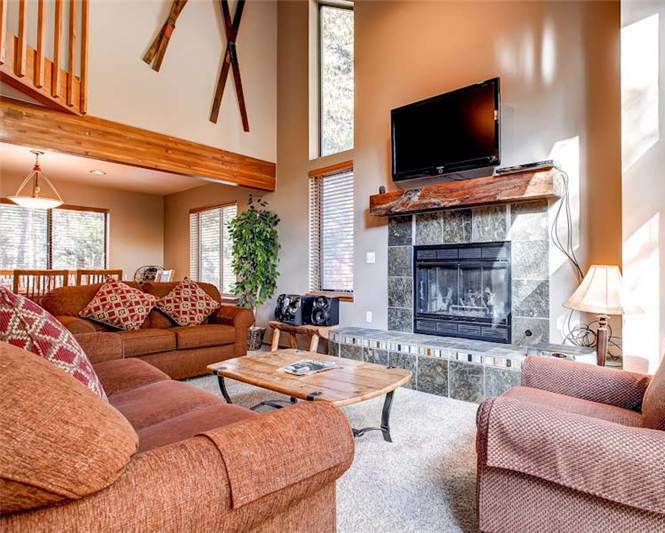 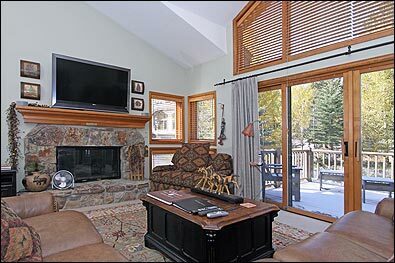 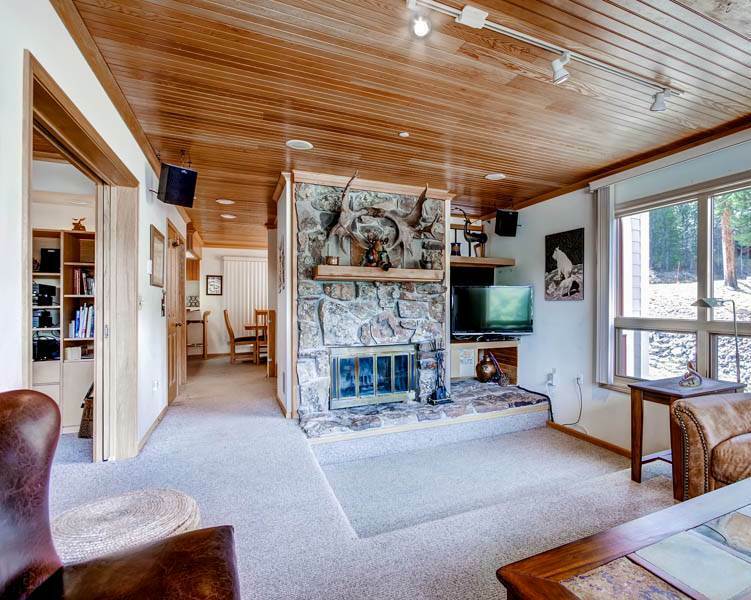 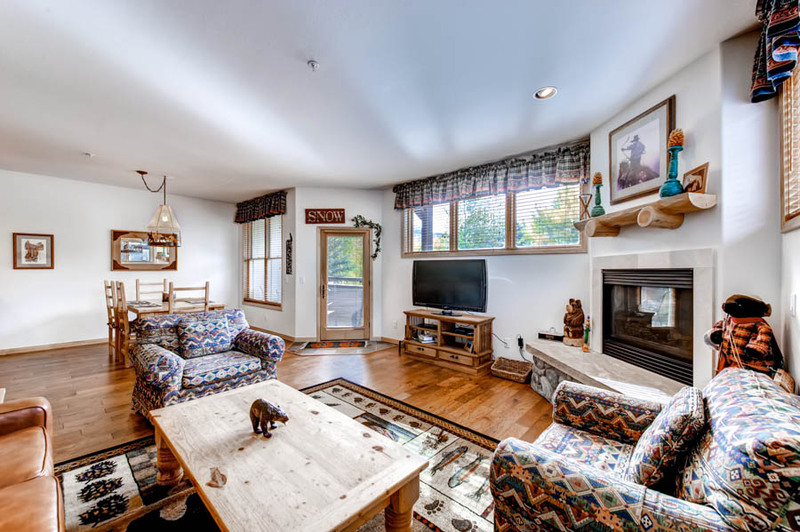 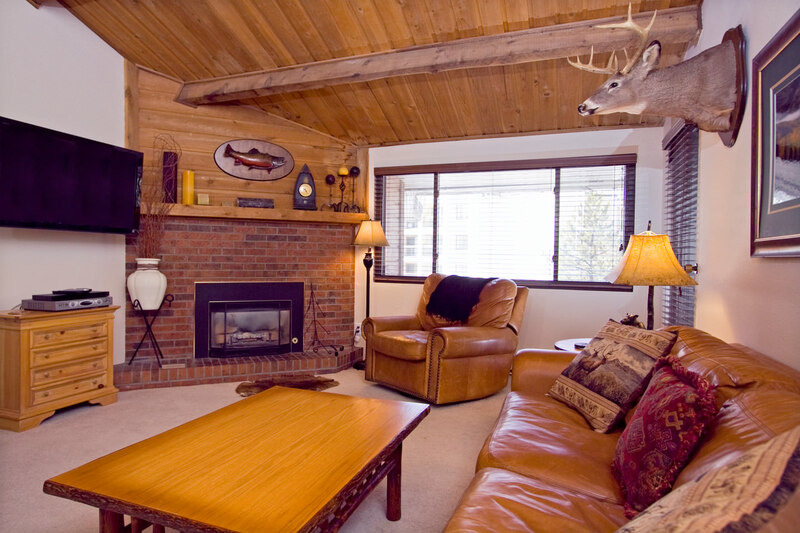 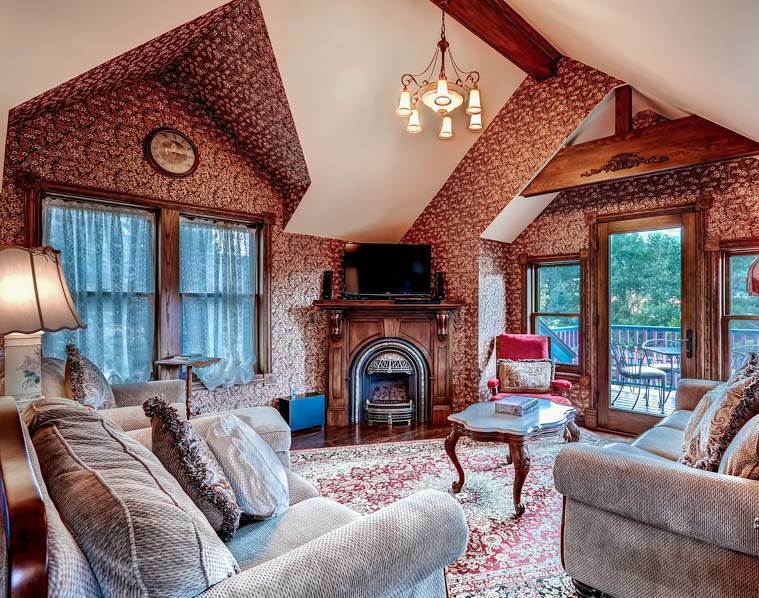 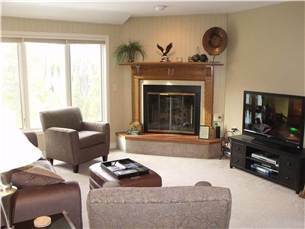 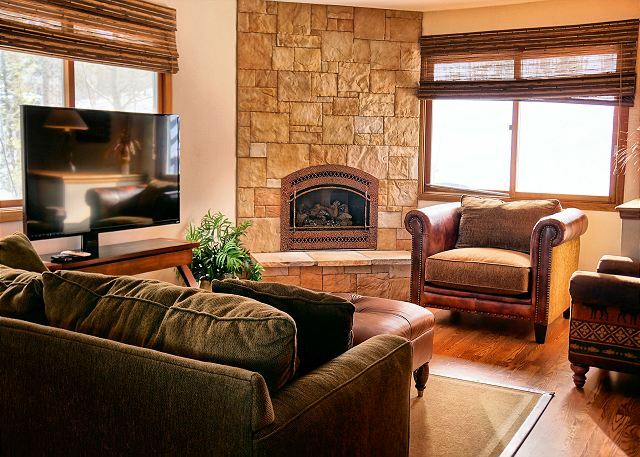 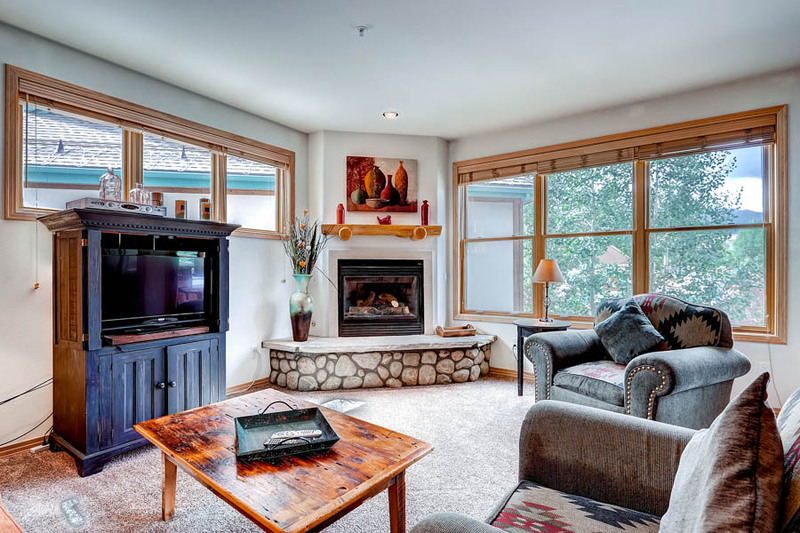 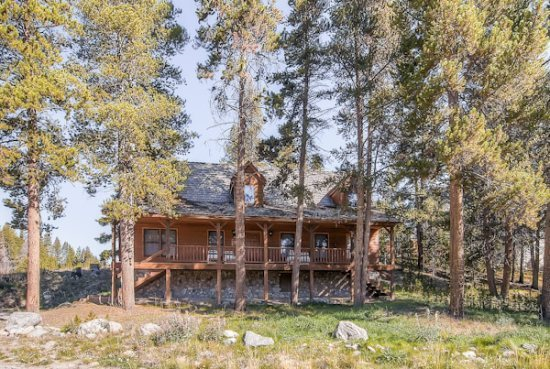 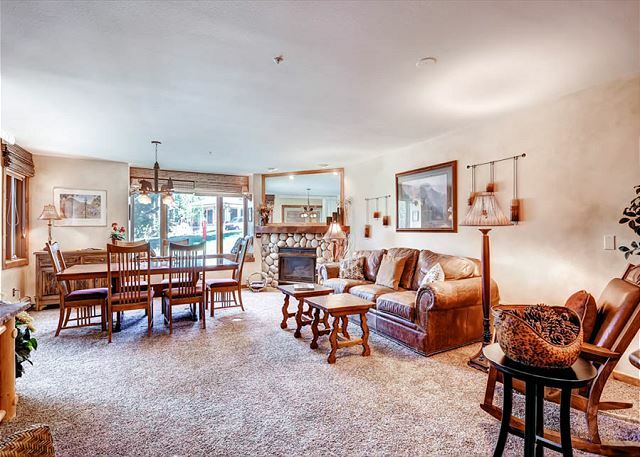 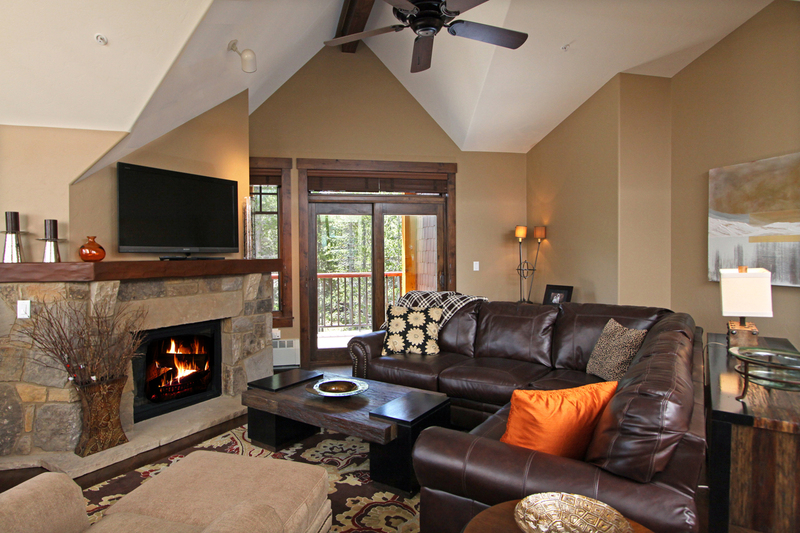 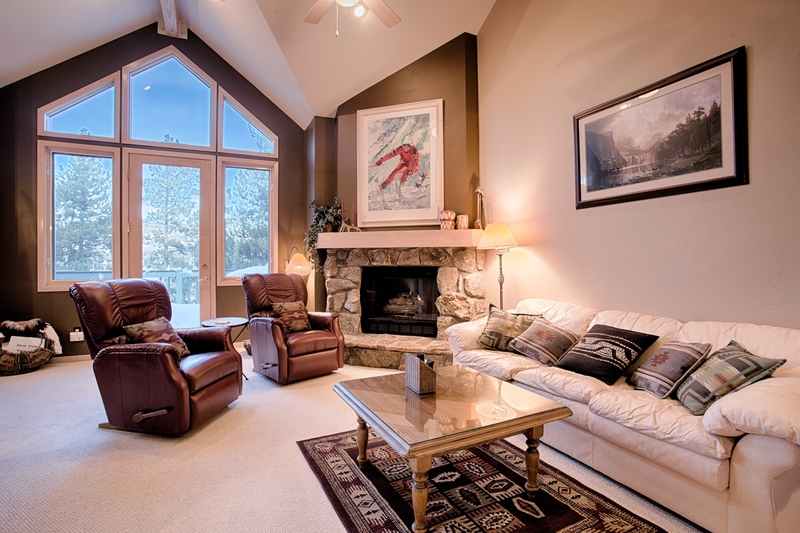 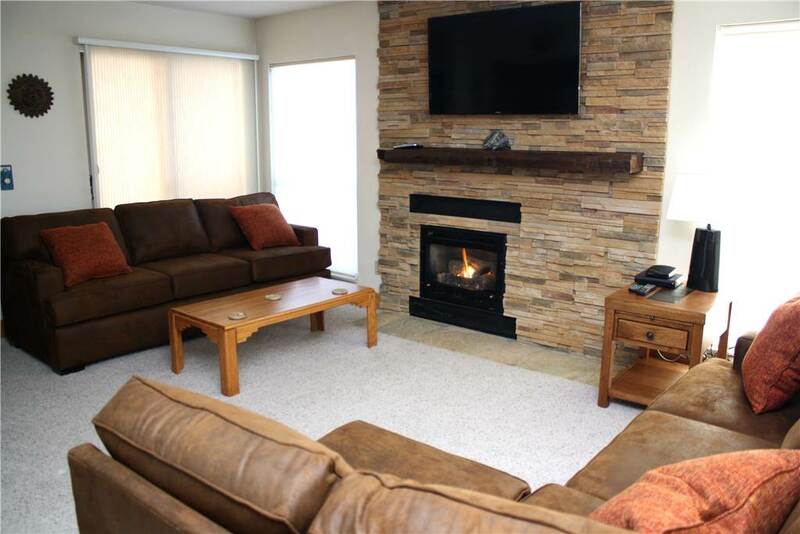 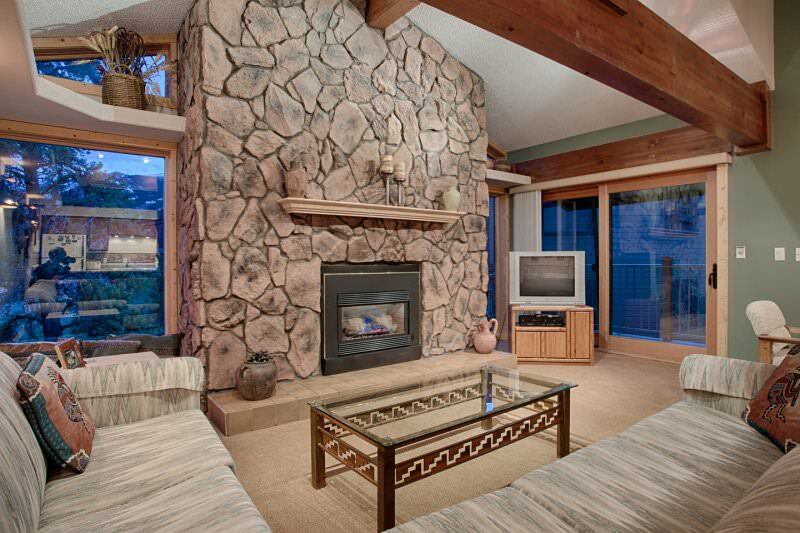 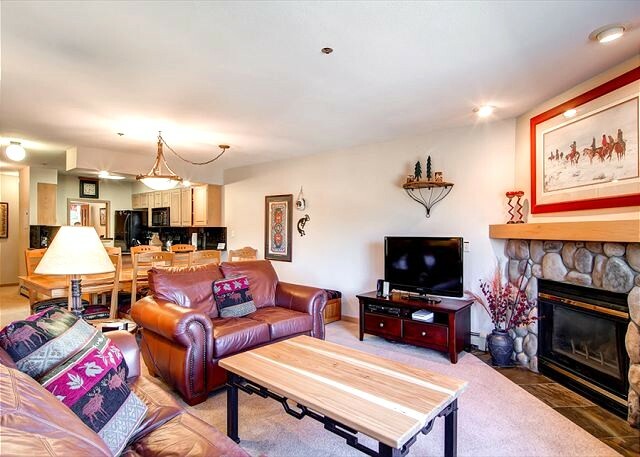 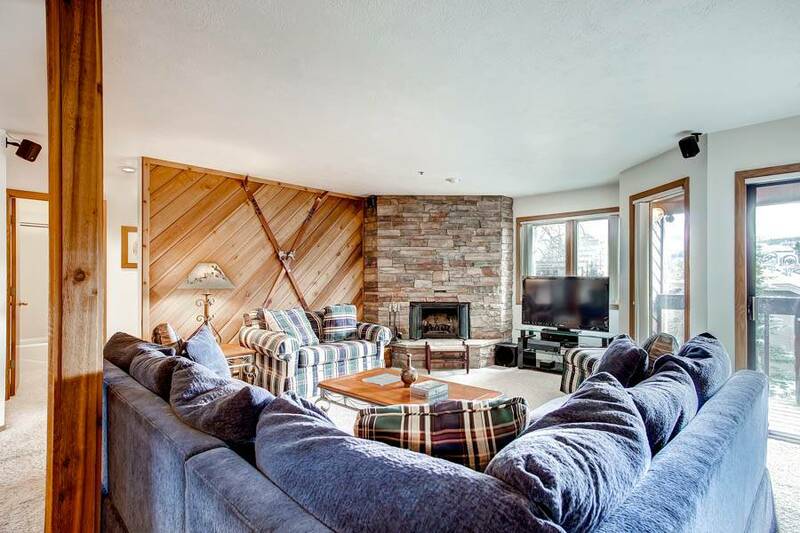 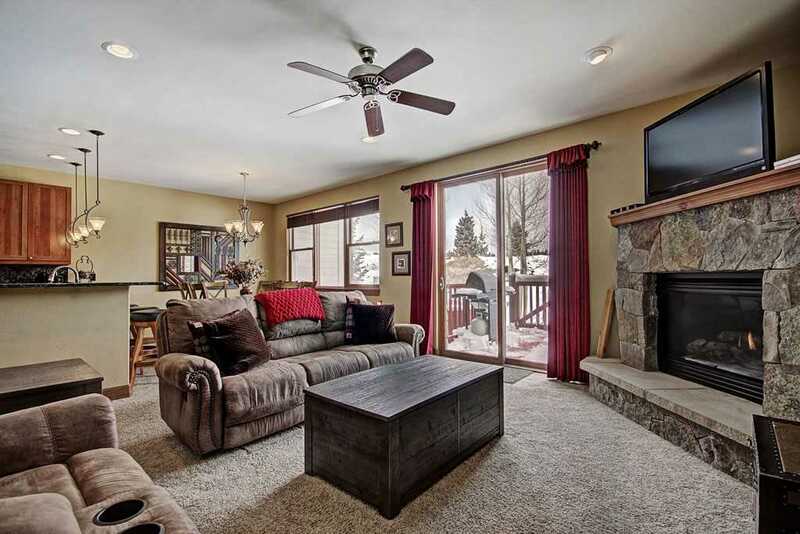 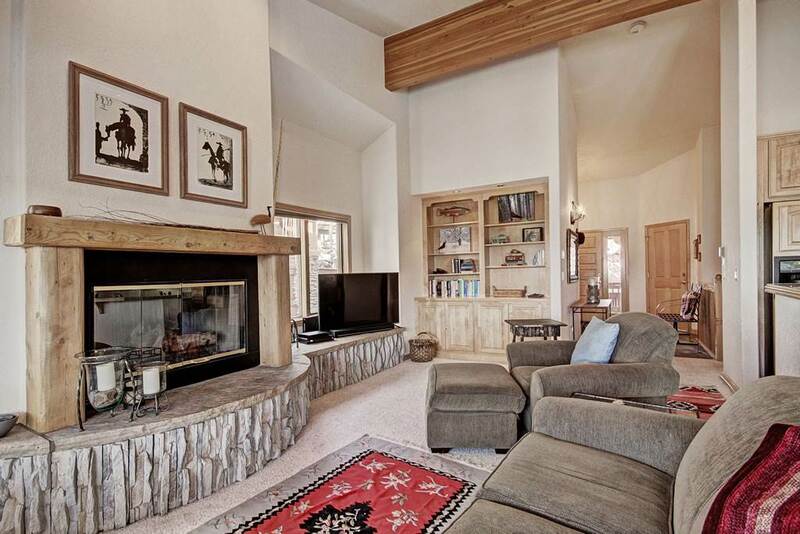 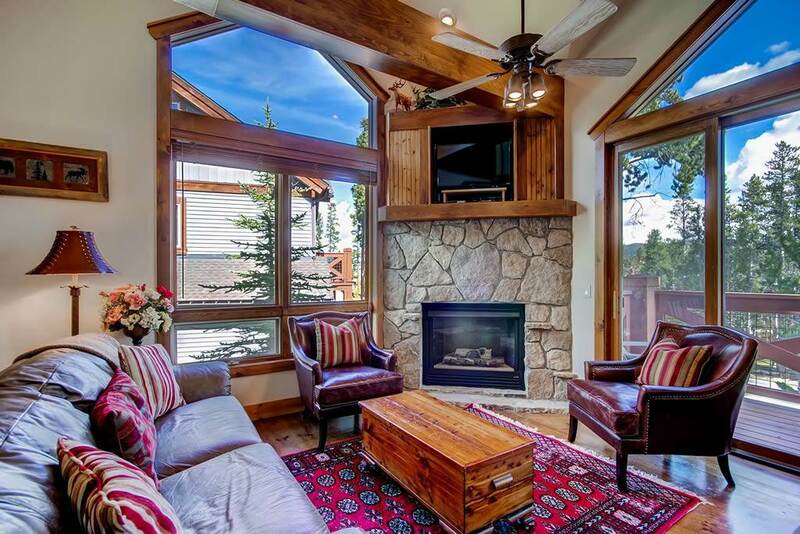 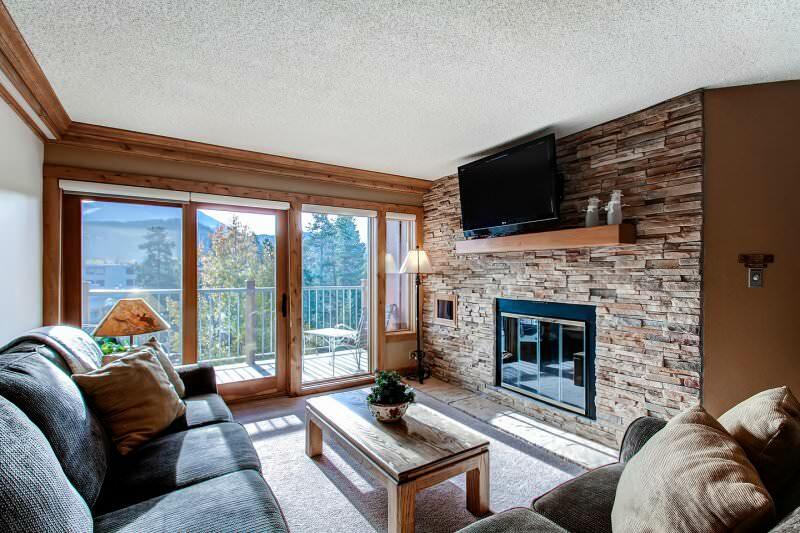 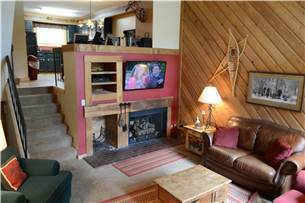 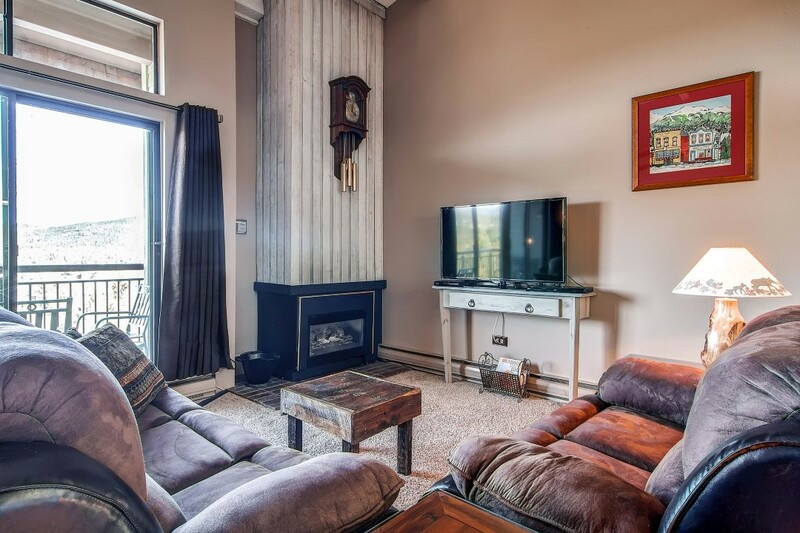 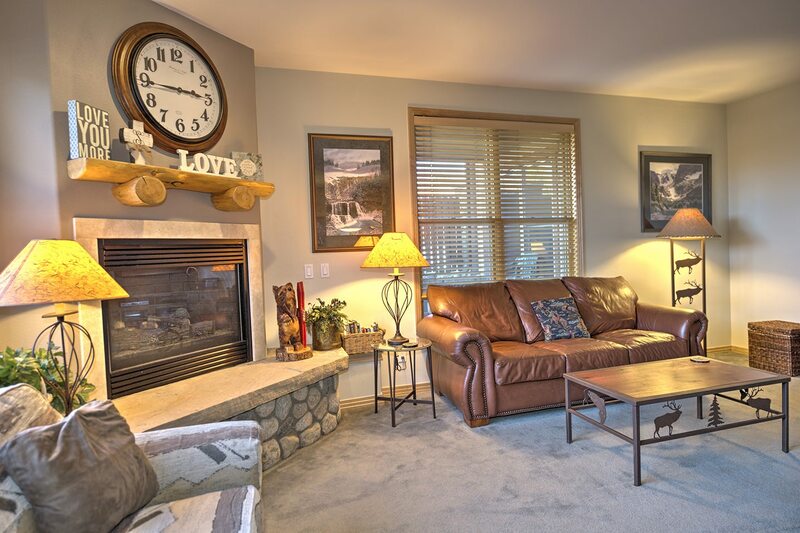 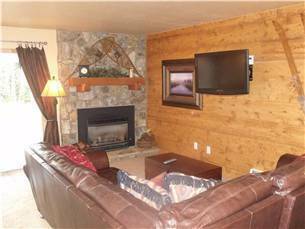 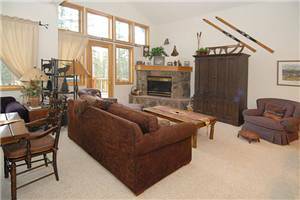 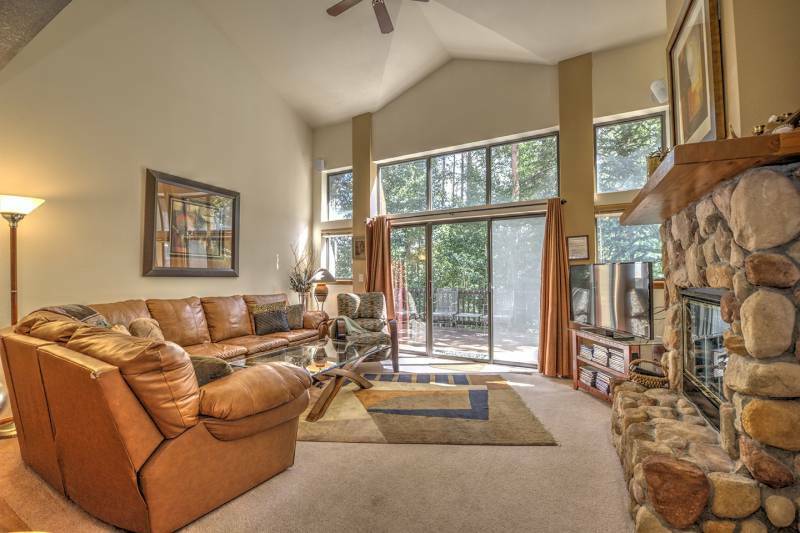 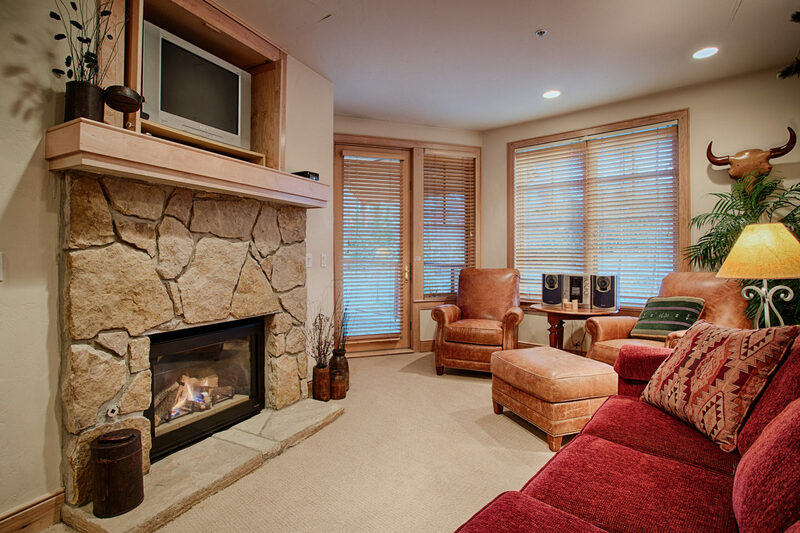 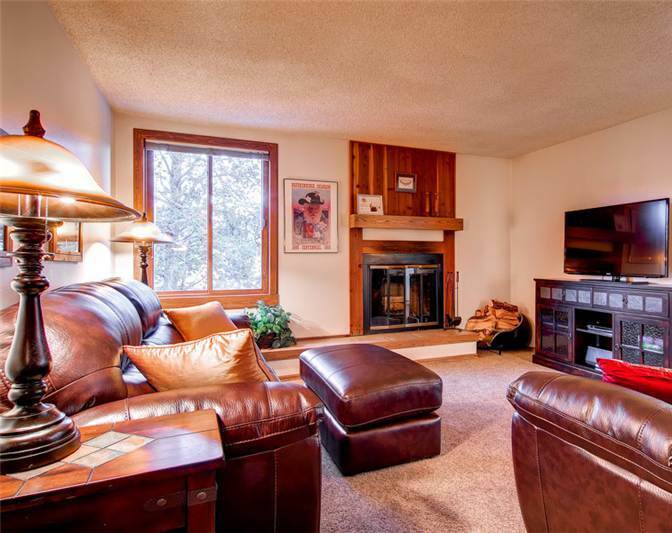 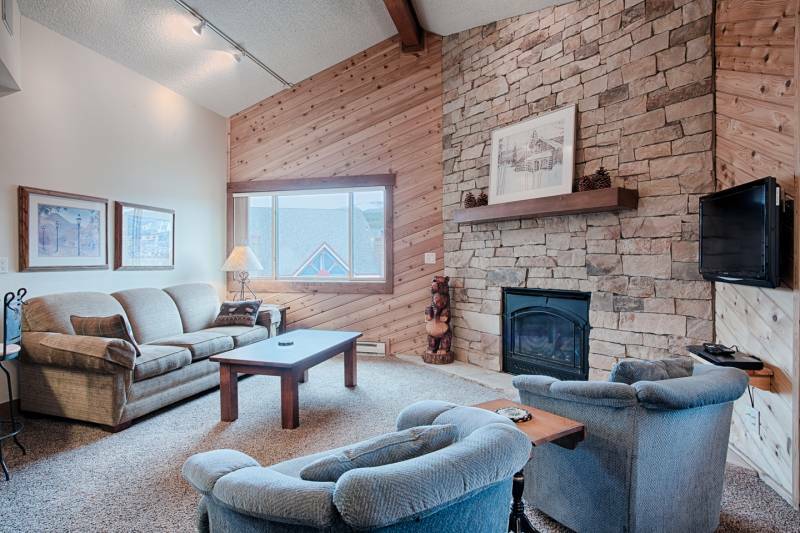 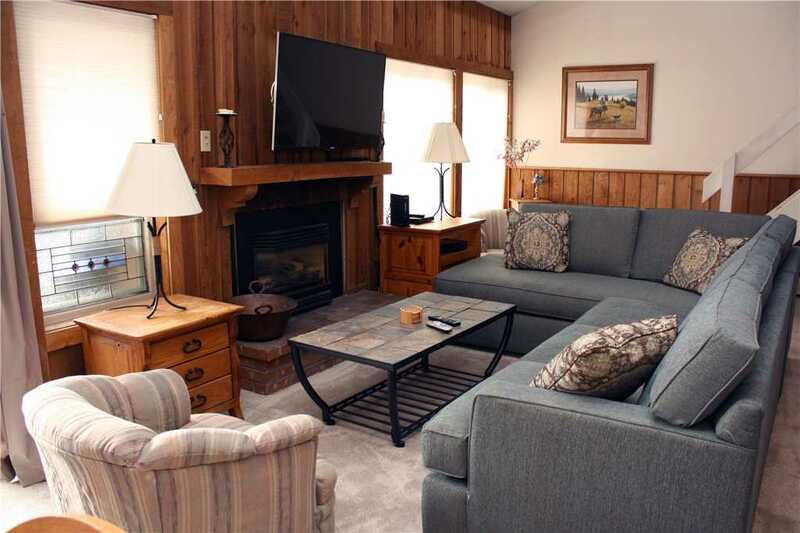 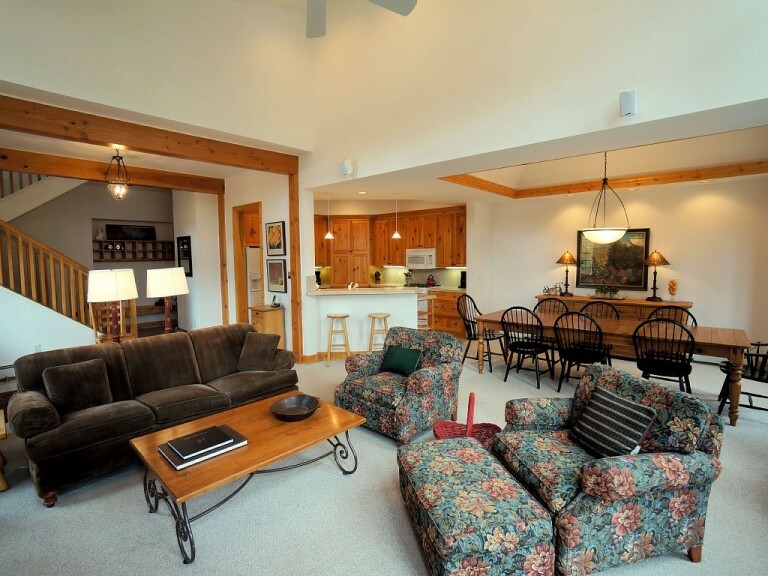 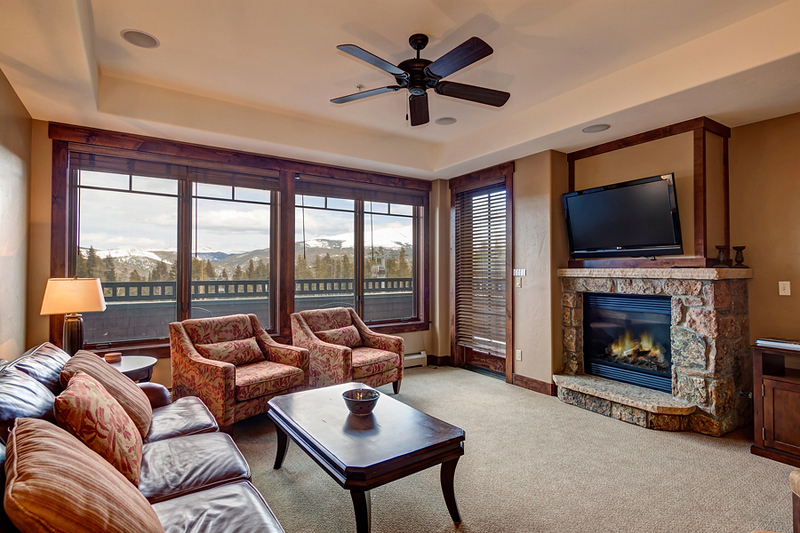 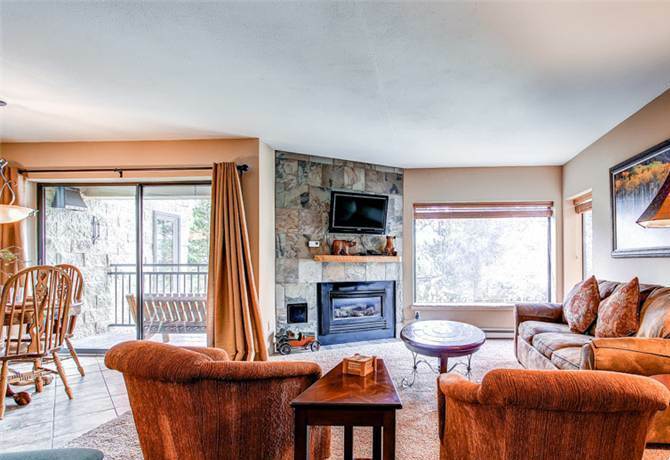 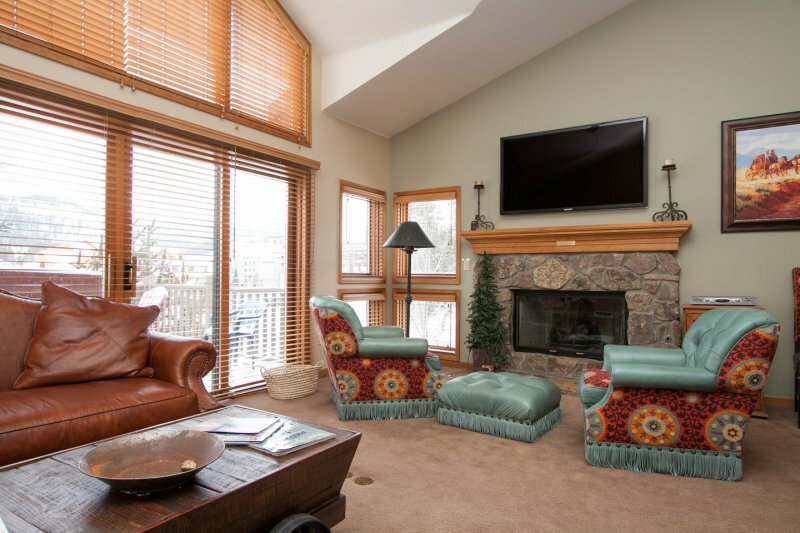 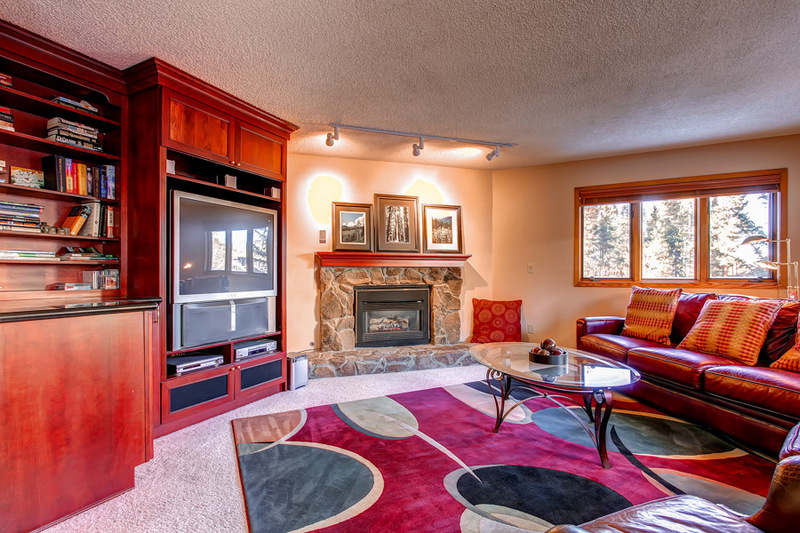 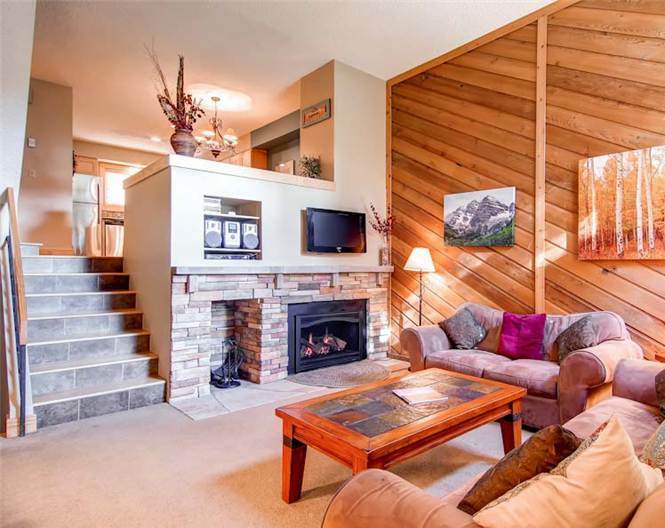 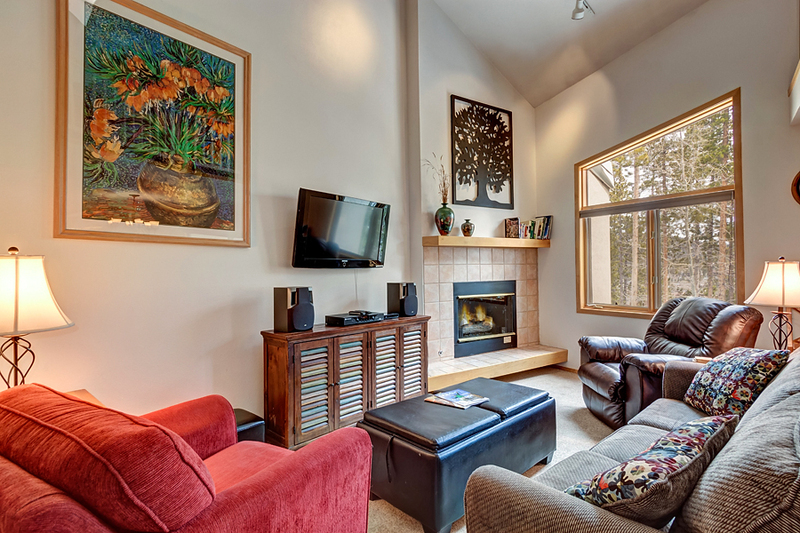 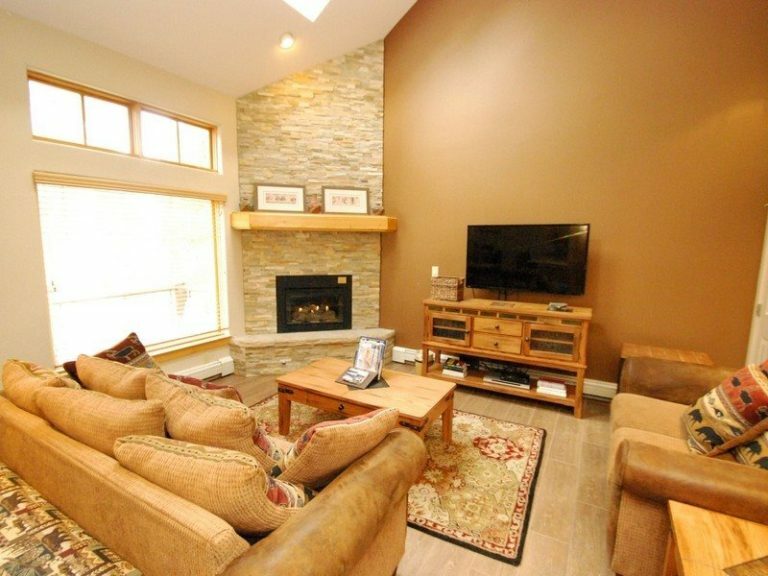 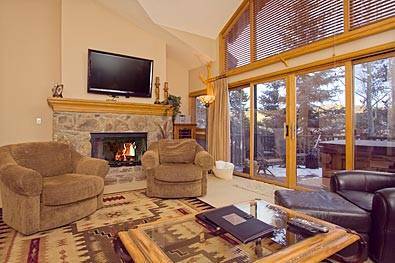 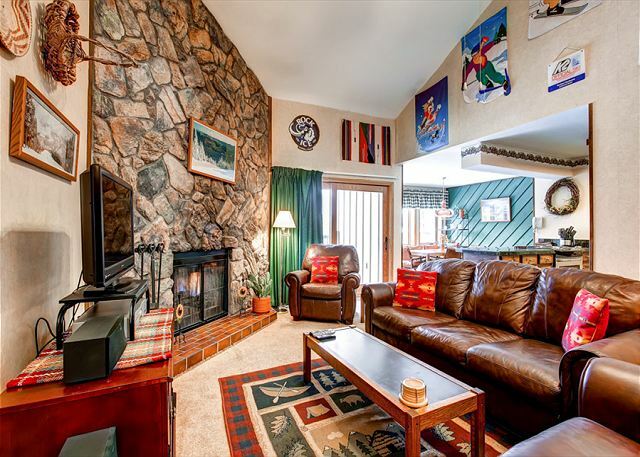 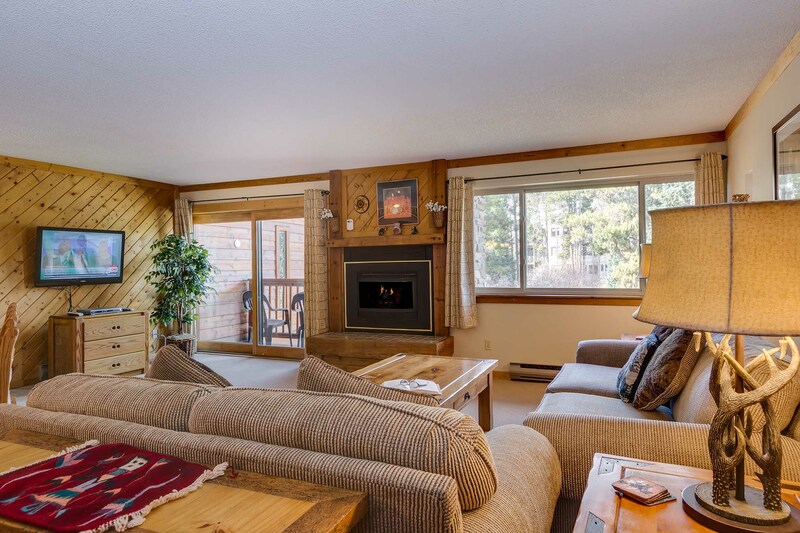 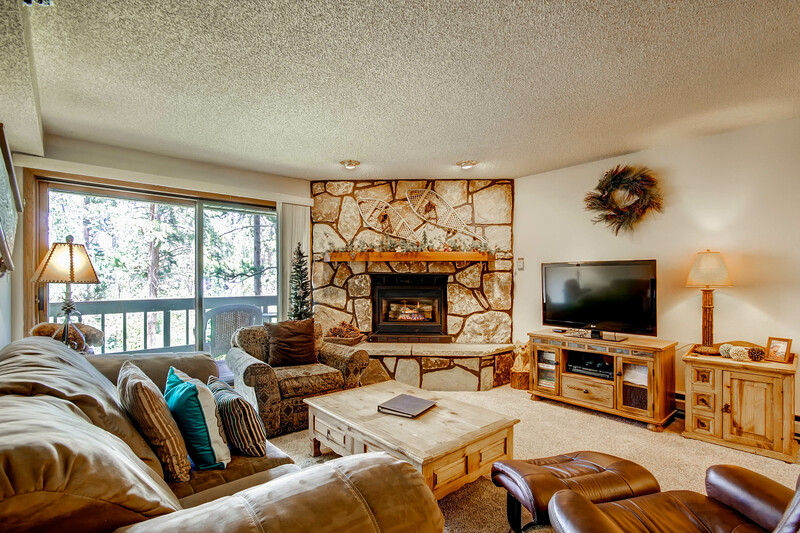 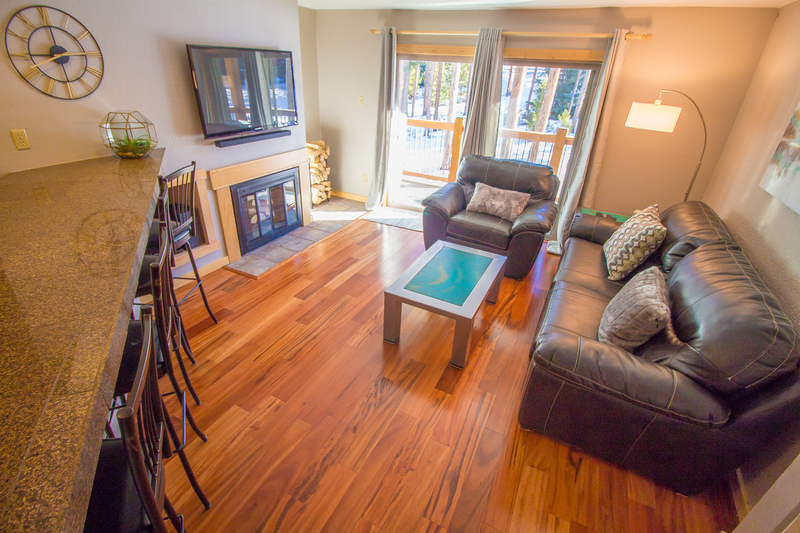 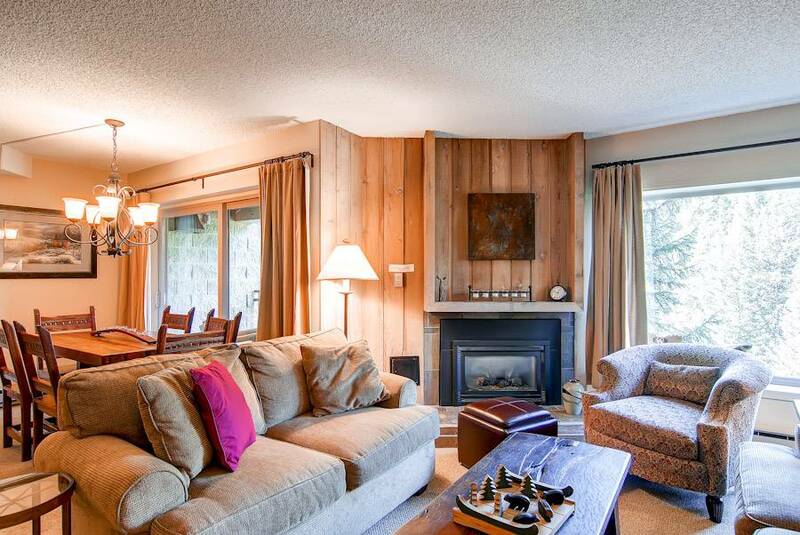 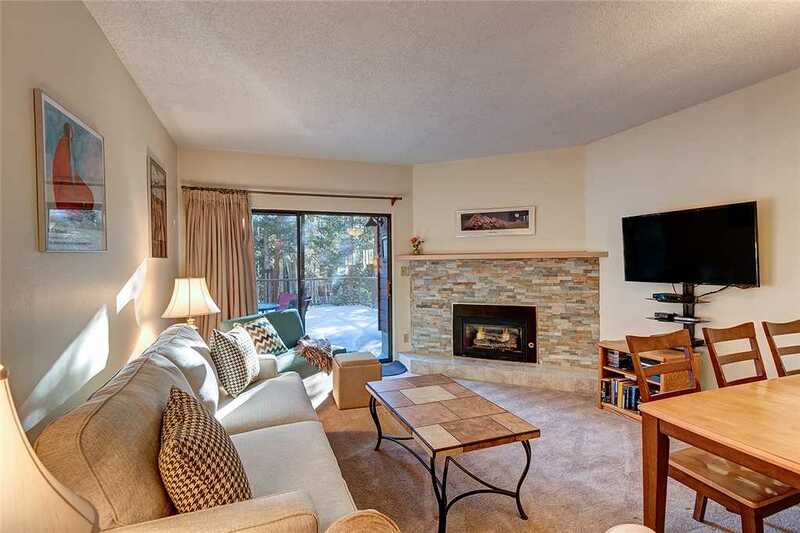 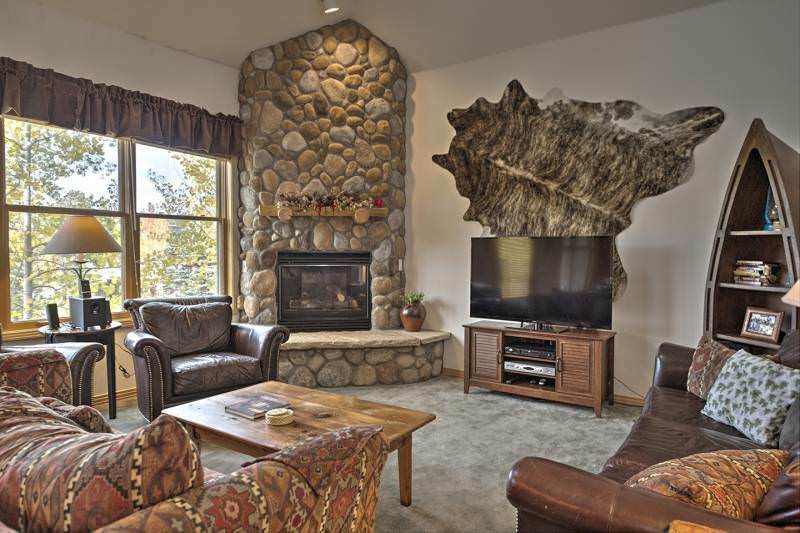 The living area features a slate tile gas fireplace, a large LCD-TV and Blu-ray player, and plenty of seating for kicking back after a day on the slopes or the bike trails. 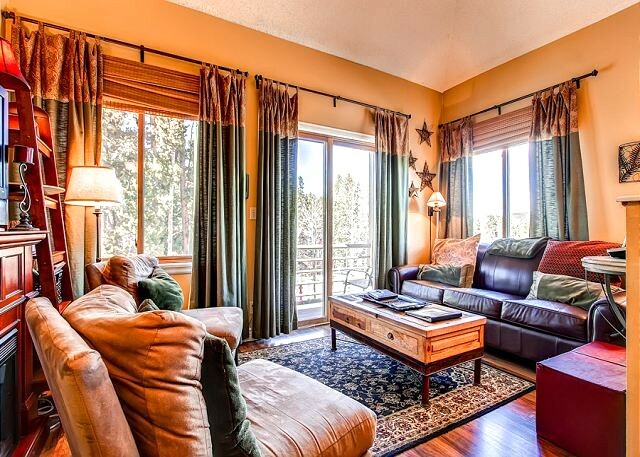 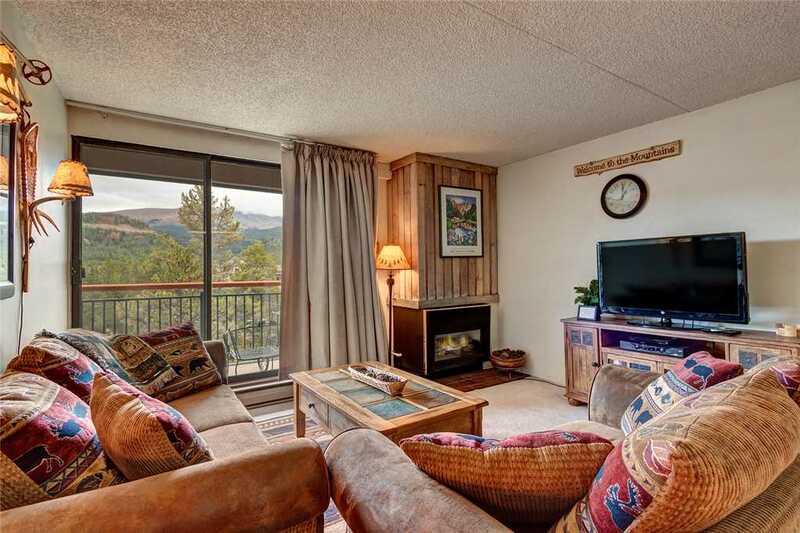 Just off the living area, the balcony has fantastic views of Frisco’s iconic Mt. 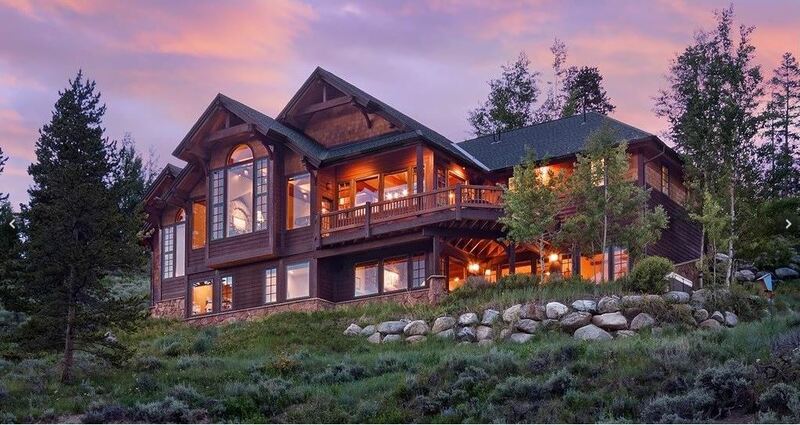 Royal. 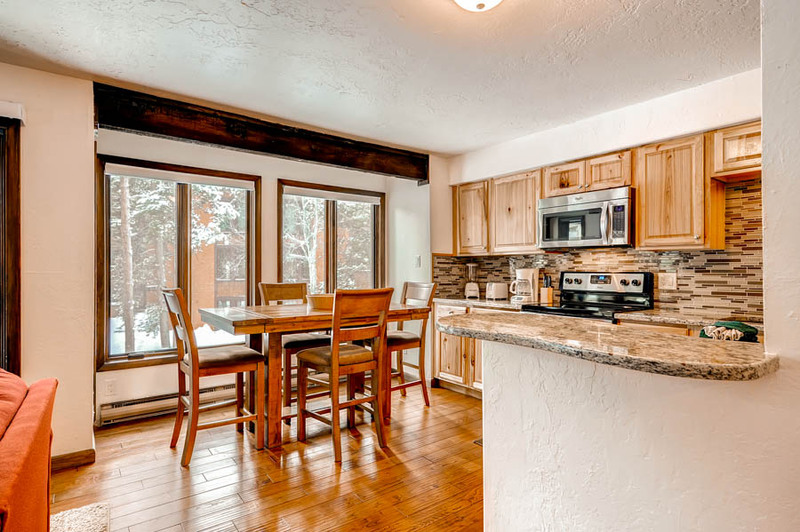 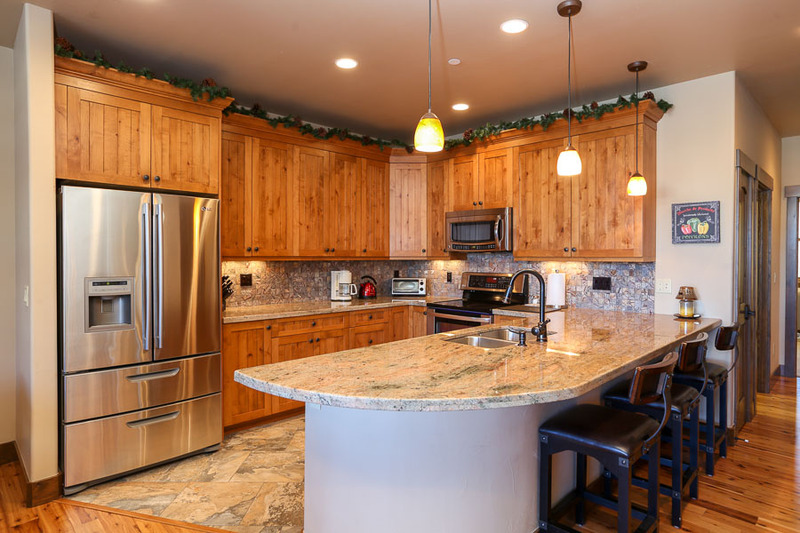 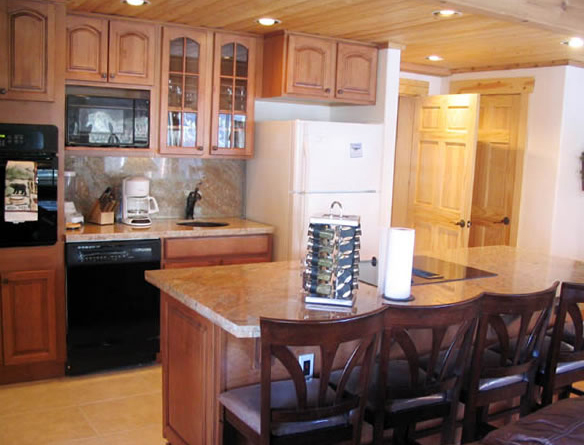 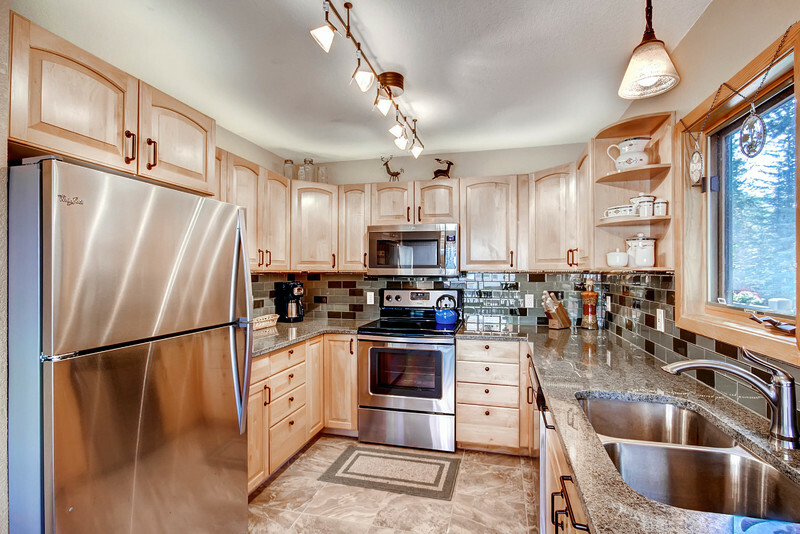 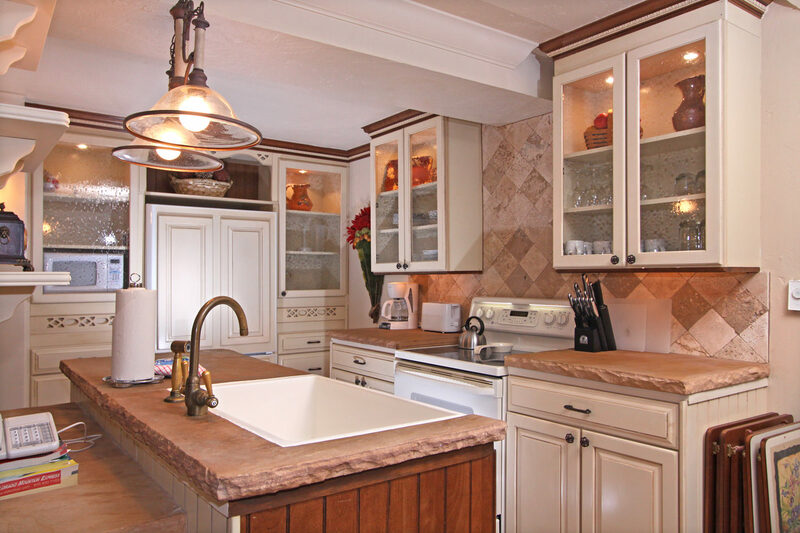 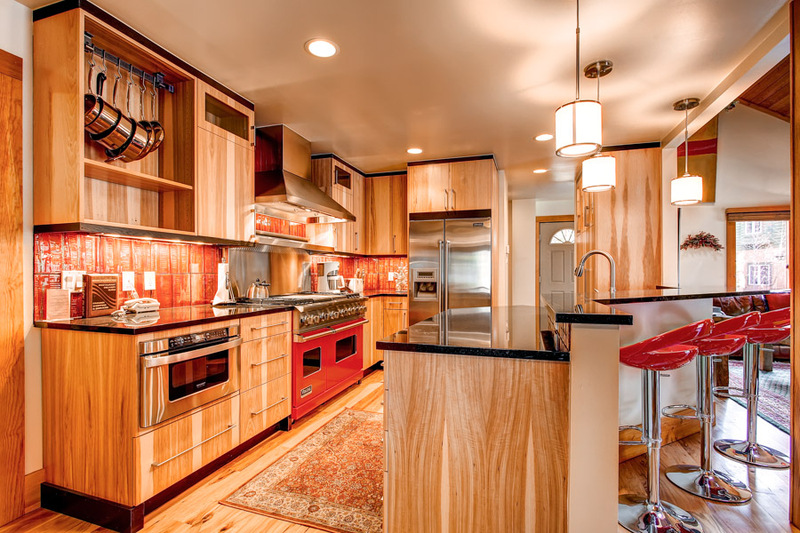 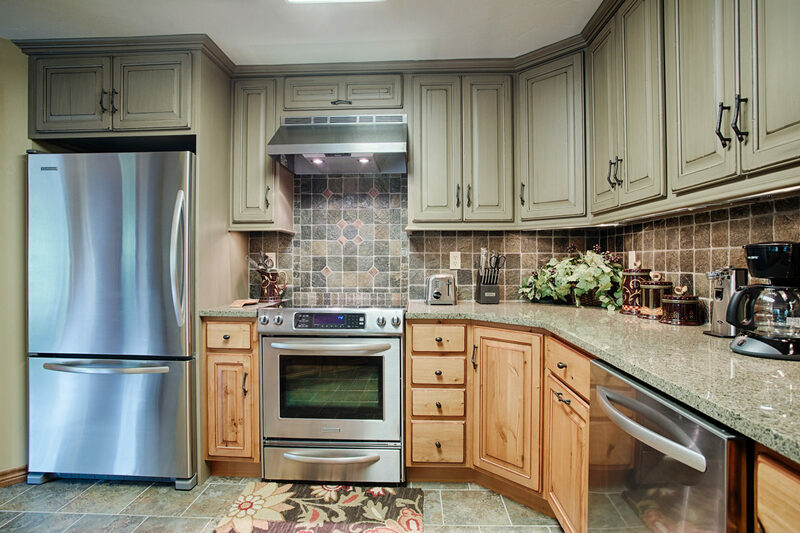 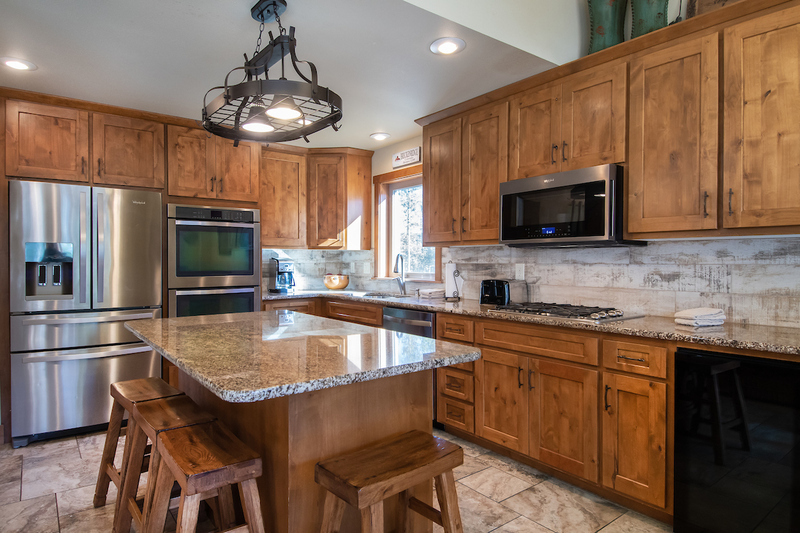 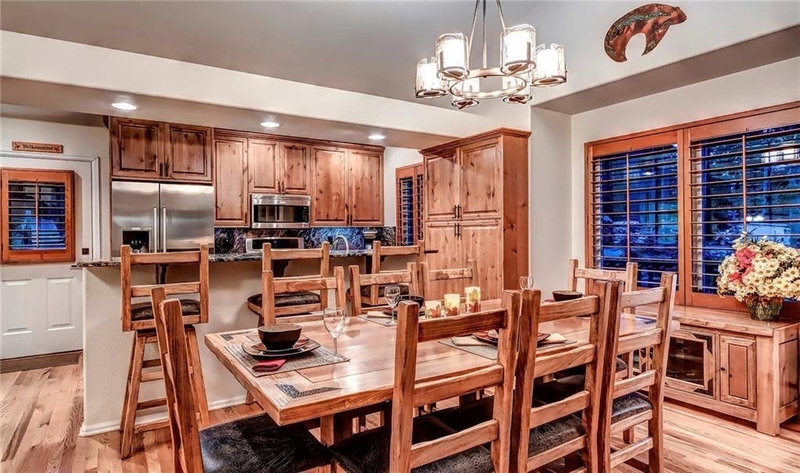 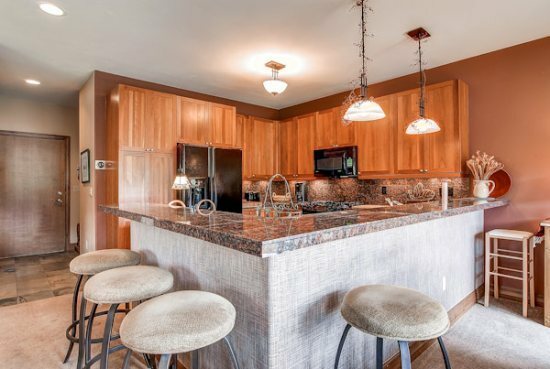 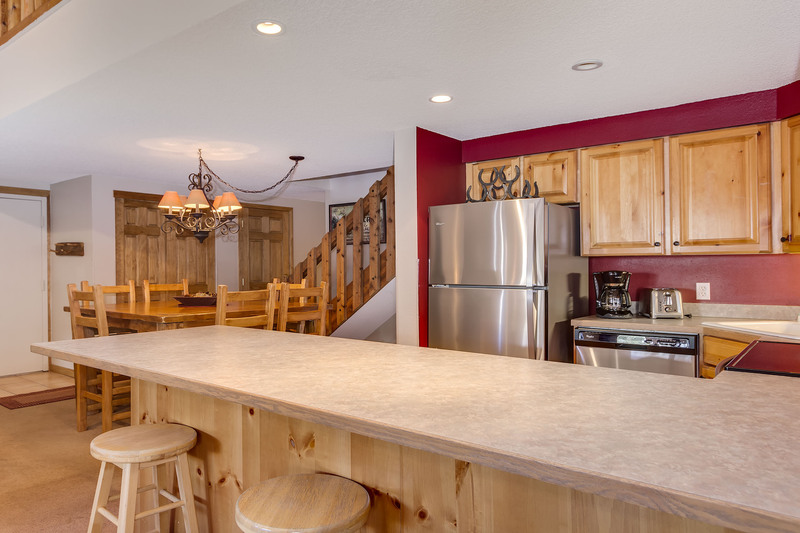 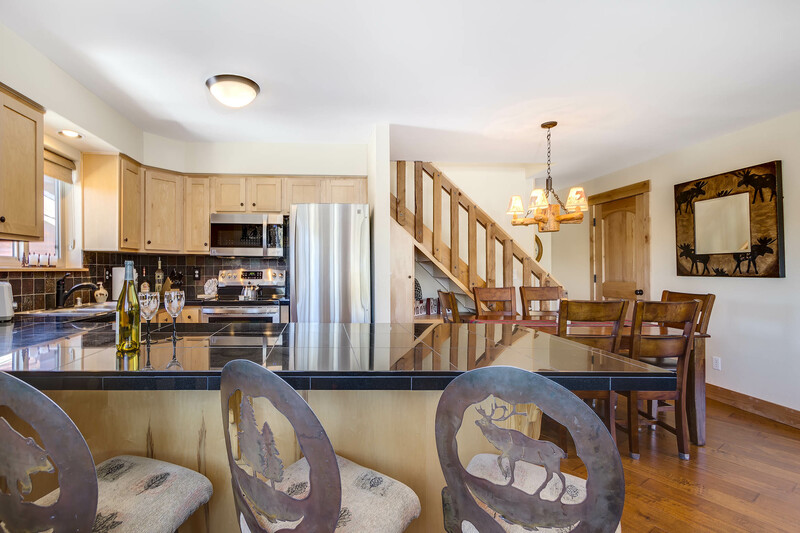 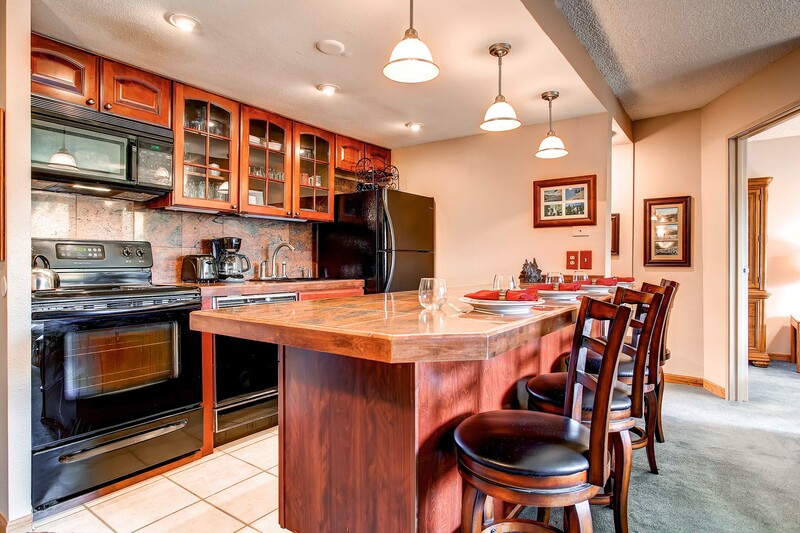 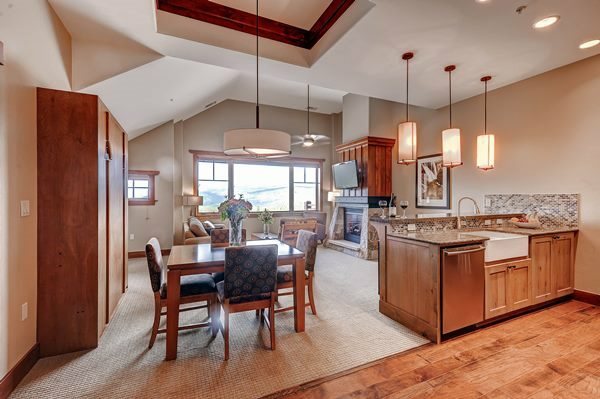 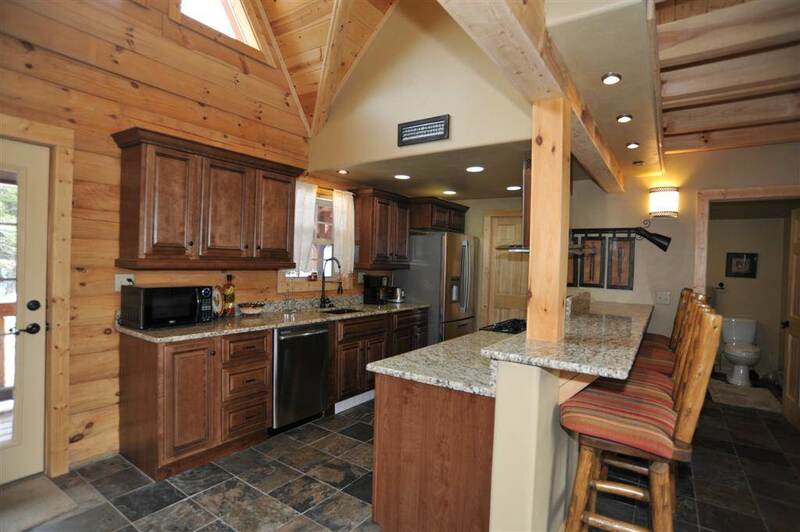 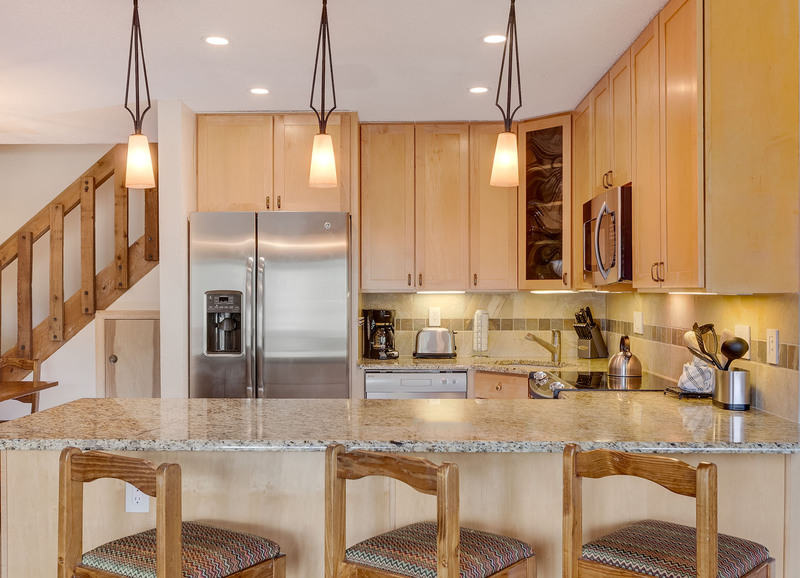 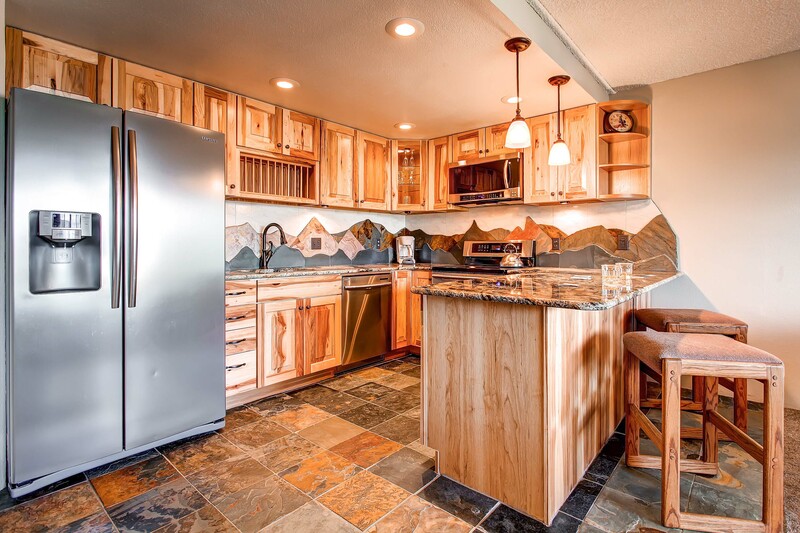 The kitchen has everything you’ll need to whip up tasty meals and après–ski snacks for your hungry group. 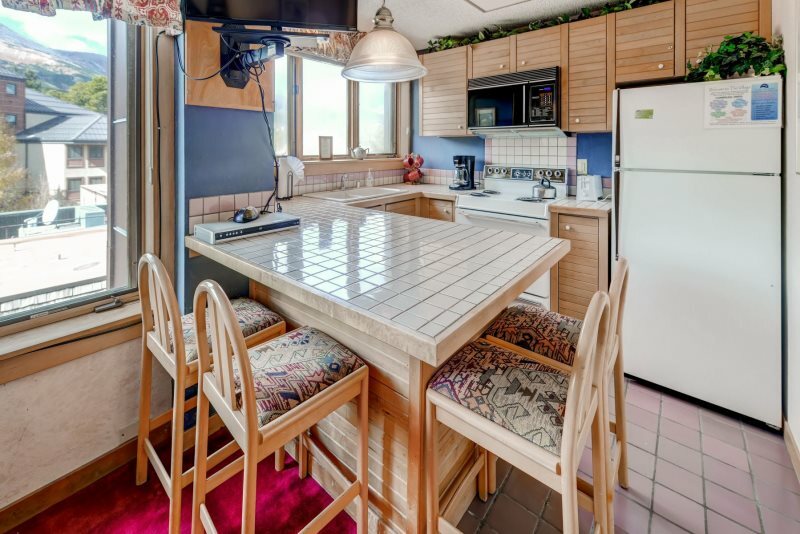 The dining table seats six, and there’s room for two at the counter. 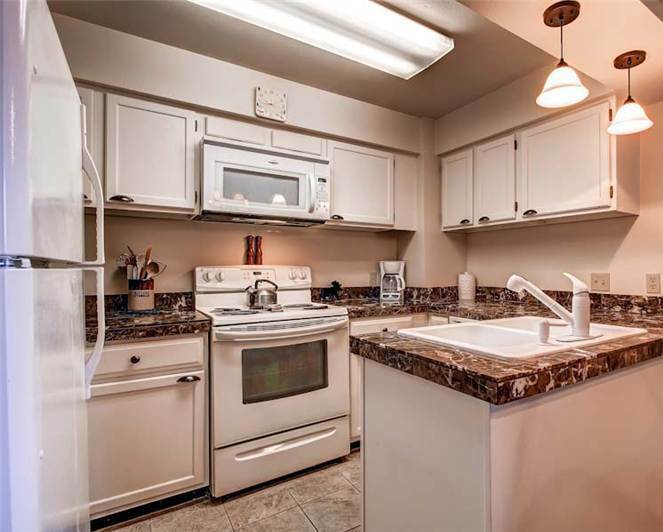 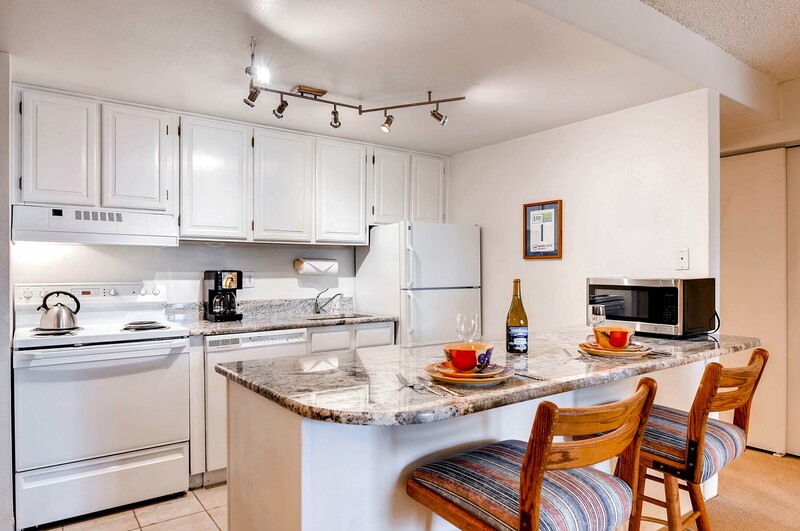 Other amenities include a washer and dryer, complementary Wi-Fi throughout the unit, and a one-car garage with an outdoor parking space, too. 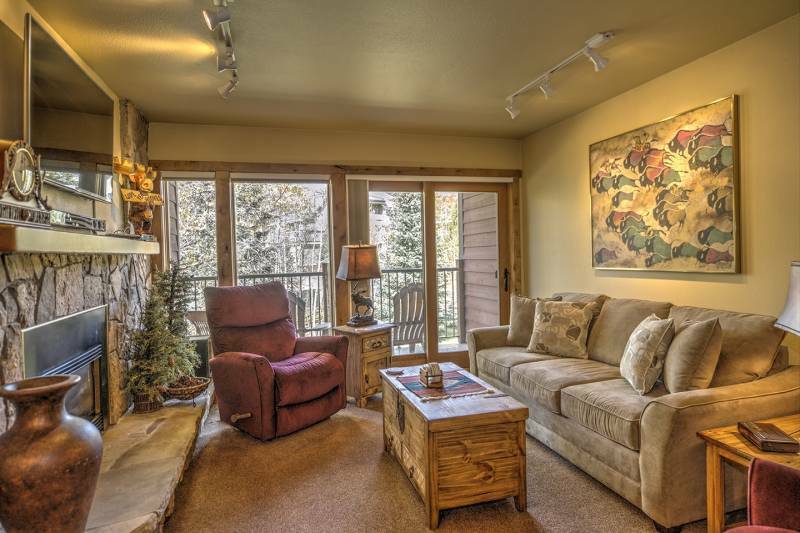 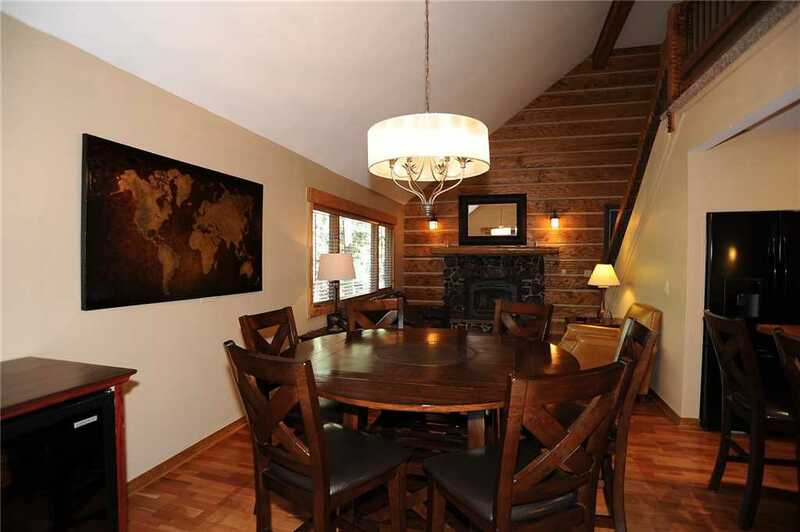 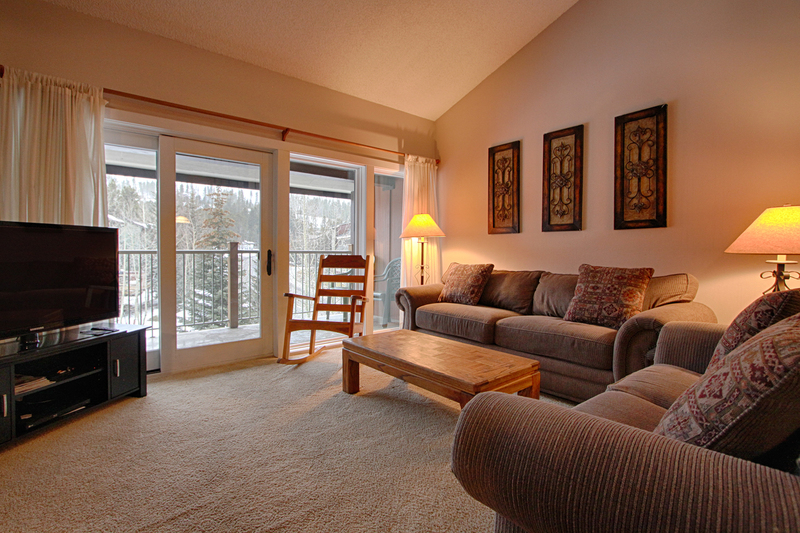 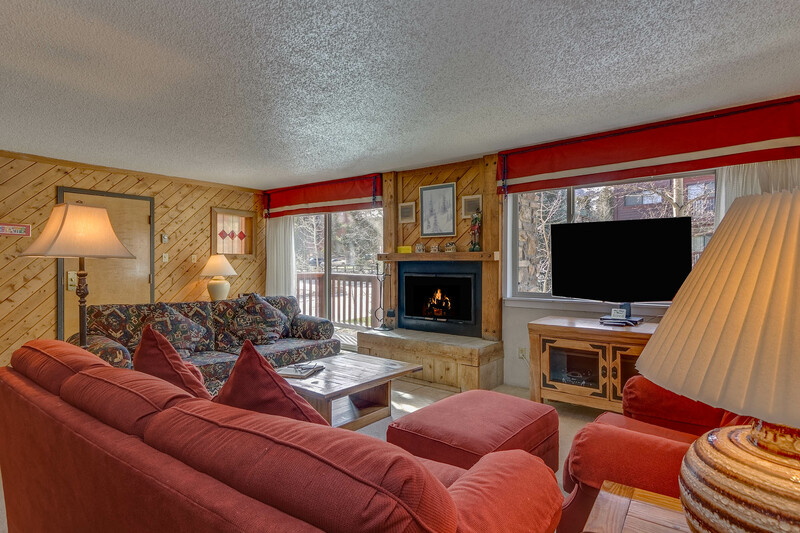 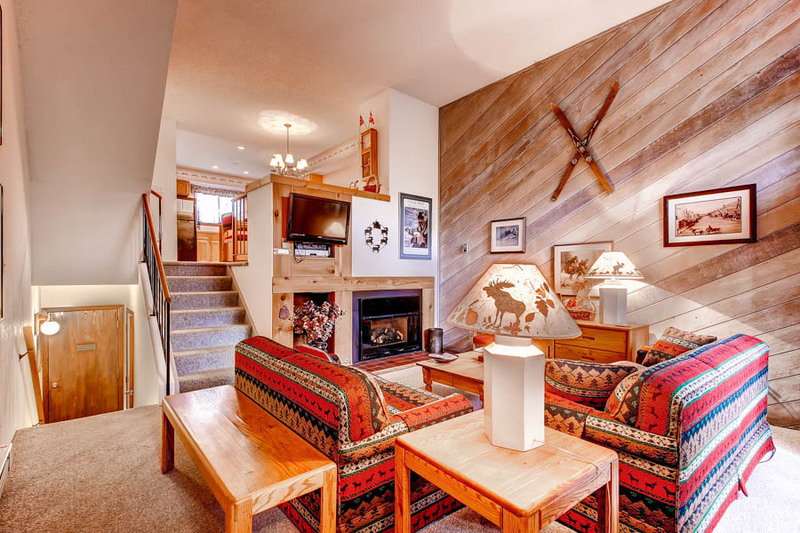 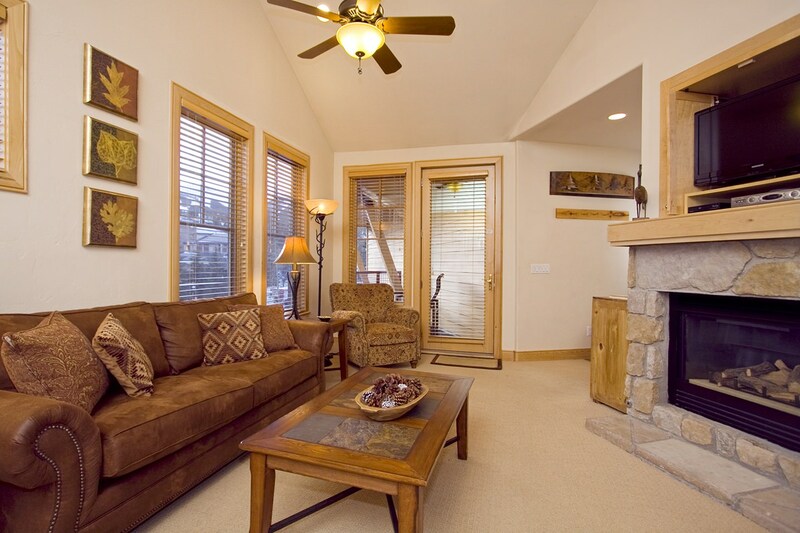 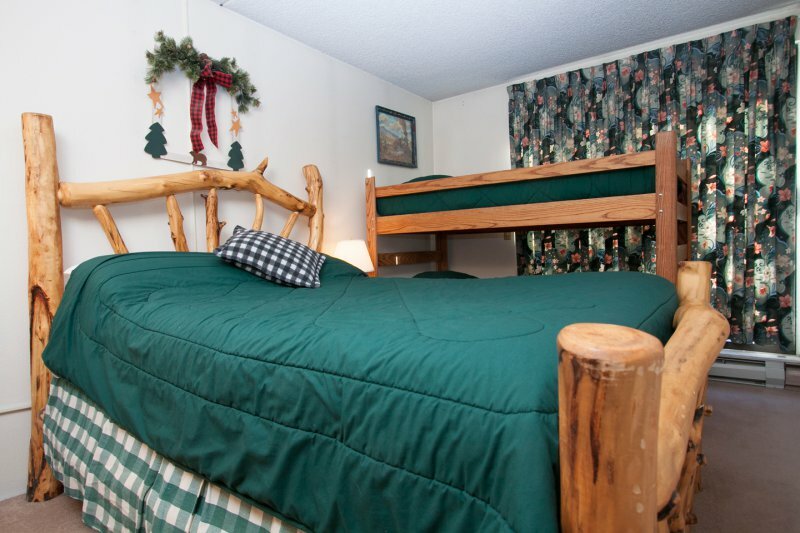 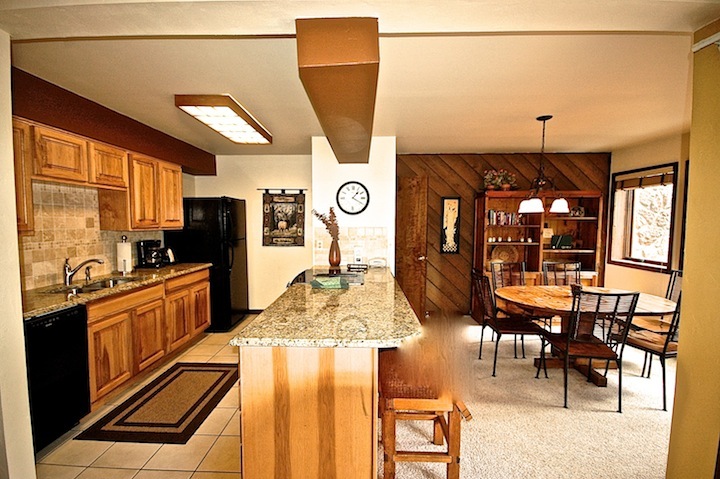 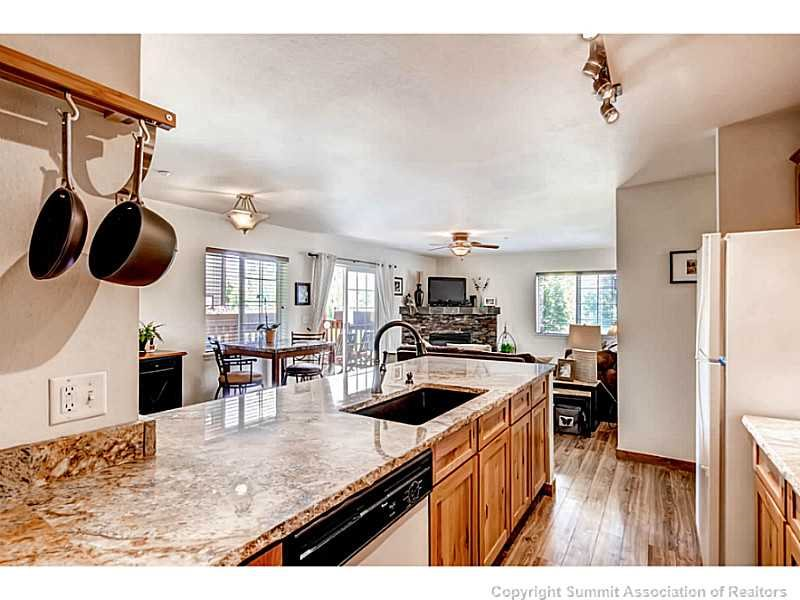 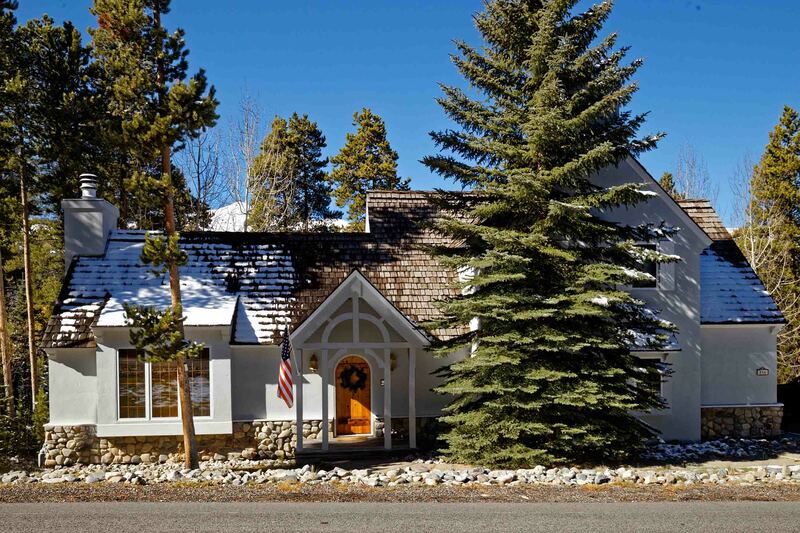 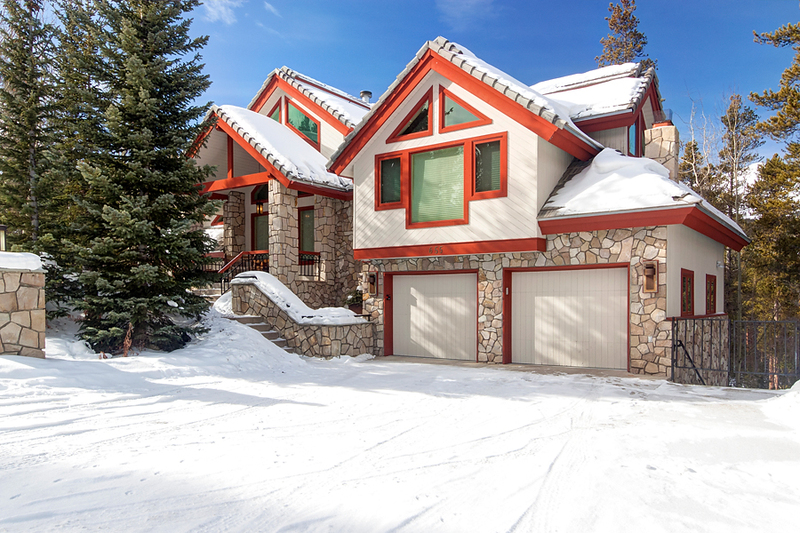 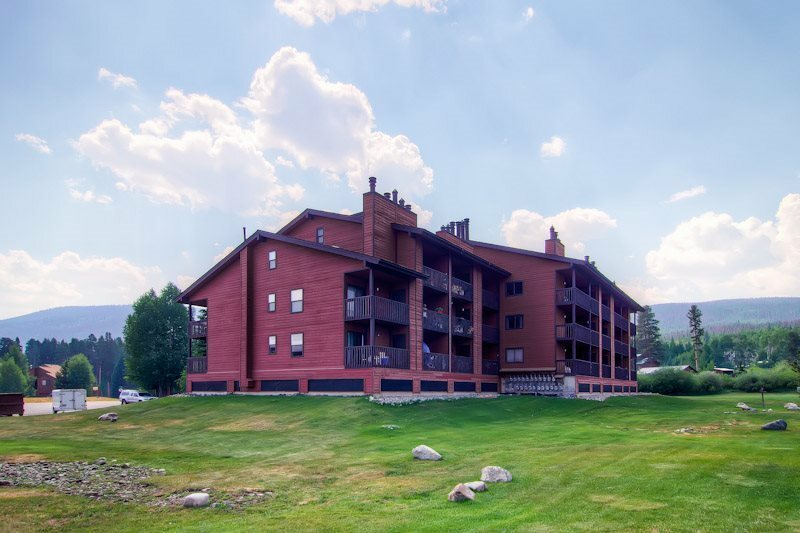 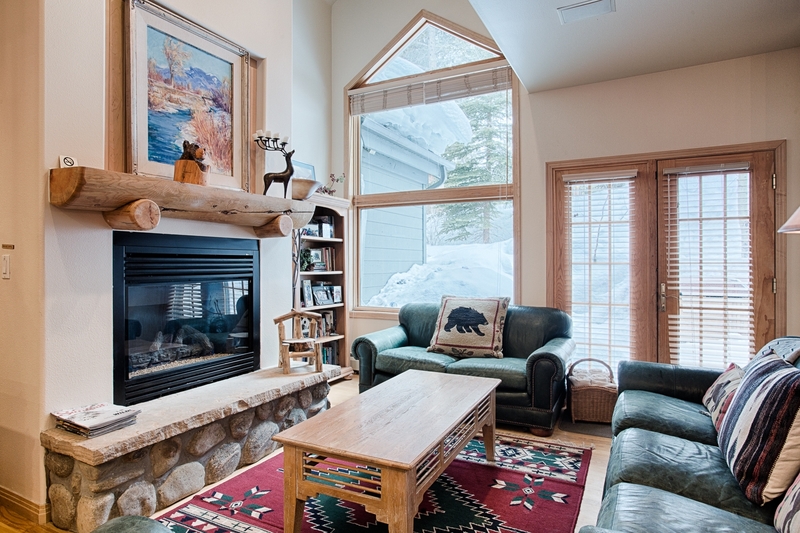 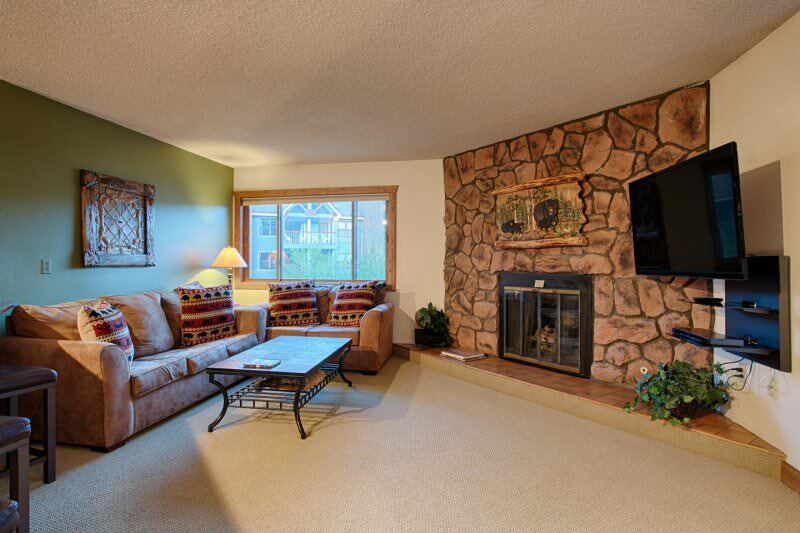 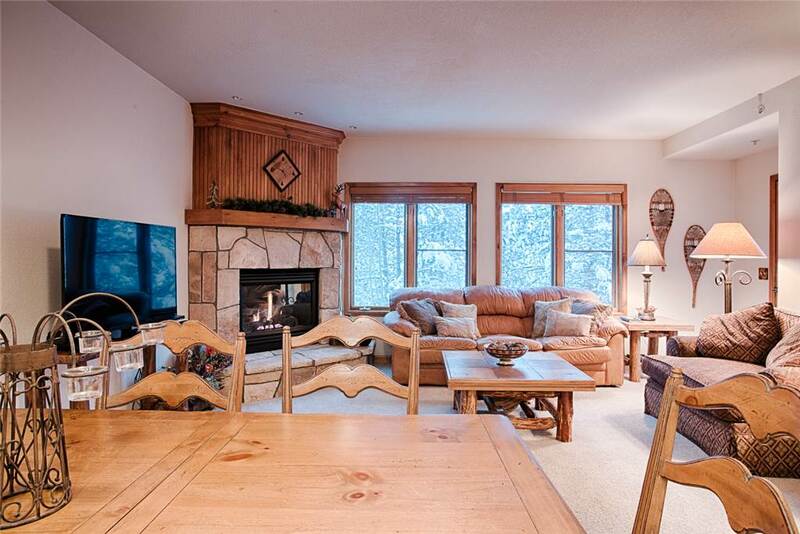 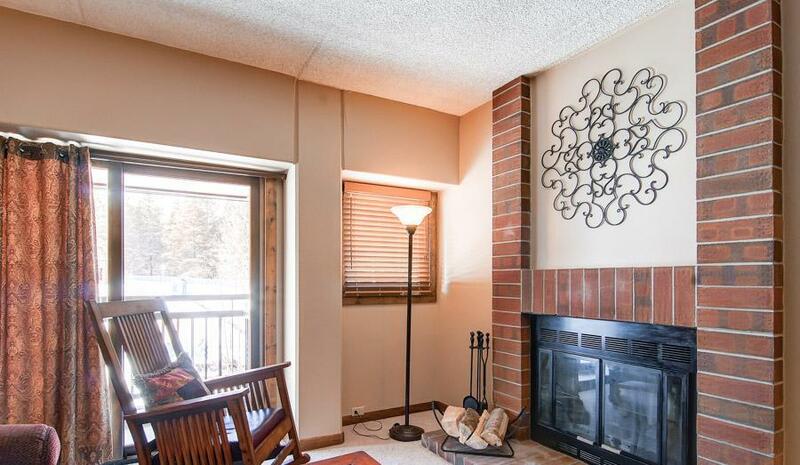 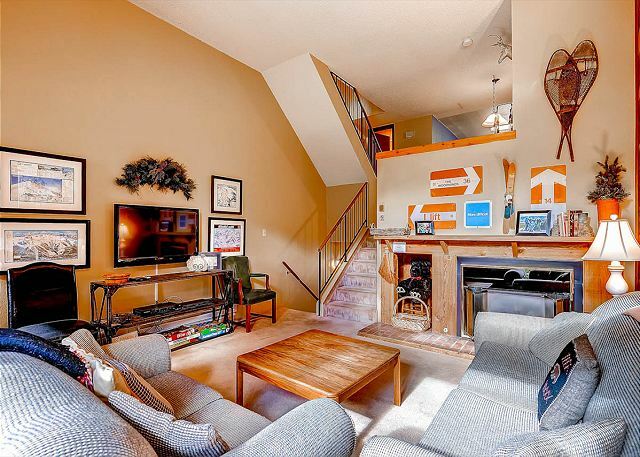 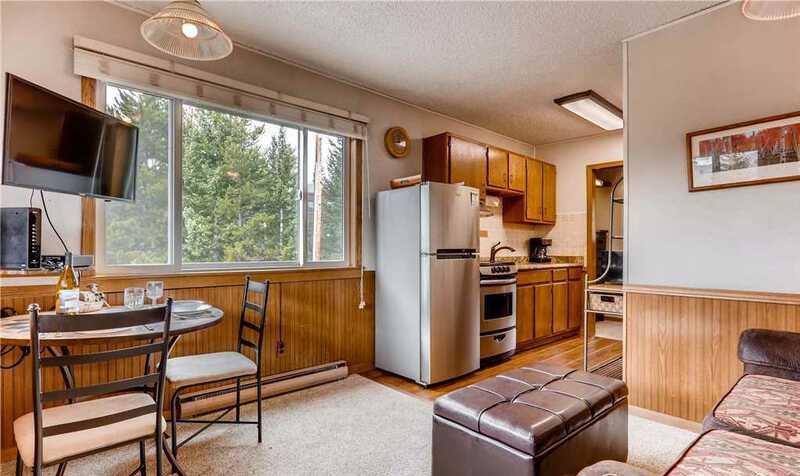 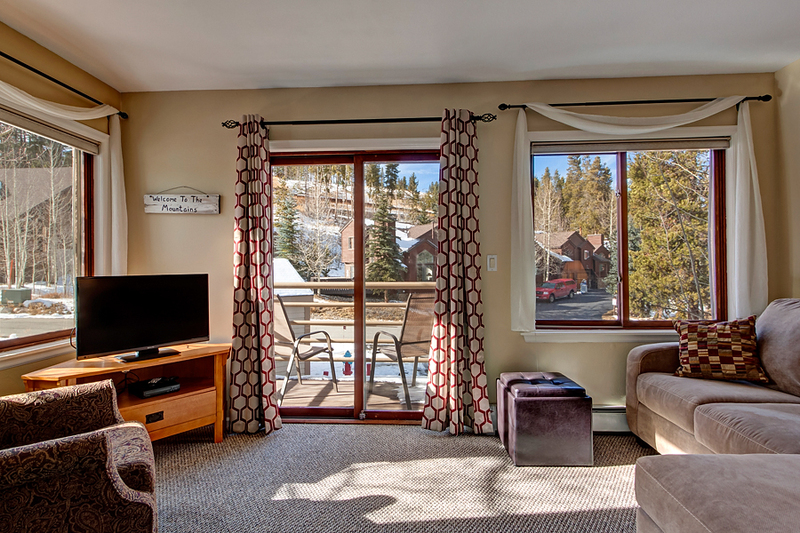 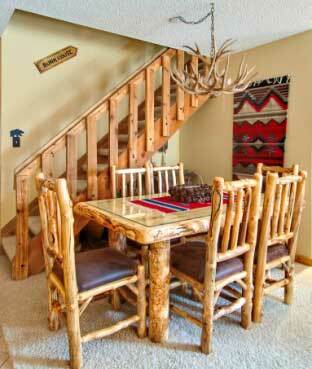 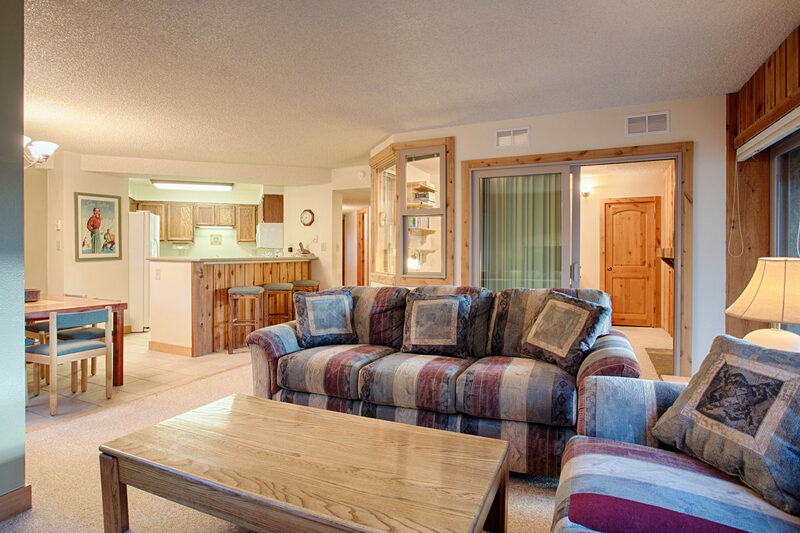 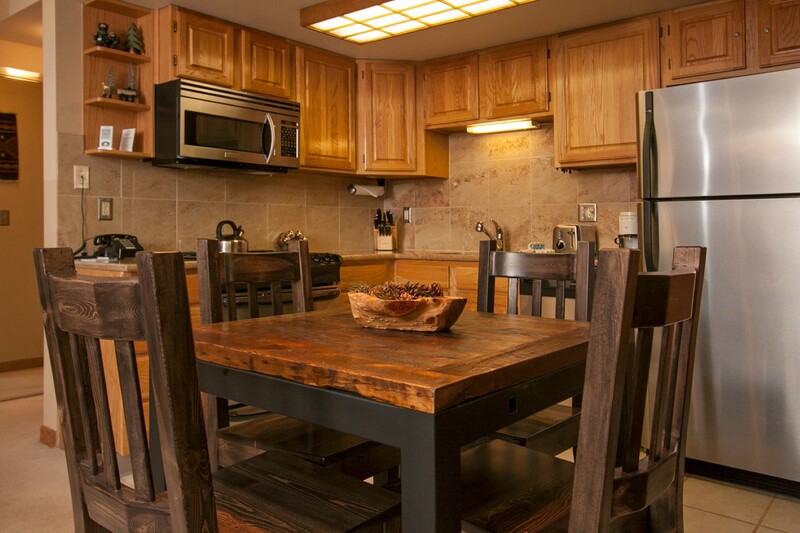 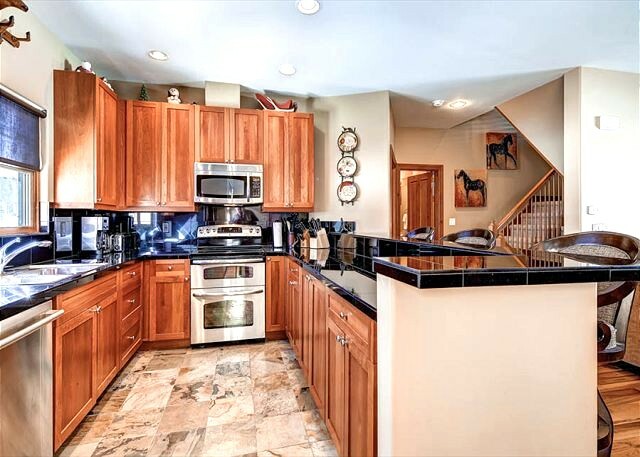 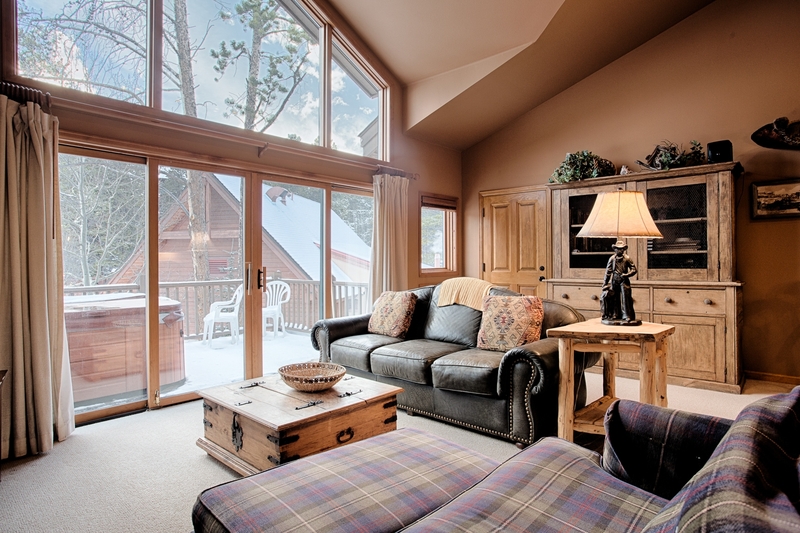 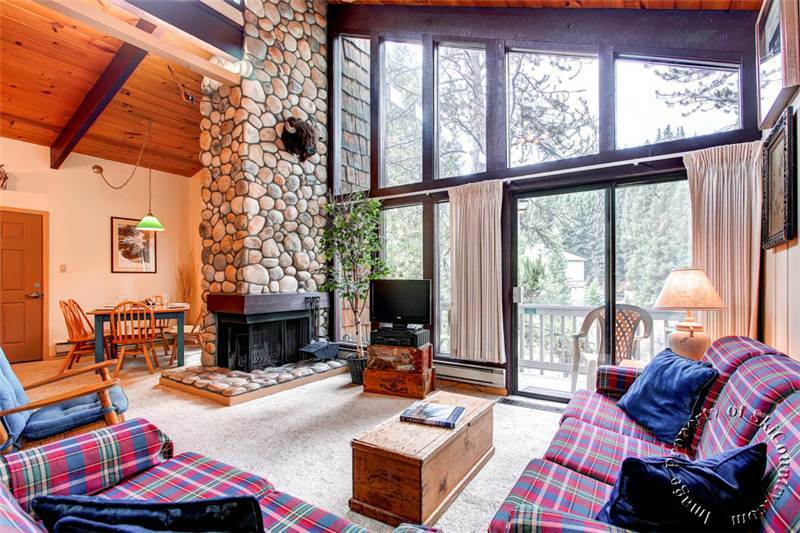 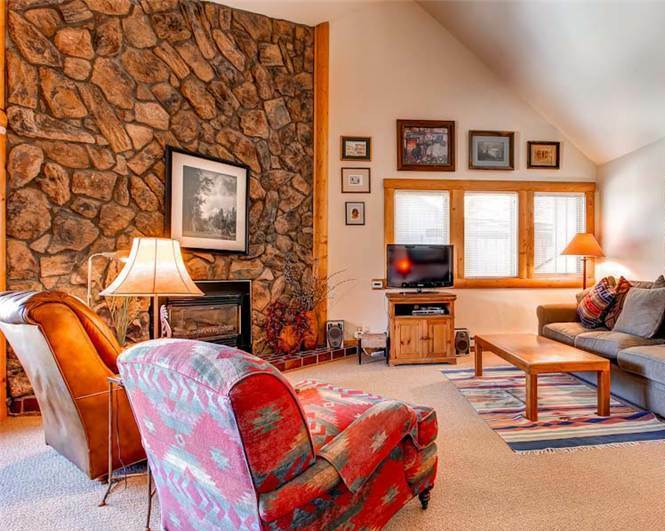 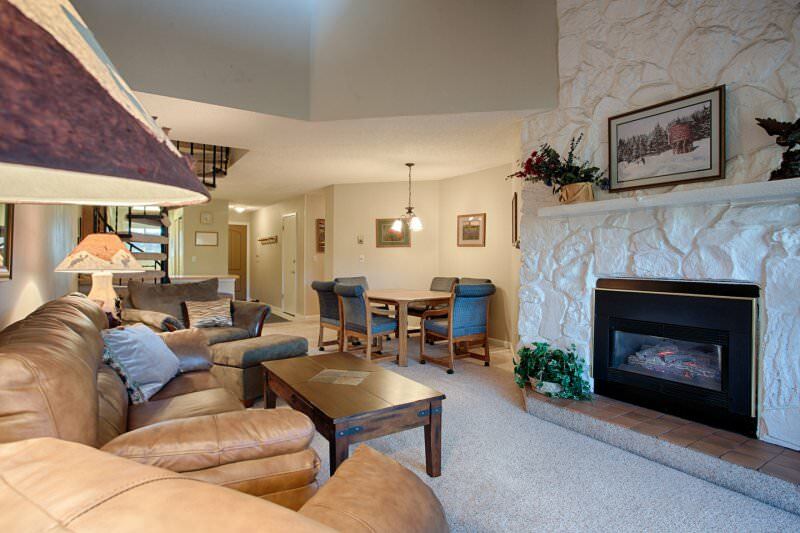 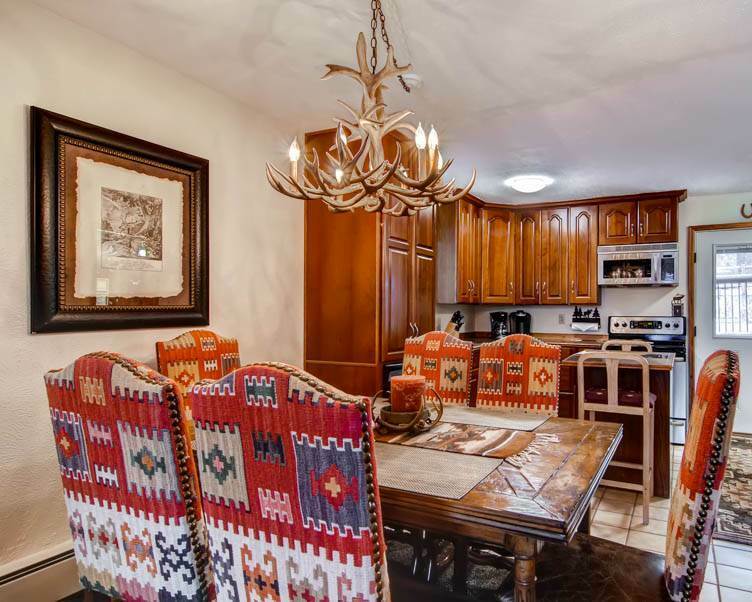 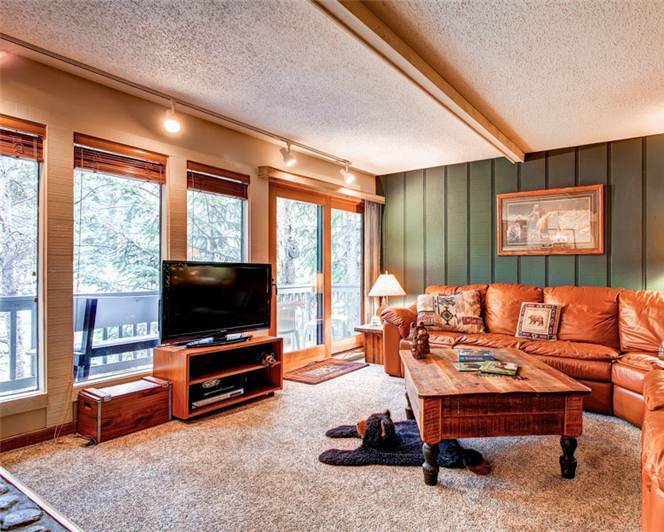 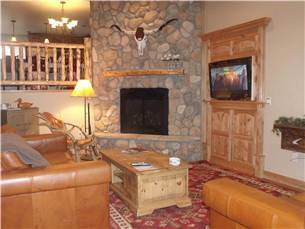 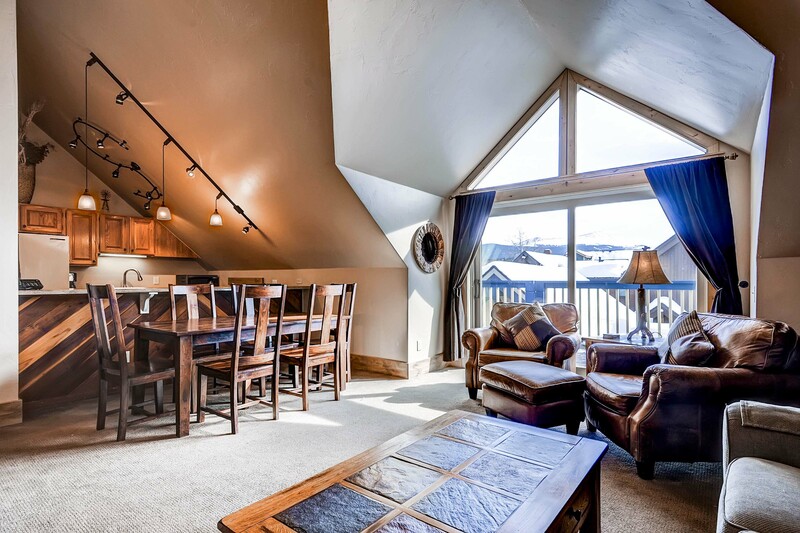 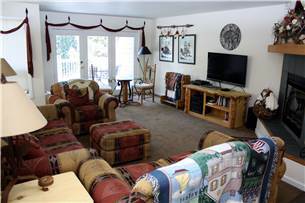 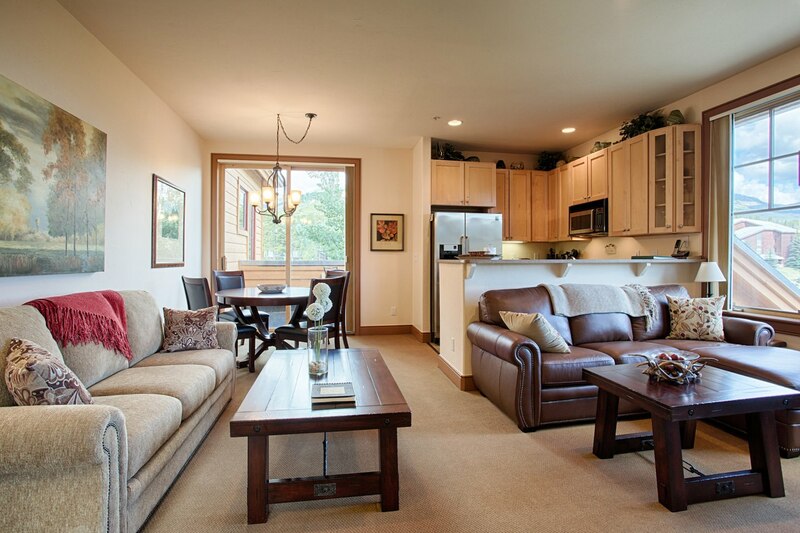 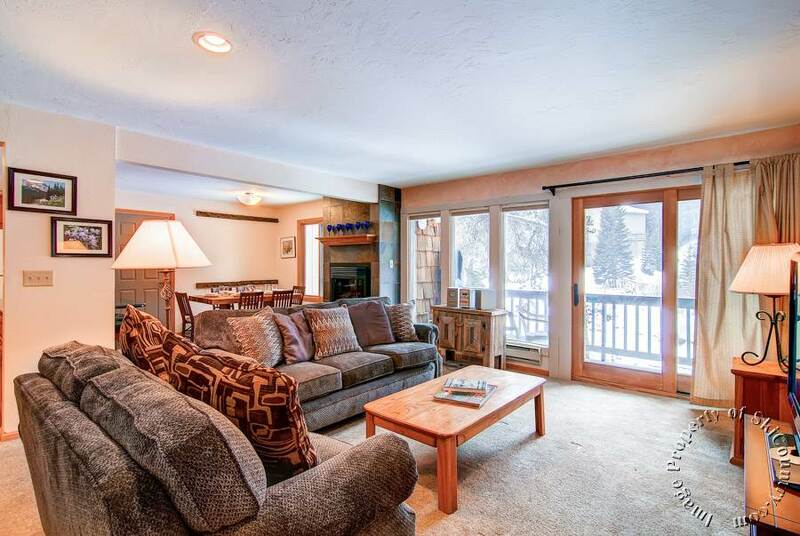 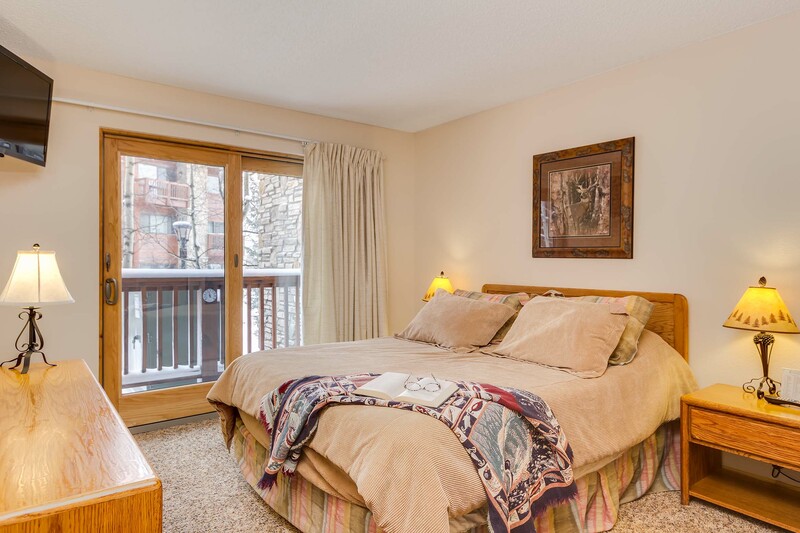 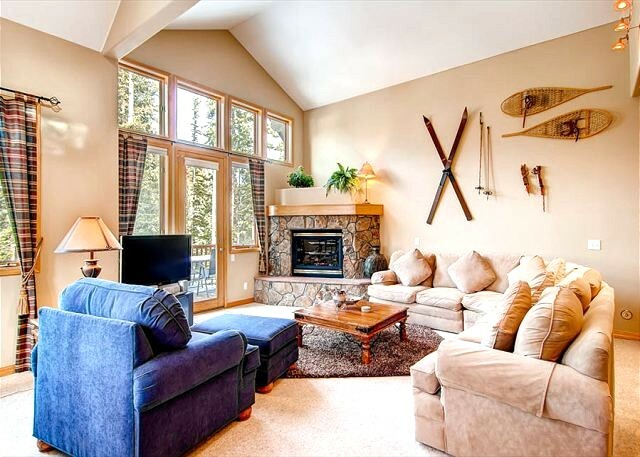 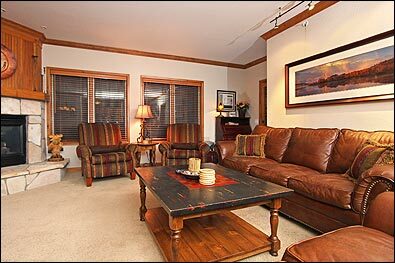 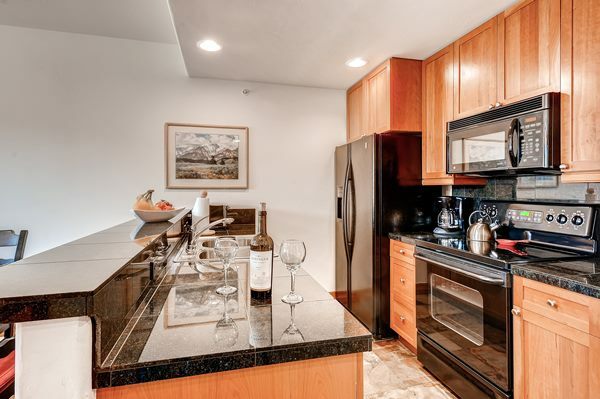 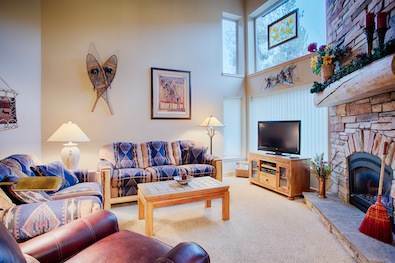 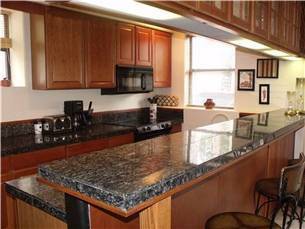 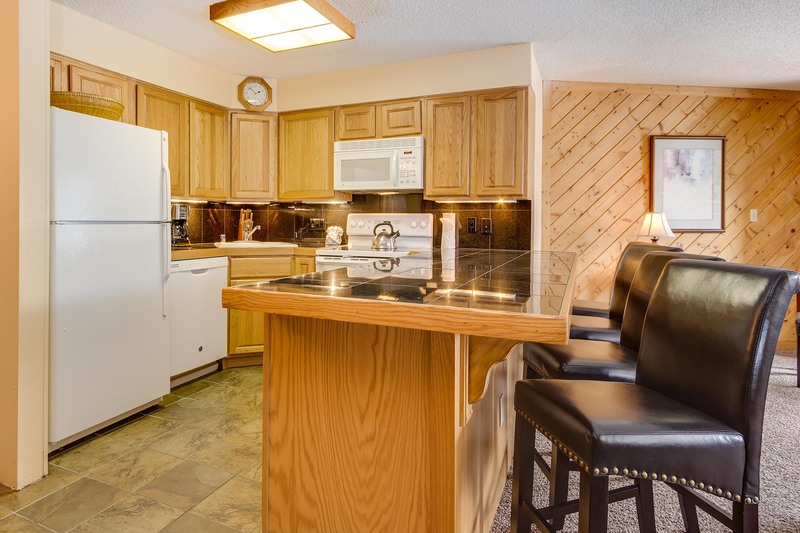 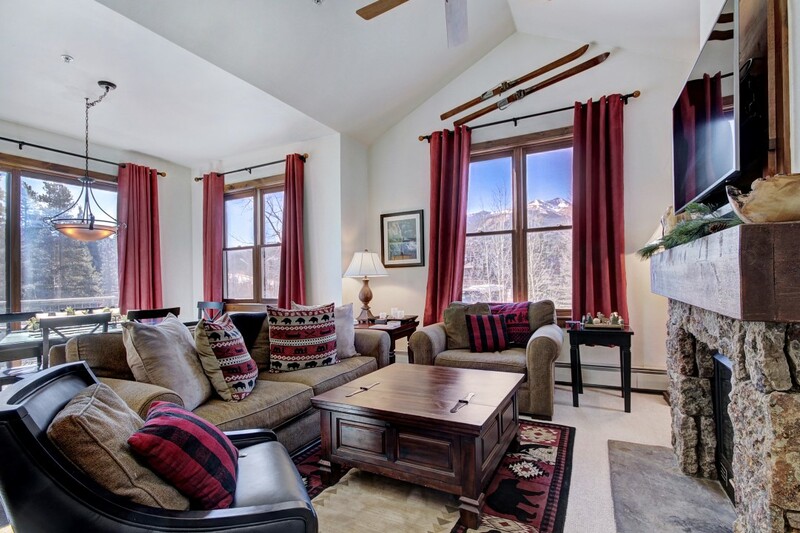 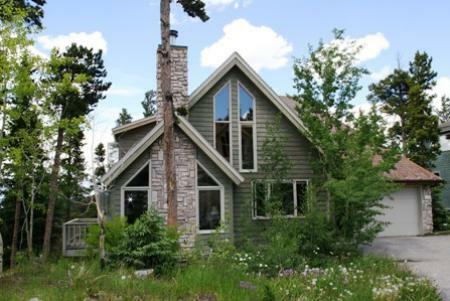 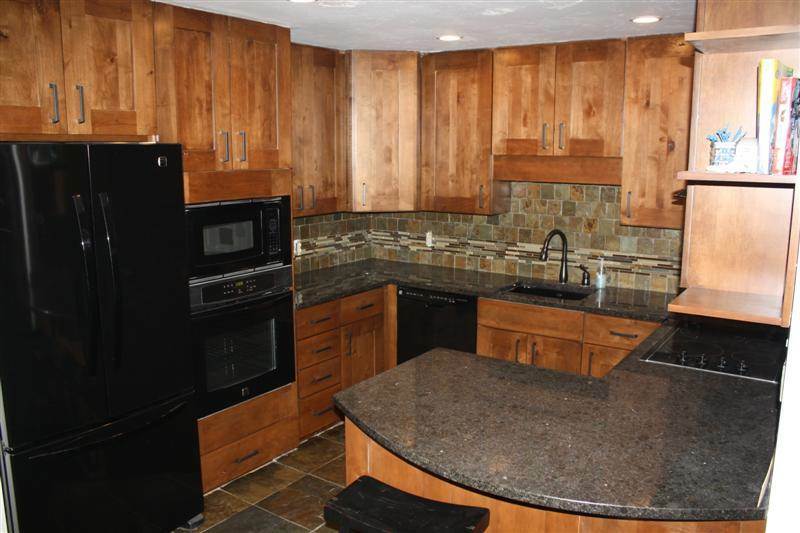 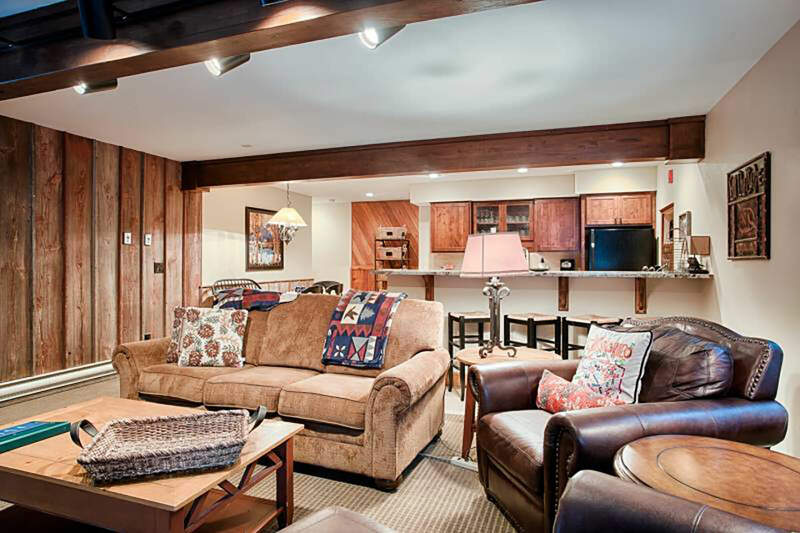 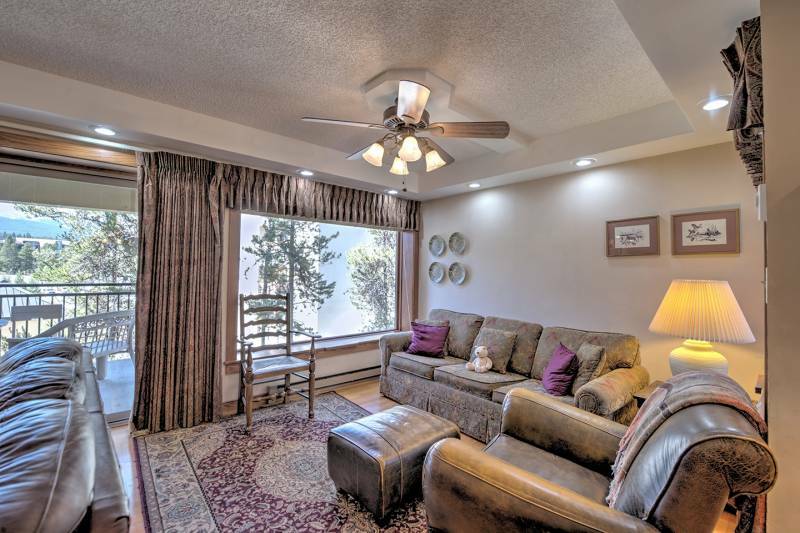 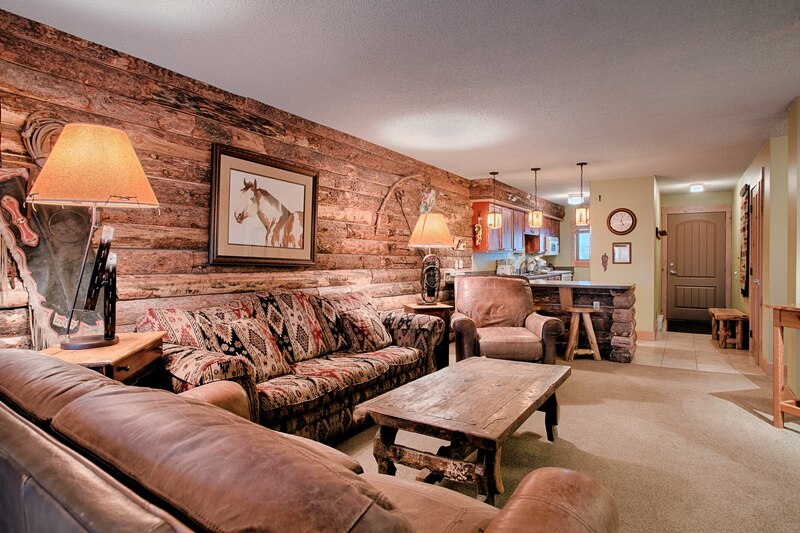 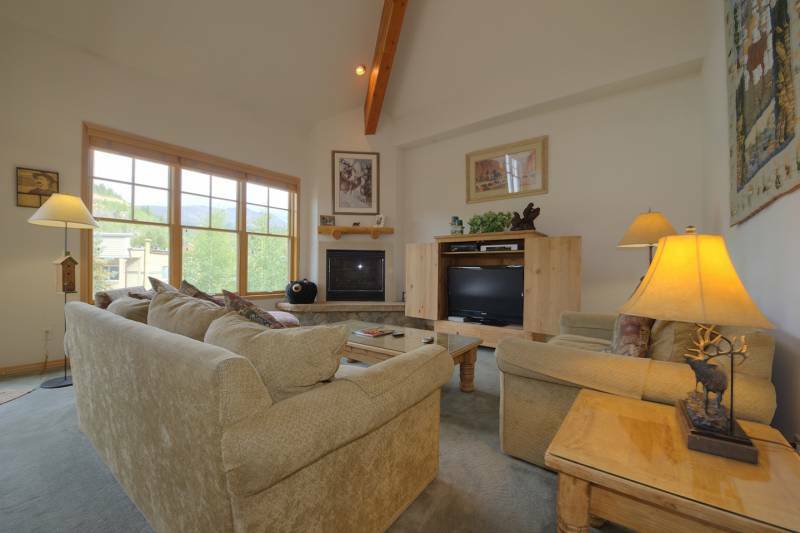 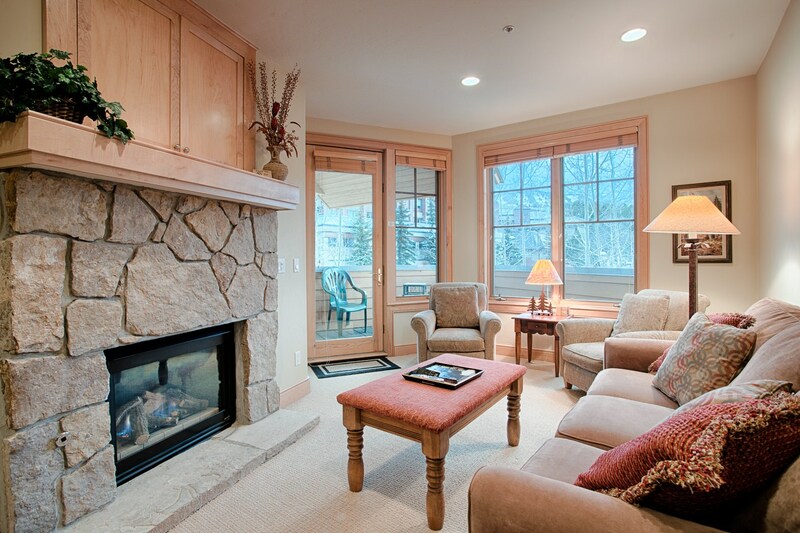 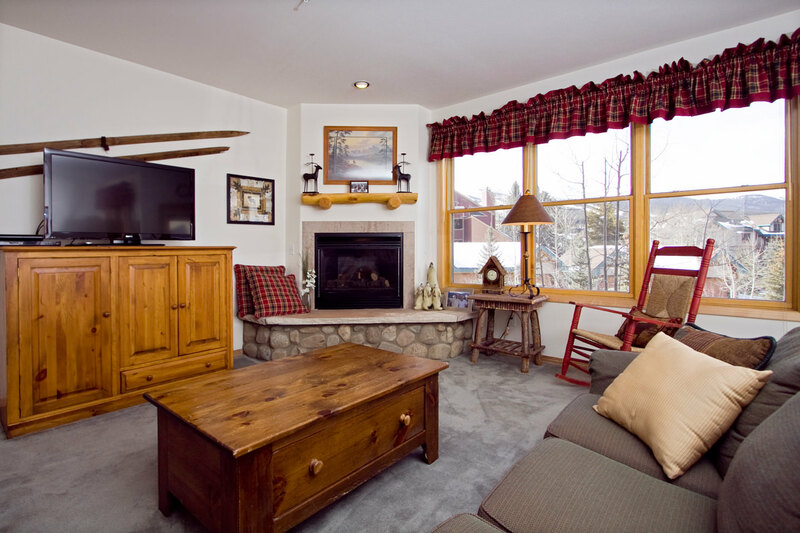 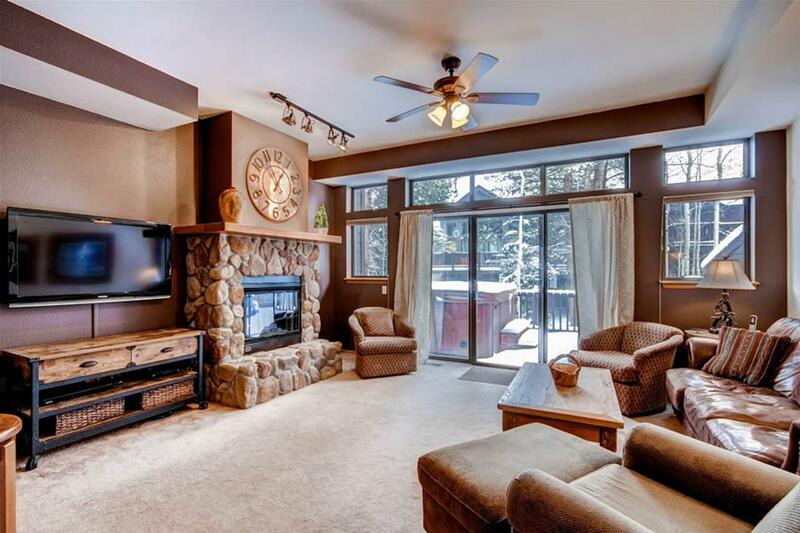 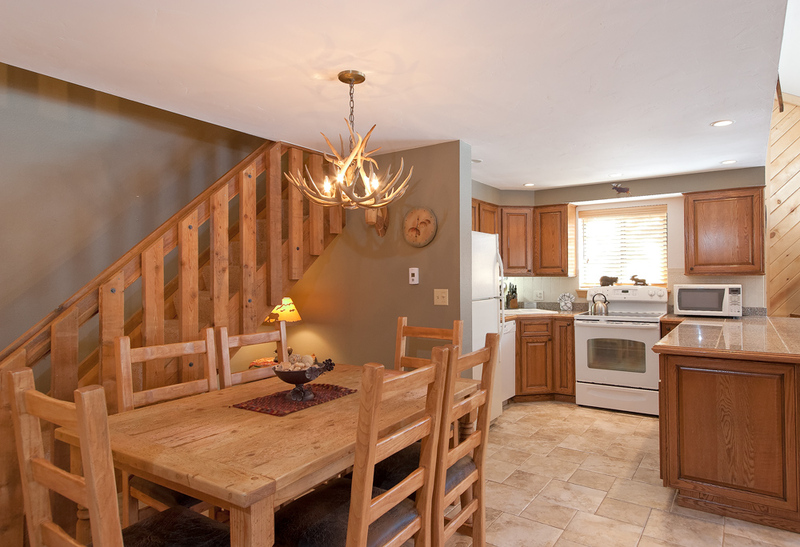 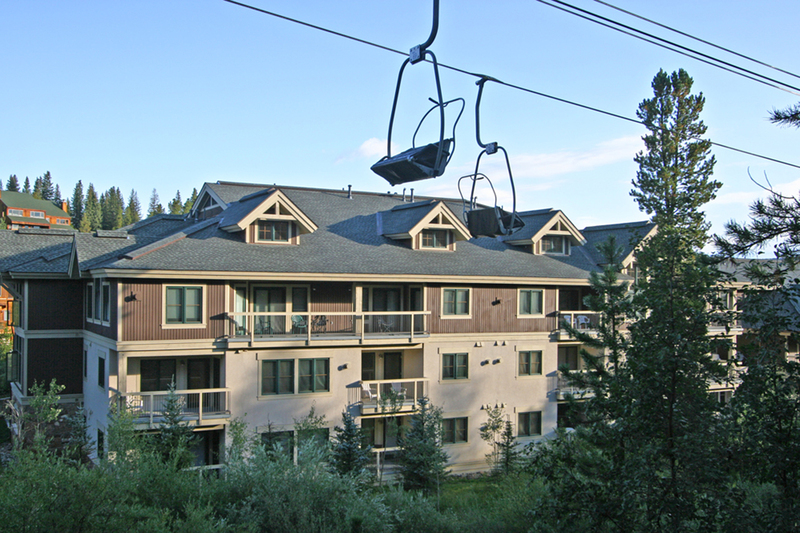 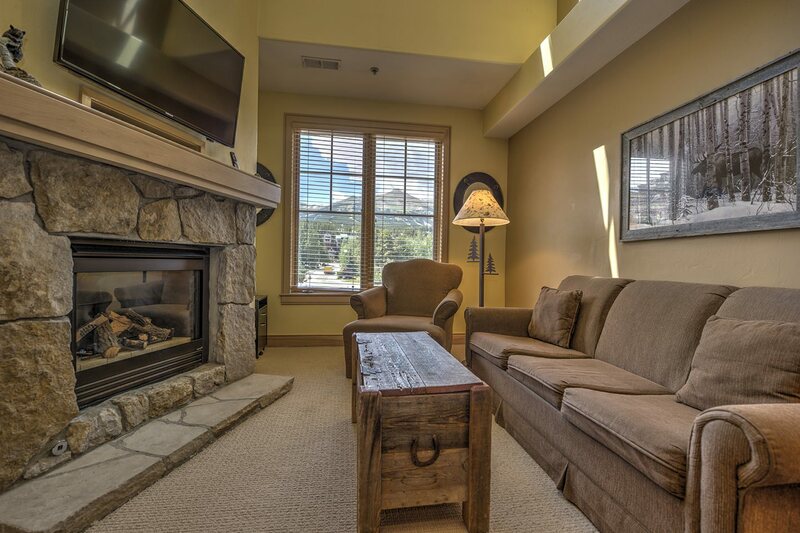 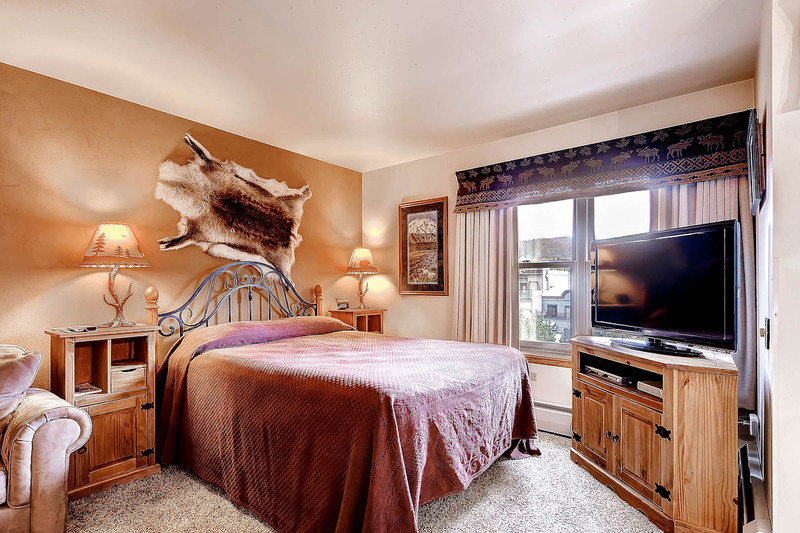 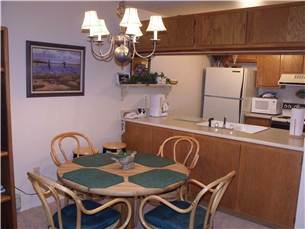 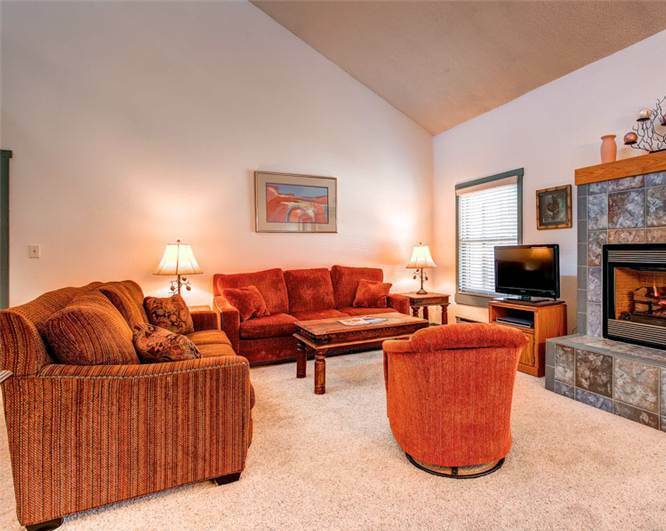 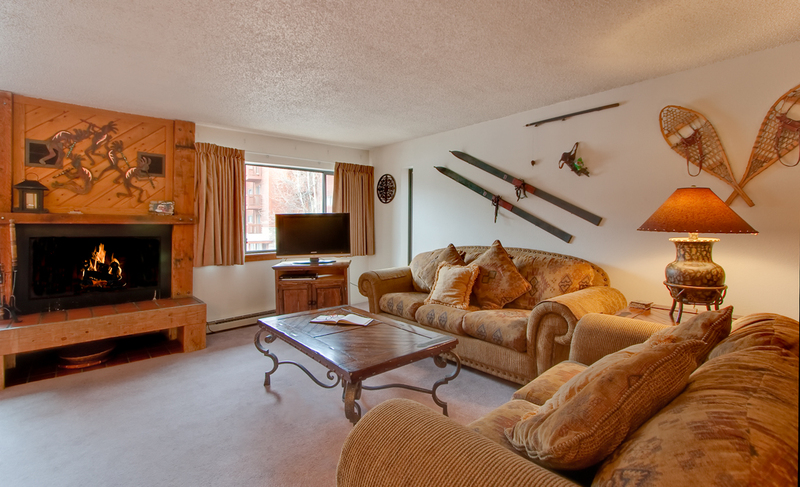 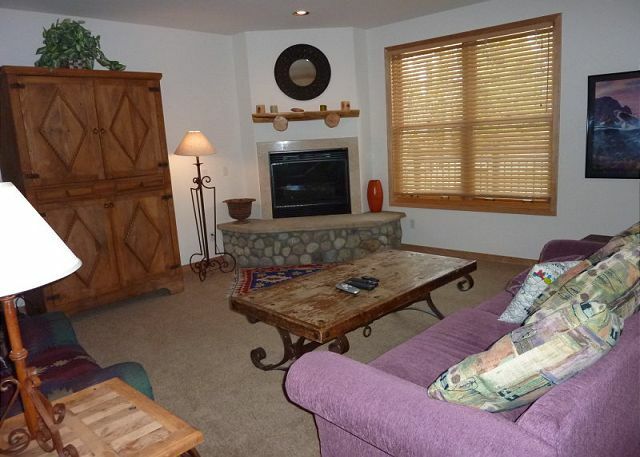 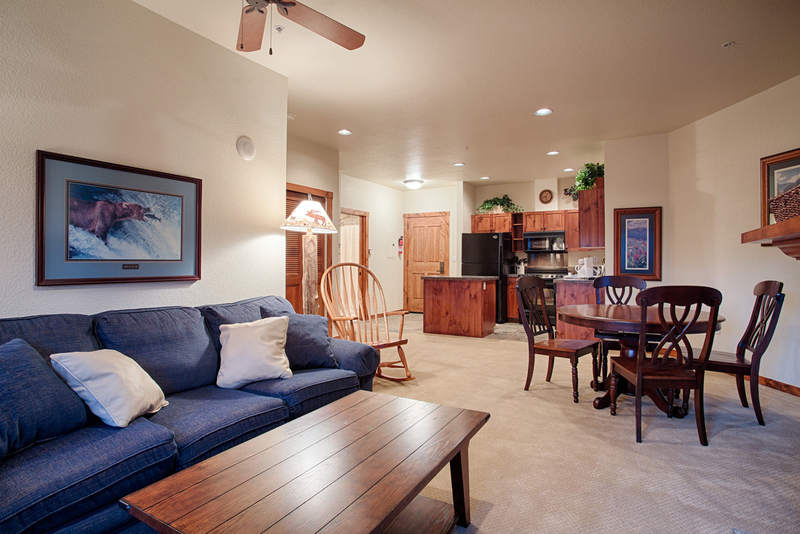 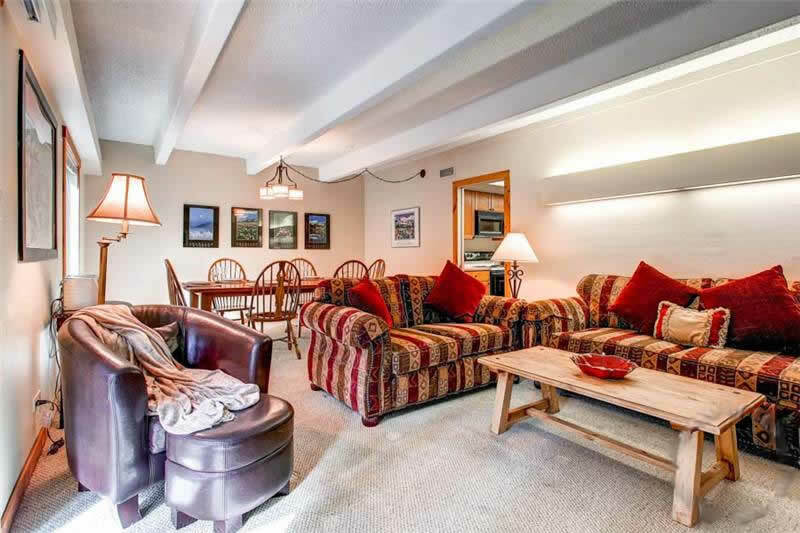 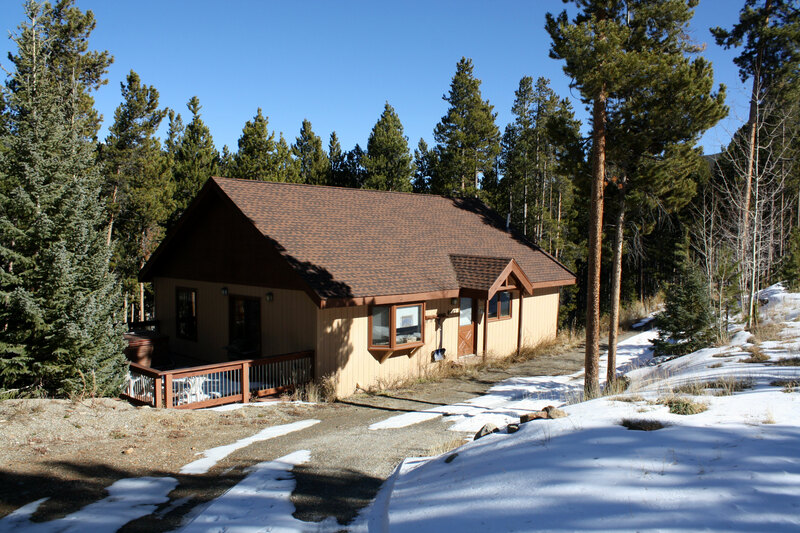 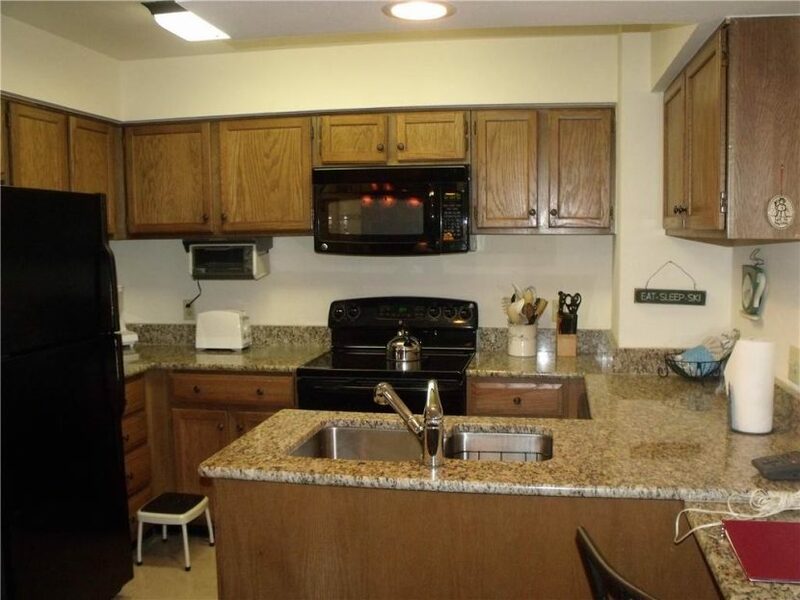 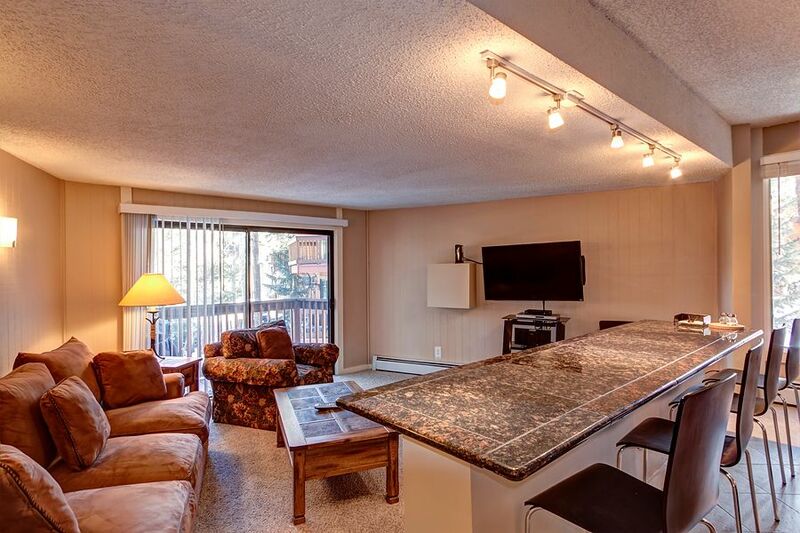 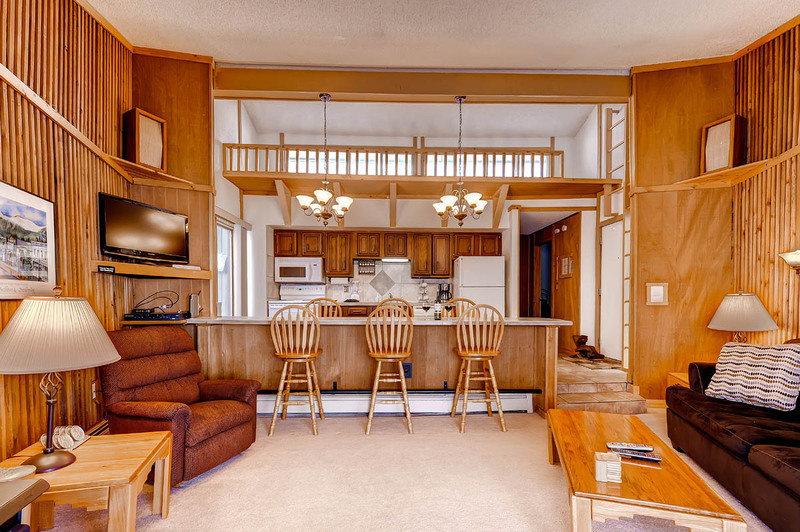 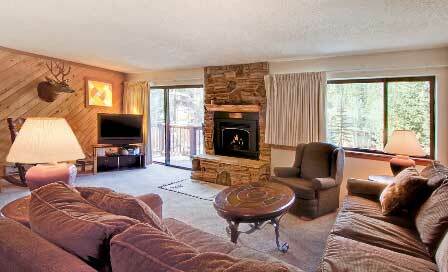 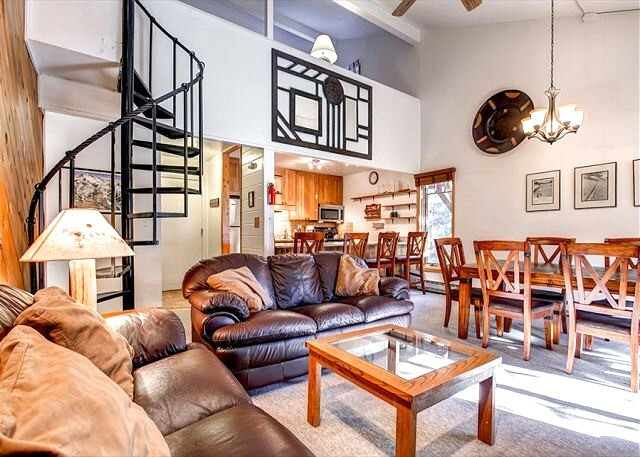 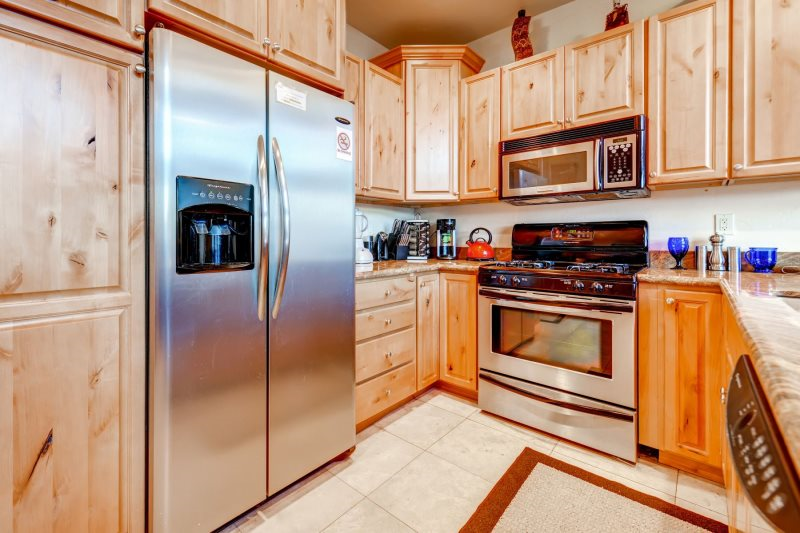 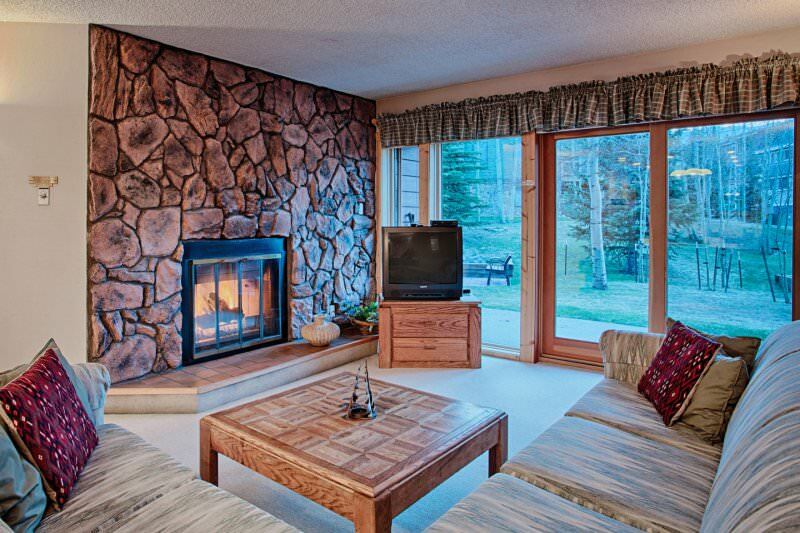 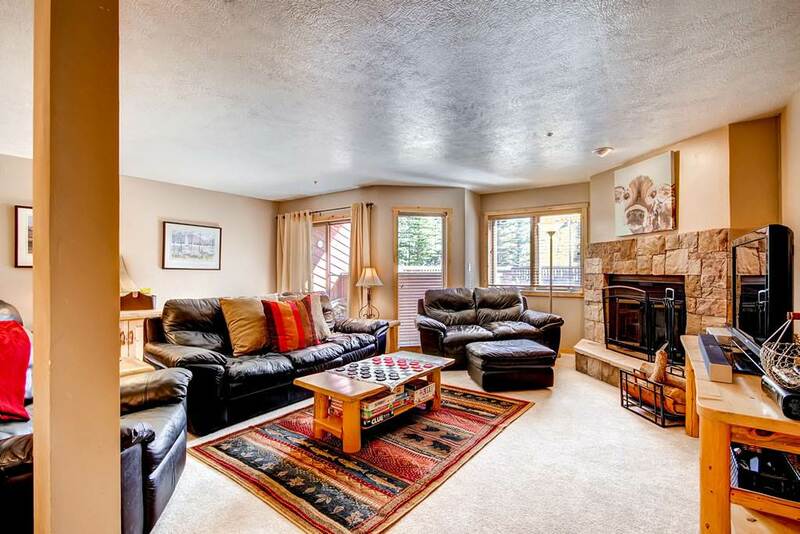 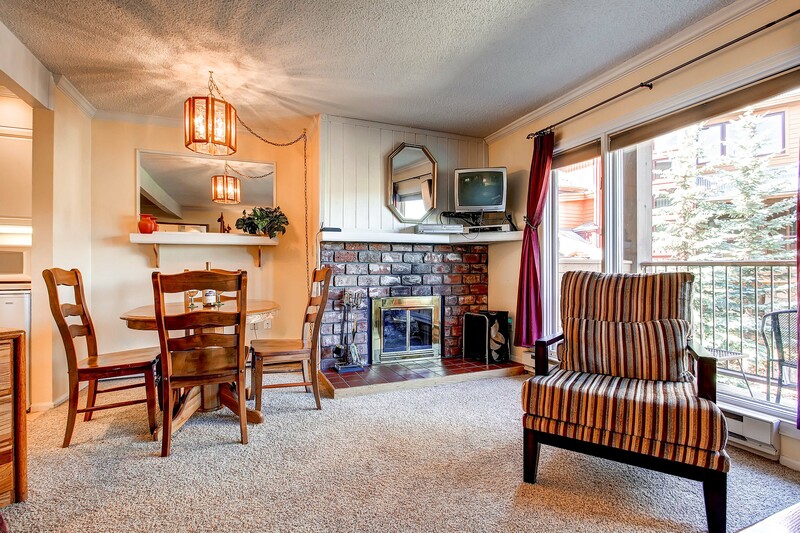 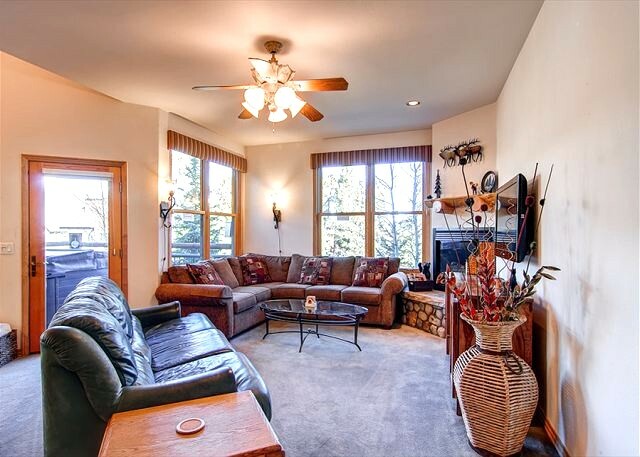 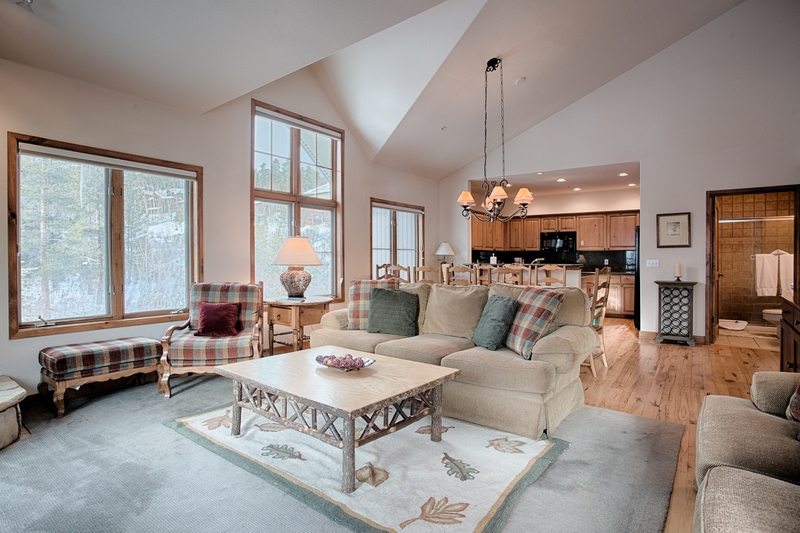 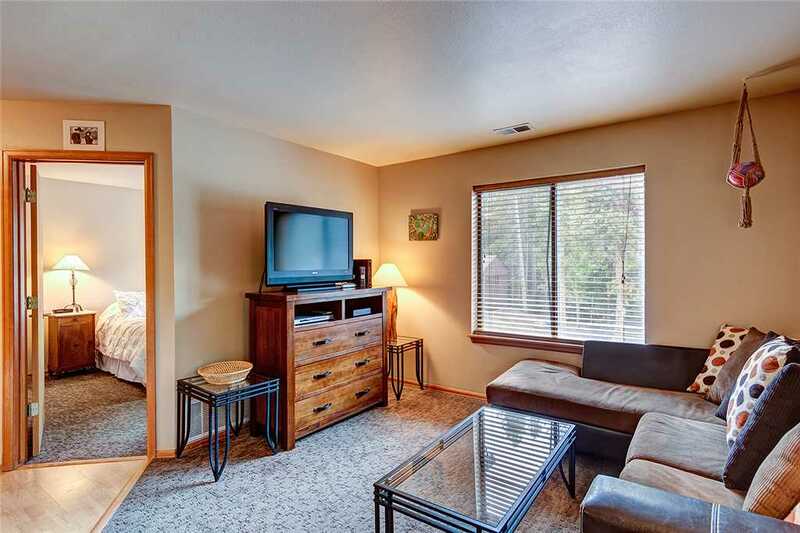 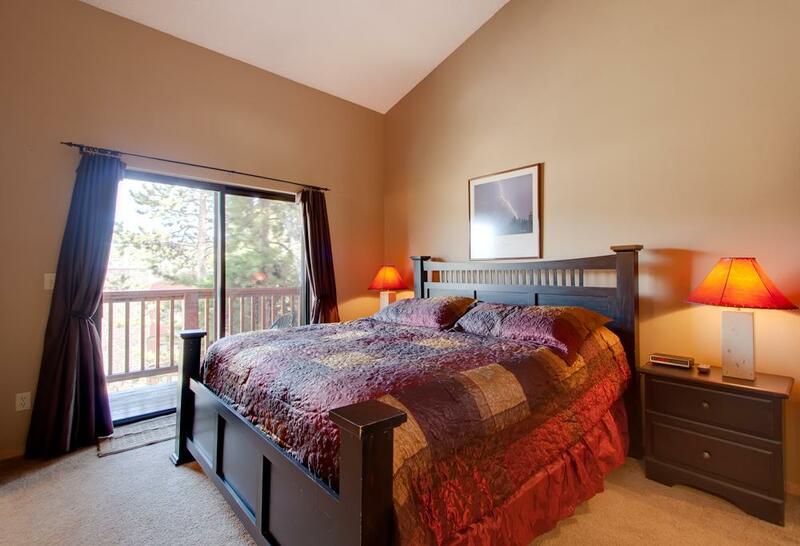 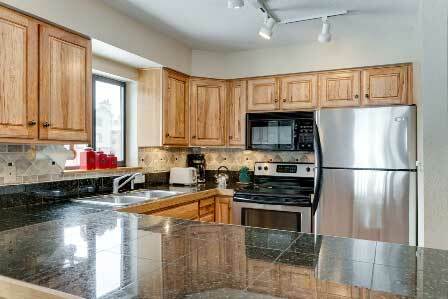 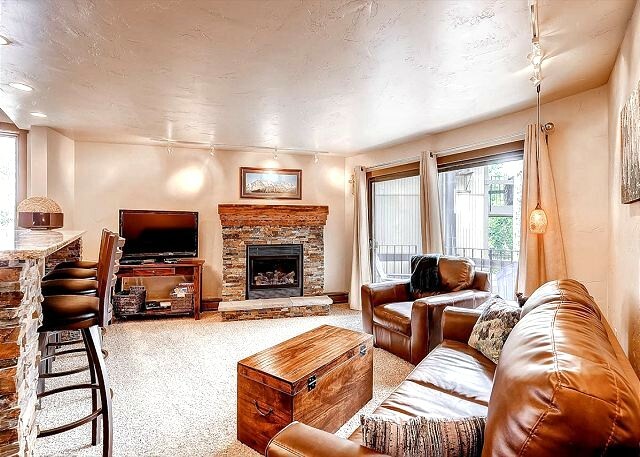 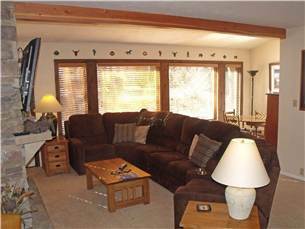 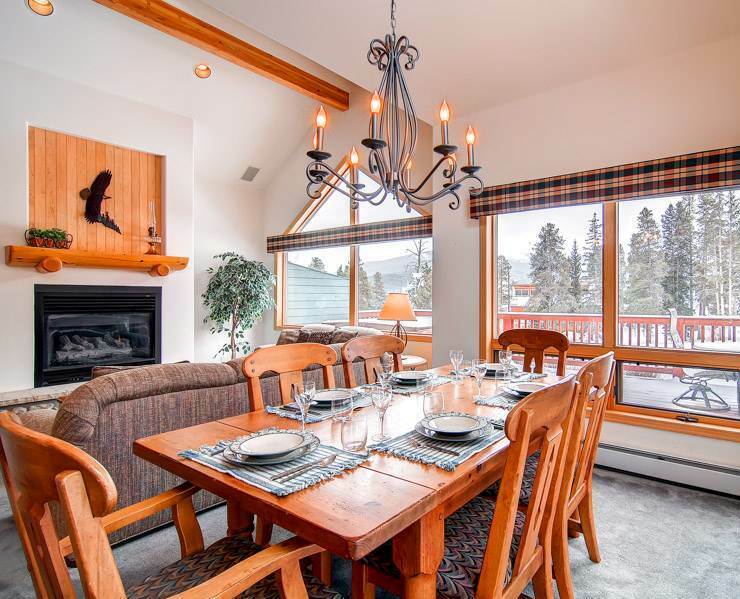 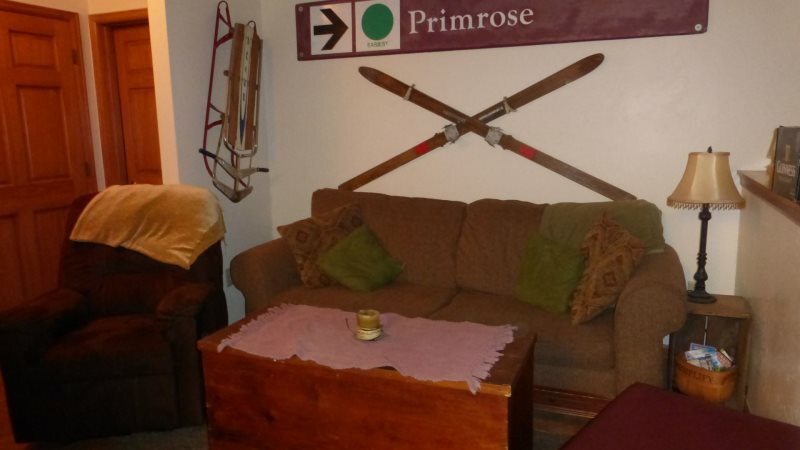 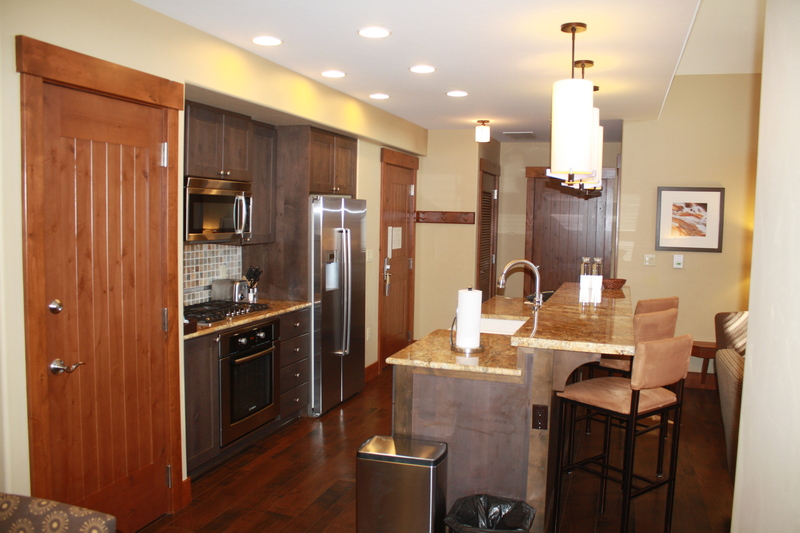 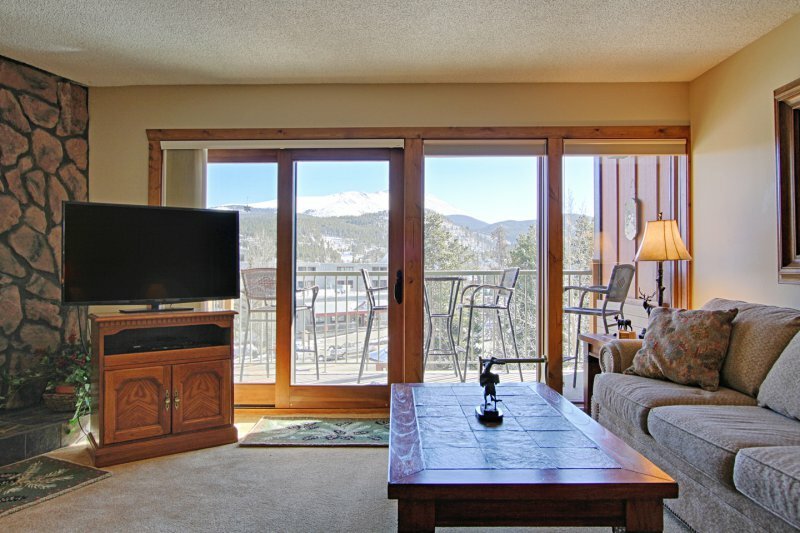 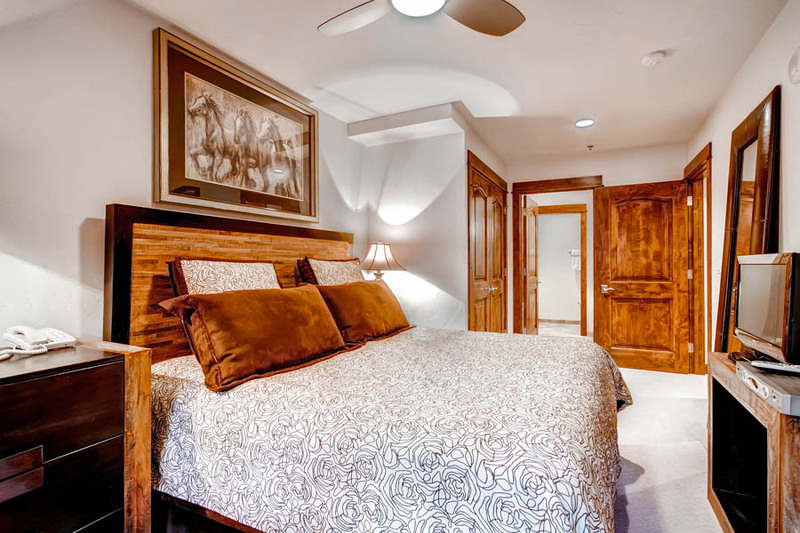 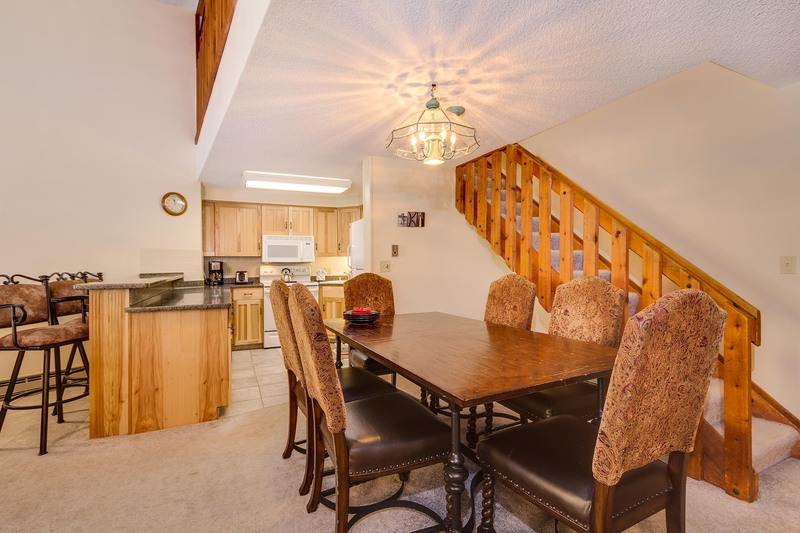 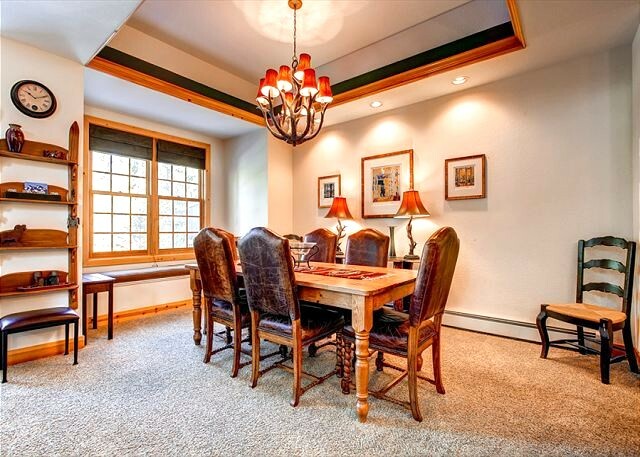 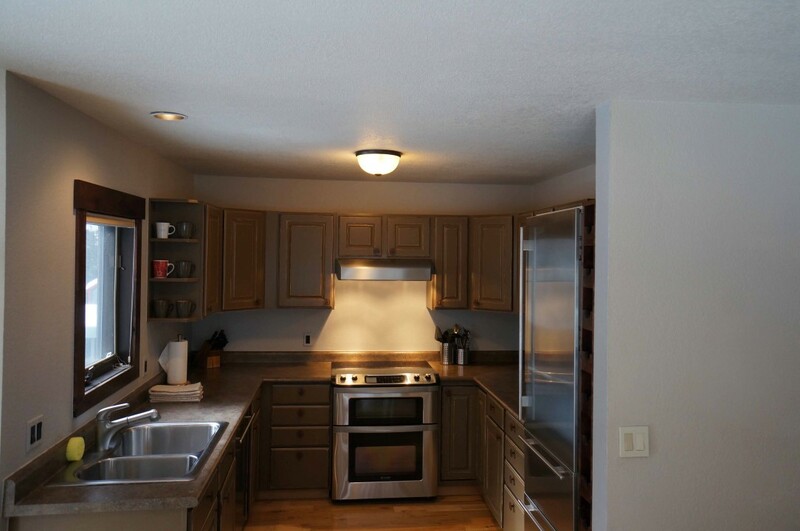 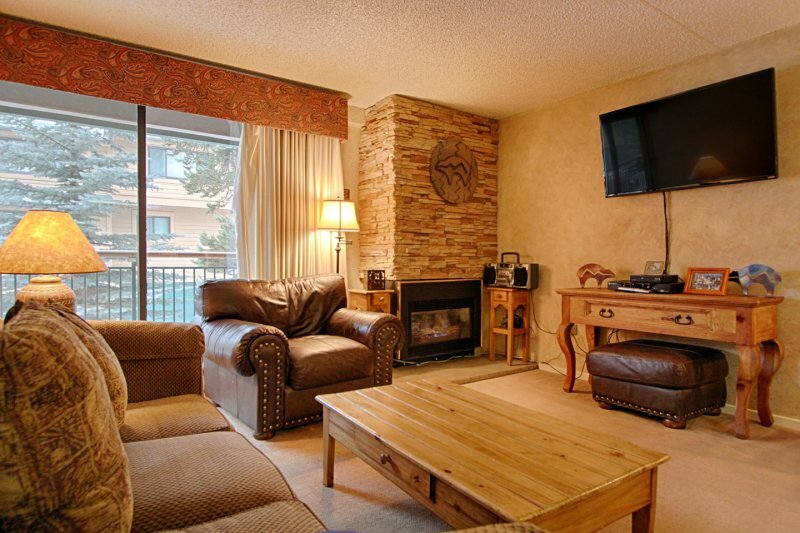 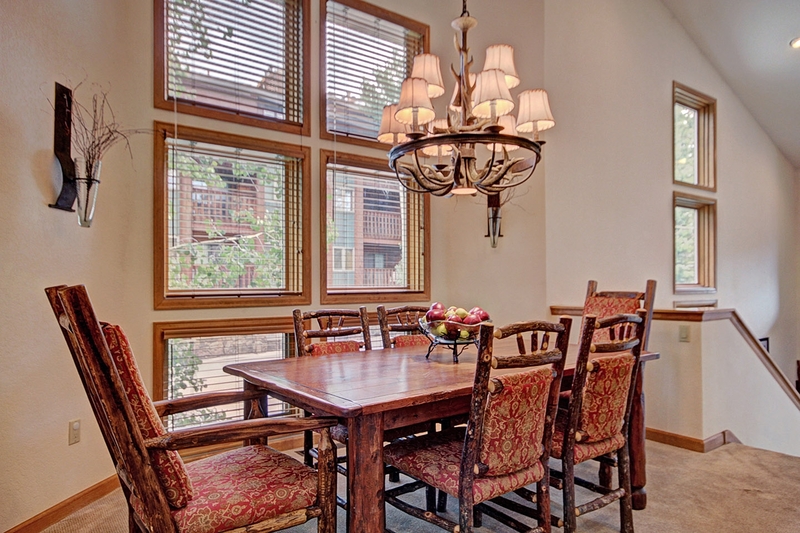 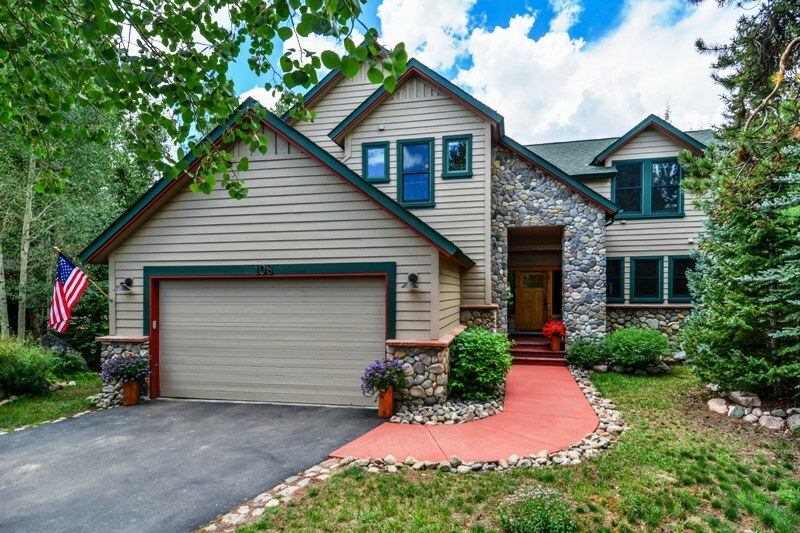 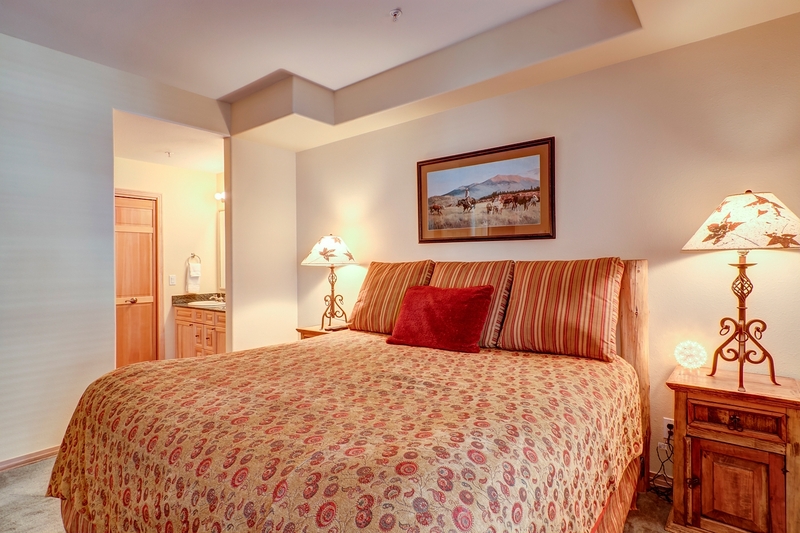 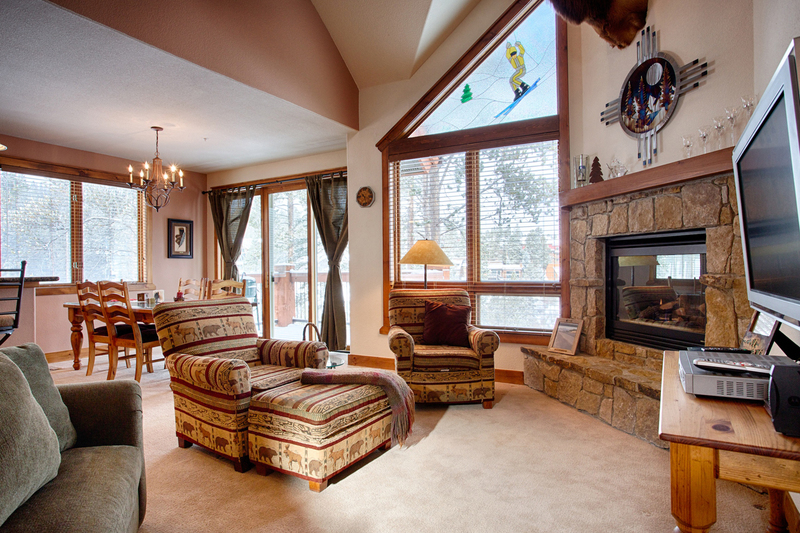 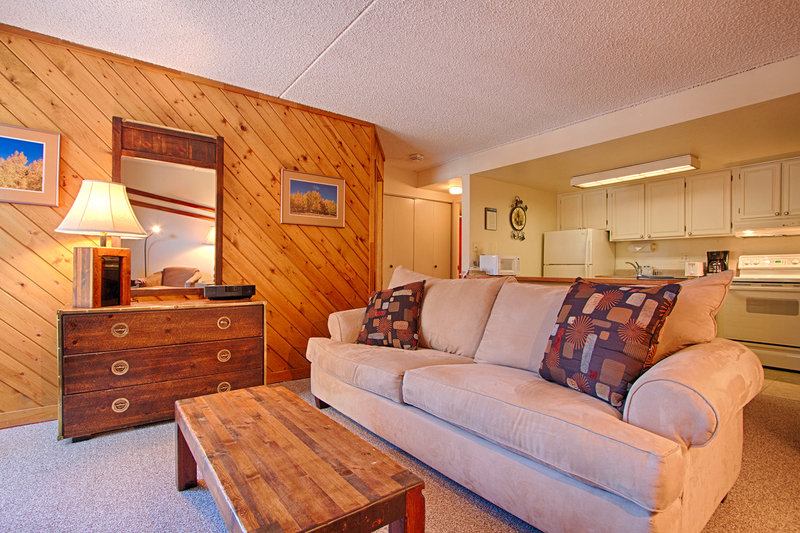 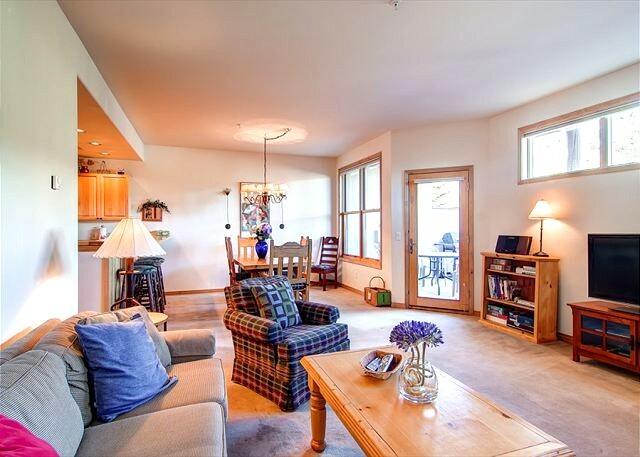 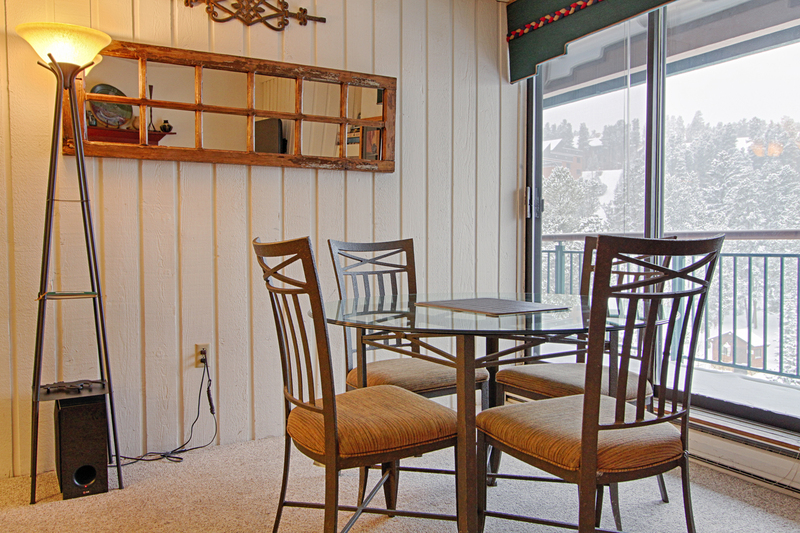 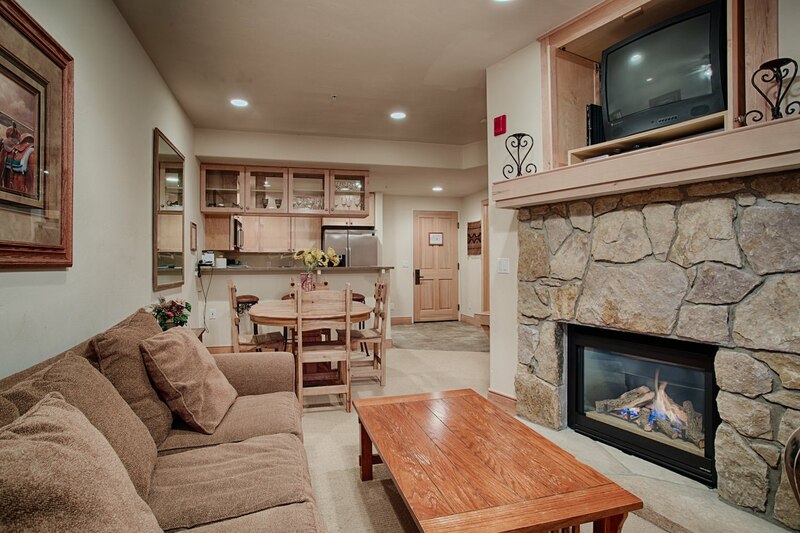 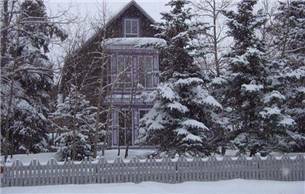 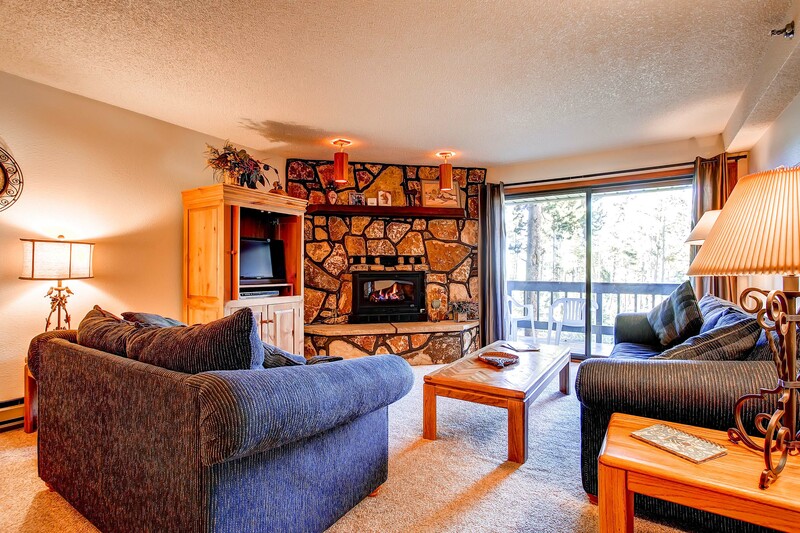 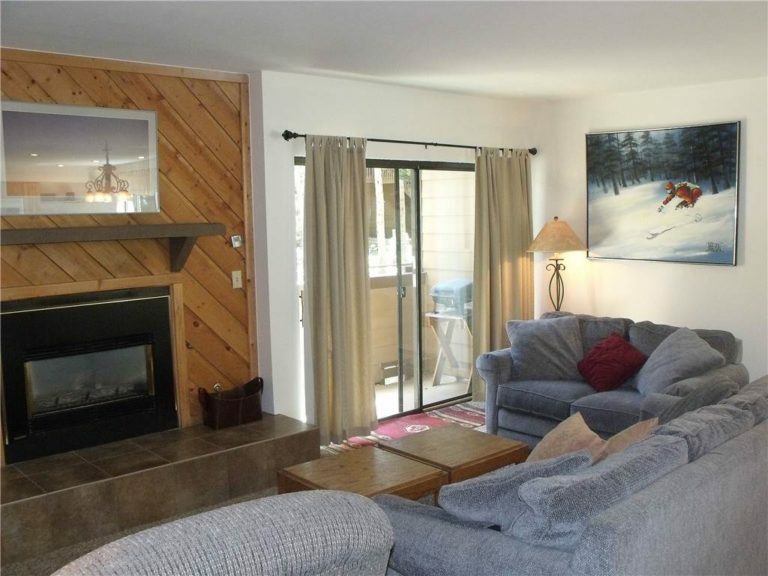 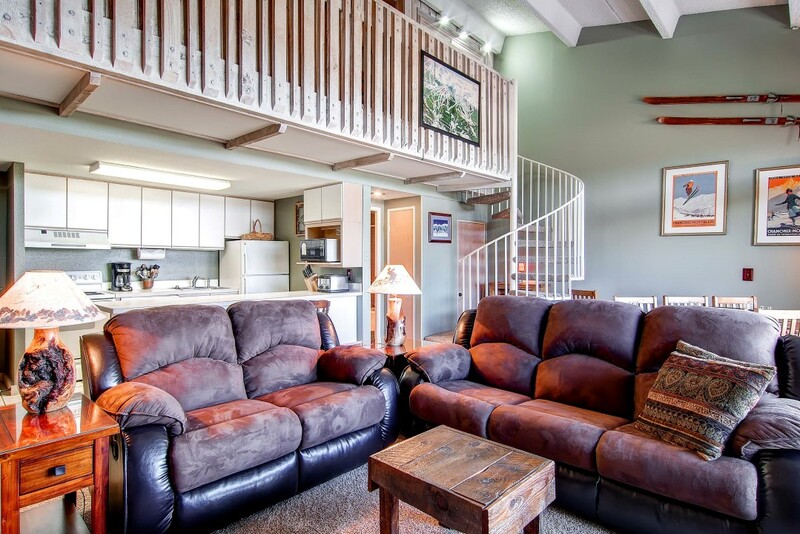 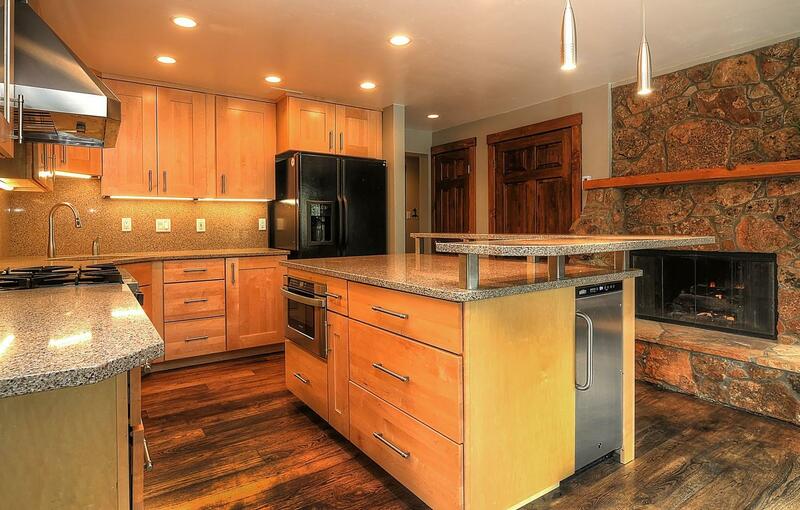 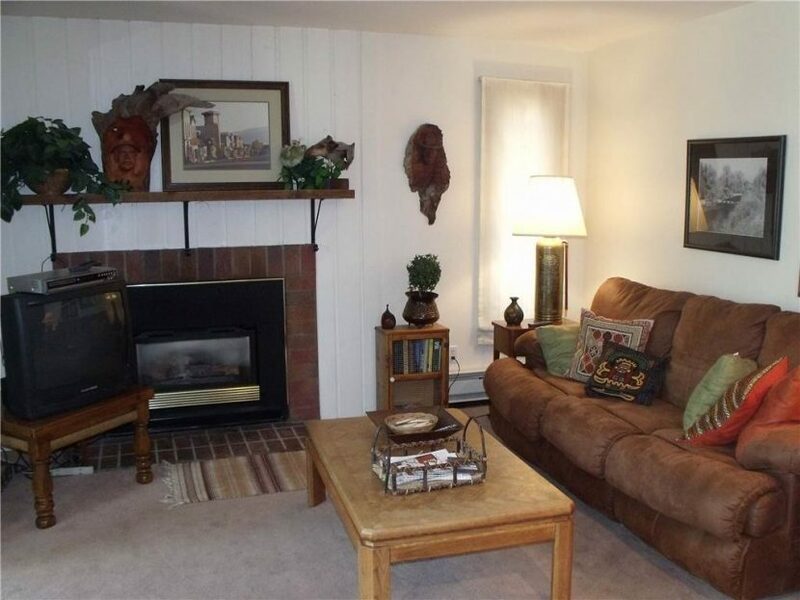 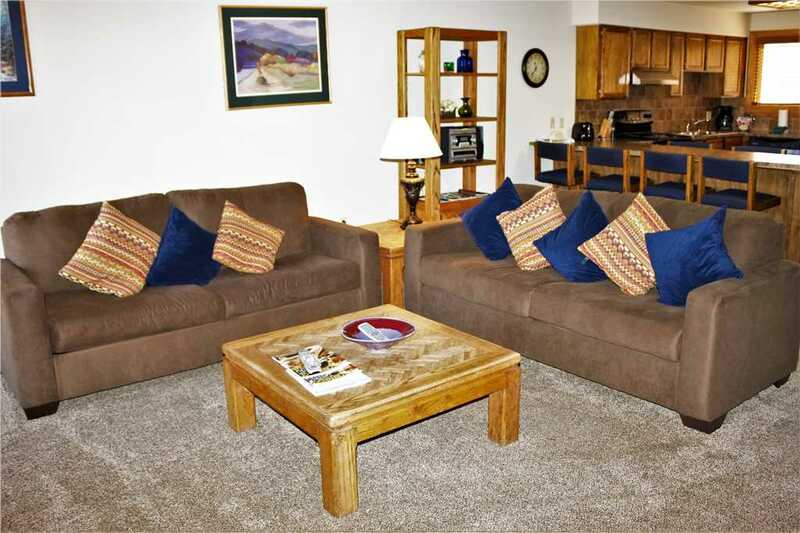 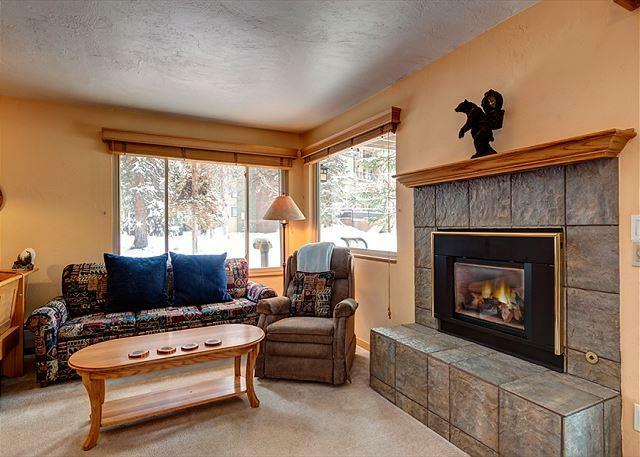 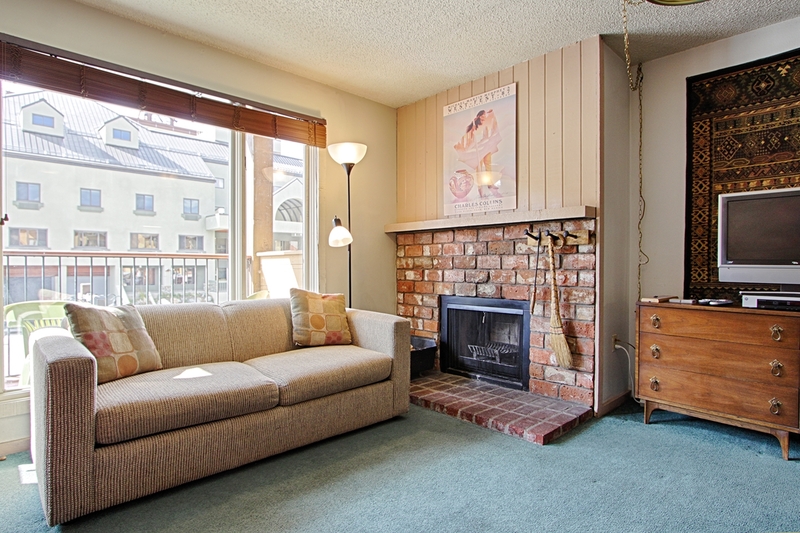 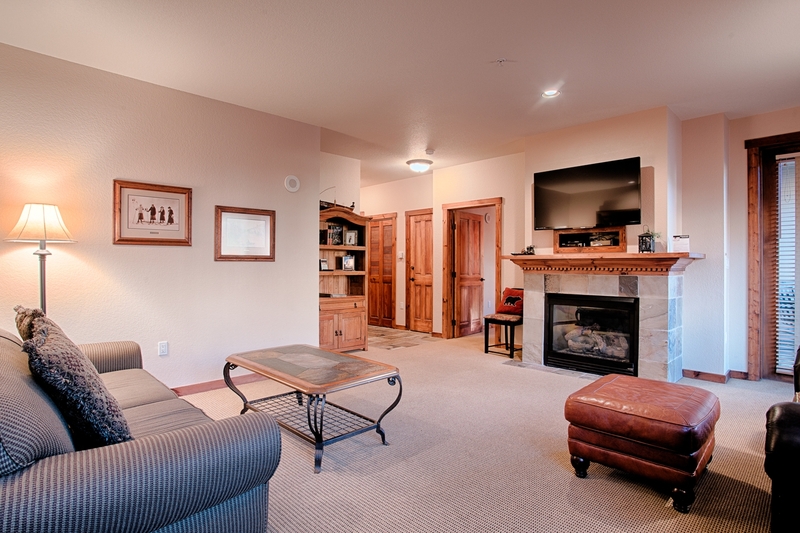 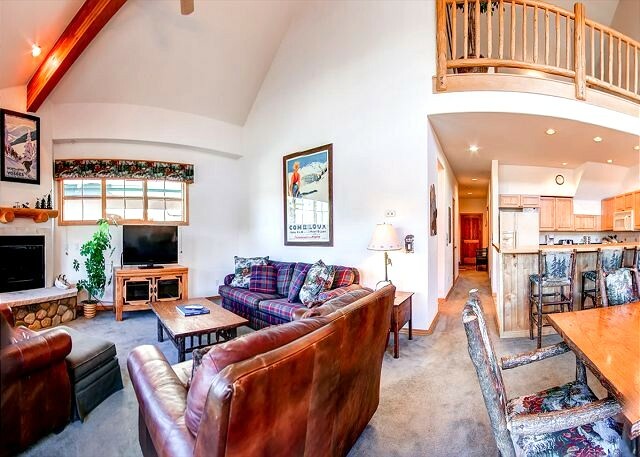 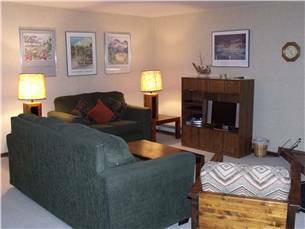 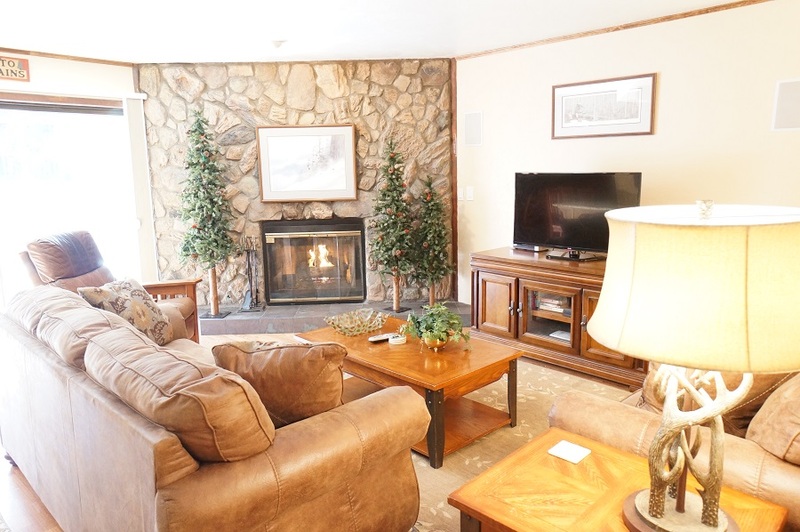 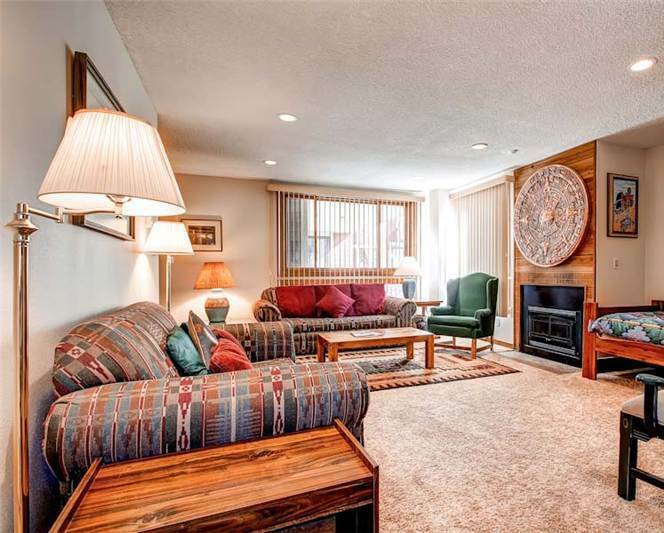 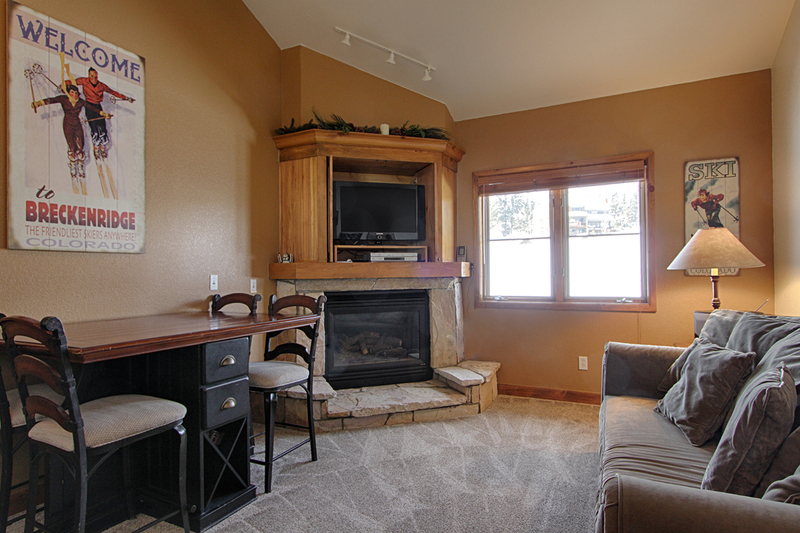 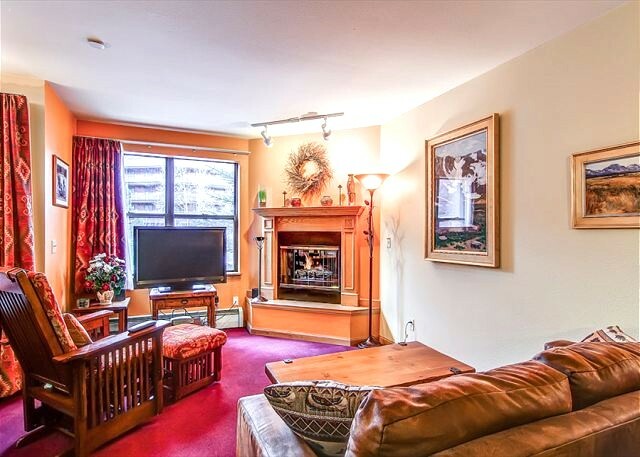 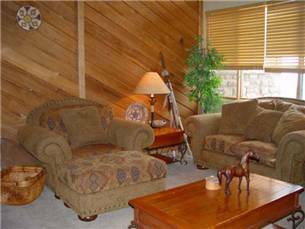 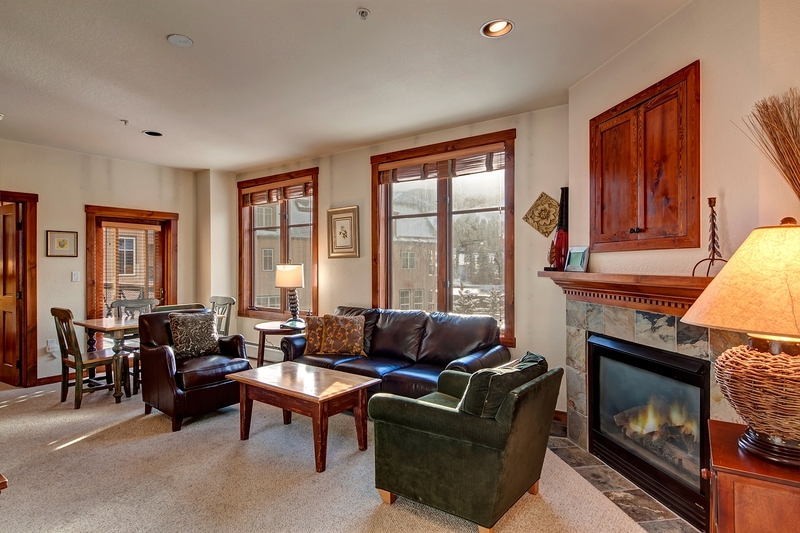 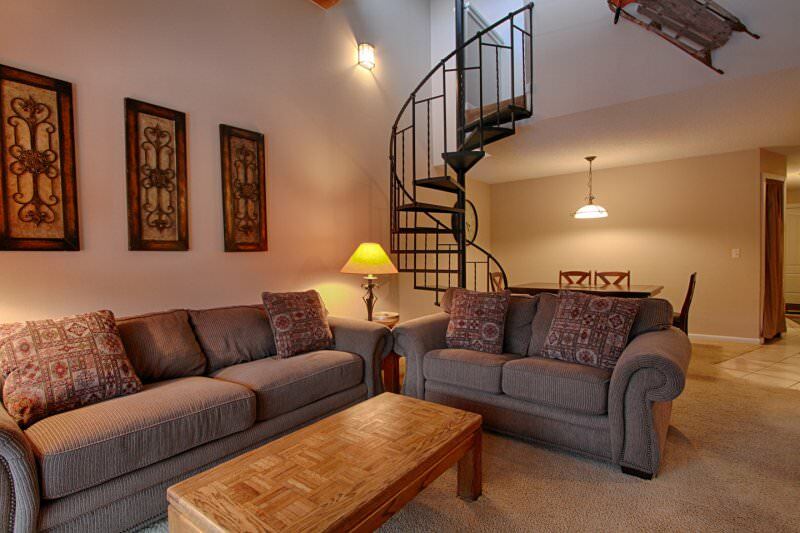 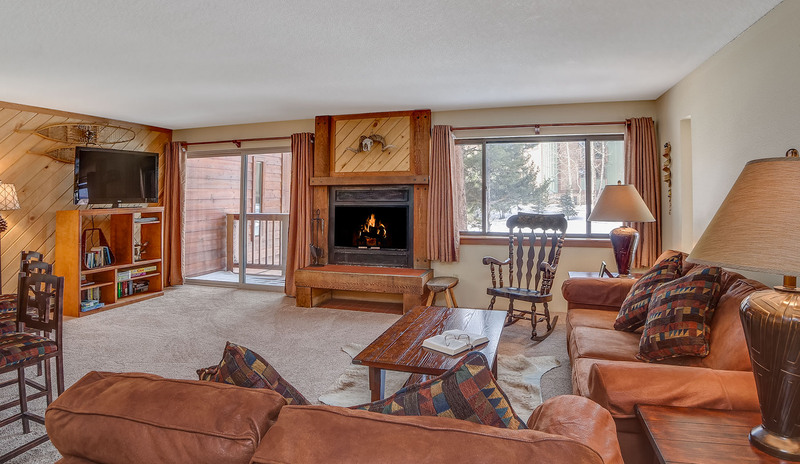 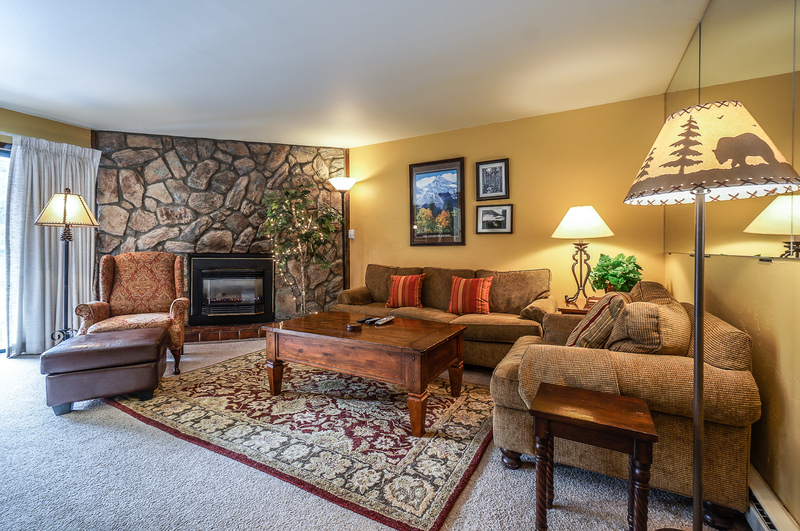 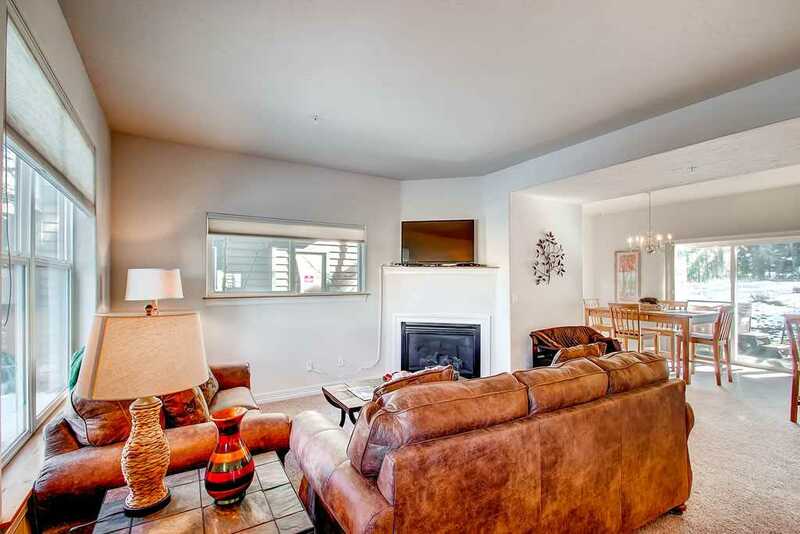 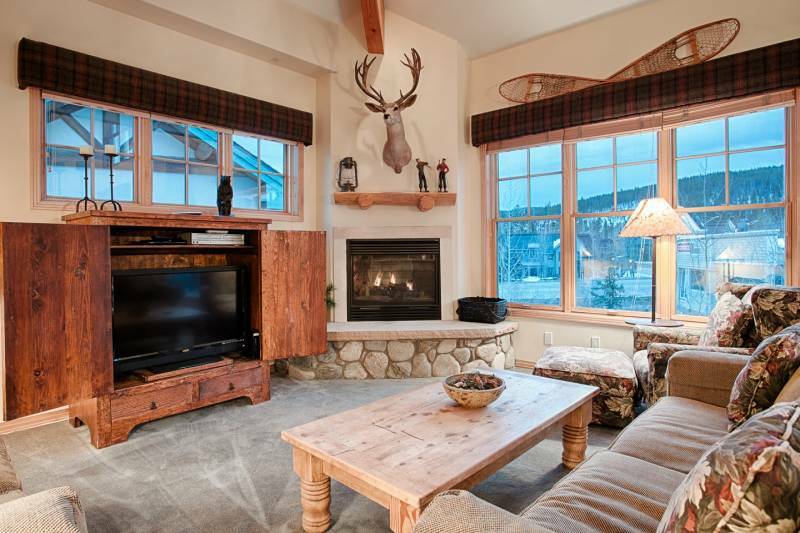 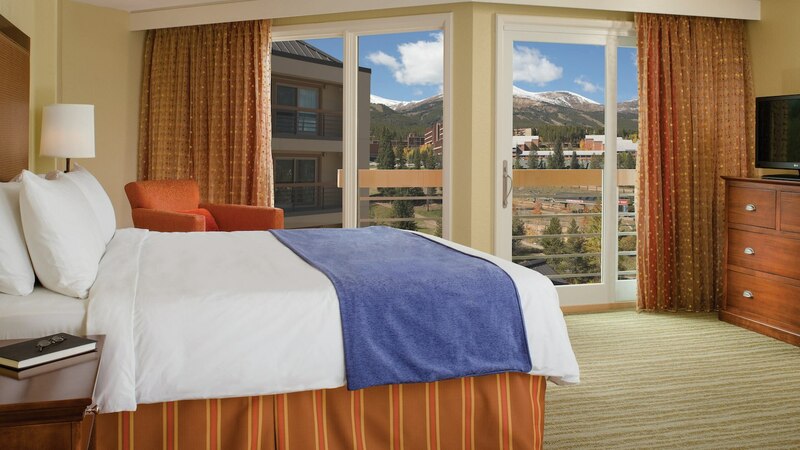 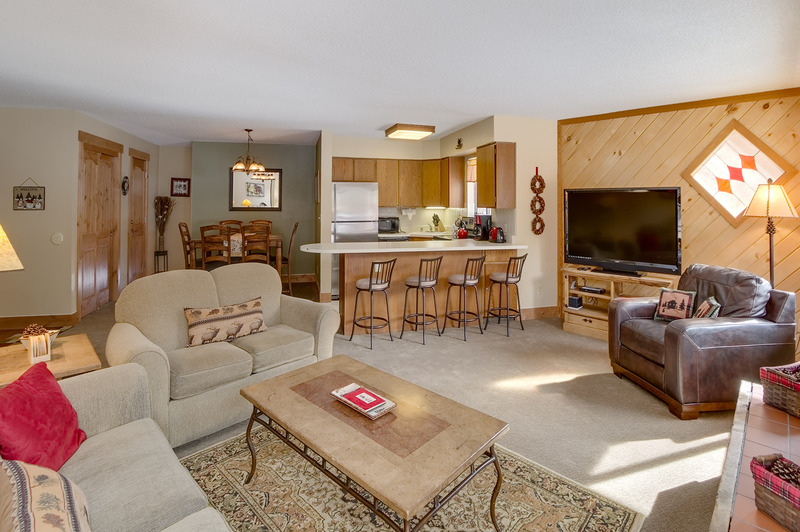 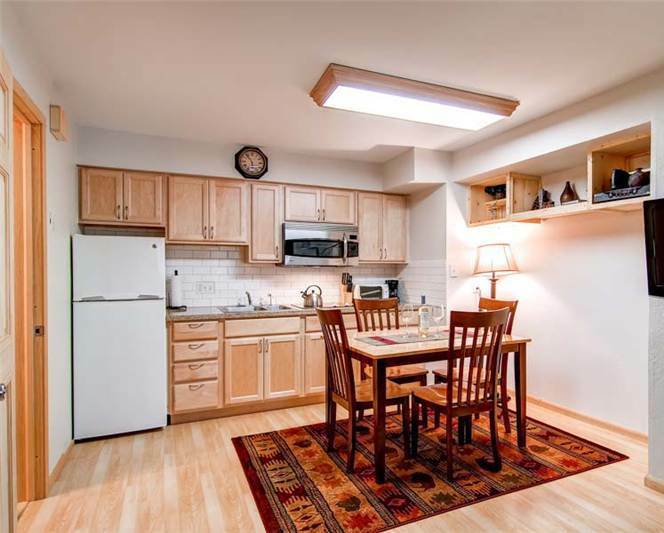 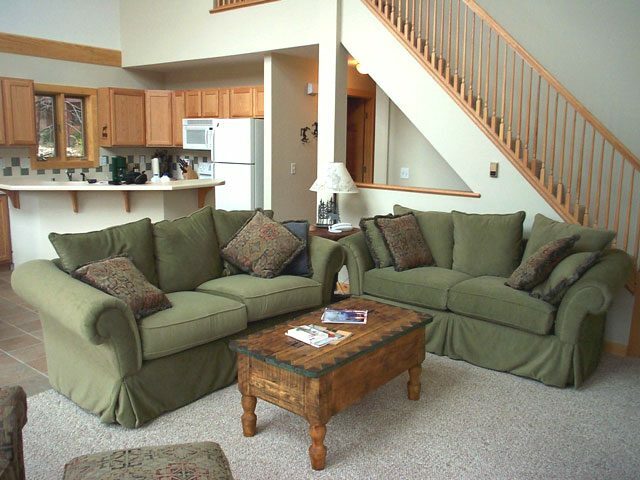 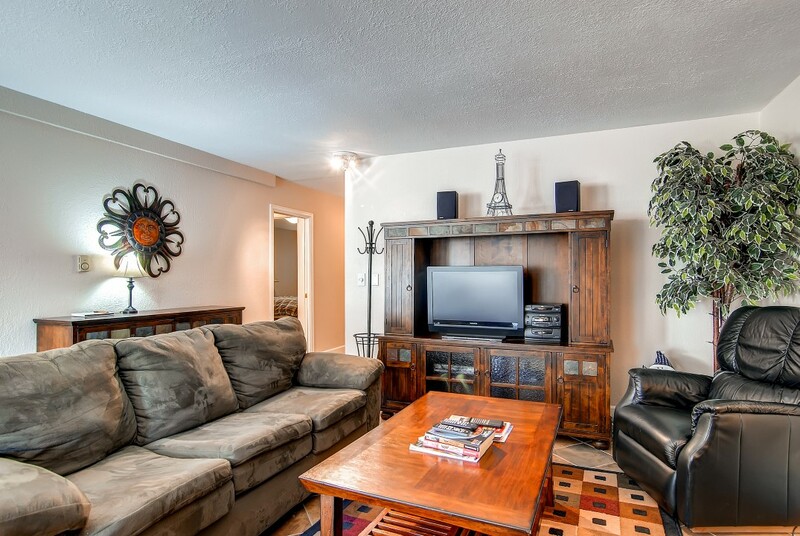 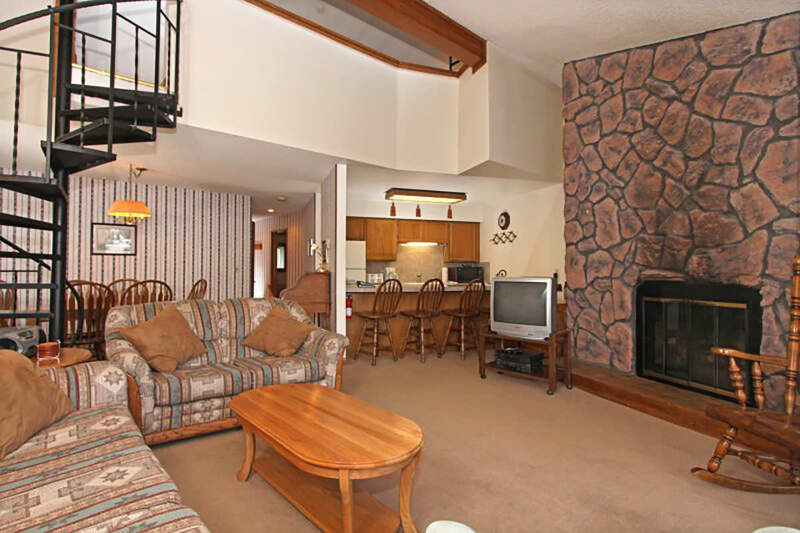 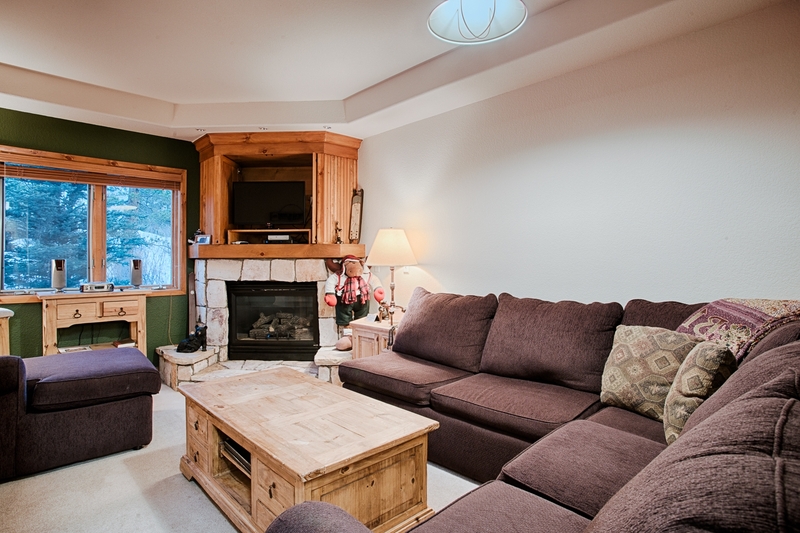 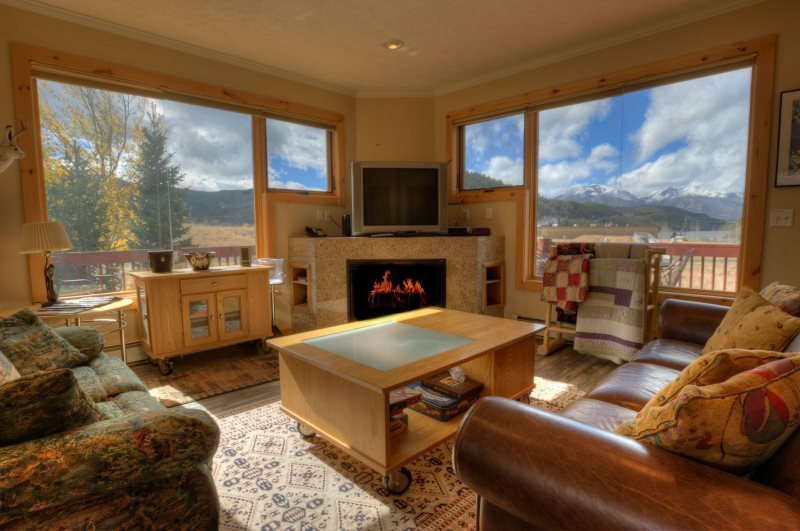 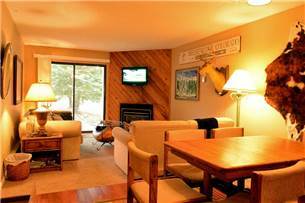 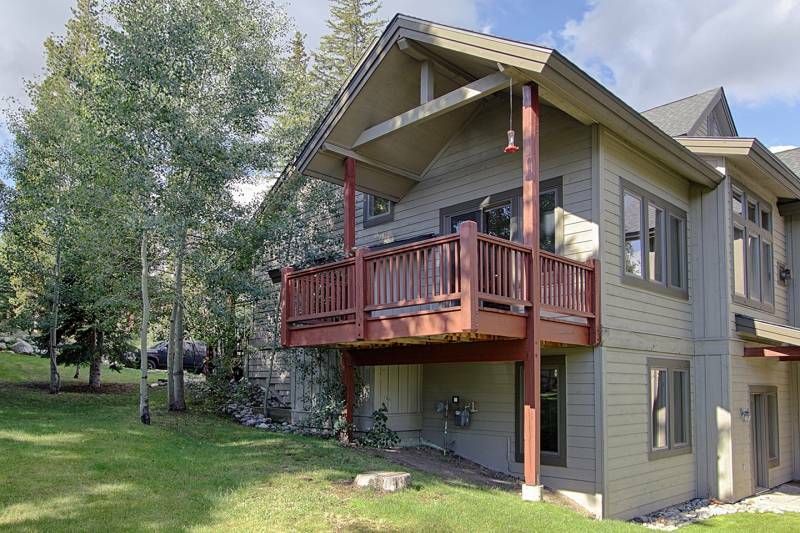 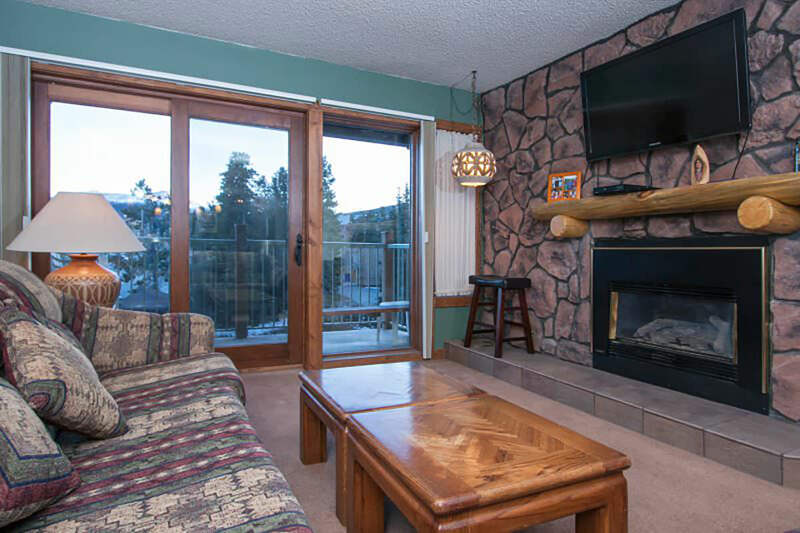 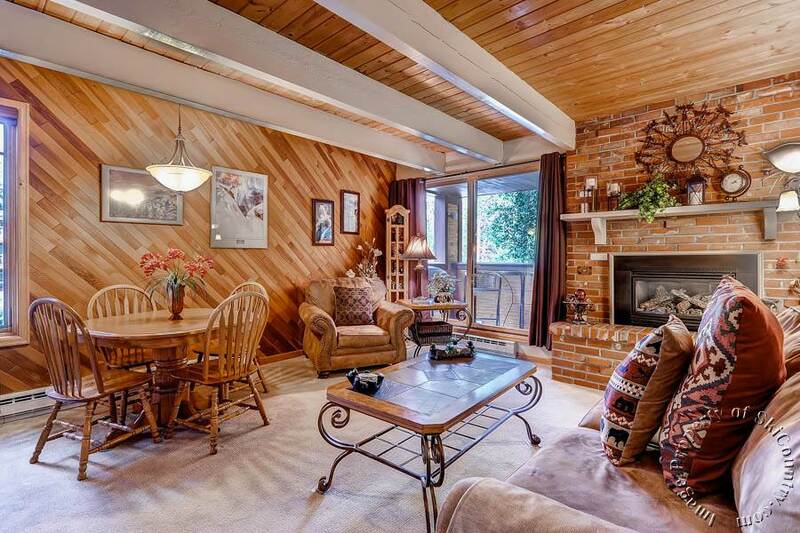 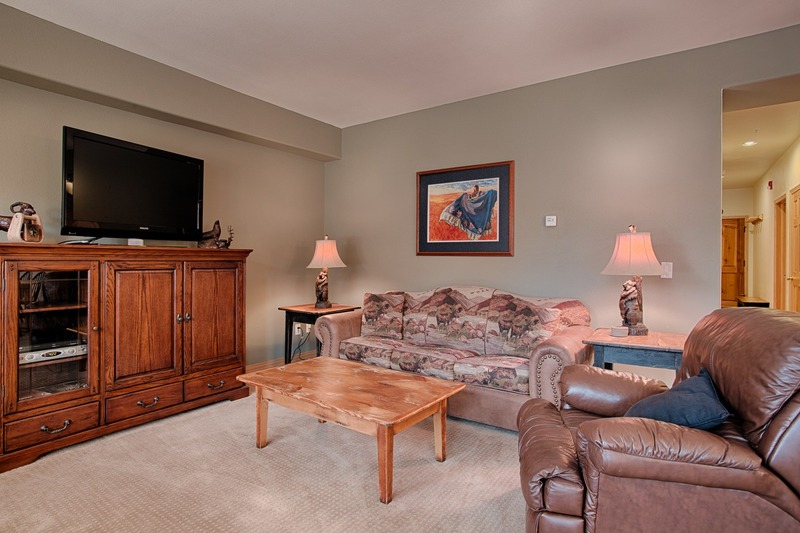 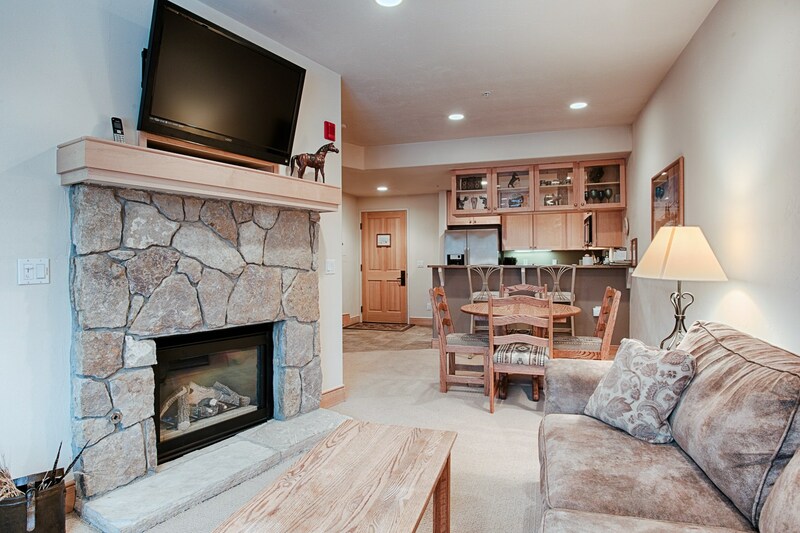 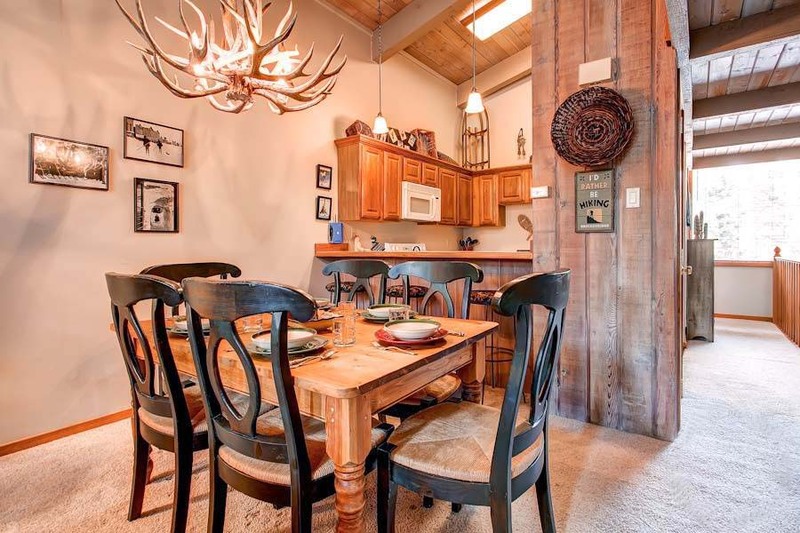 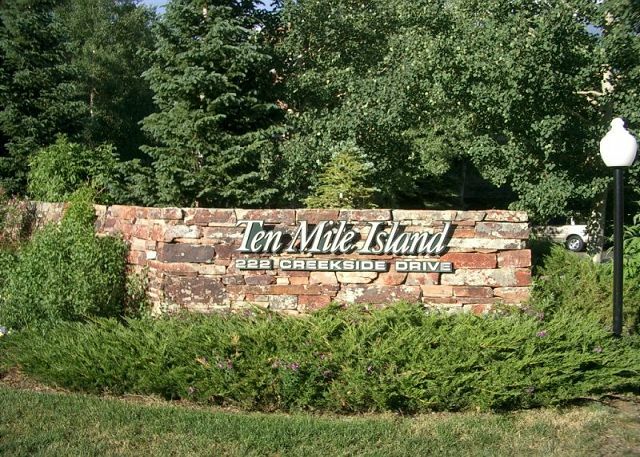 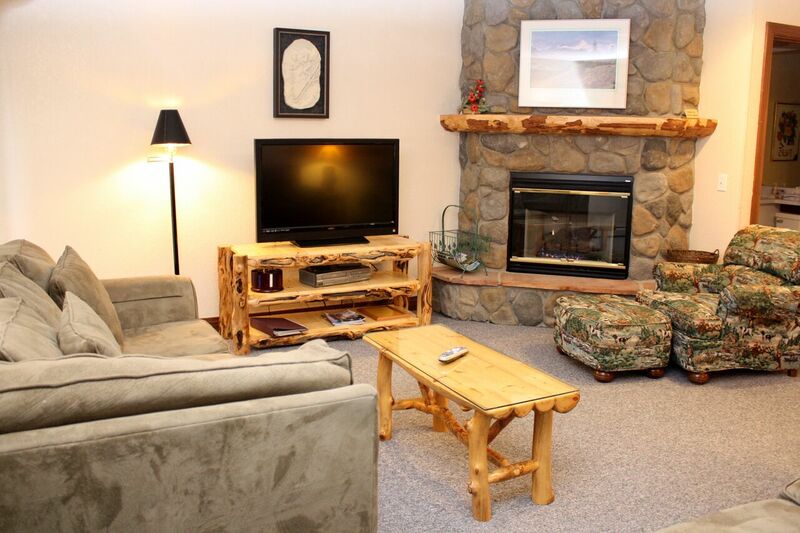 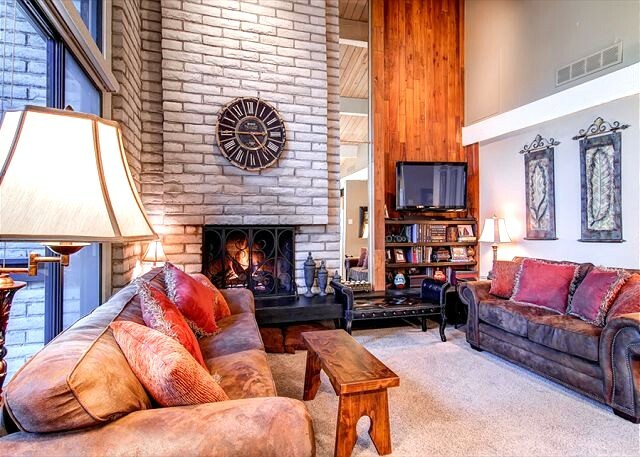 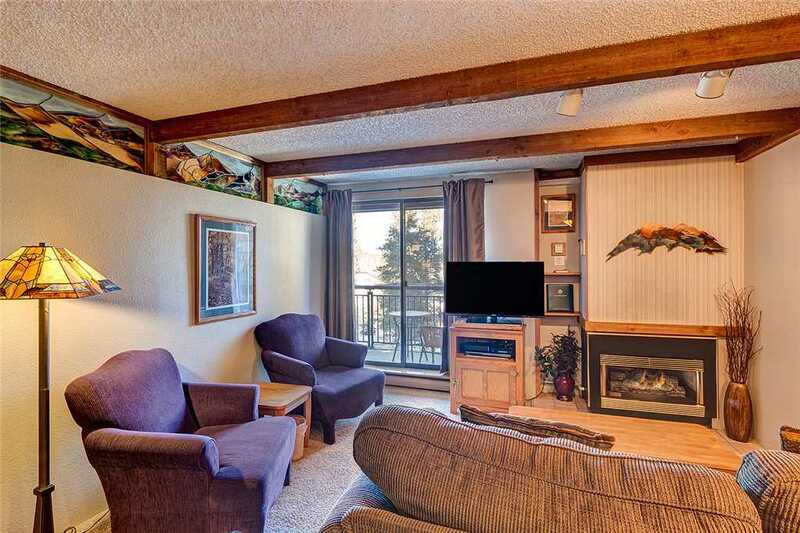 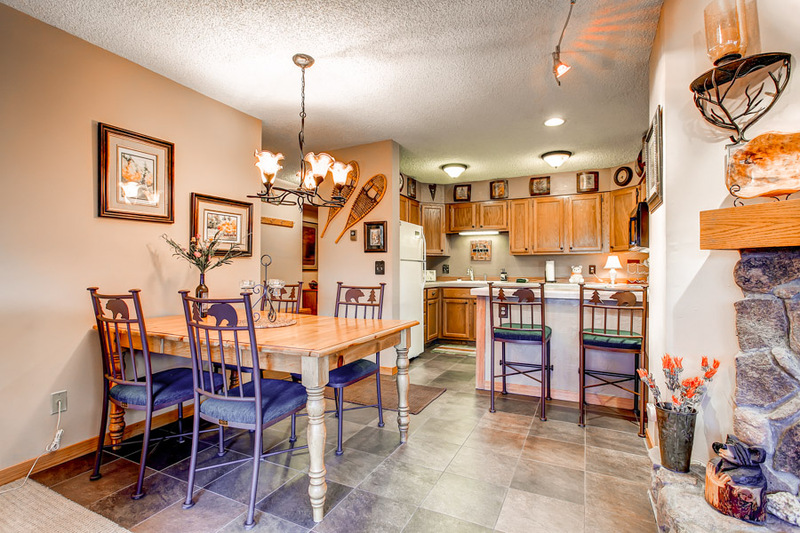 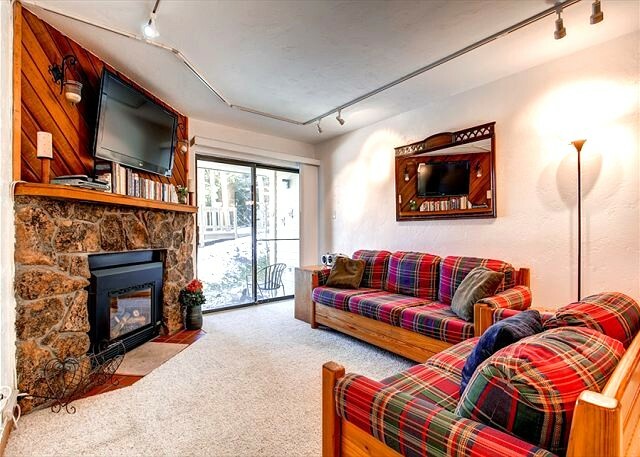 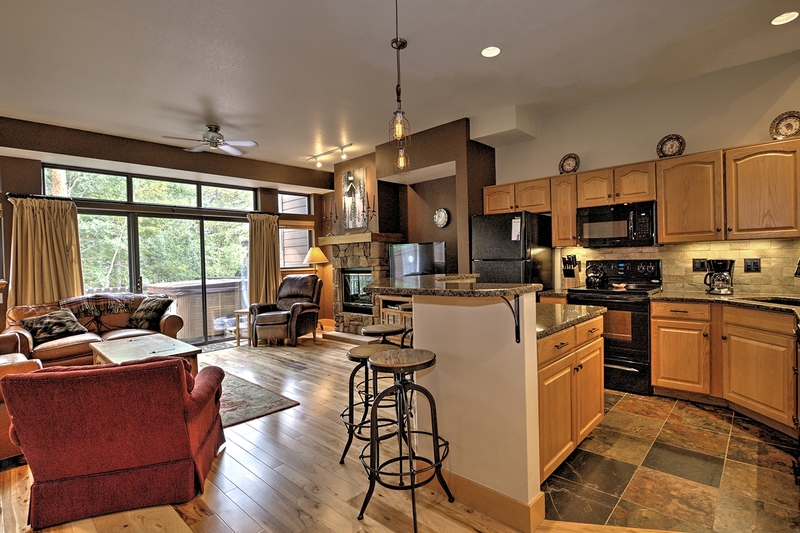 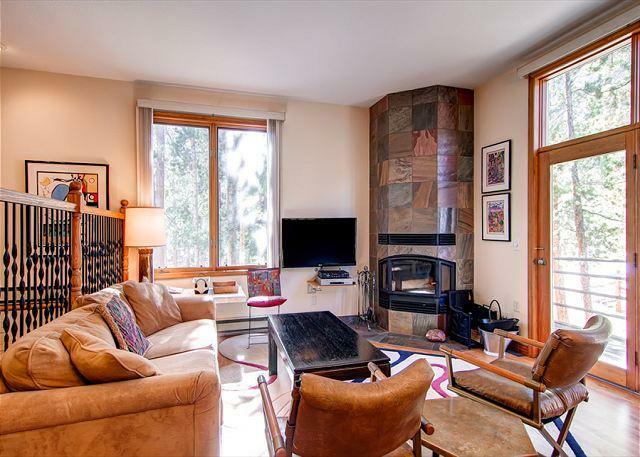 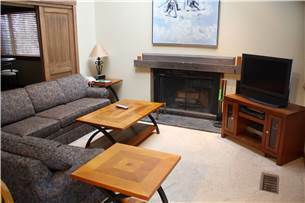 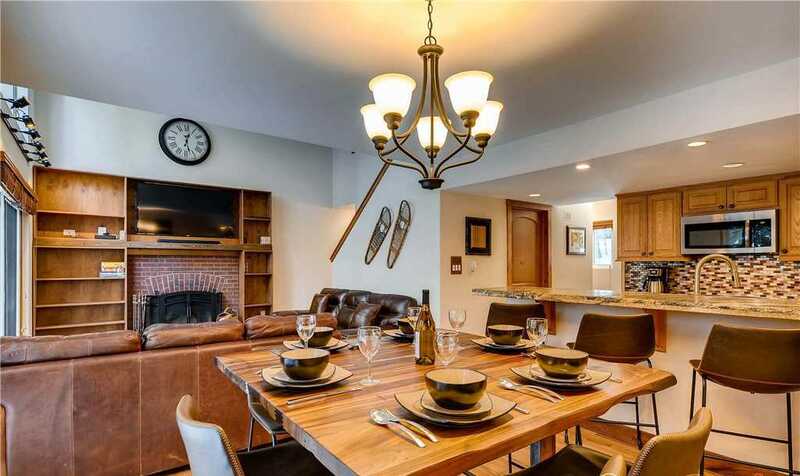 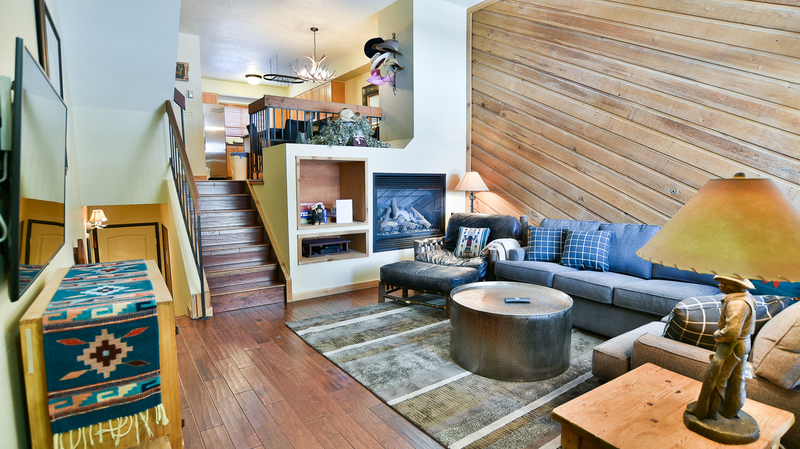 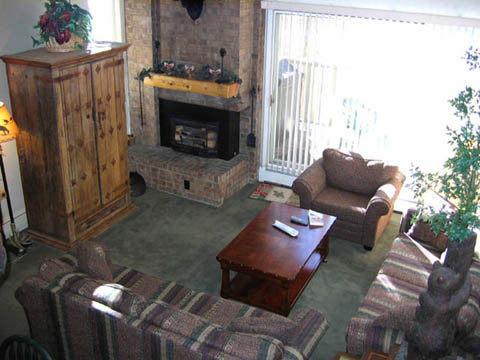 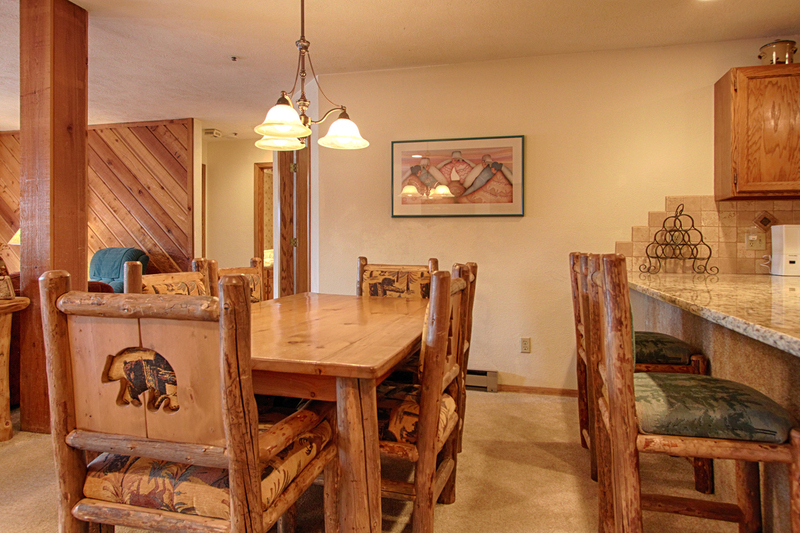 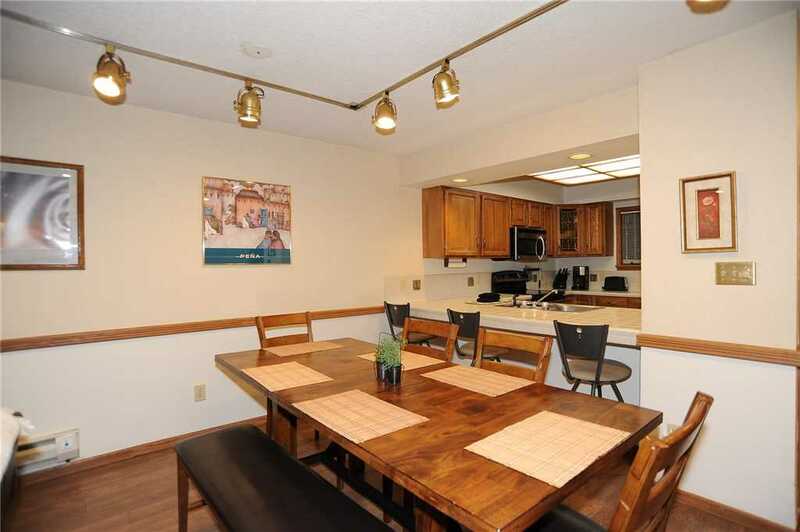 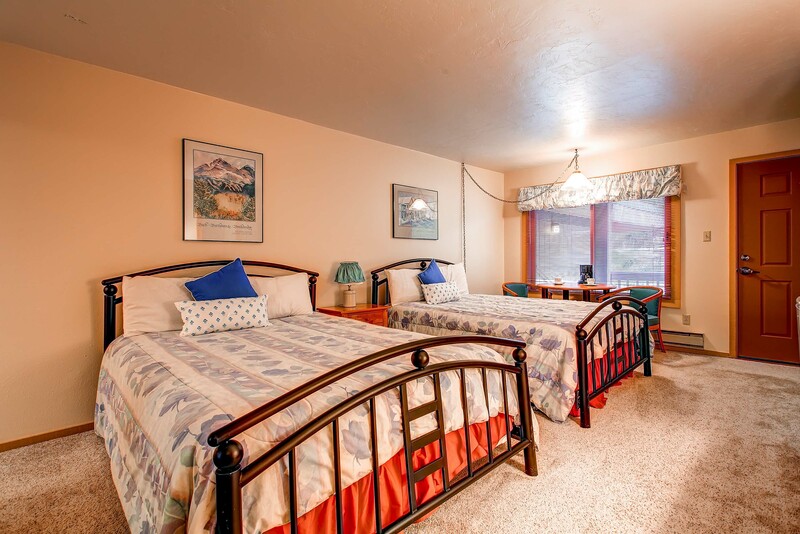 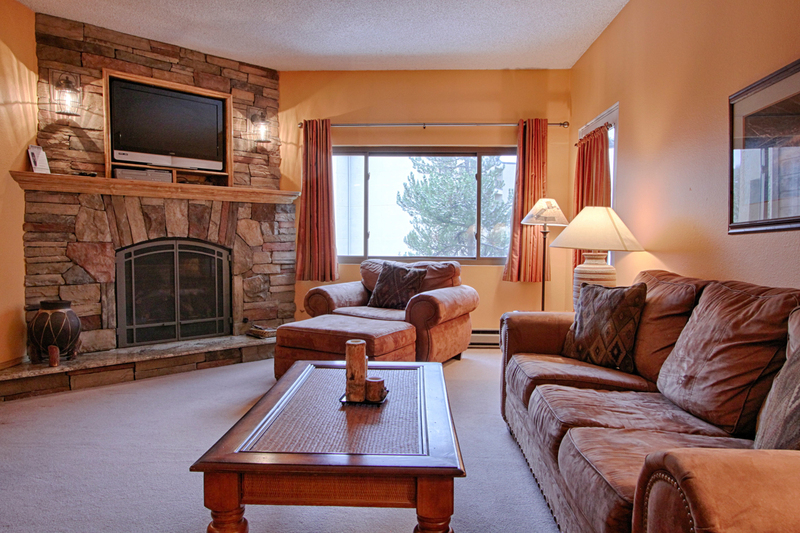 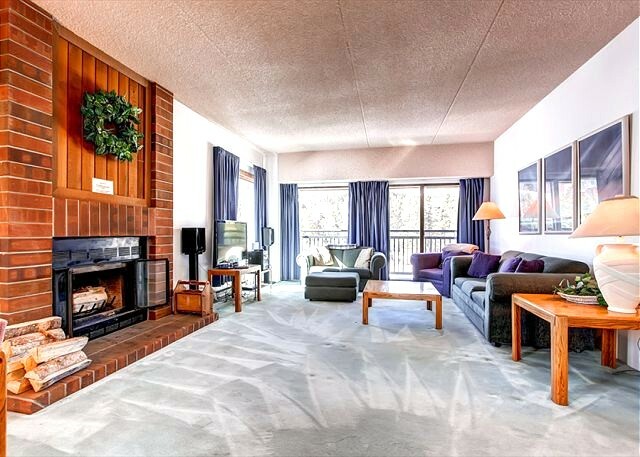 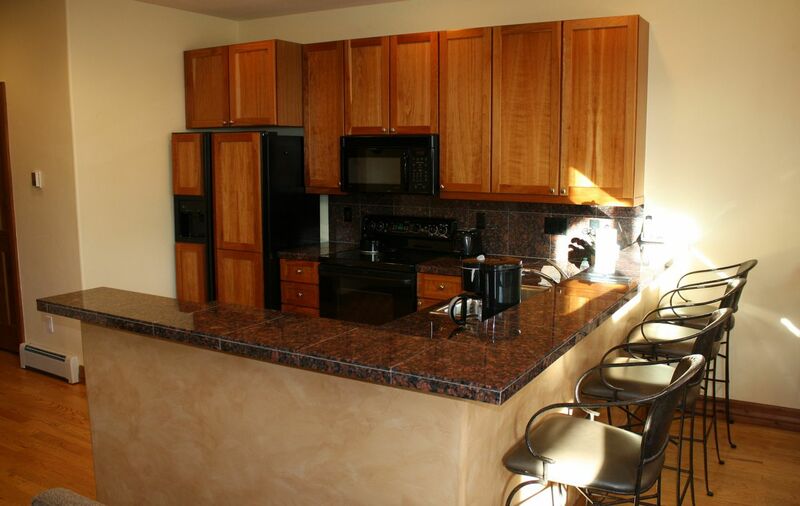 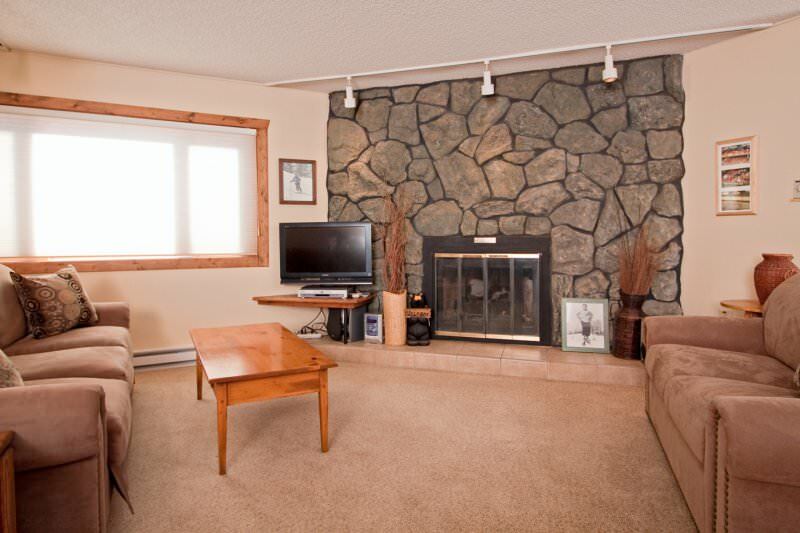 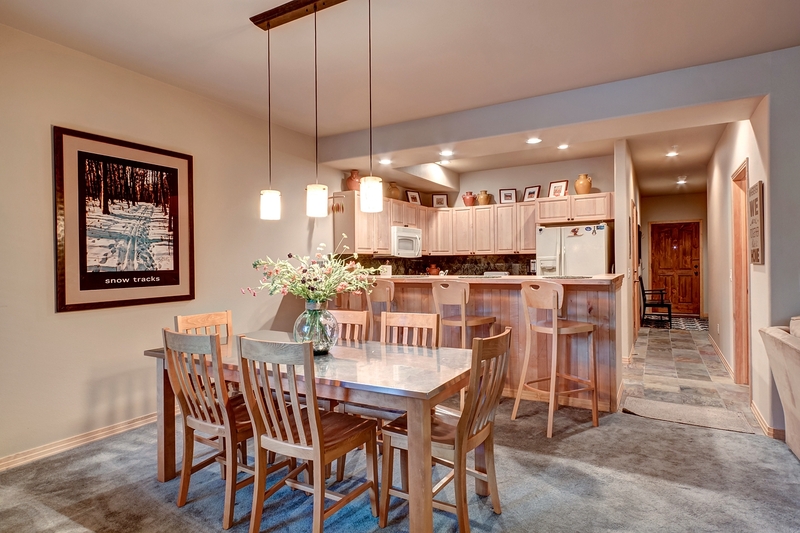 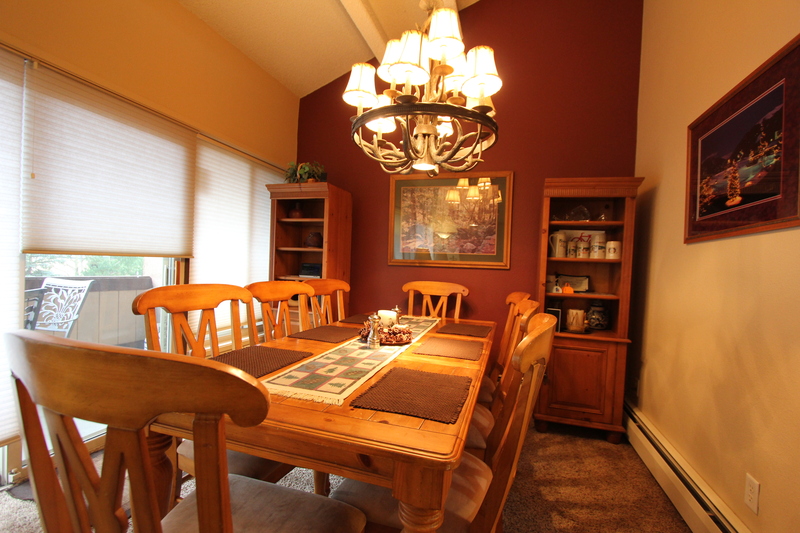 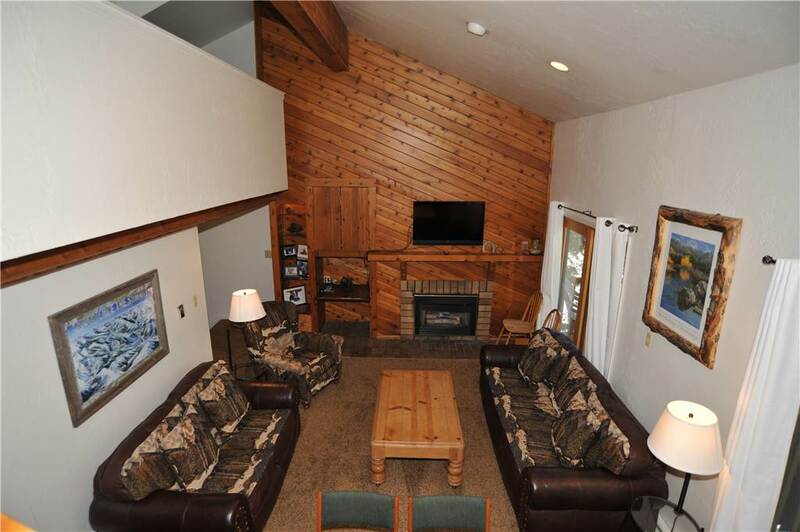 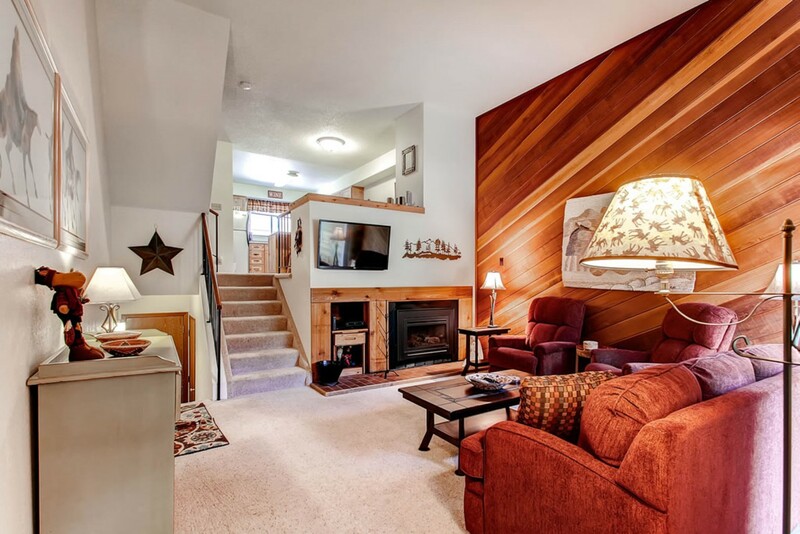 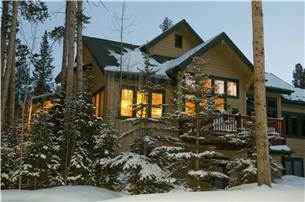 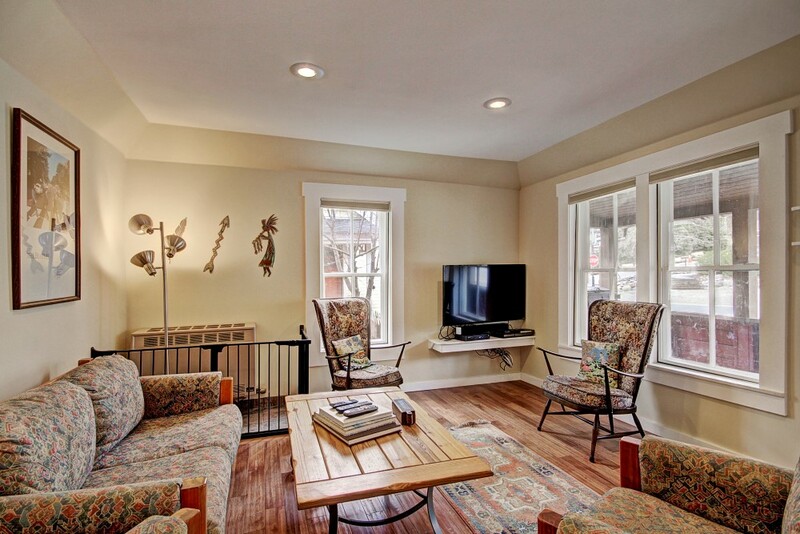 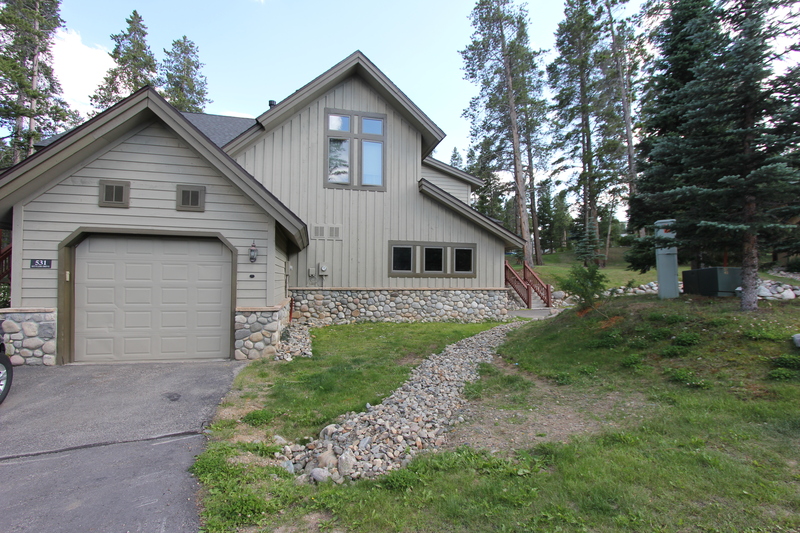 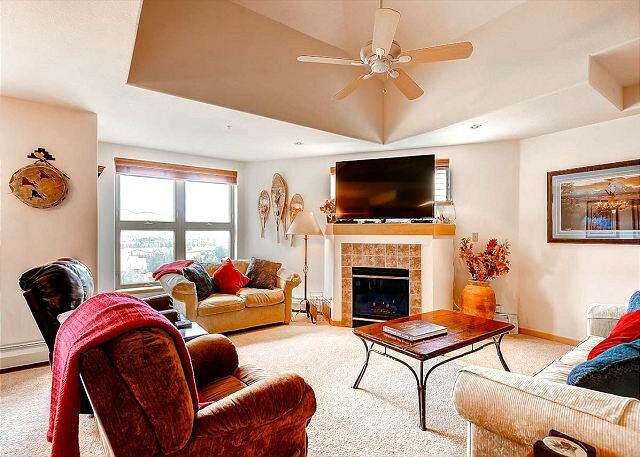 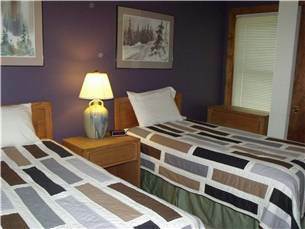 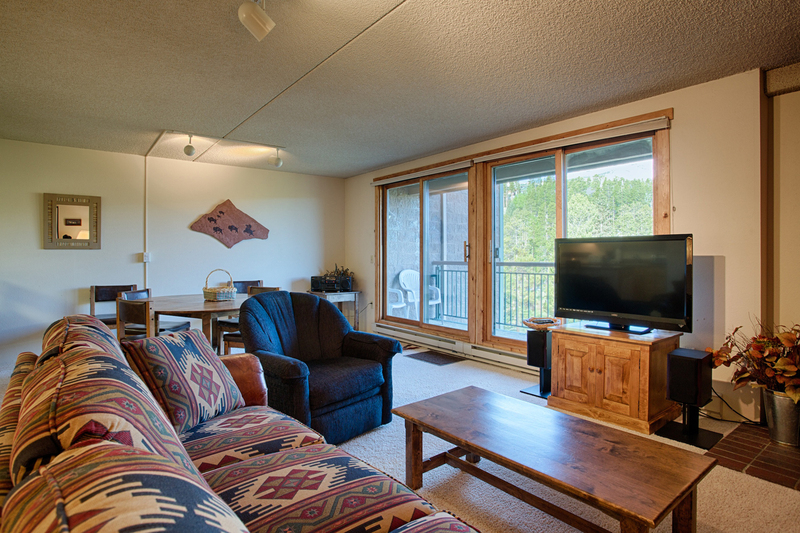 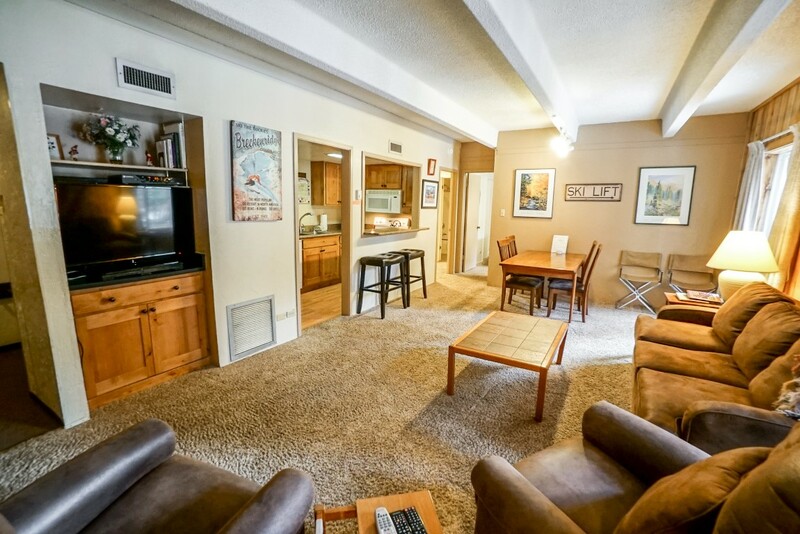 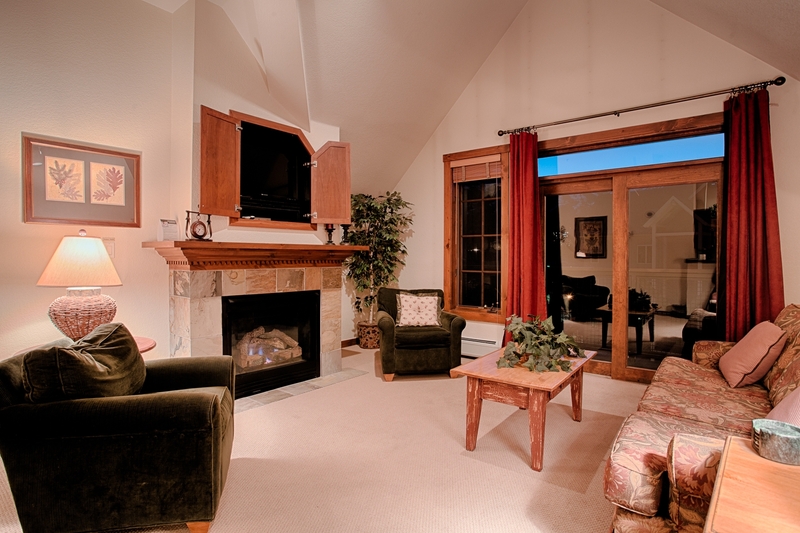 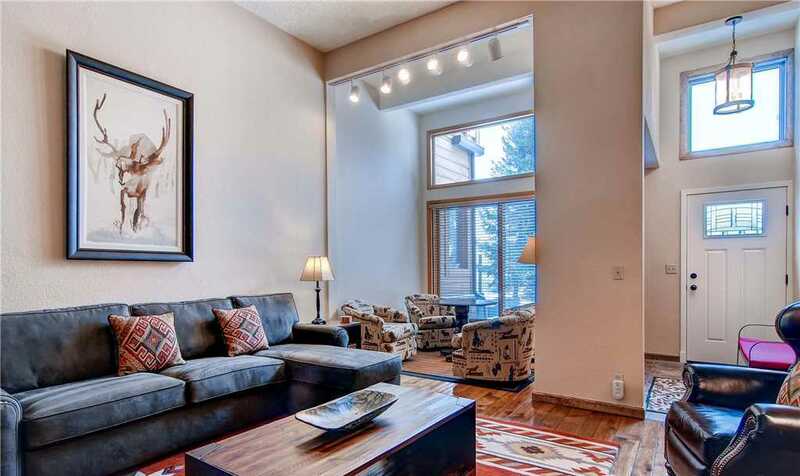 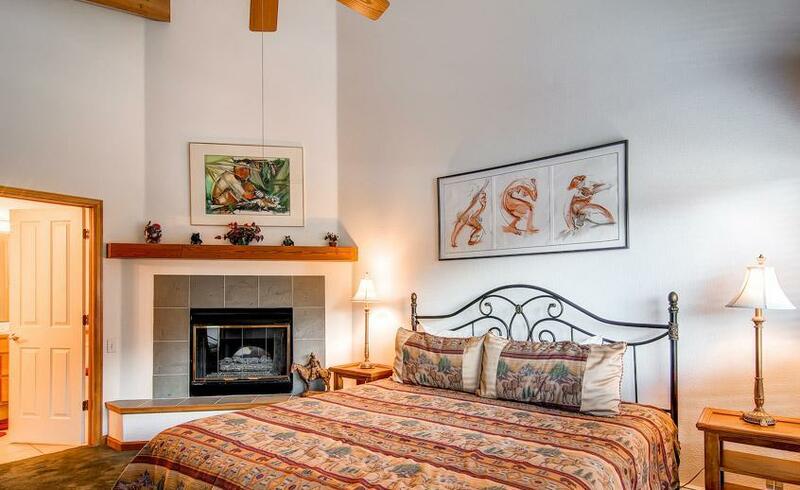 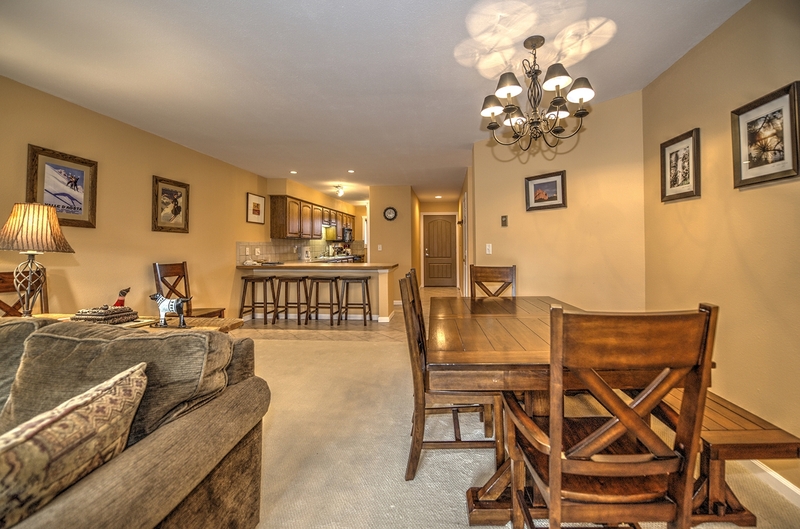 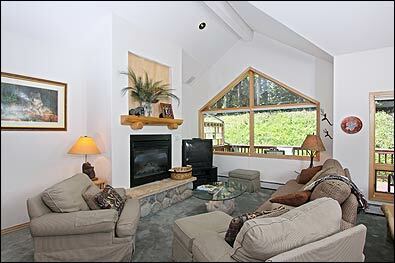 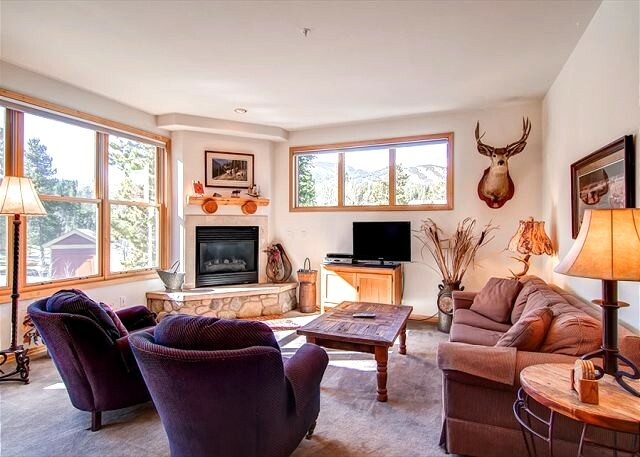 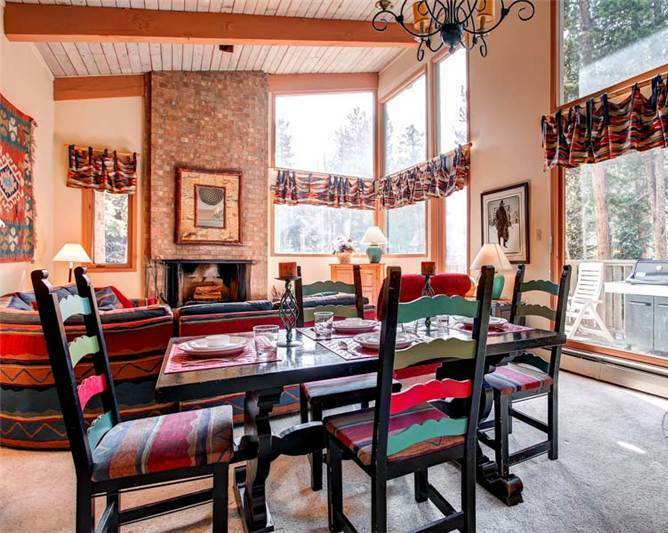 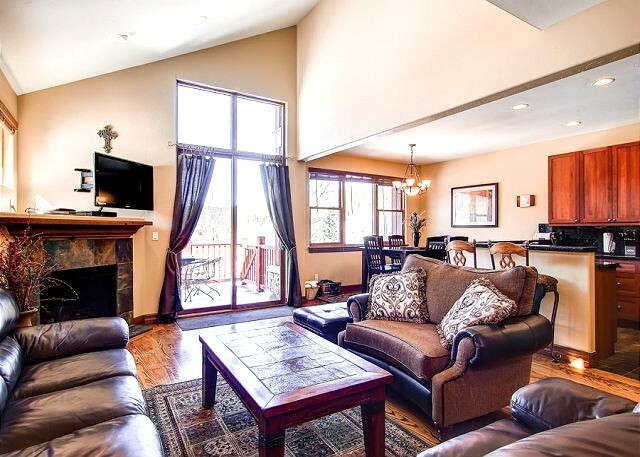 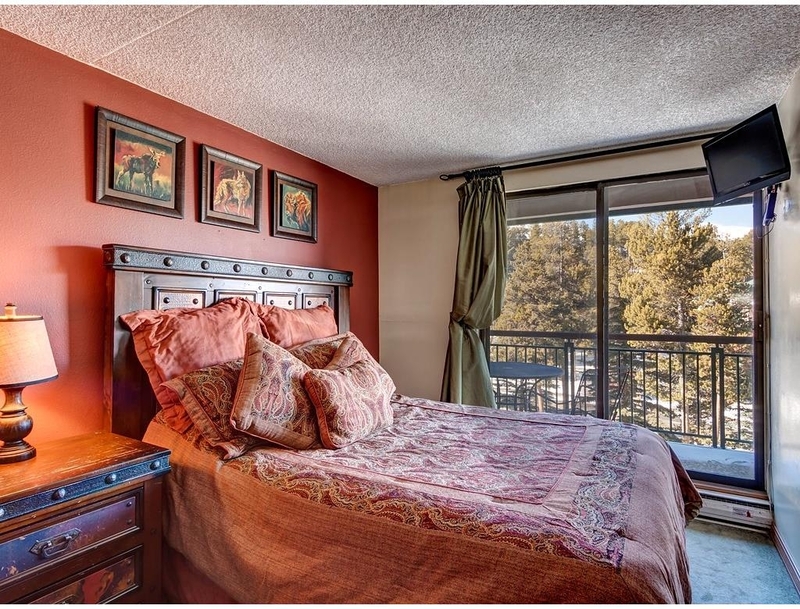 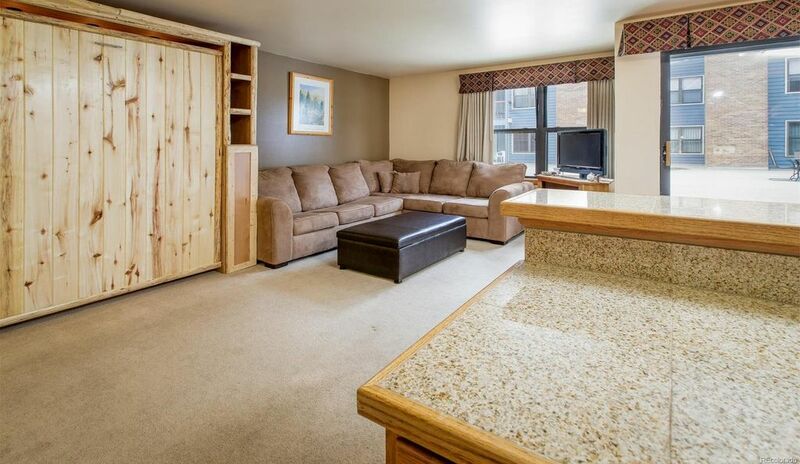 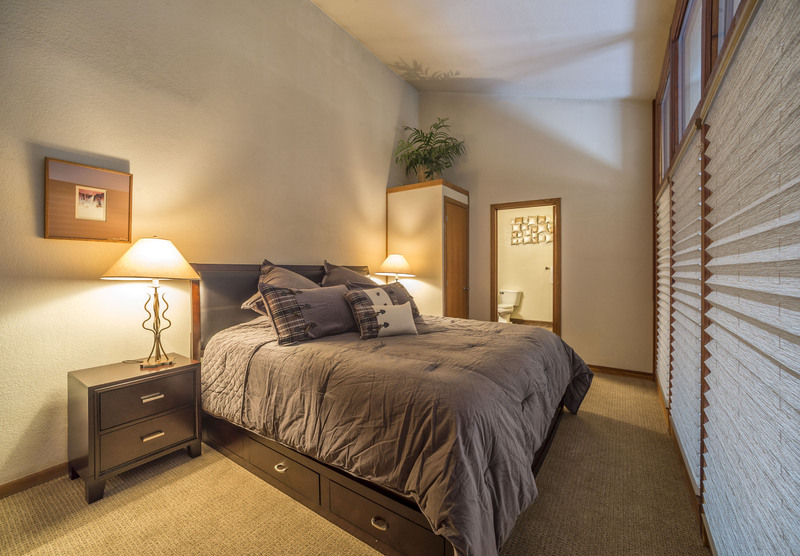 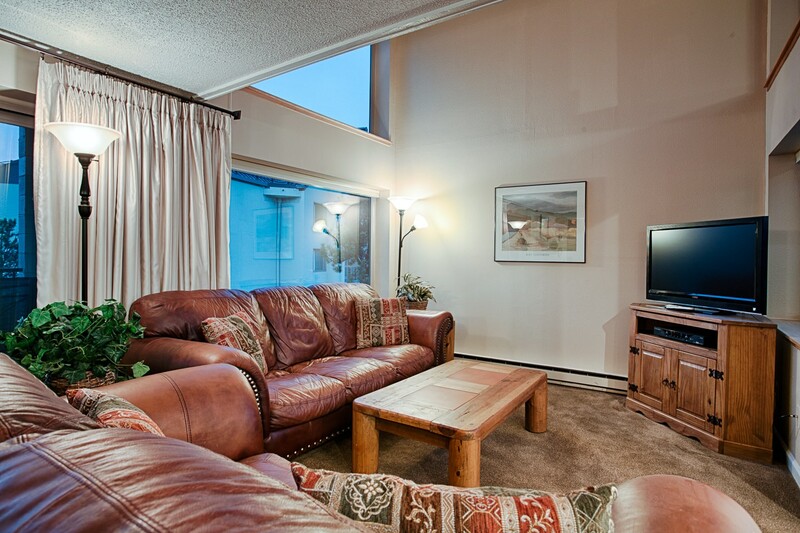 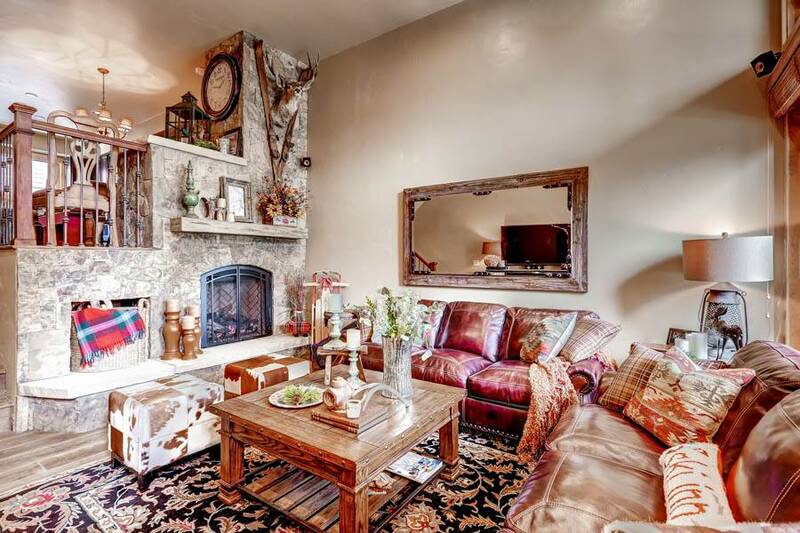 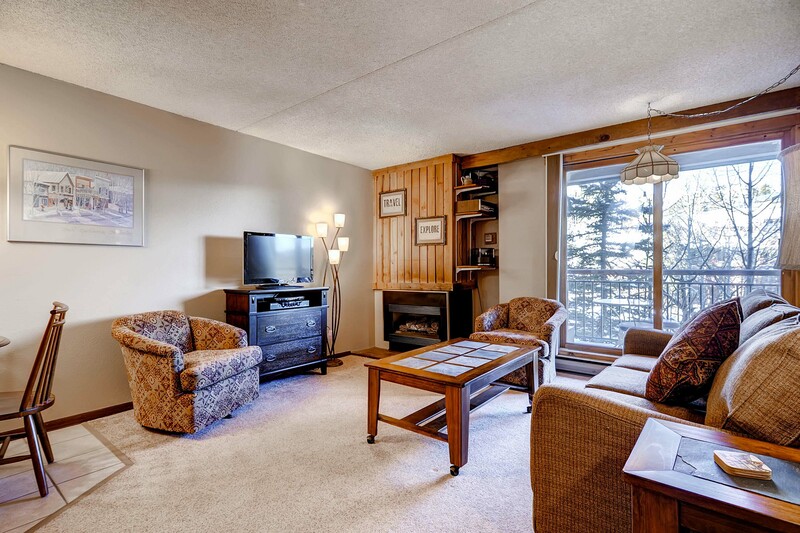 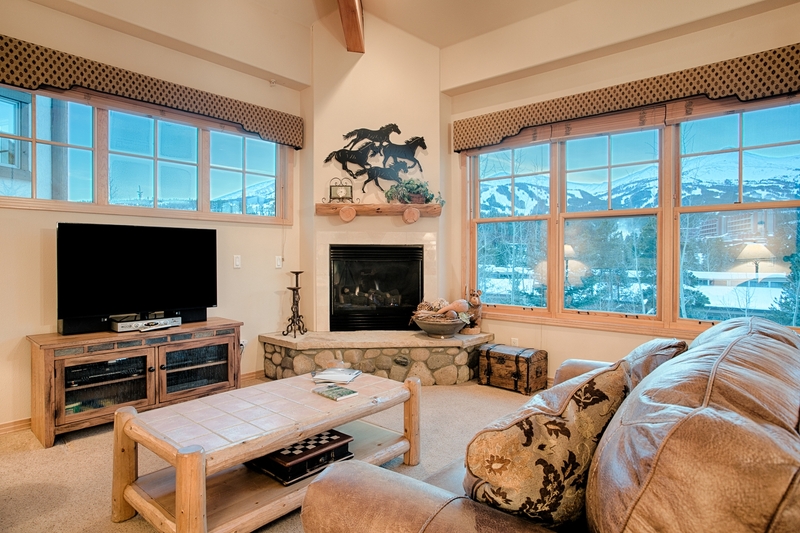 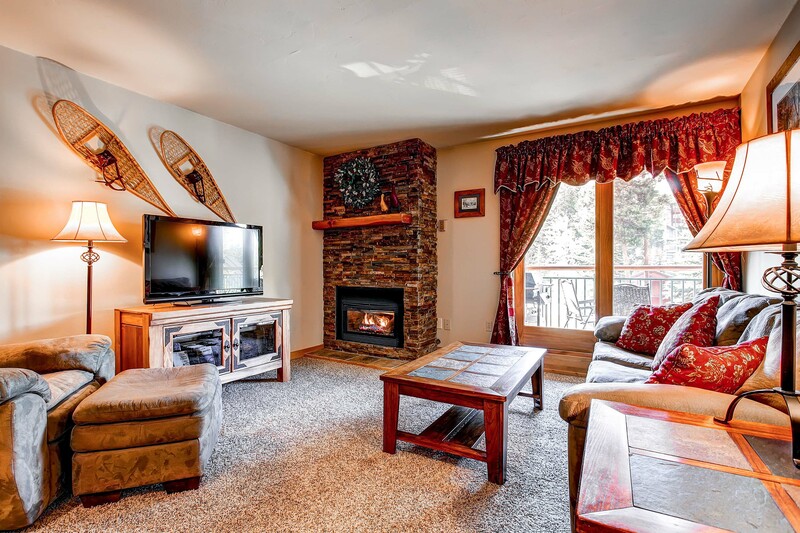 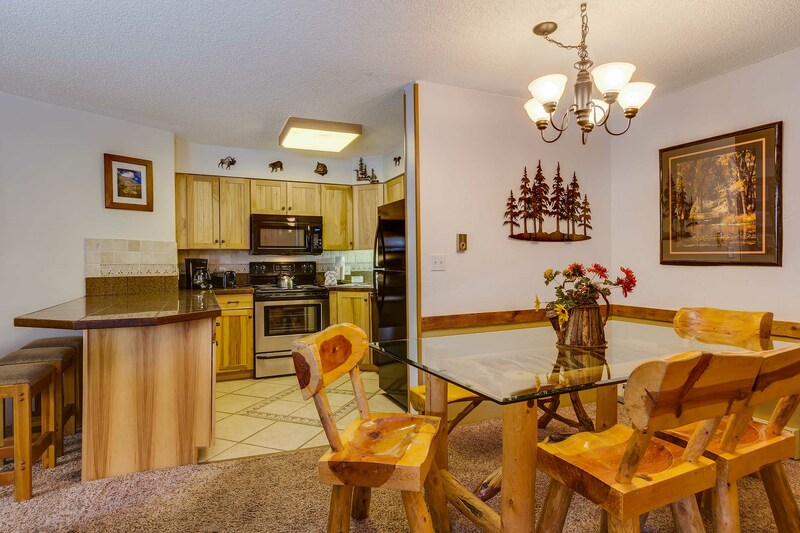 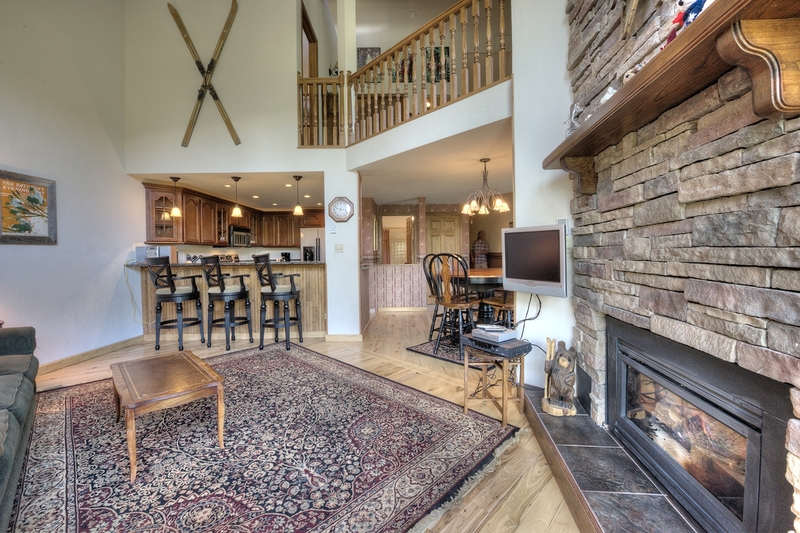 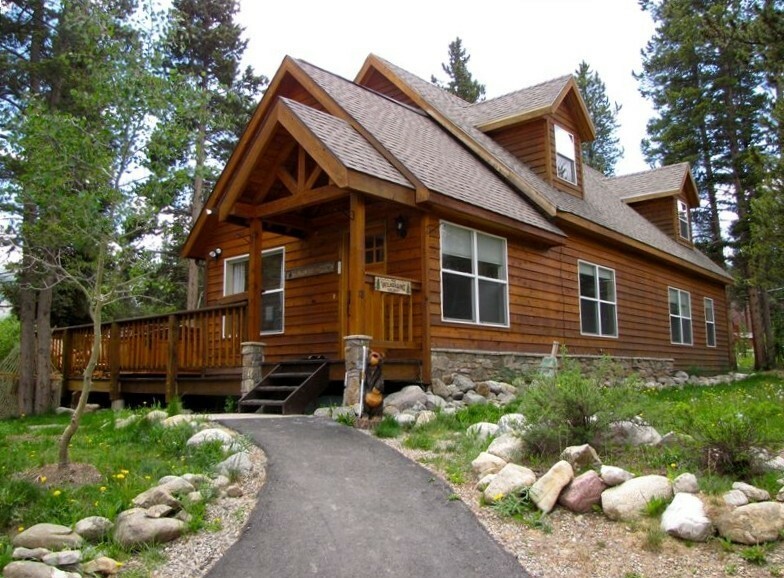 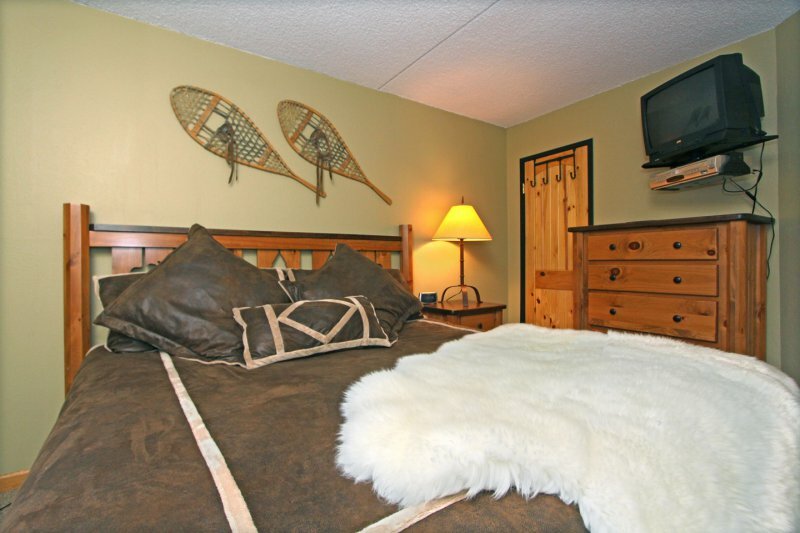 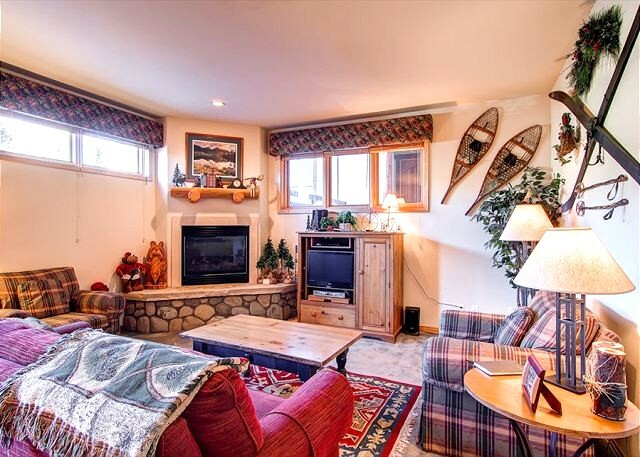 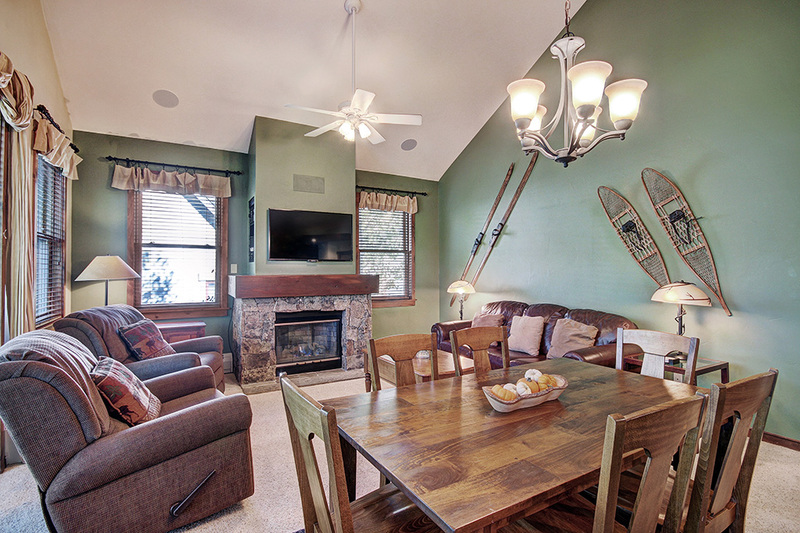 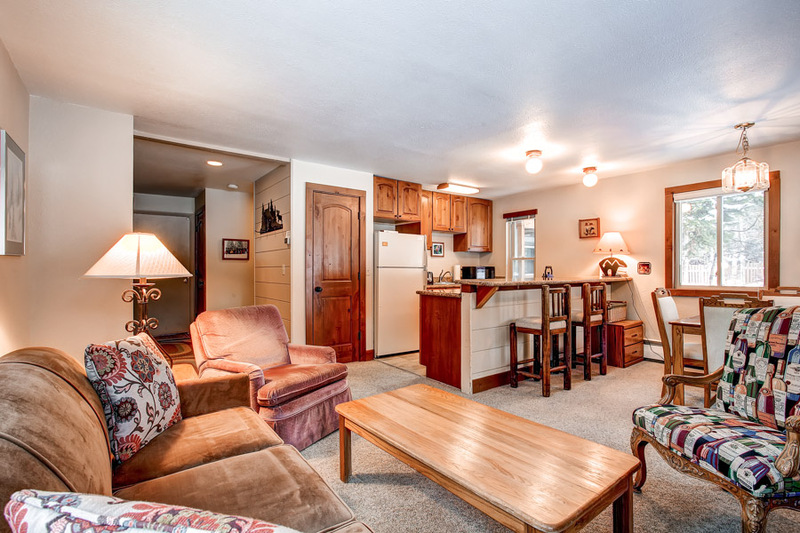 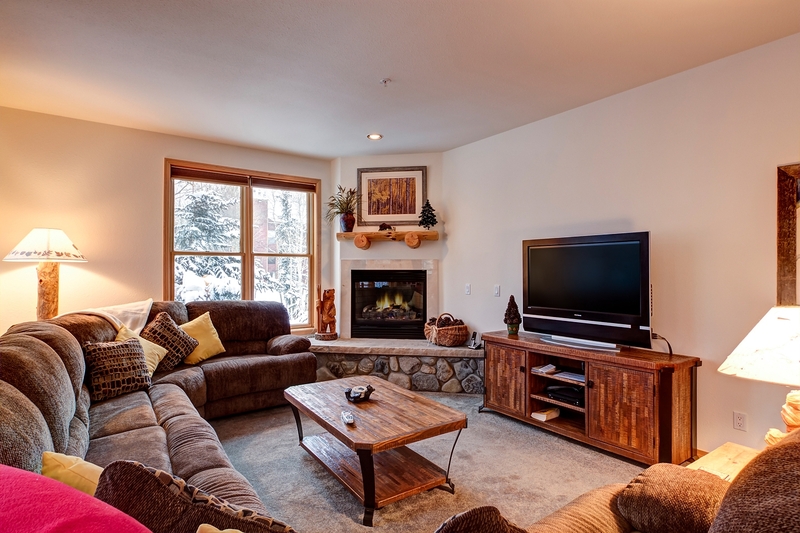 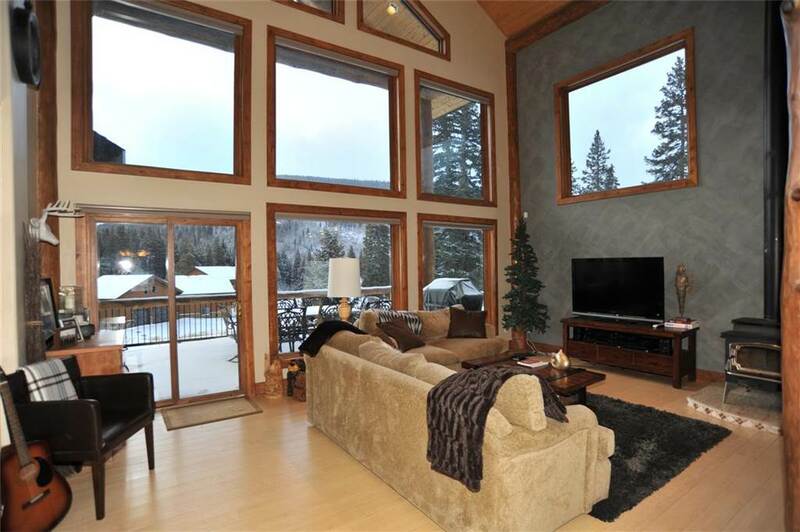 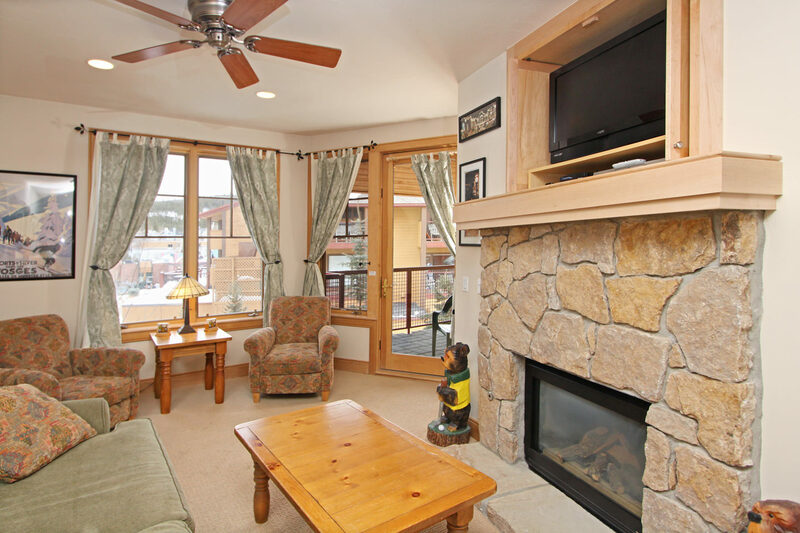 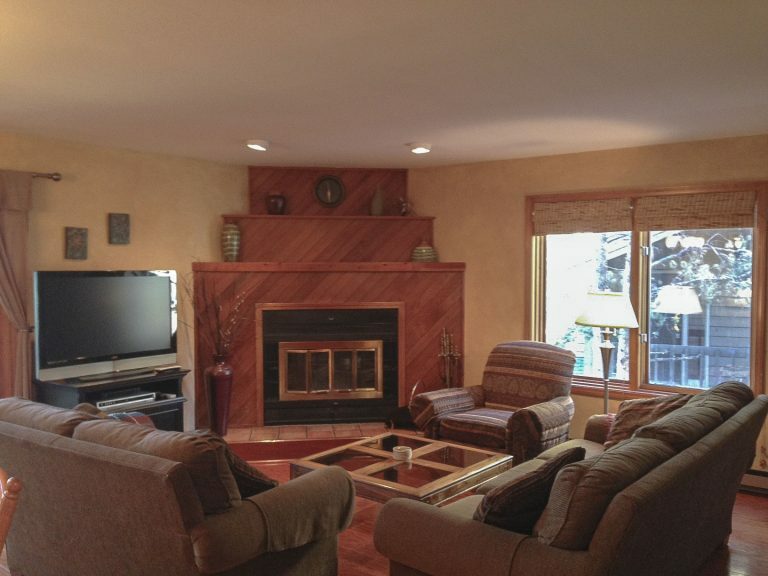 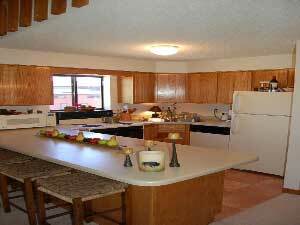 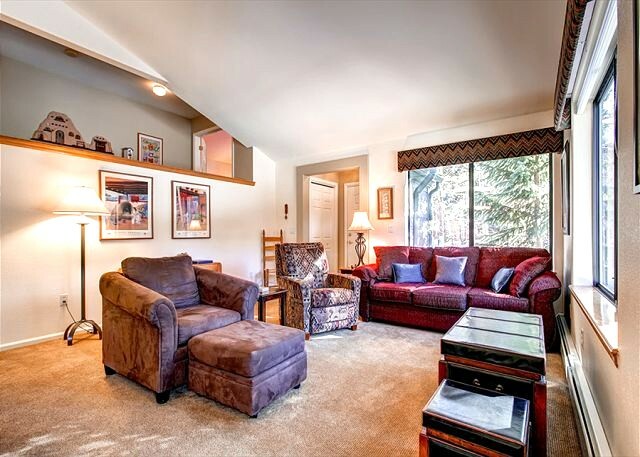 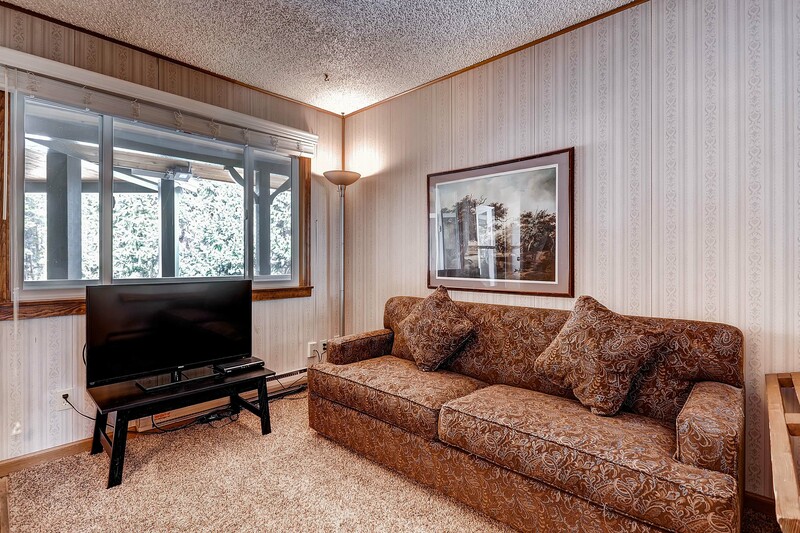 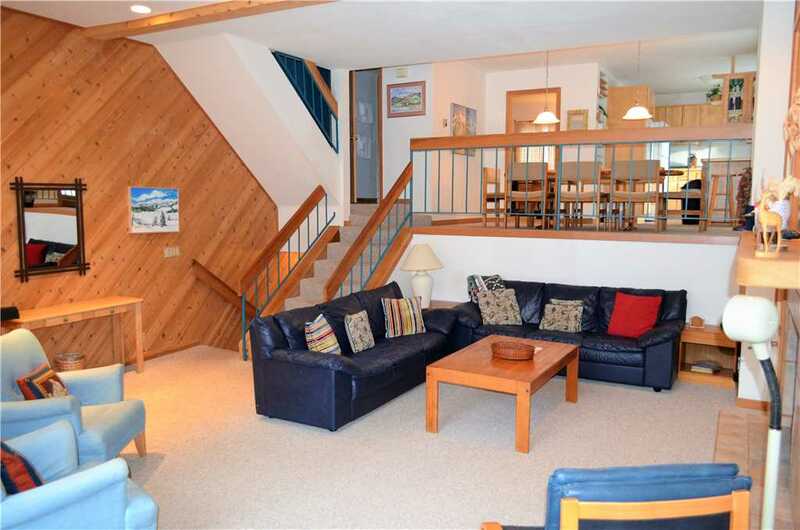 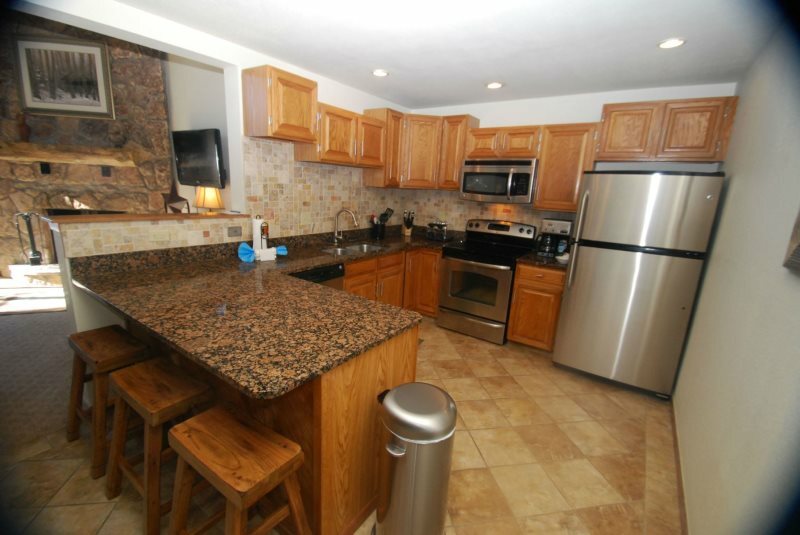 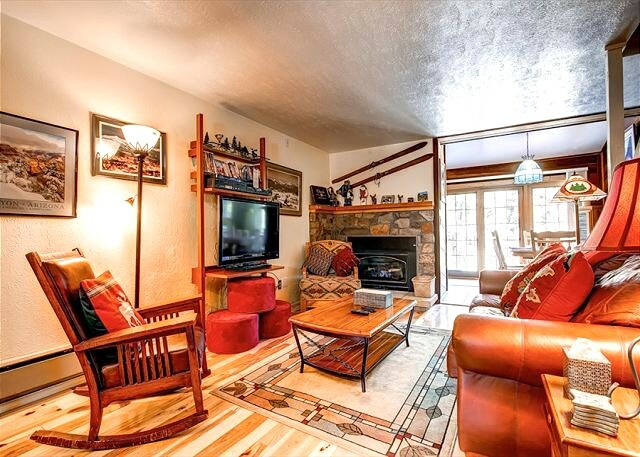 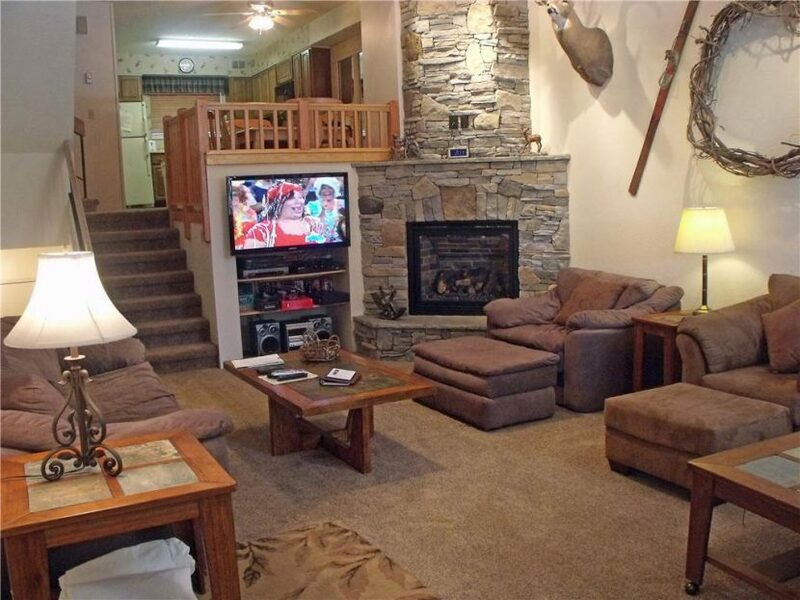 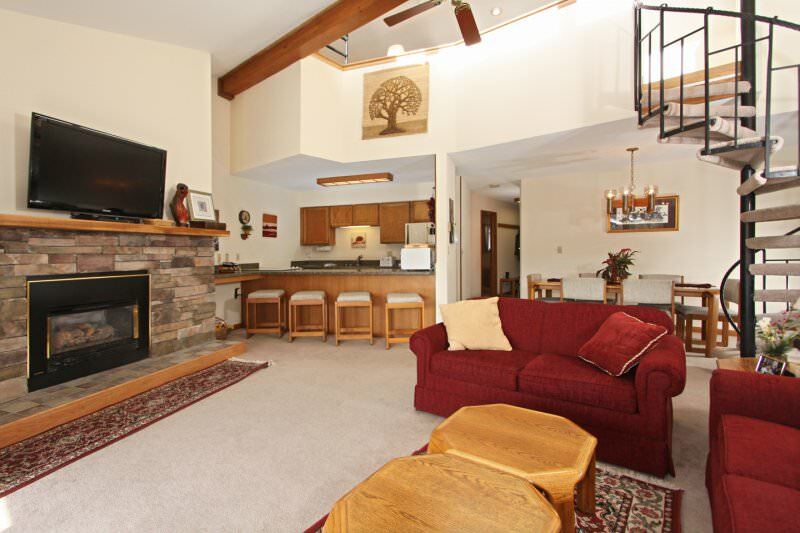 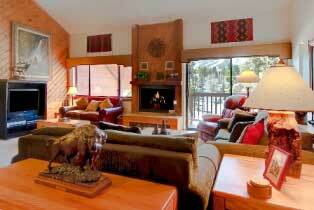 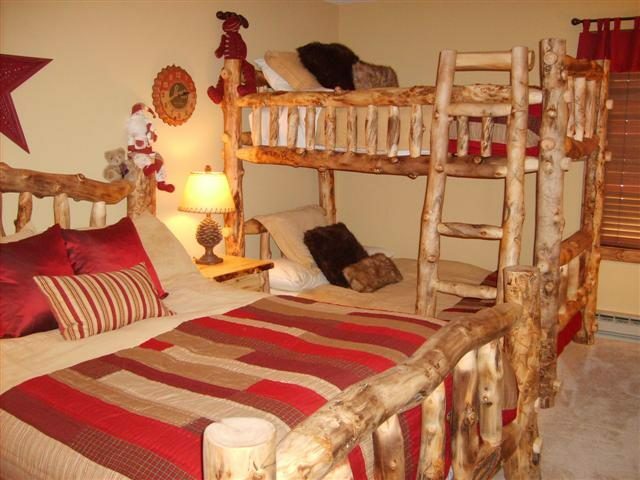 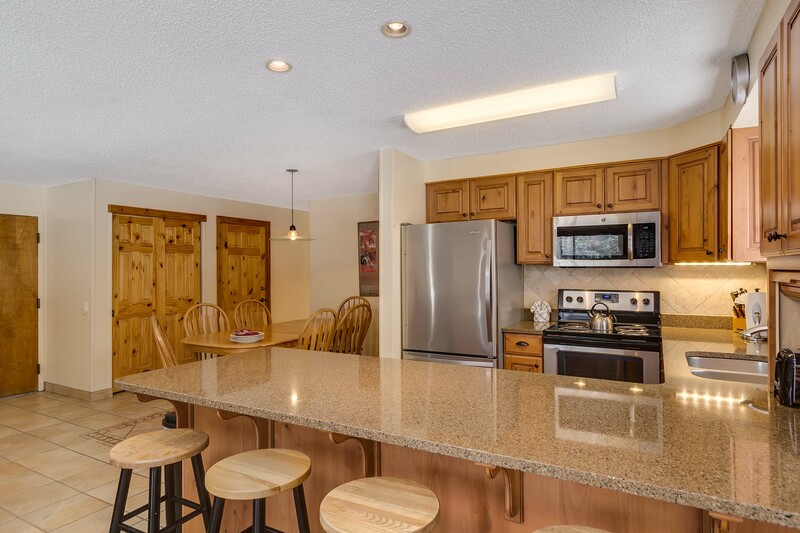 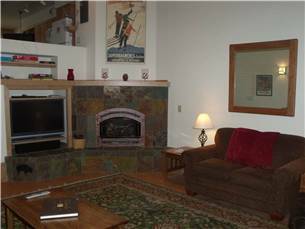 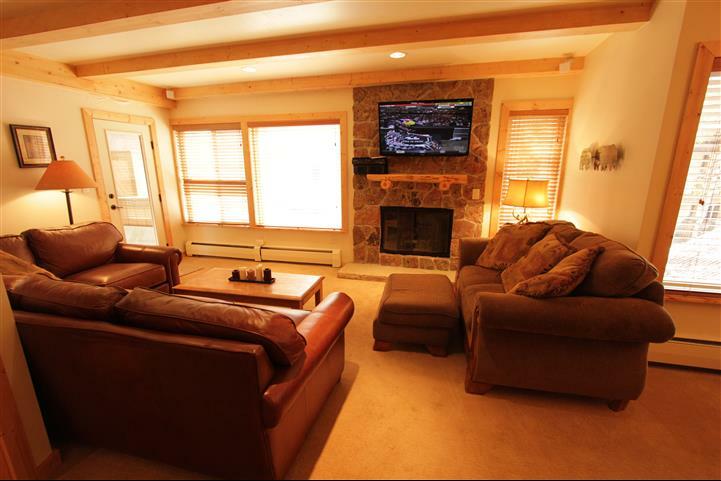 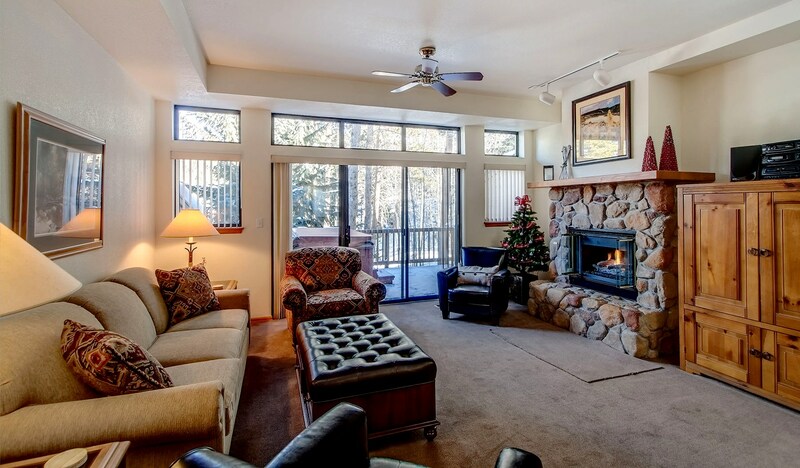 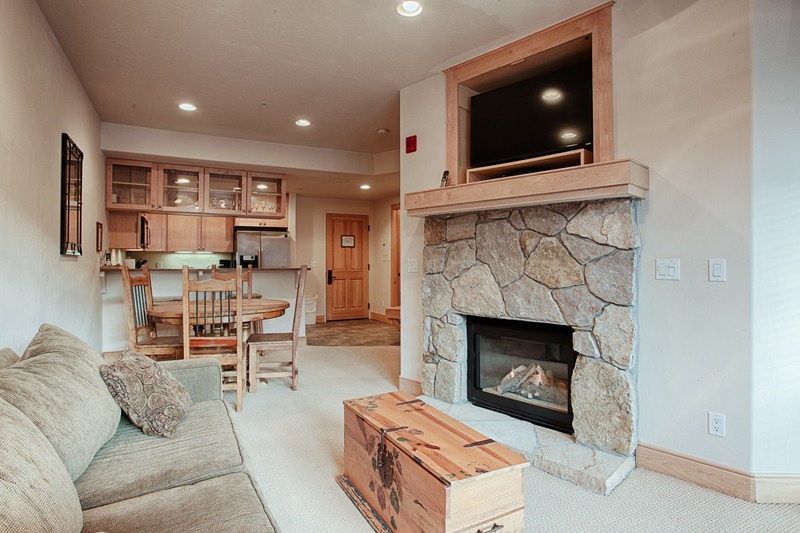 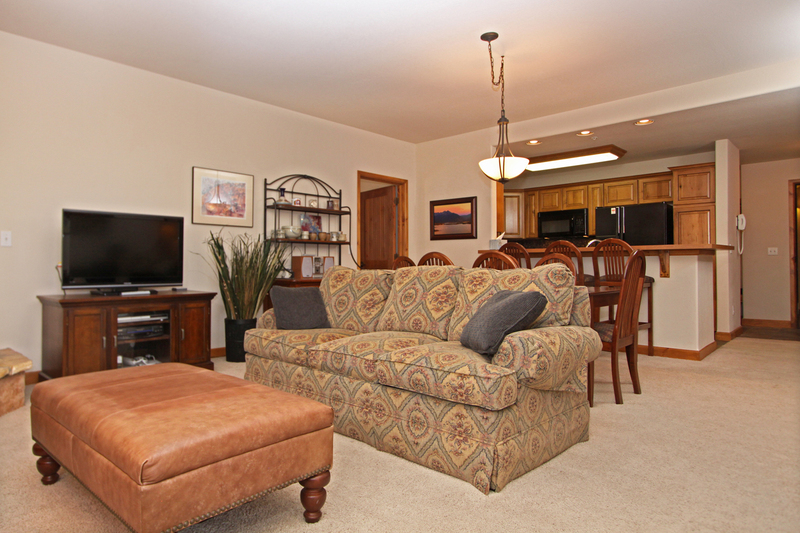 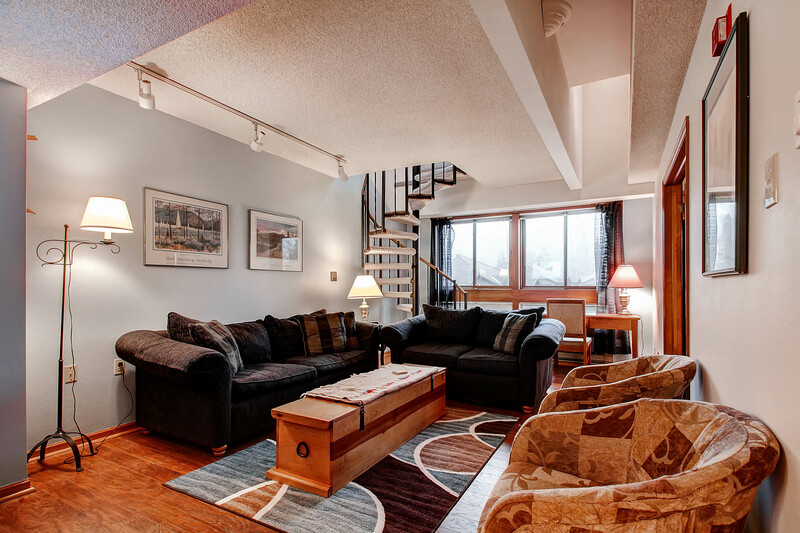 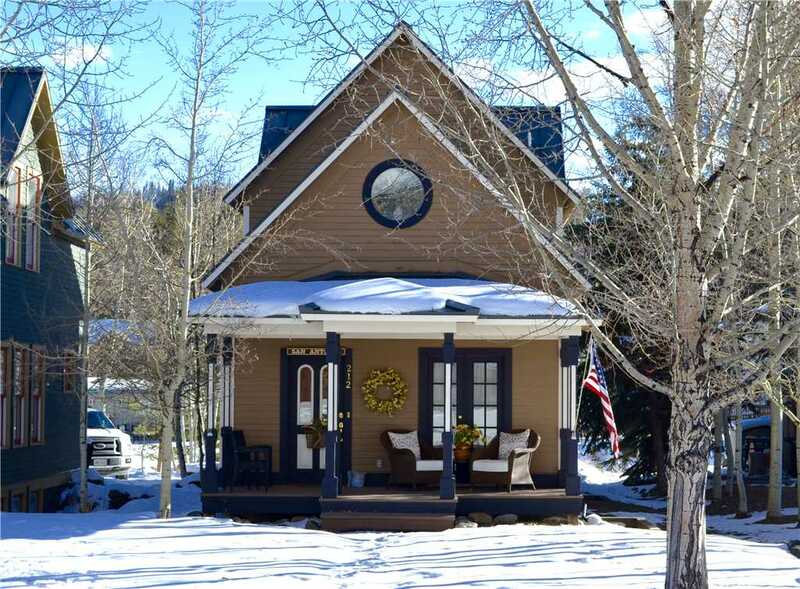 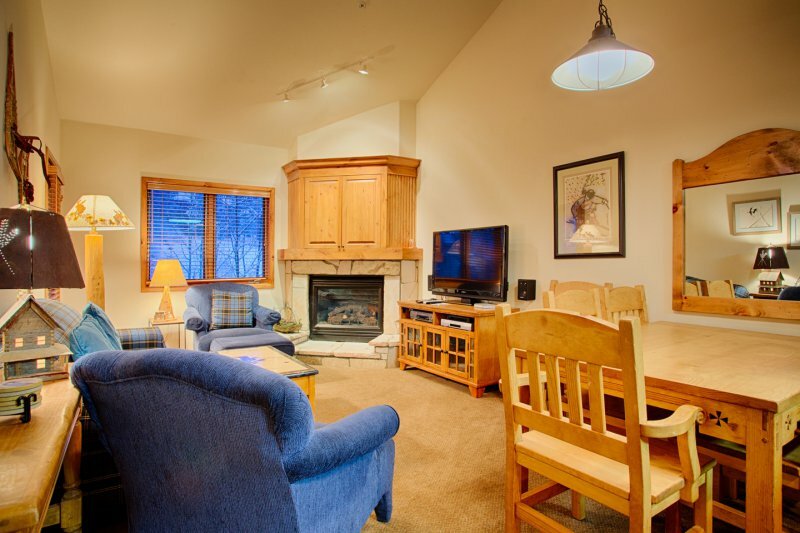 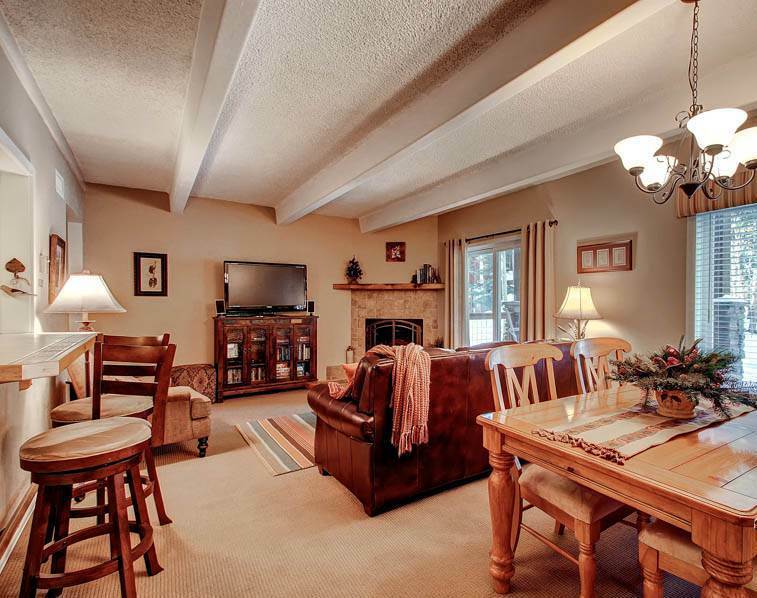 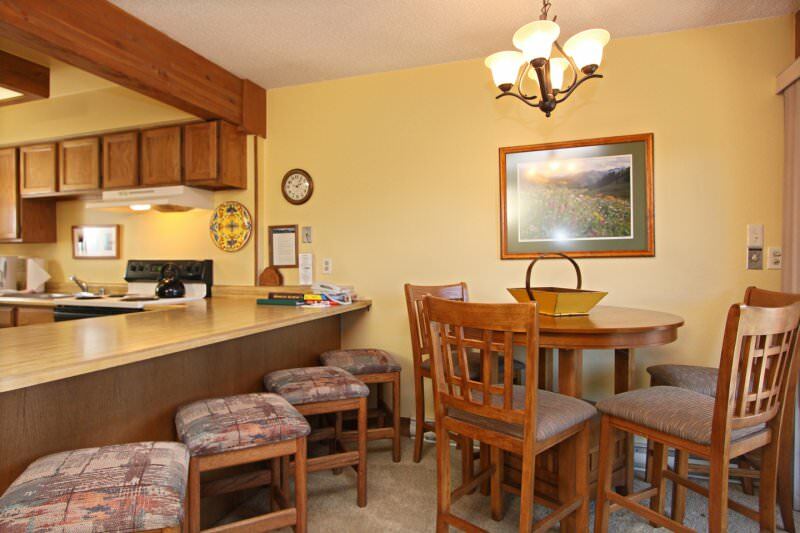 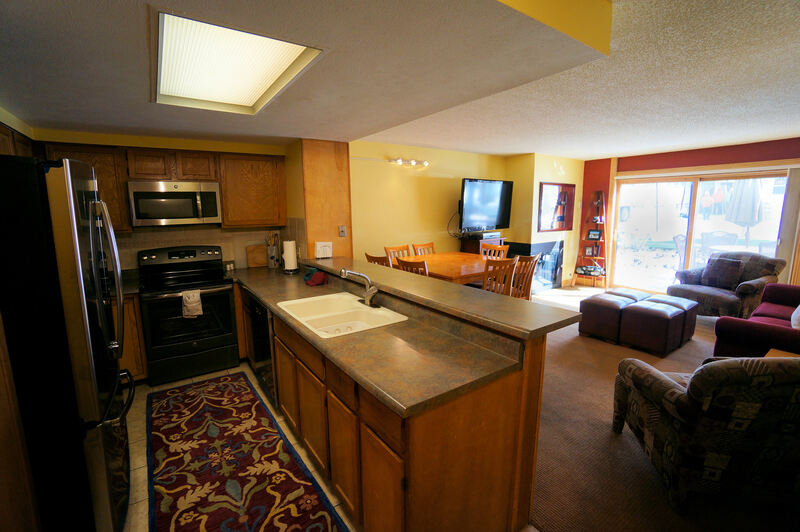 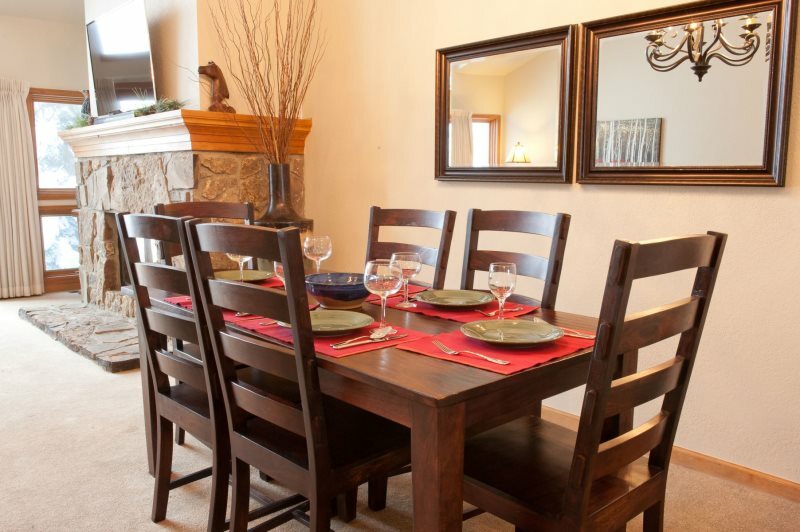 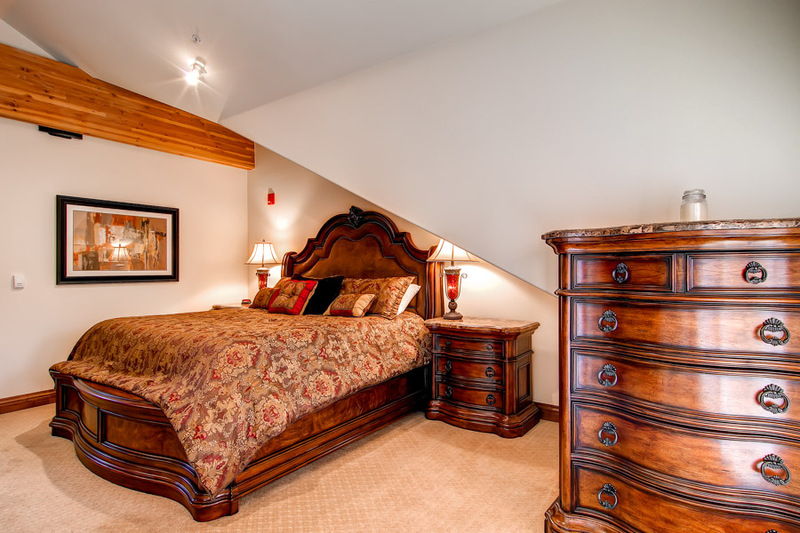 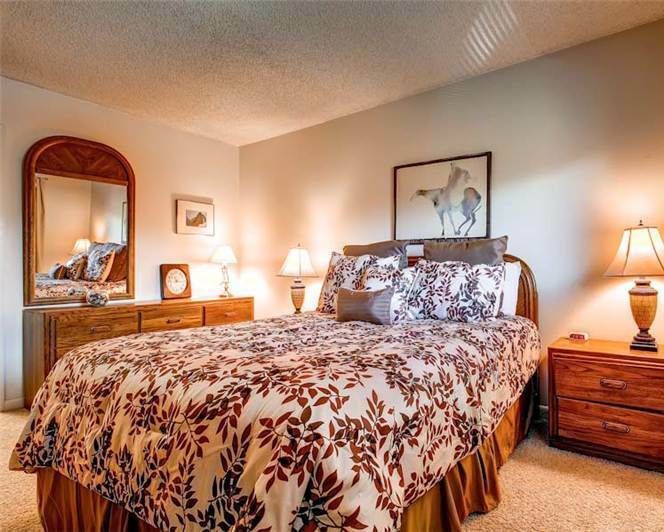 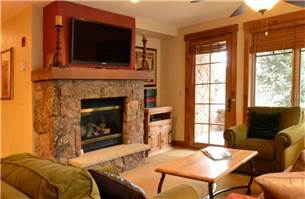 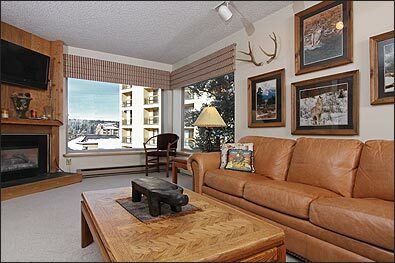 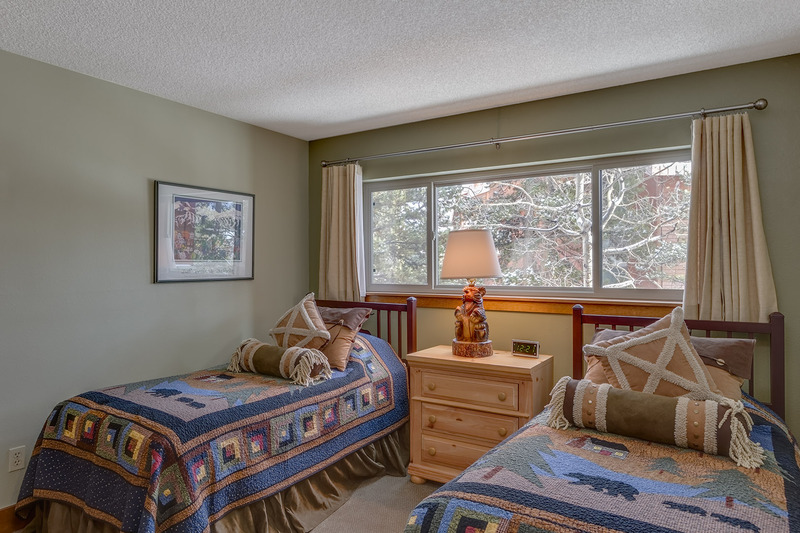 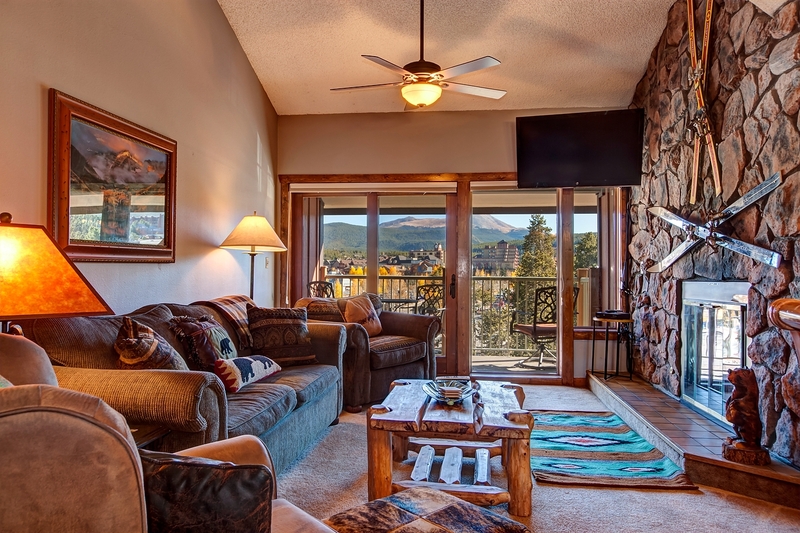 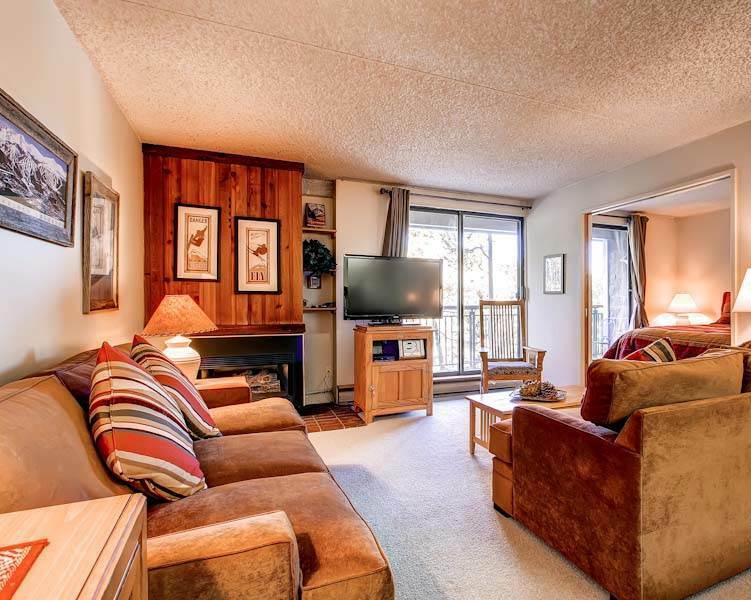 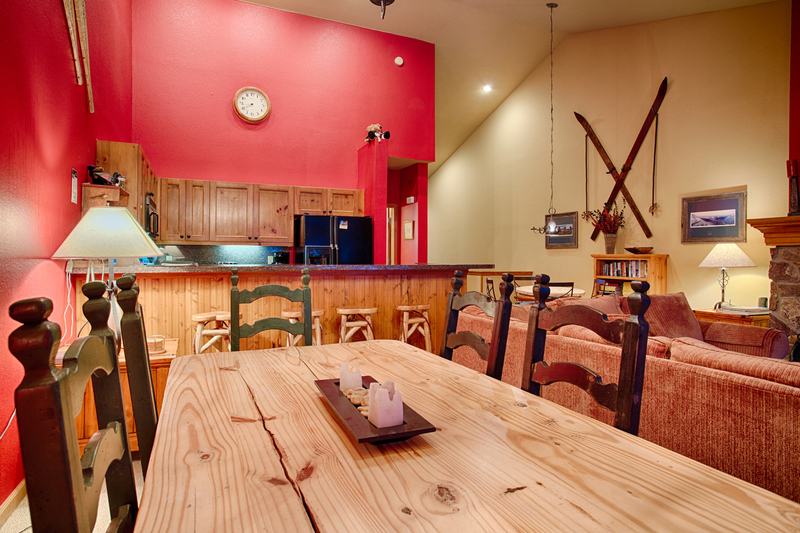 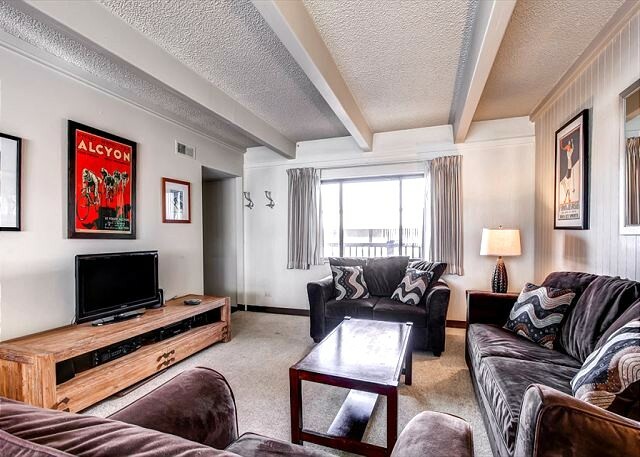 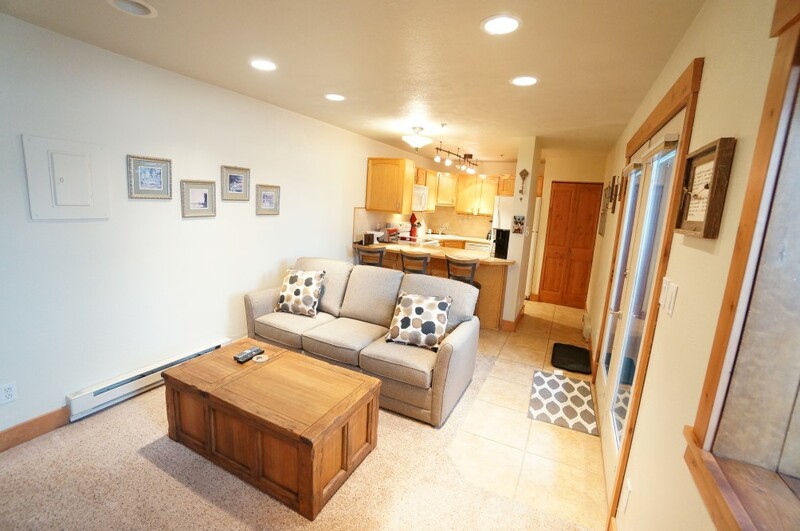 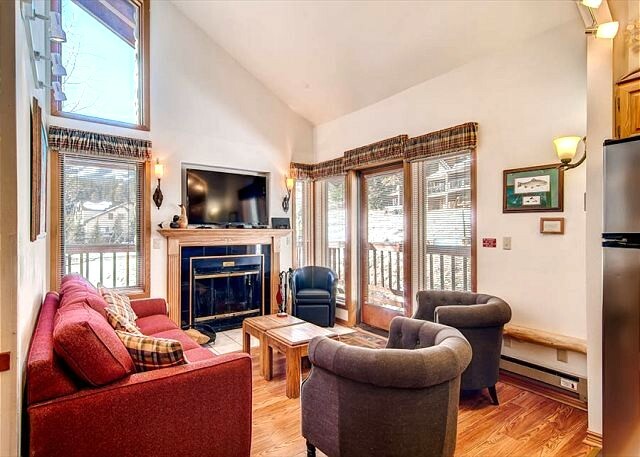 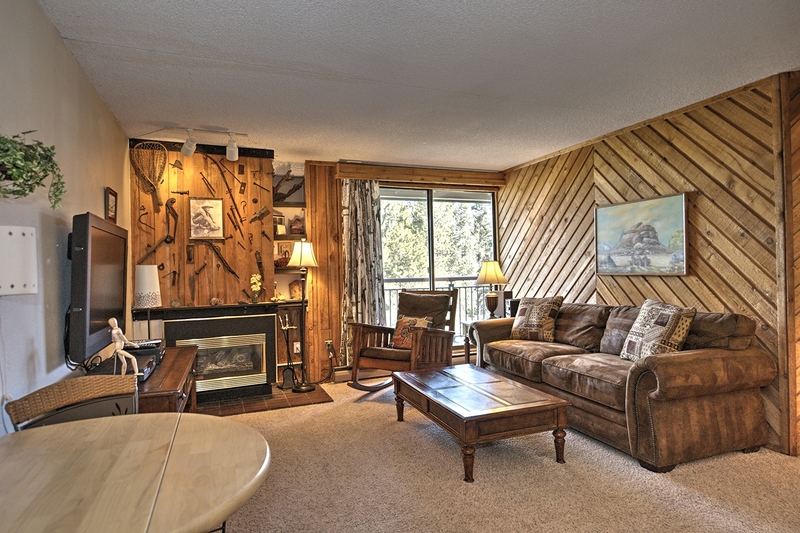 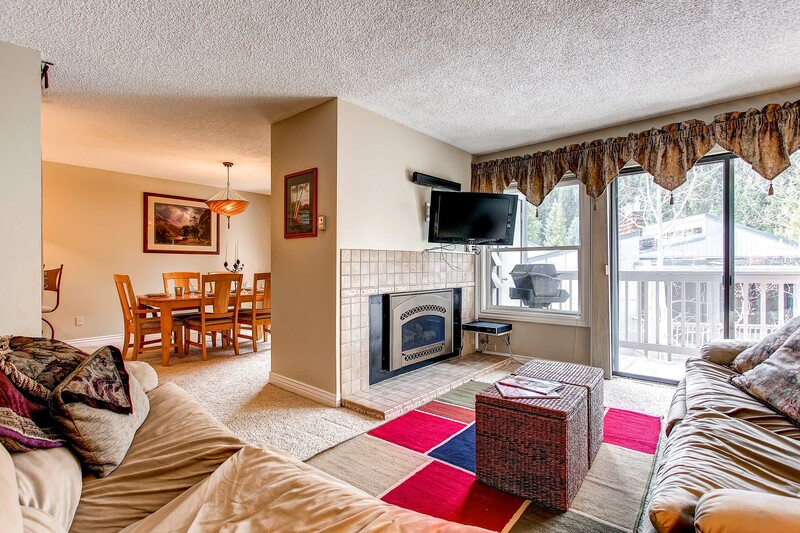 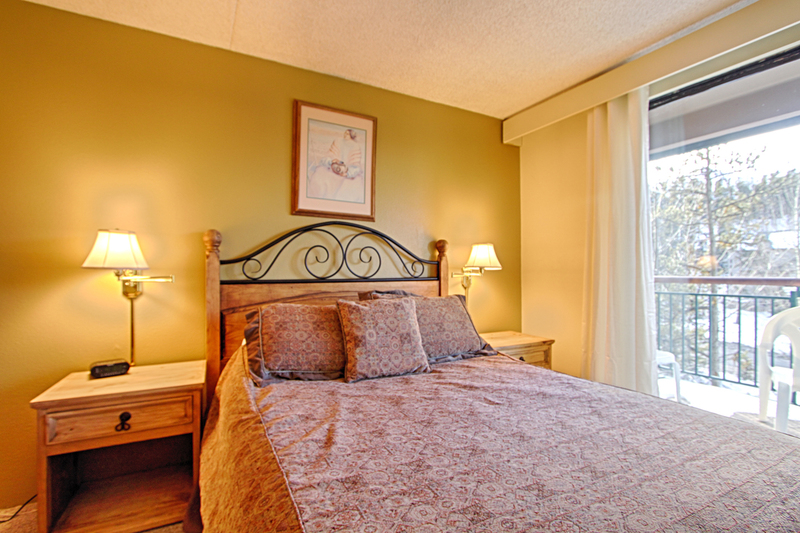 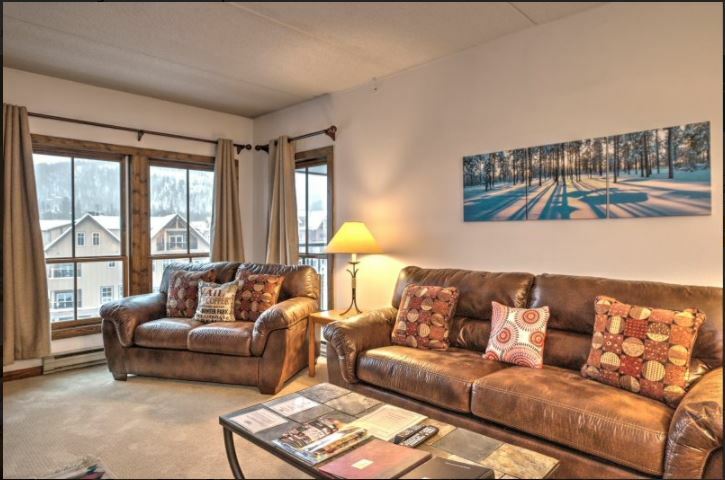 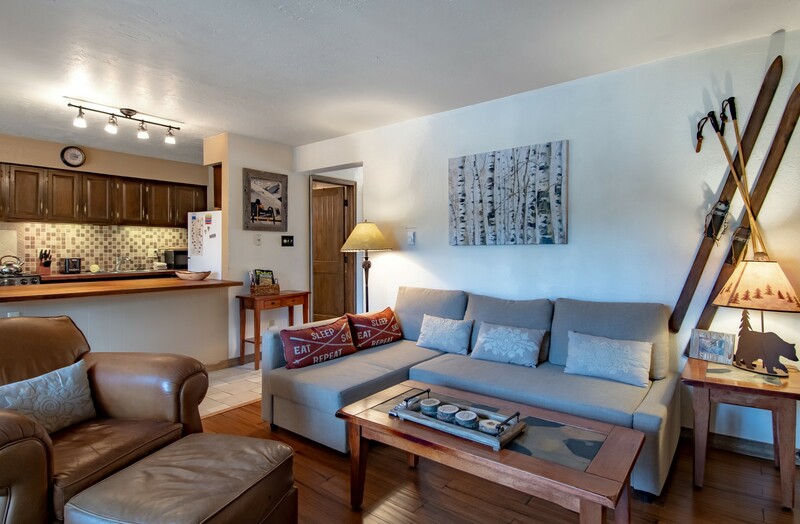 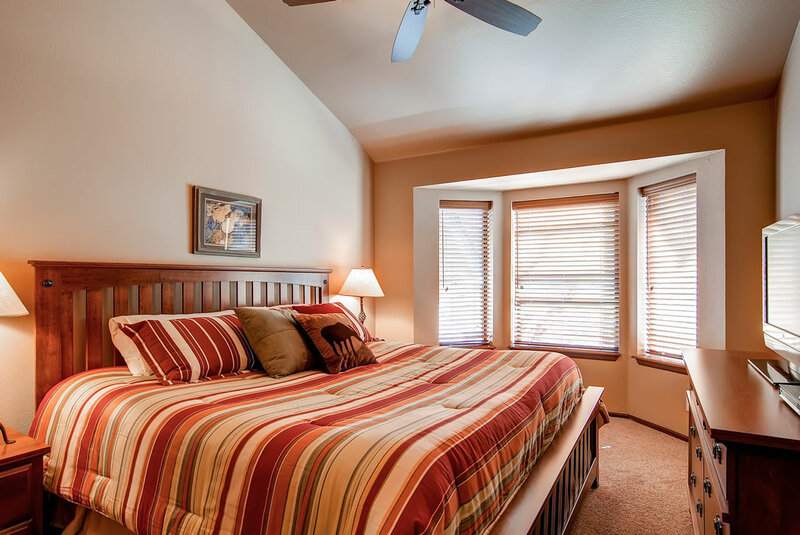 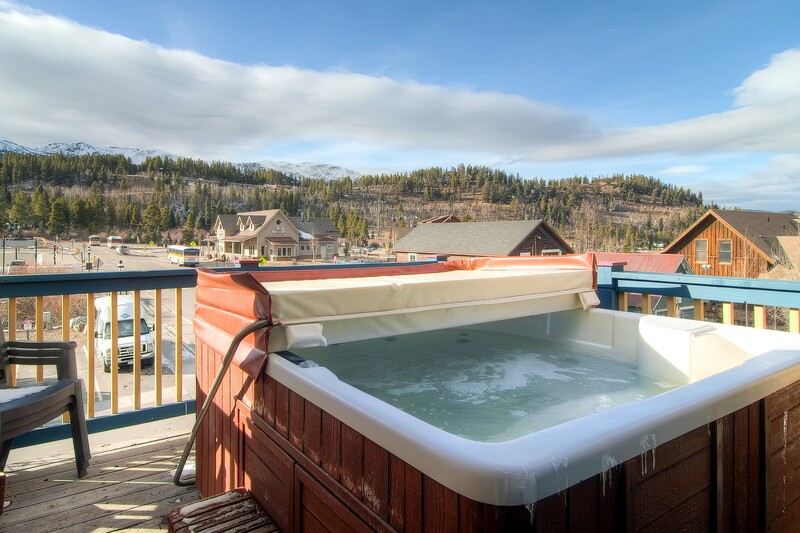 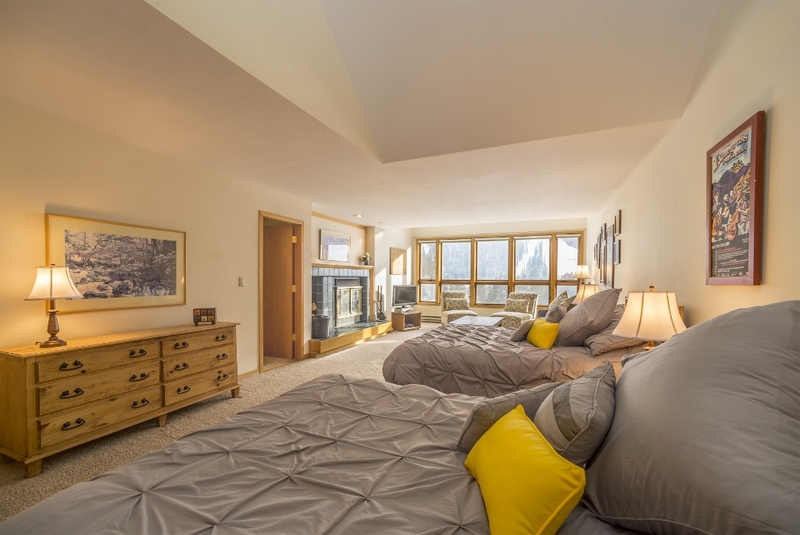 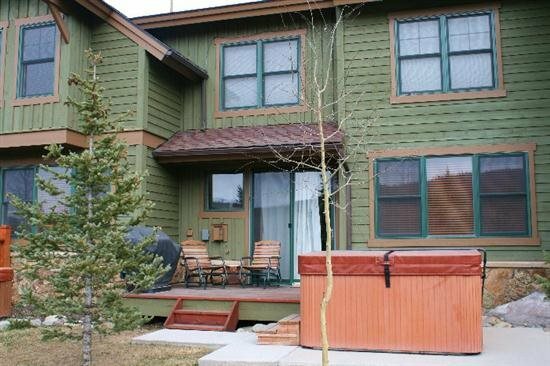 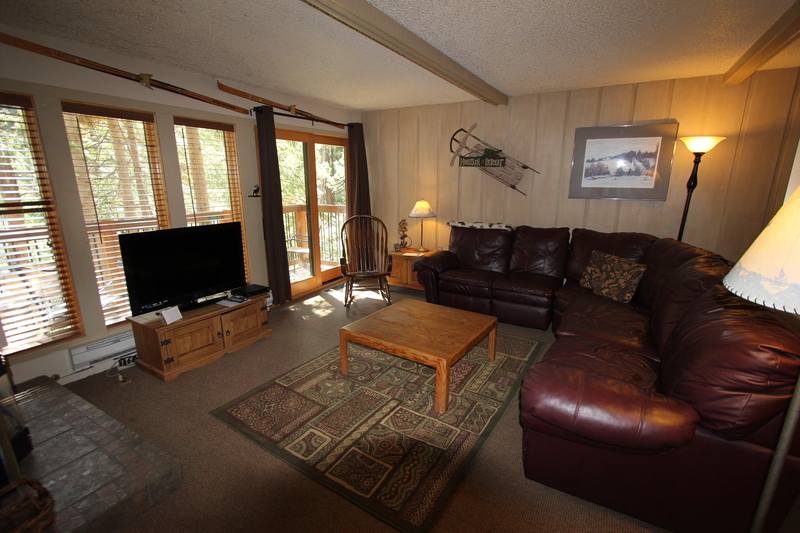 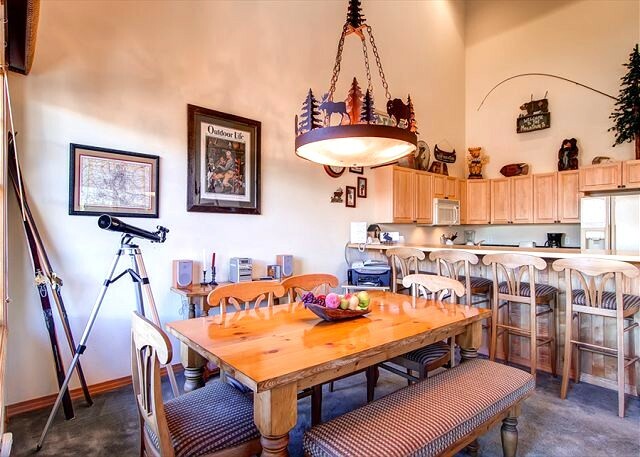 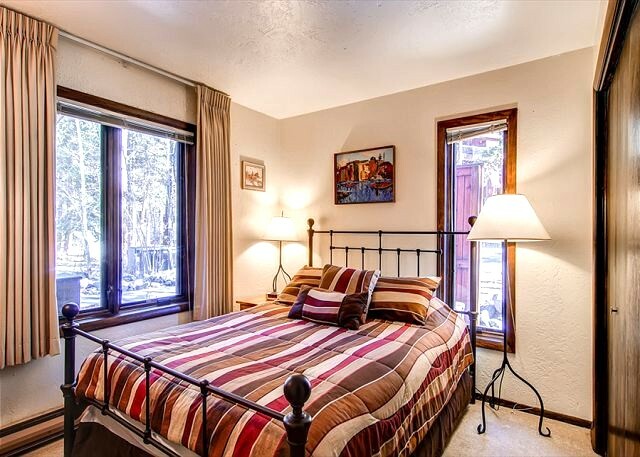 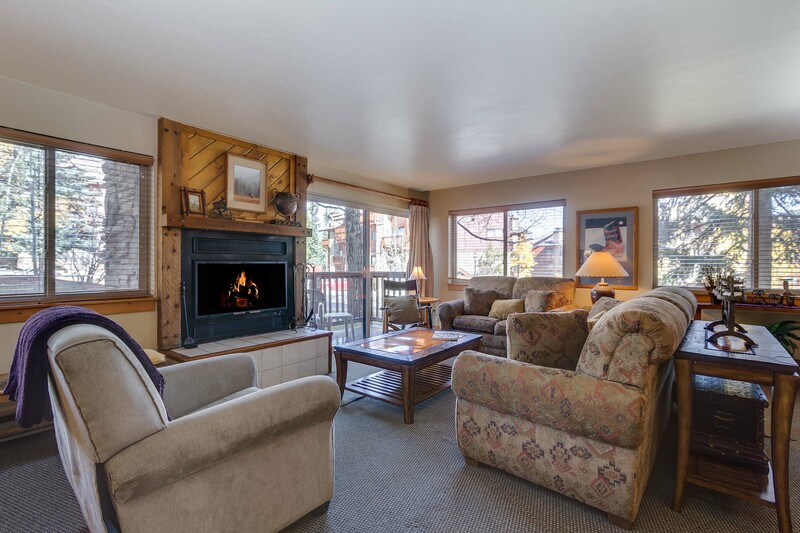 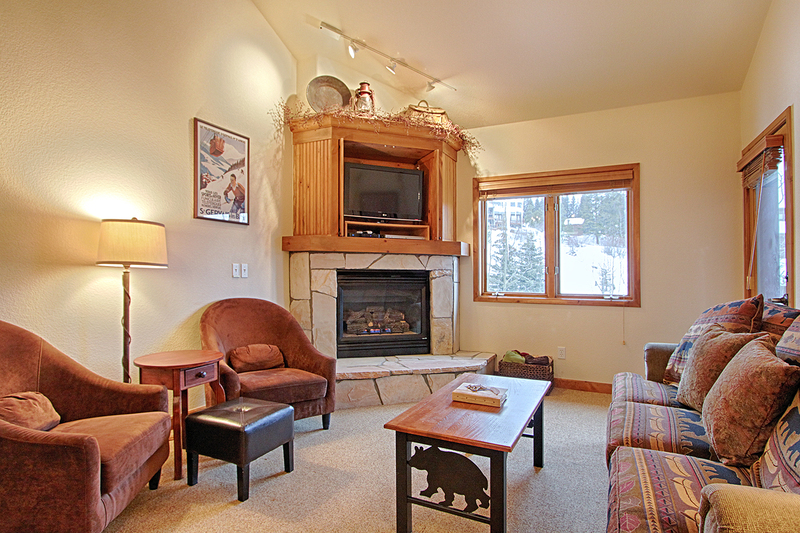 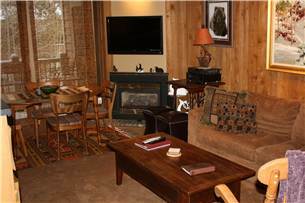 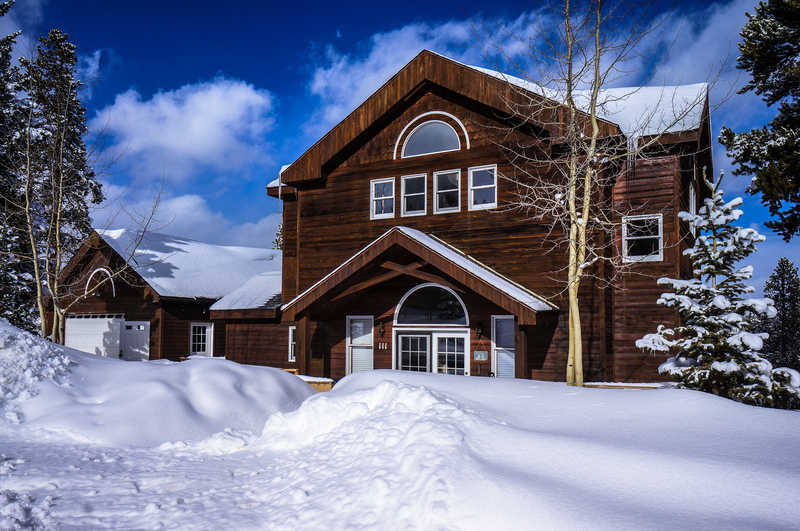 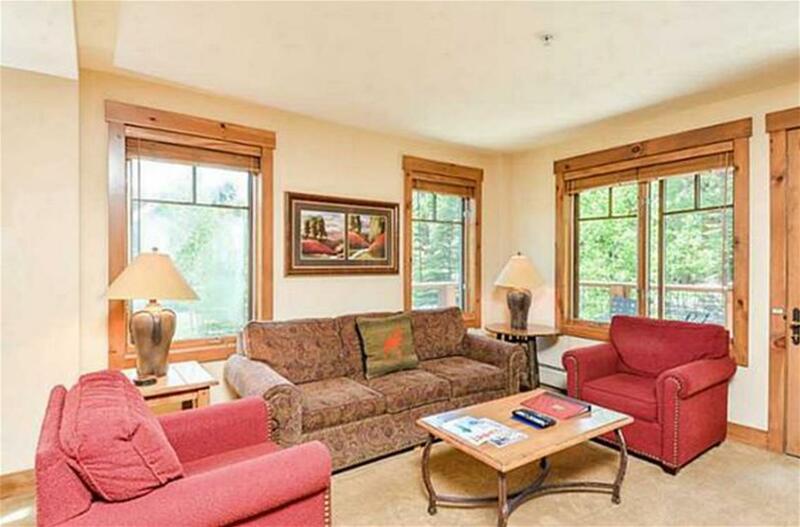 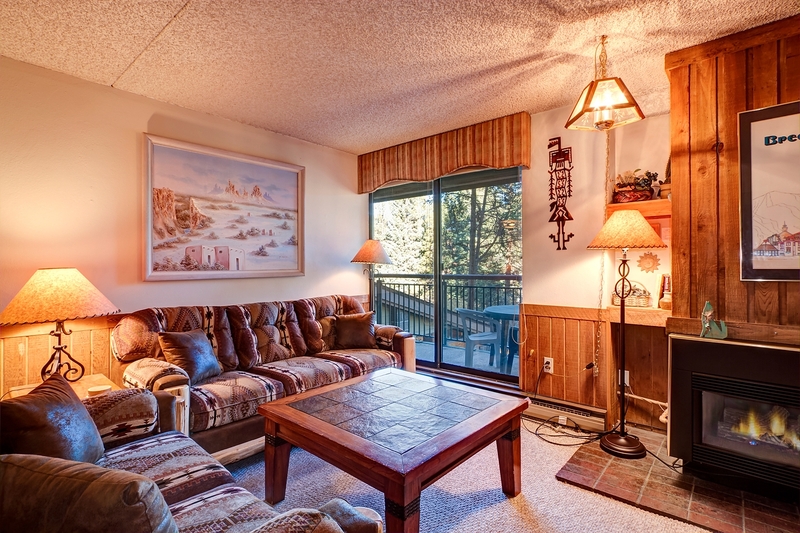 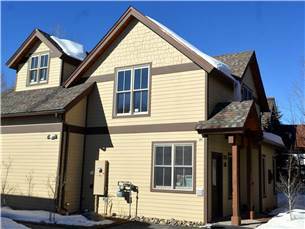 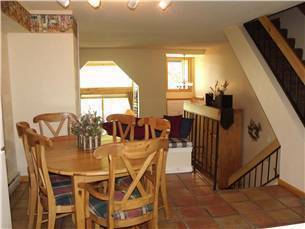 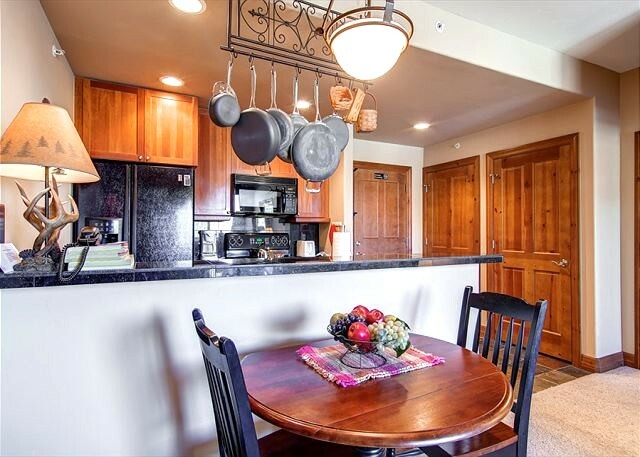 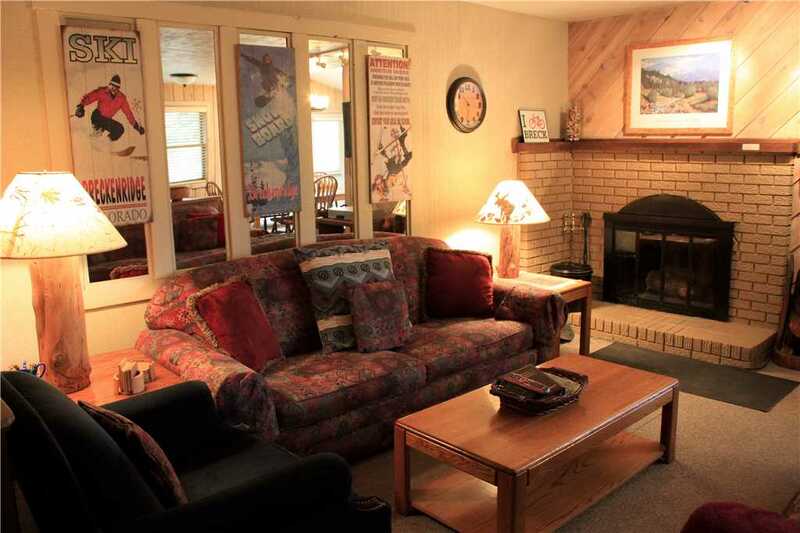 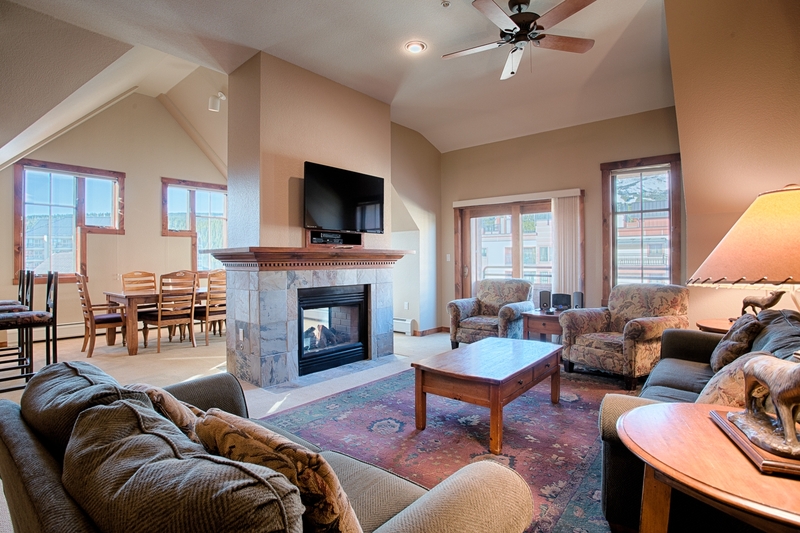 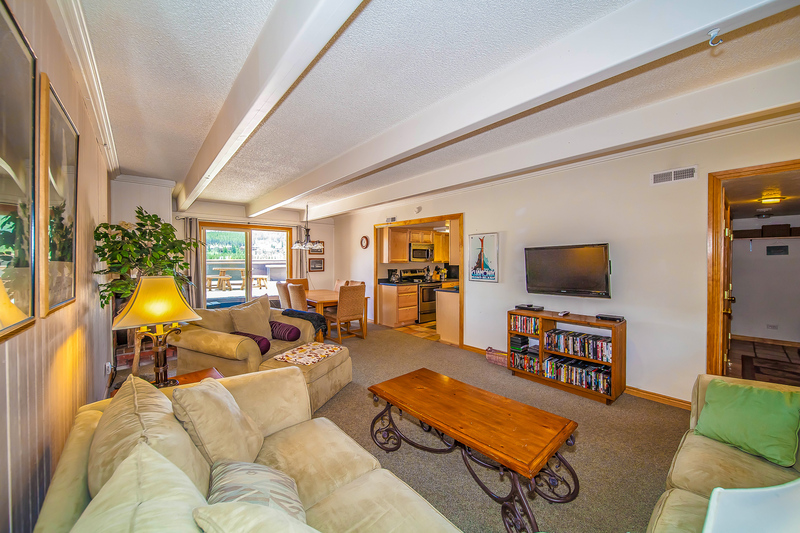 A great downtown location, room for 10, and easy access to the slopes … all at a great price. 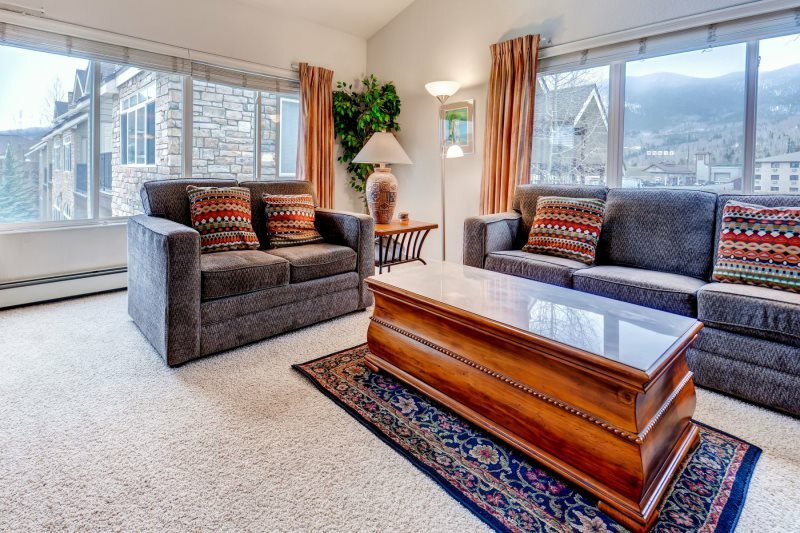 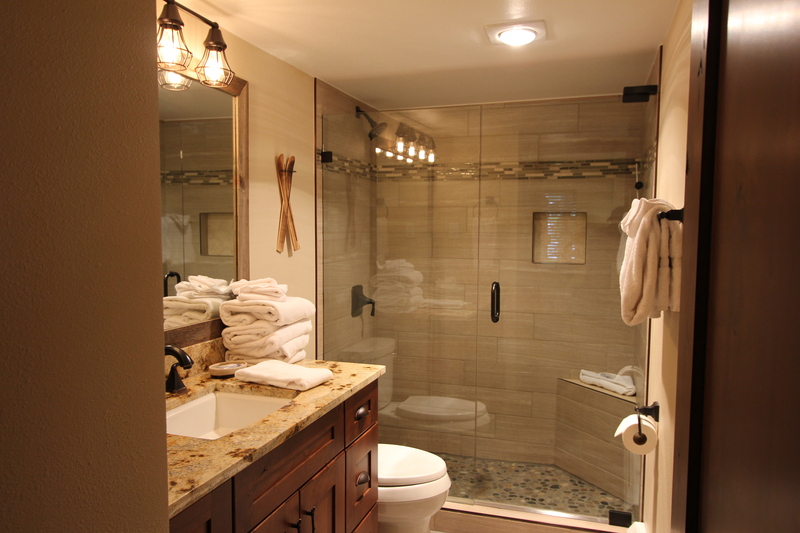 You won’t find a better deal in Frisco, so call us today! 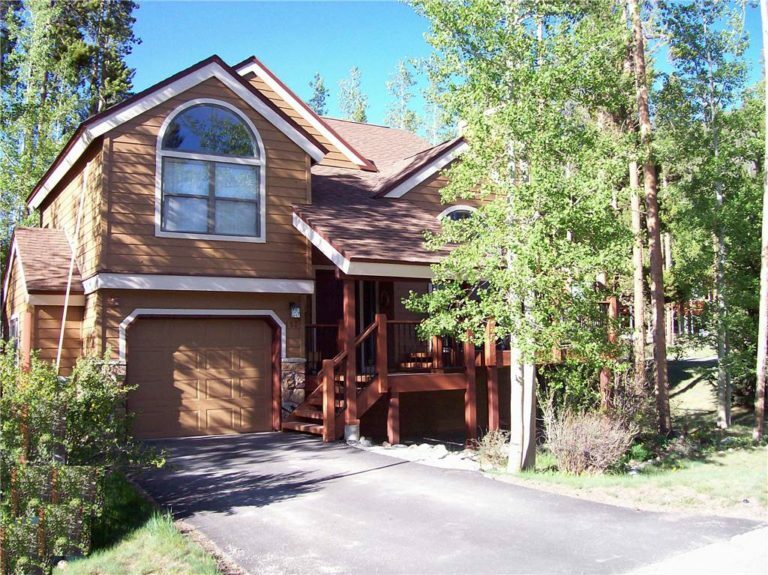 Parking: 1-car garage – 1 outdoor parking space. 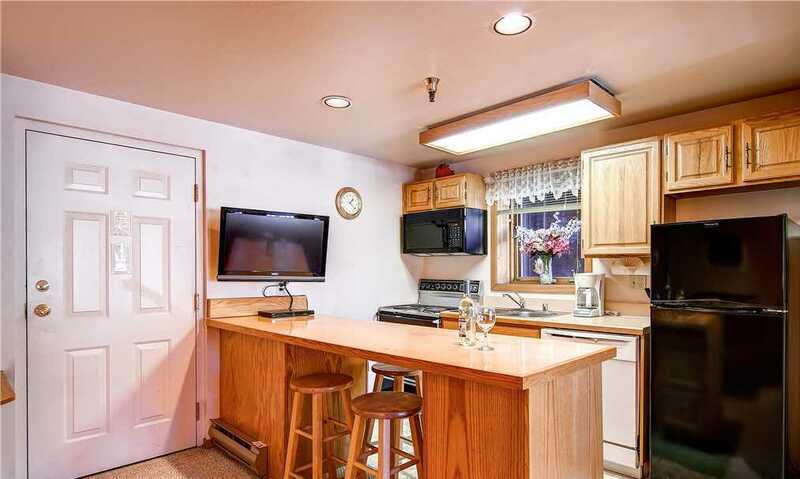 2 spaces total. 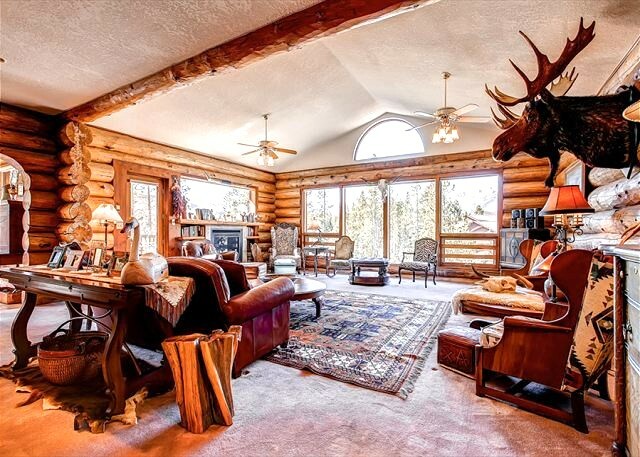 No air conditioning. 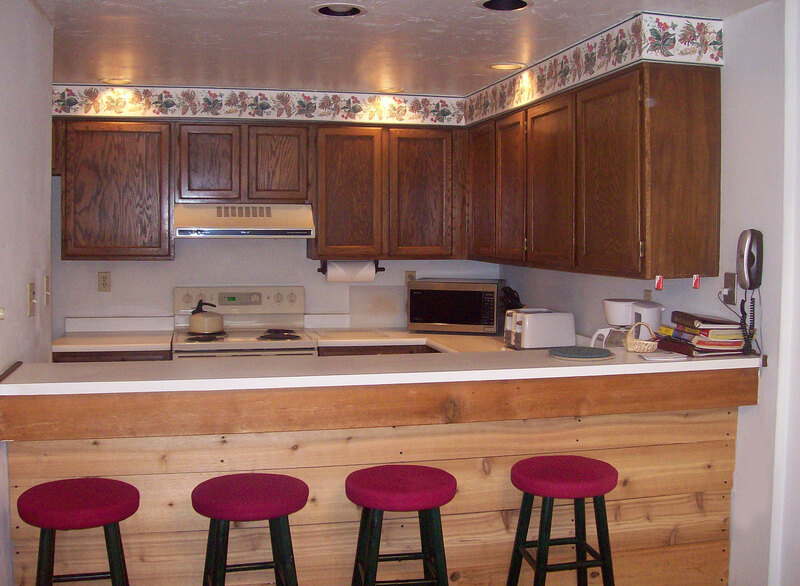 Fans are not stocked, but can be delivered upon request at no extra charge.